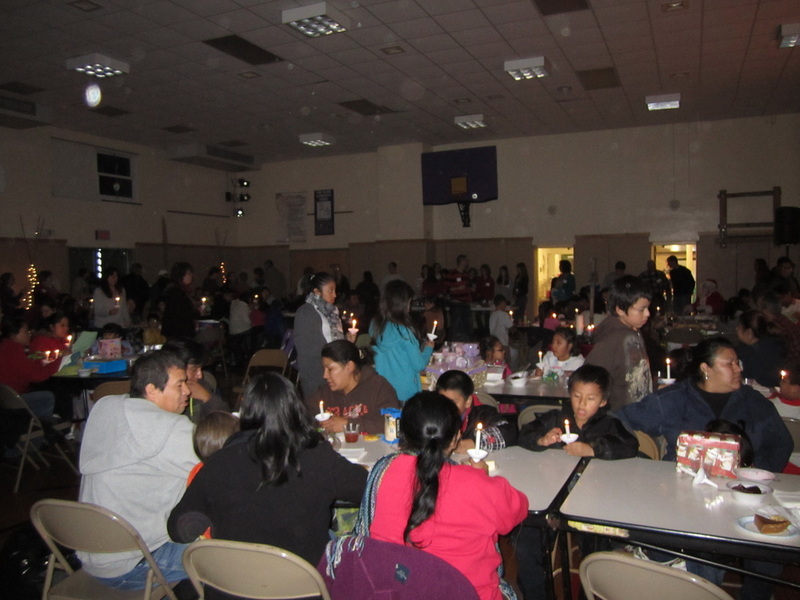 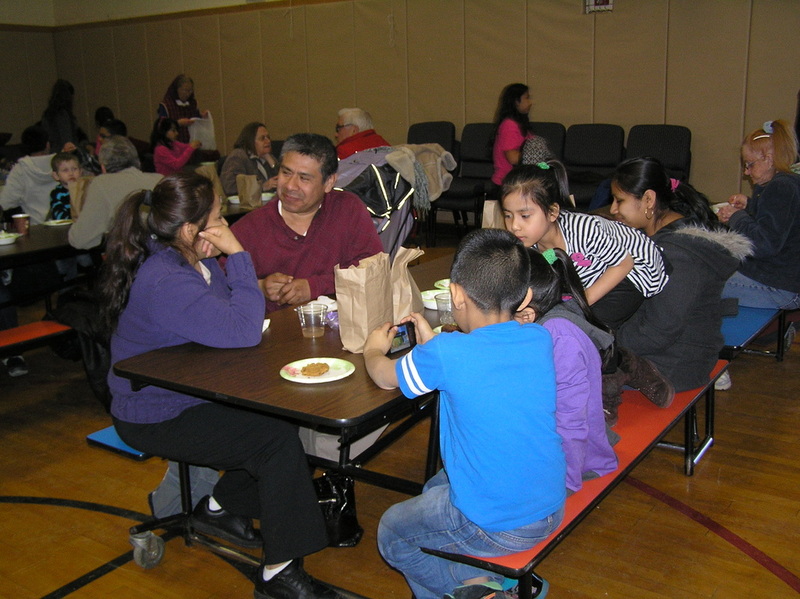 Below are photos from our past dinners. 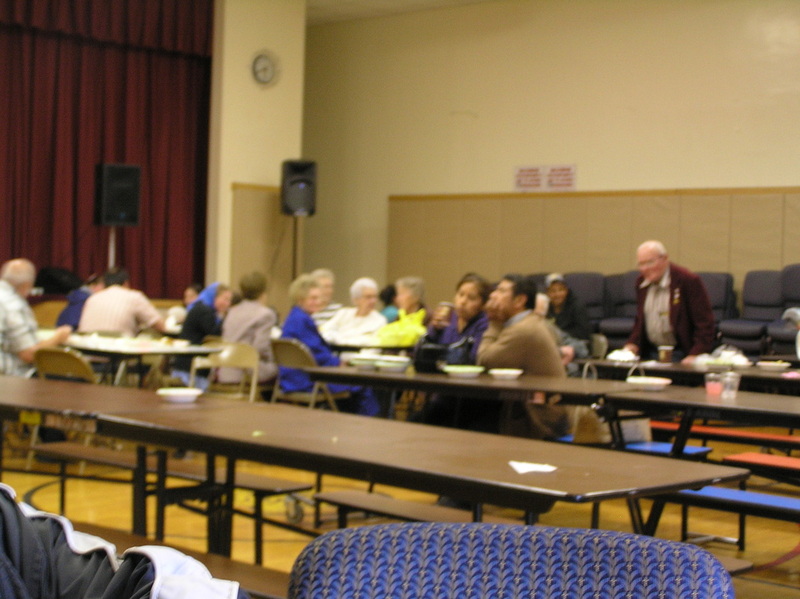 They are arranged with the most recent dinner first. 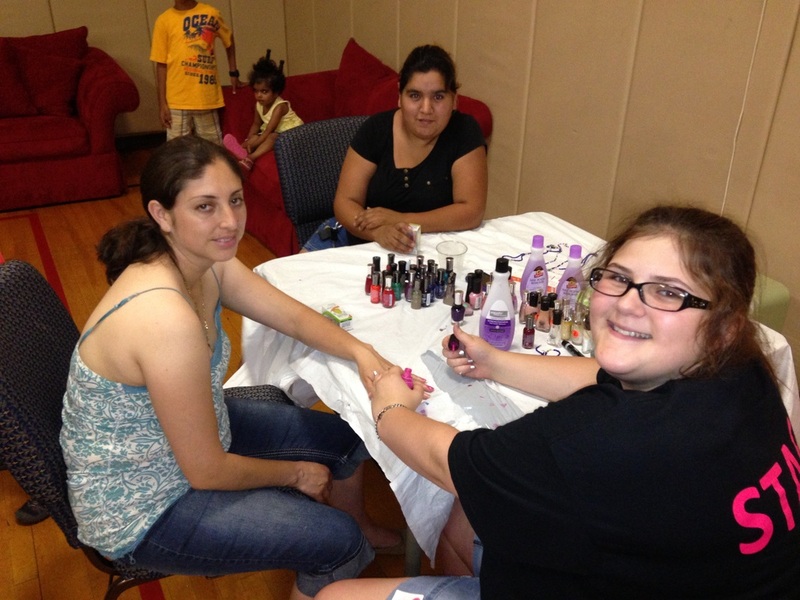 Getting beautiful at the nail salon. 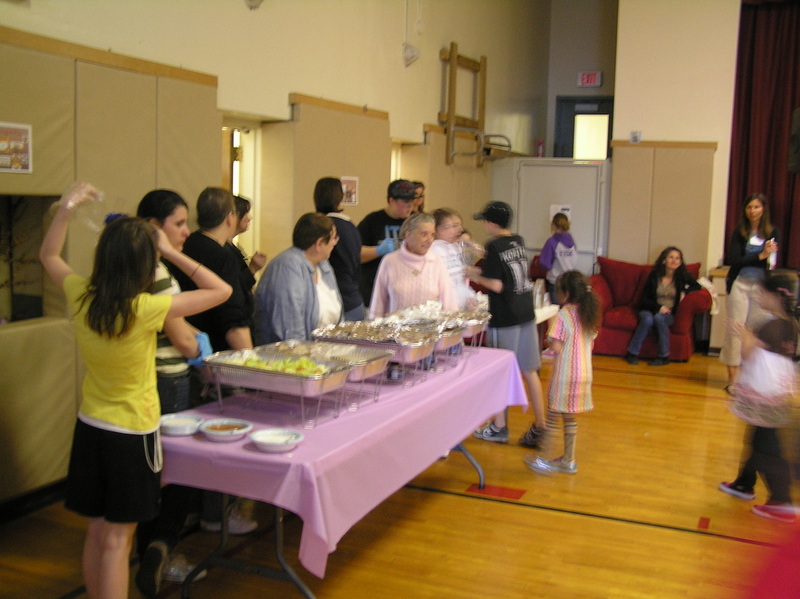 Guests visiting the buffet line. 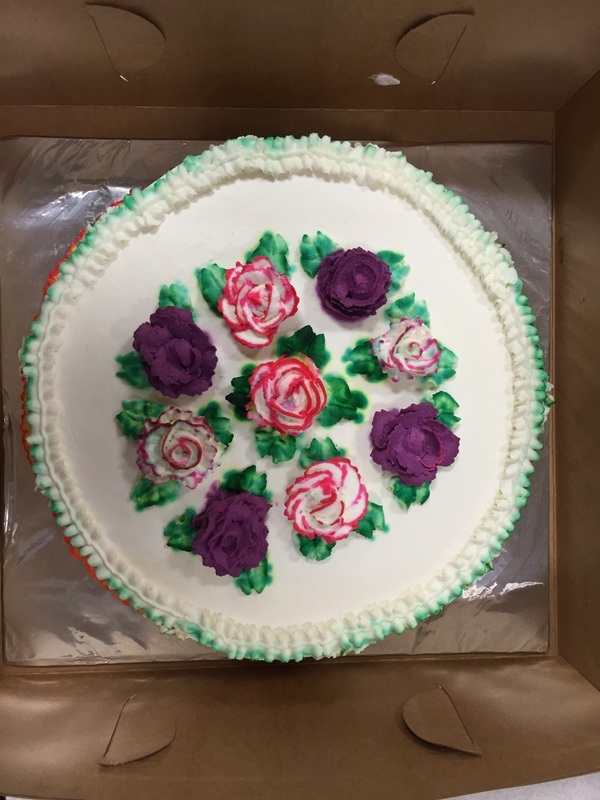 July cake made by Revecca. 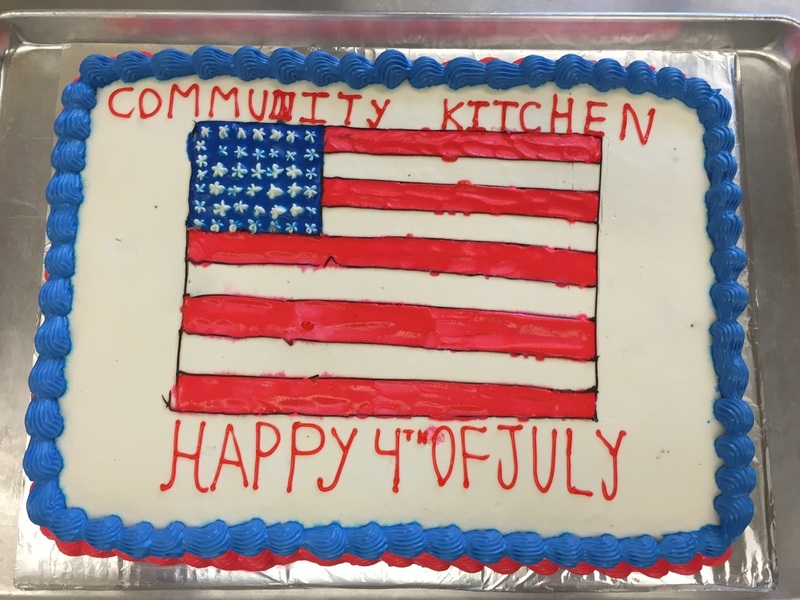 Our June cakes. 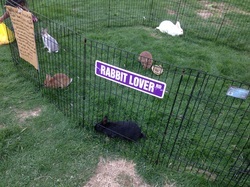 The green one was made by Revecca. 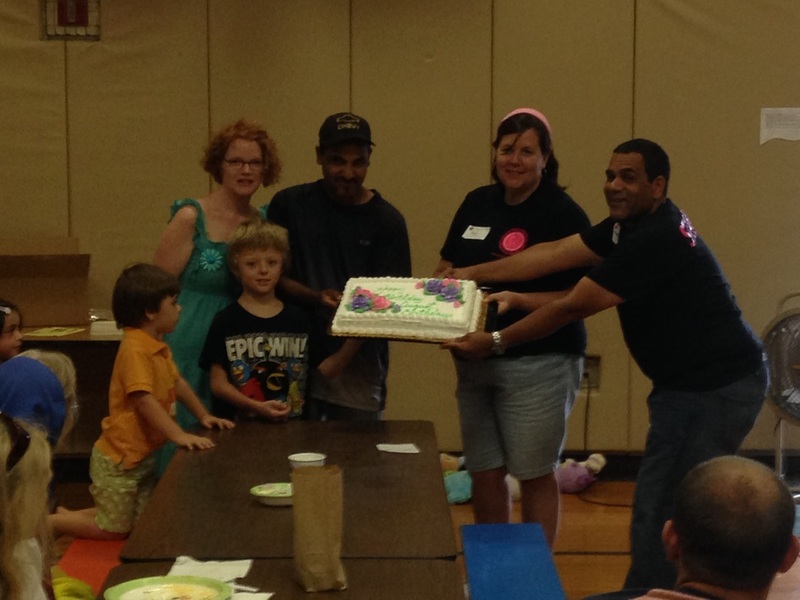 Celebrating June Birthdays and Anniversaries. 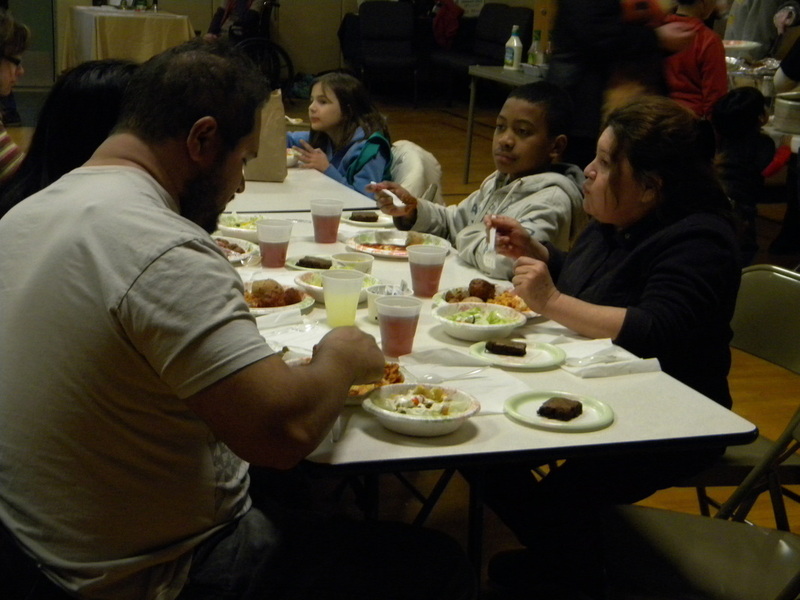 Some of the guests enjoying dinner. 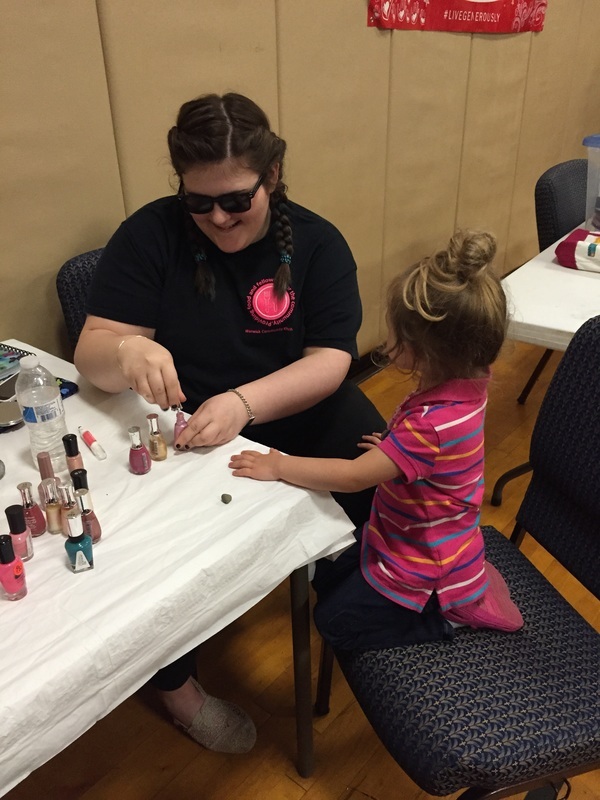 Rebecca working at the Nail Salon. 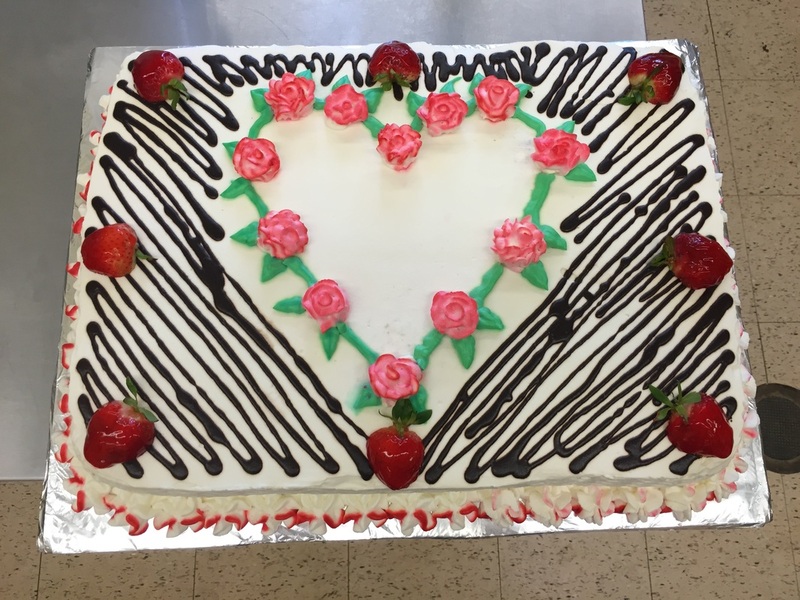 The beautiful cake made by Revecca. 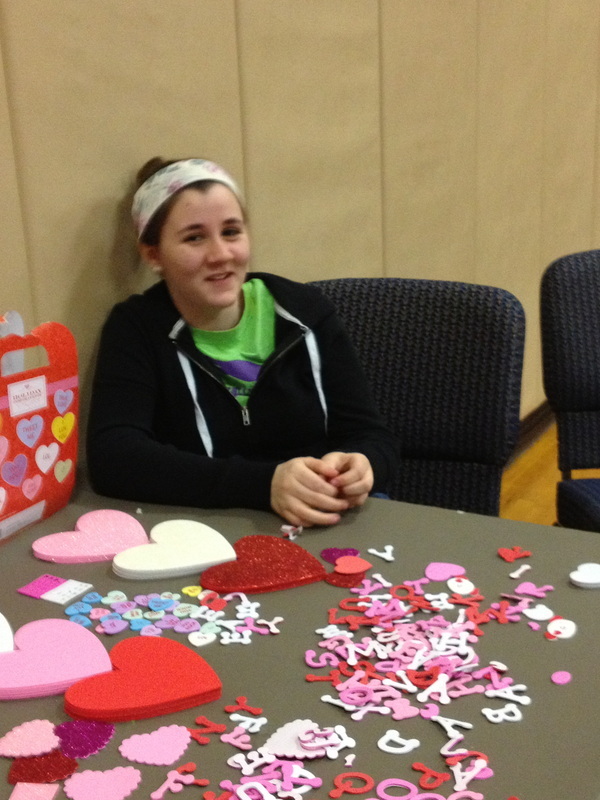 Lynsey helping at the craft table. 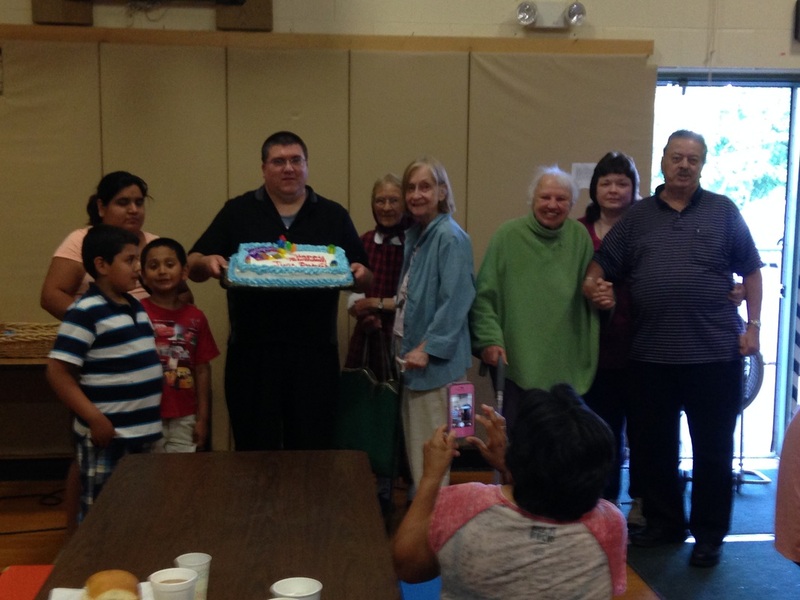 Celebrating May Birthdays and Anniversaries. 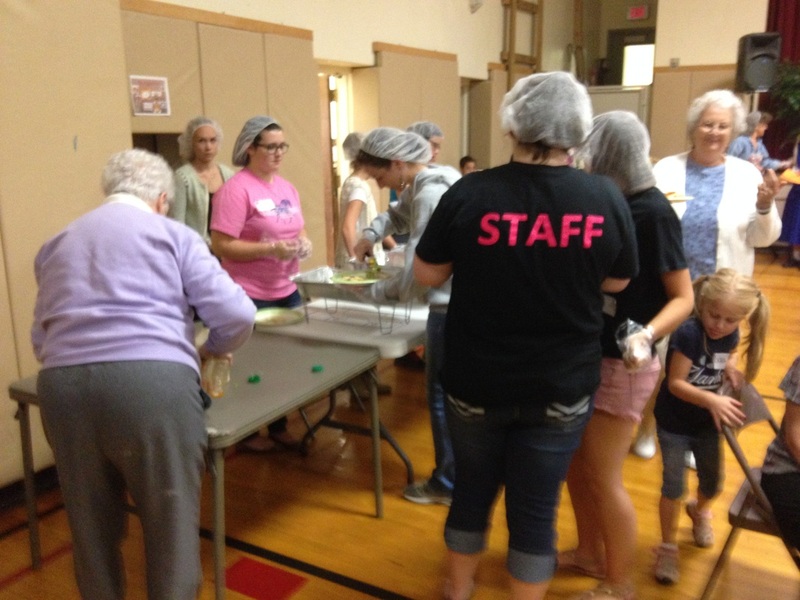 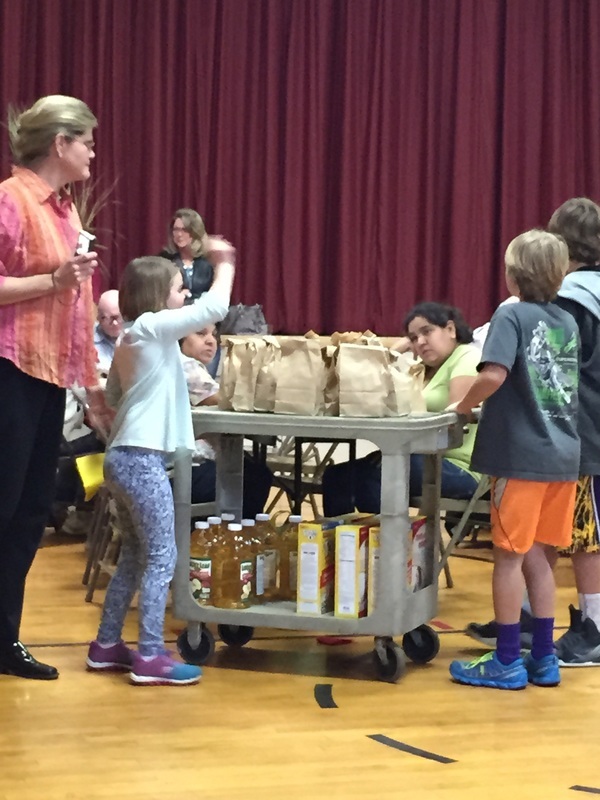 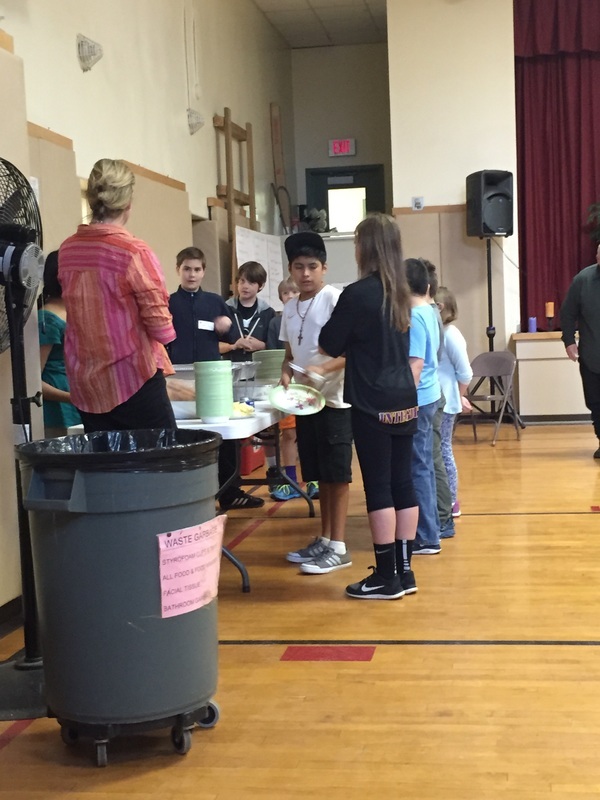 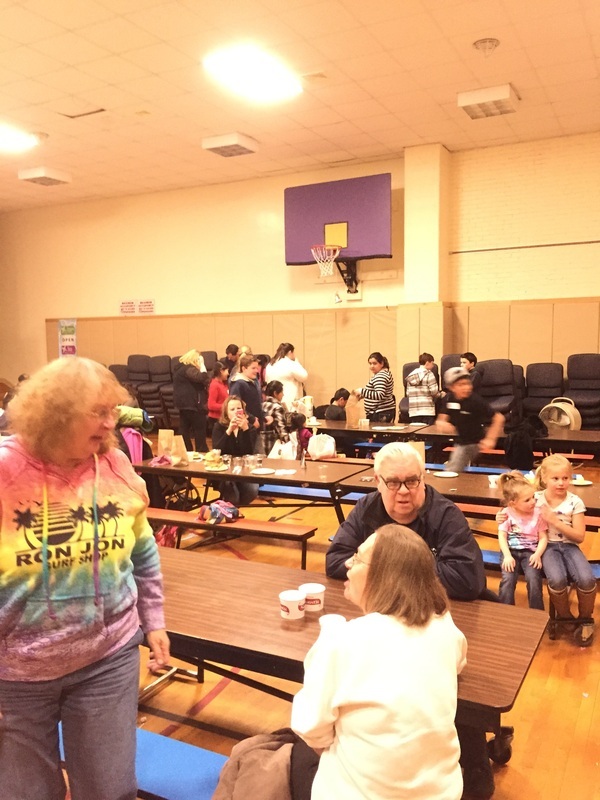 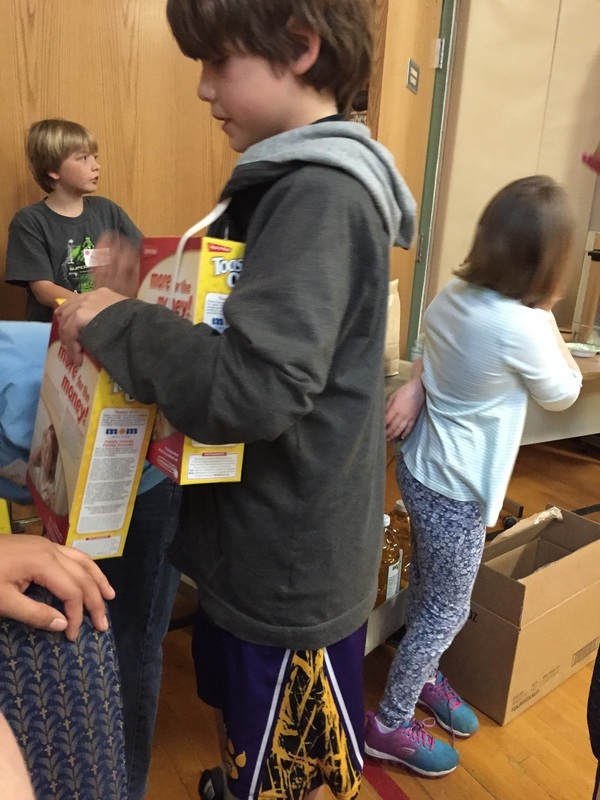 Volunteers helping hand out cereal. 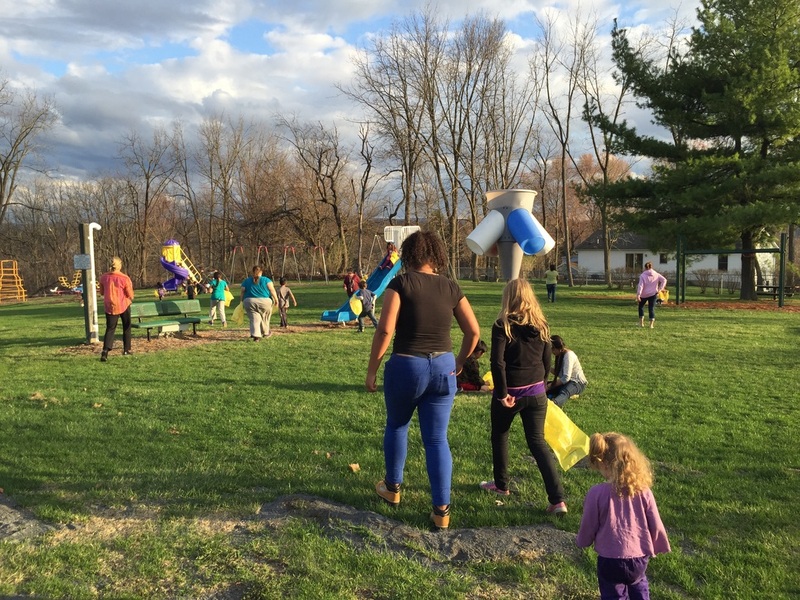 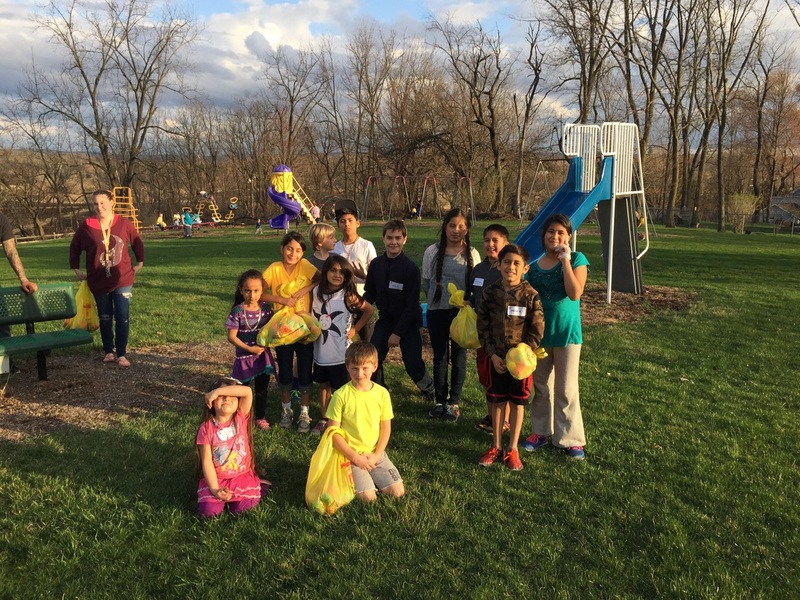 Our annual After Easter Egg Hunt. 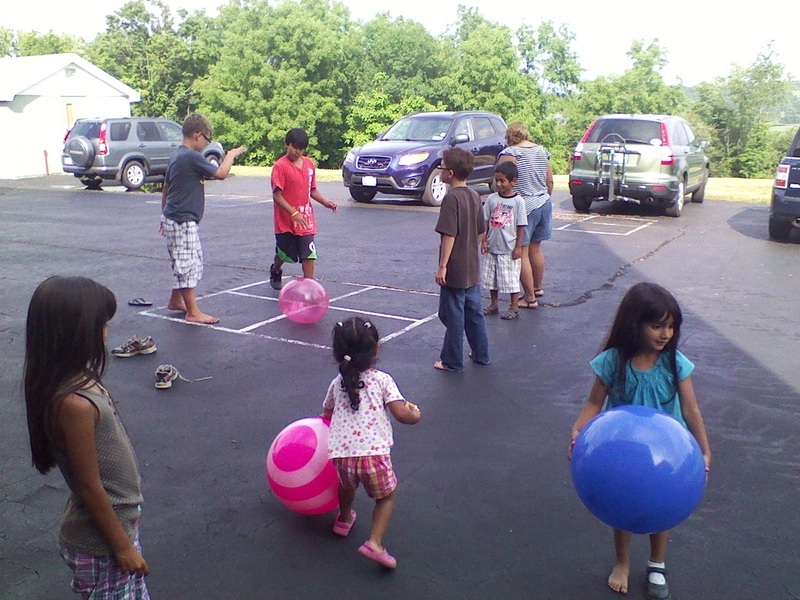 Our volunteers playing a Basketball game after all their hard work. 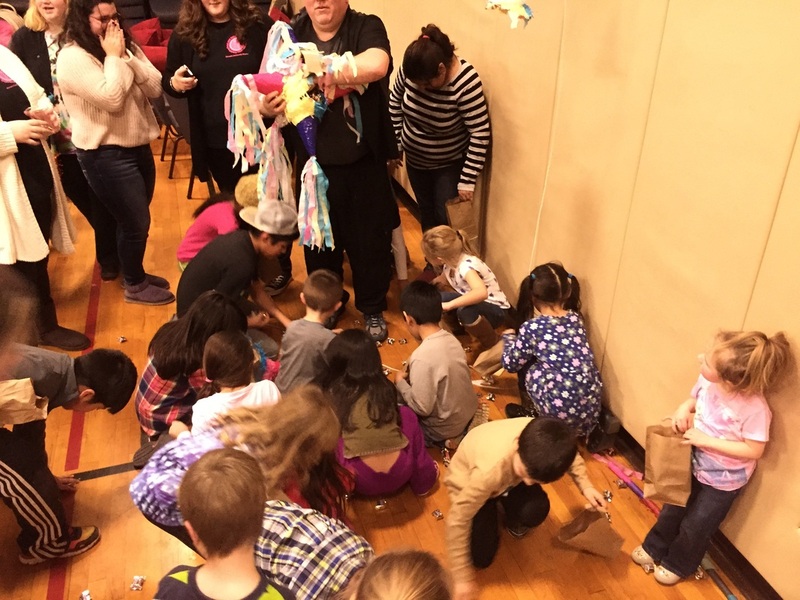 The craft was a big hit! 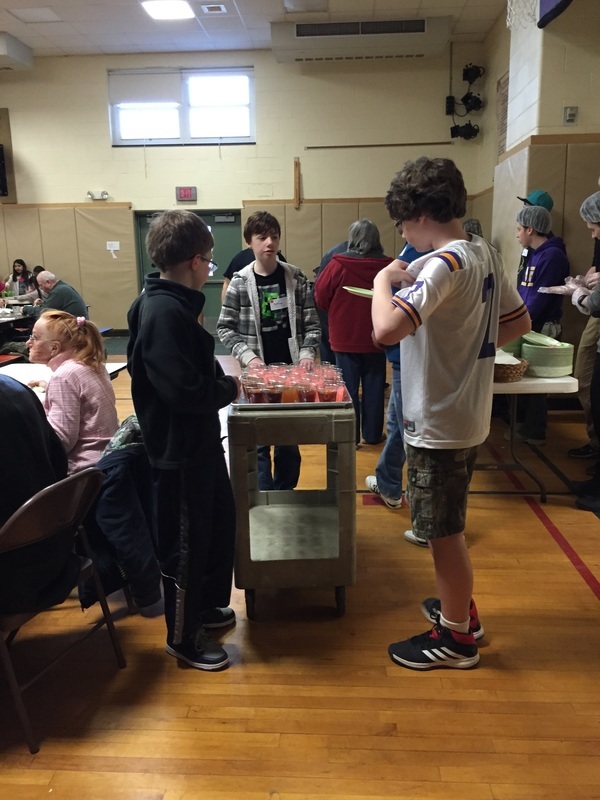 Some of our volunteers serving drinks. 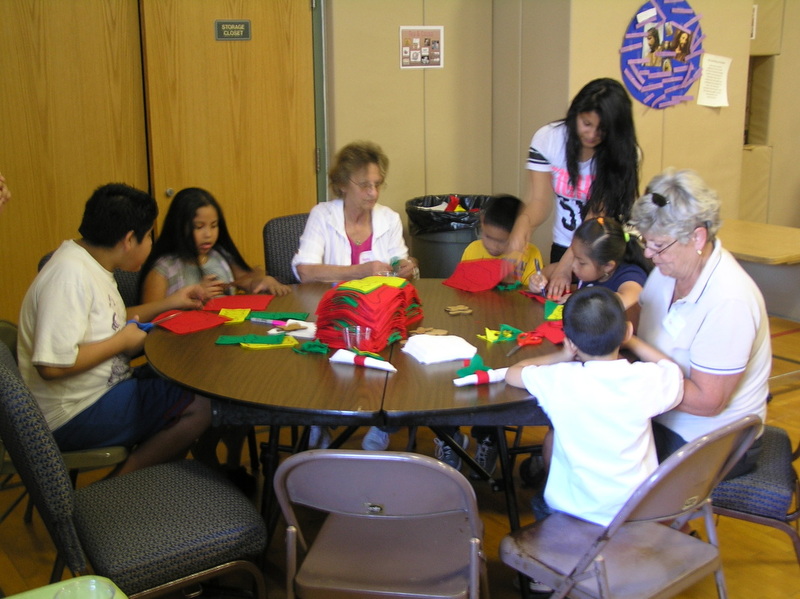 Kids doing a St. Patricks day craft. 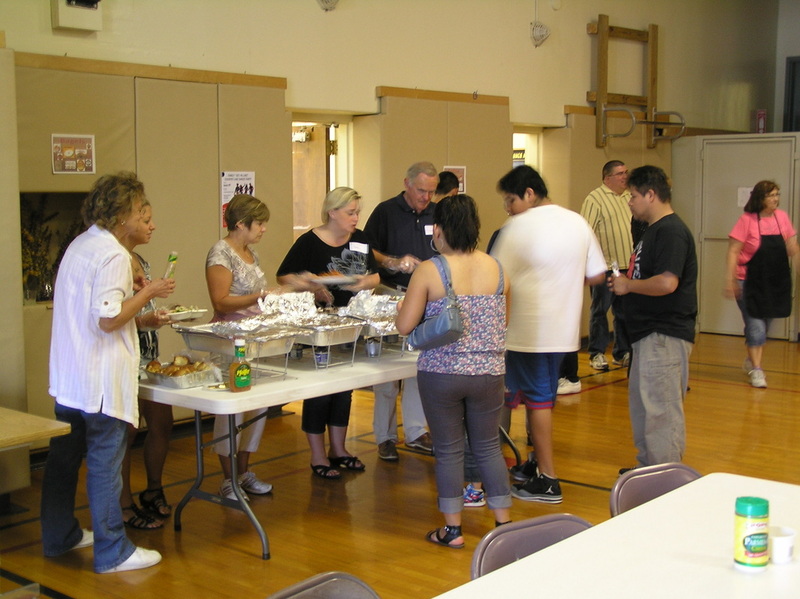 Guests in line for dinner. 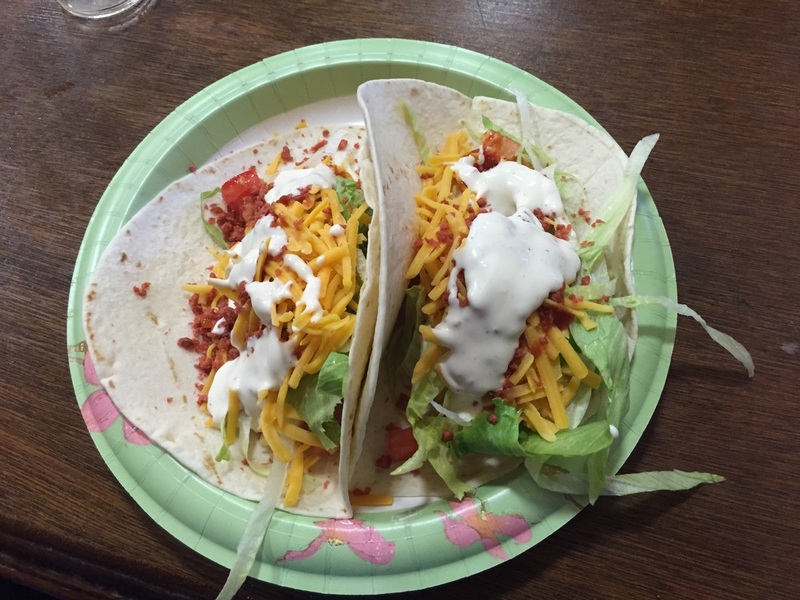 Look at that wonderful food! 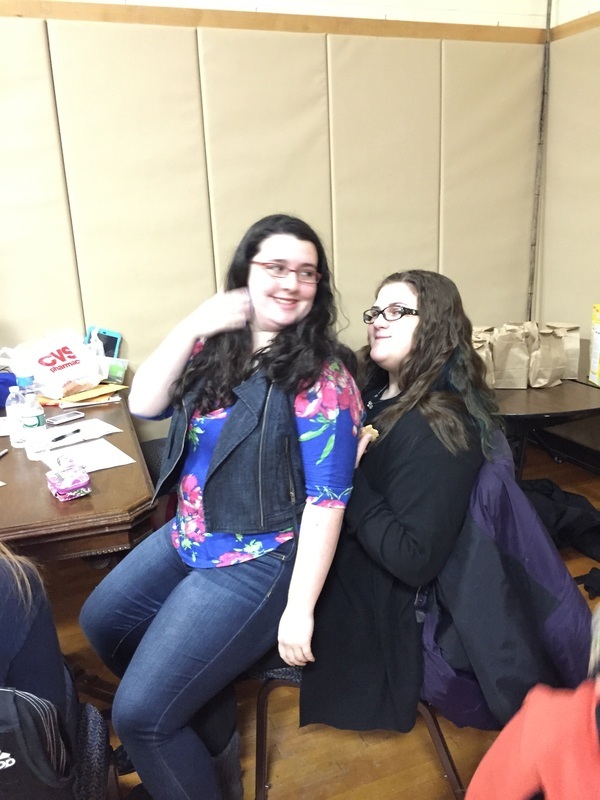 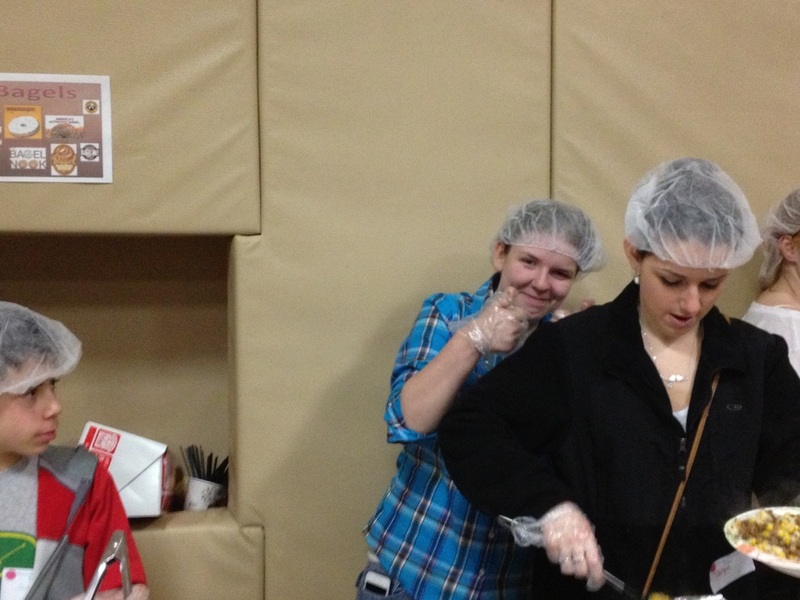 Juliet and Rebecca at the volunteer table. 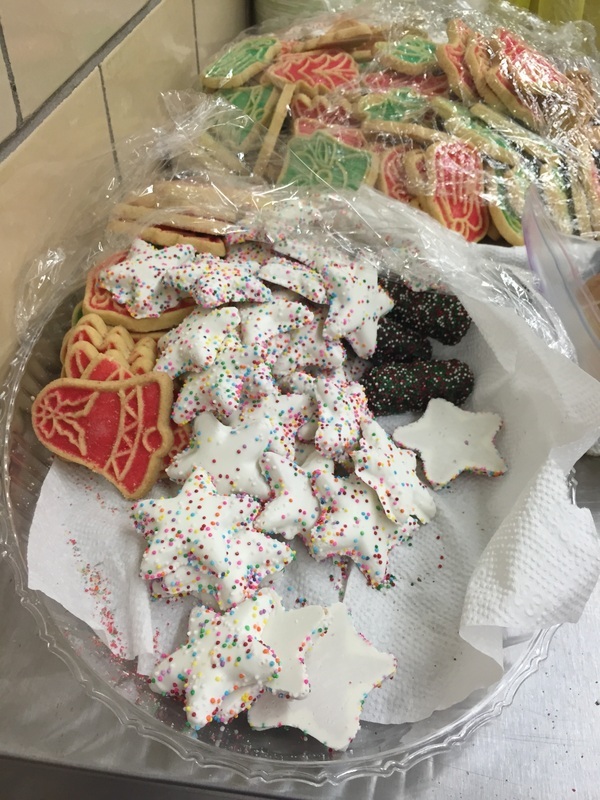 Amazing cookies donated by CJ's. 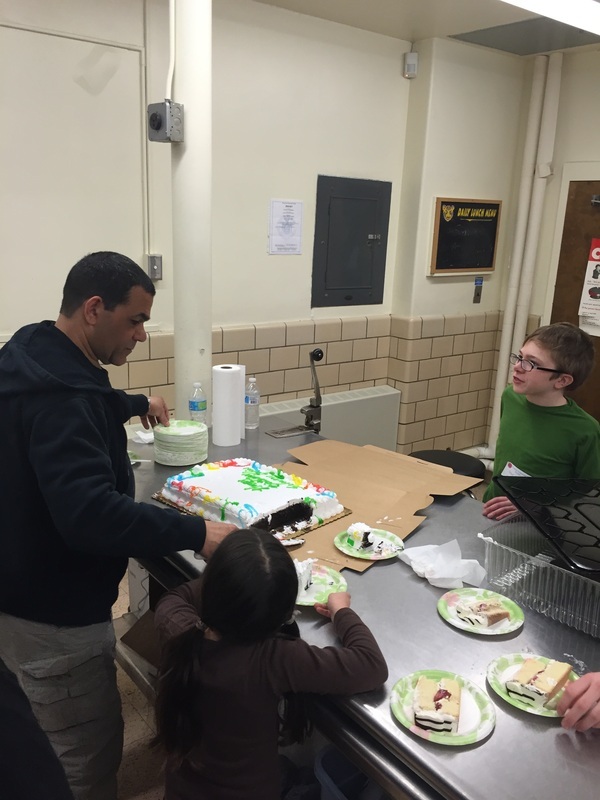 Mark and his helpers getting the cake ready. 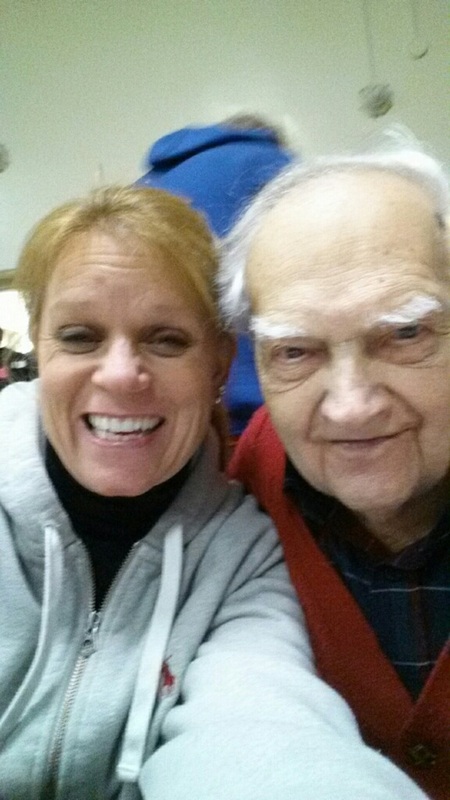 Lori and Adam taking a selfie! 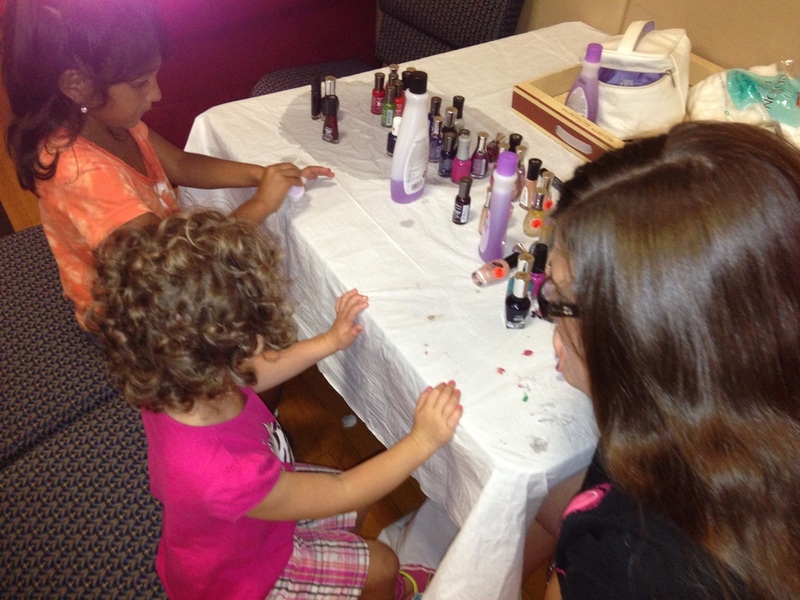 Rebecca and Juliet painting nails at the nail salon. 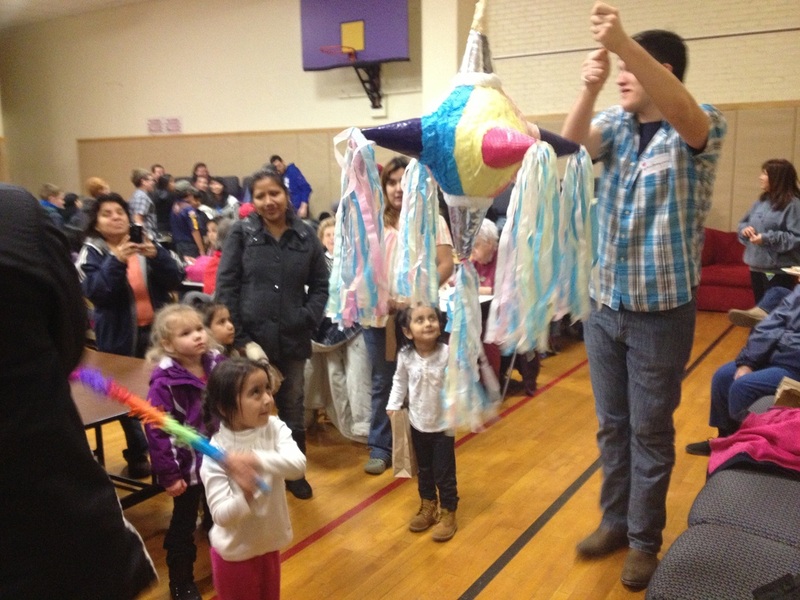 The older children with their pinata (in the back). 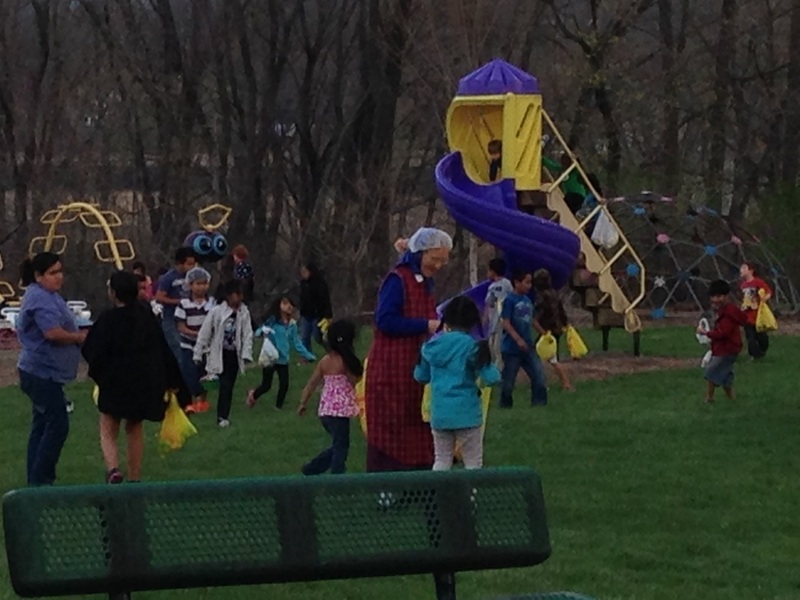 Younger children getting their candy. 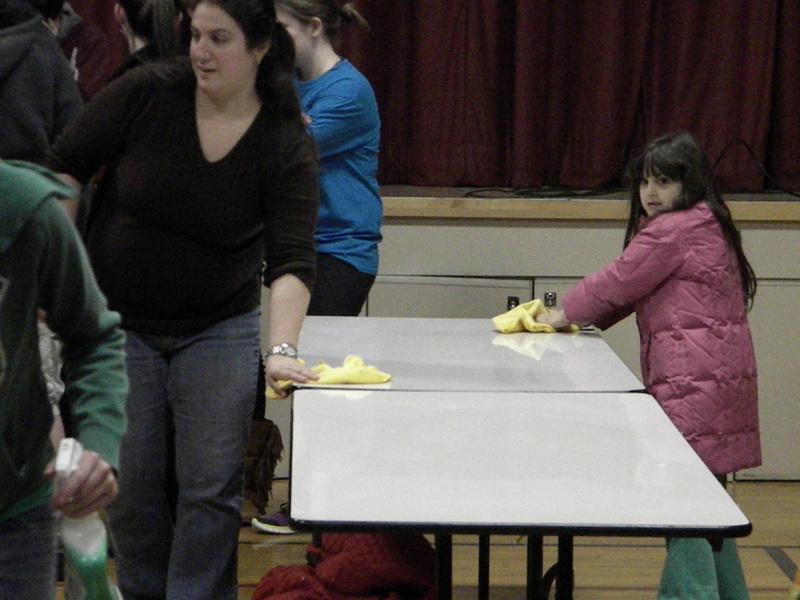 Even the youngest like to help! 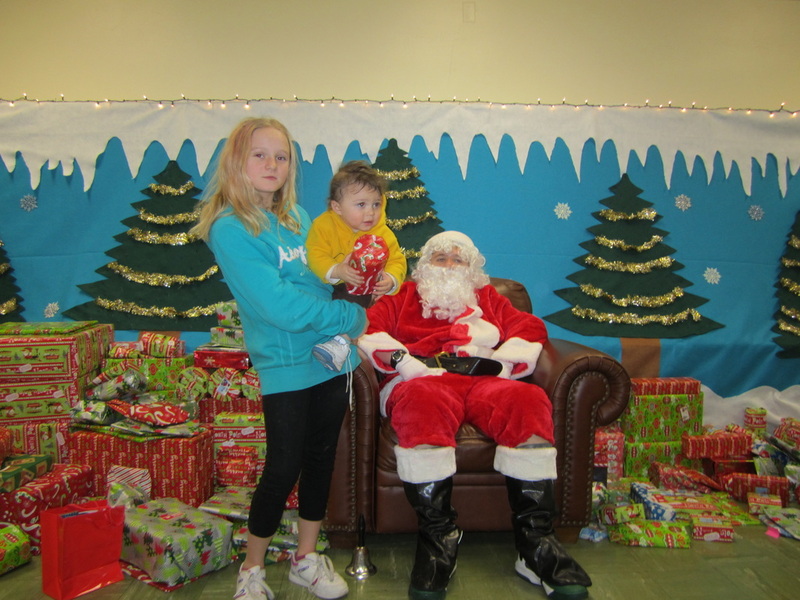 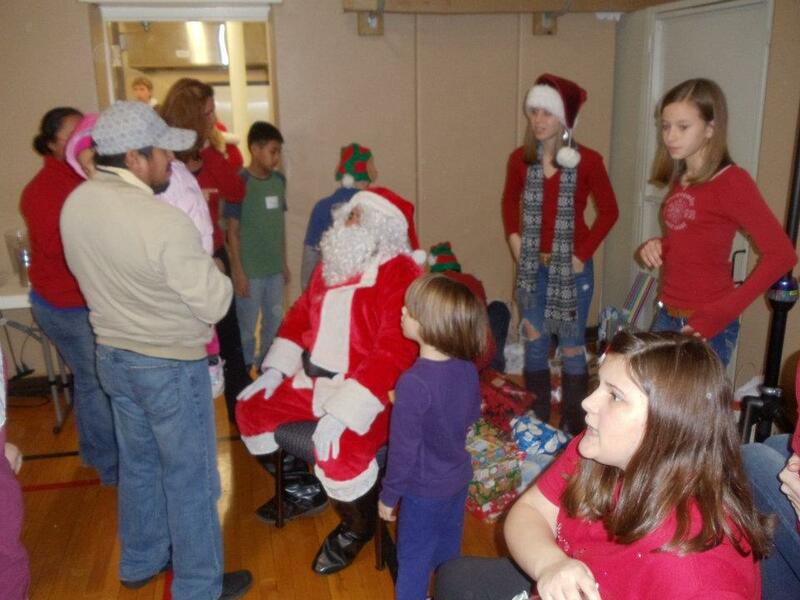 Santa arrived and was greeting the children!! 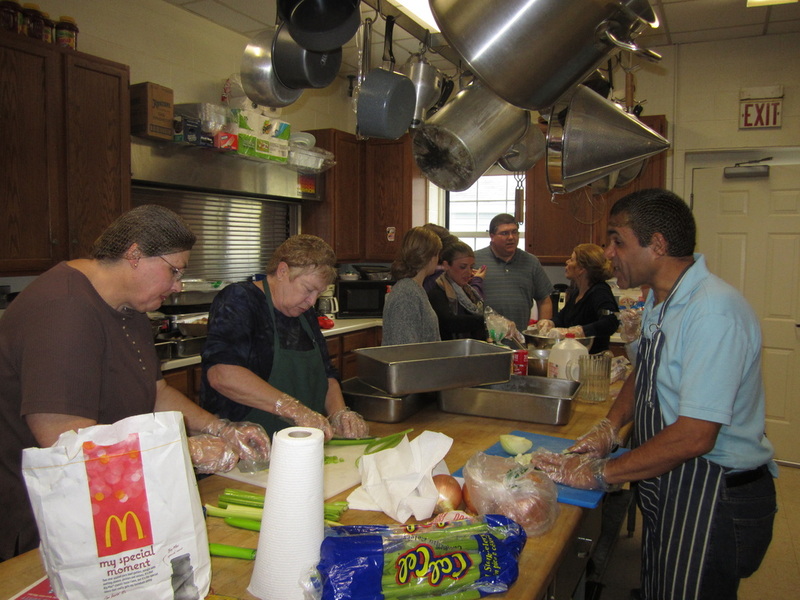 Volunteers helping in the kitchen. 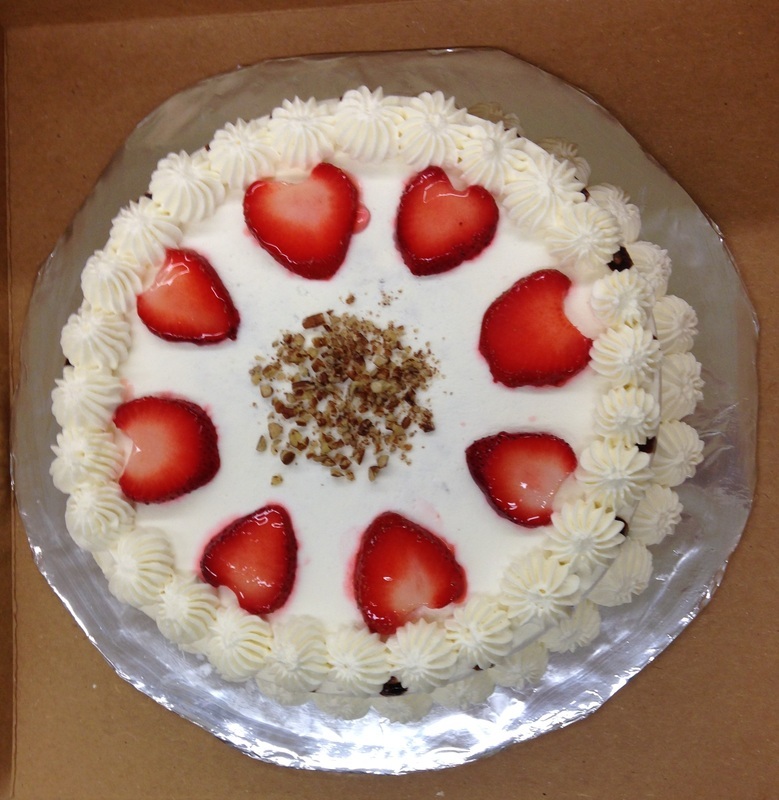 A beautiful Tres Leches Cake made by Revecca; Hernan, Kathleen, Andrew and Brendon's mom. 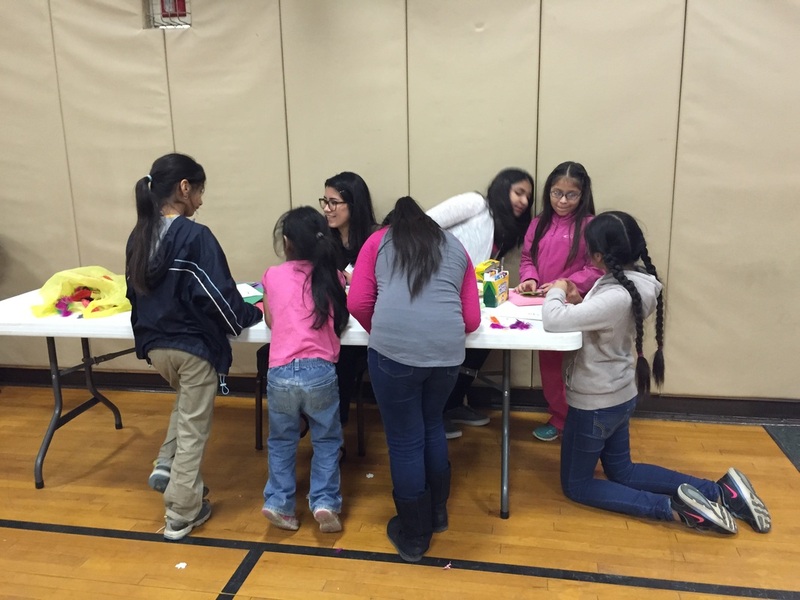 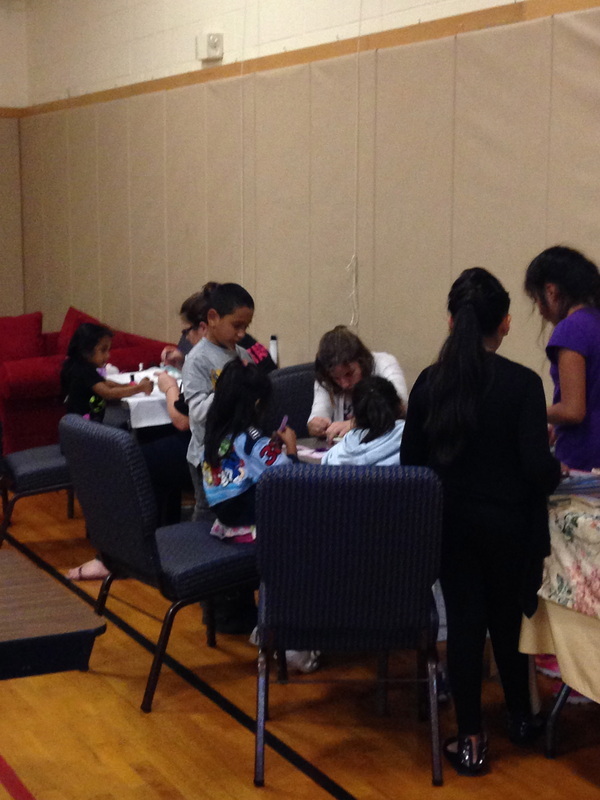 The girls of Girl Scout Troop 652 volunteering. 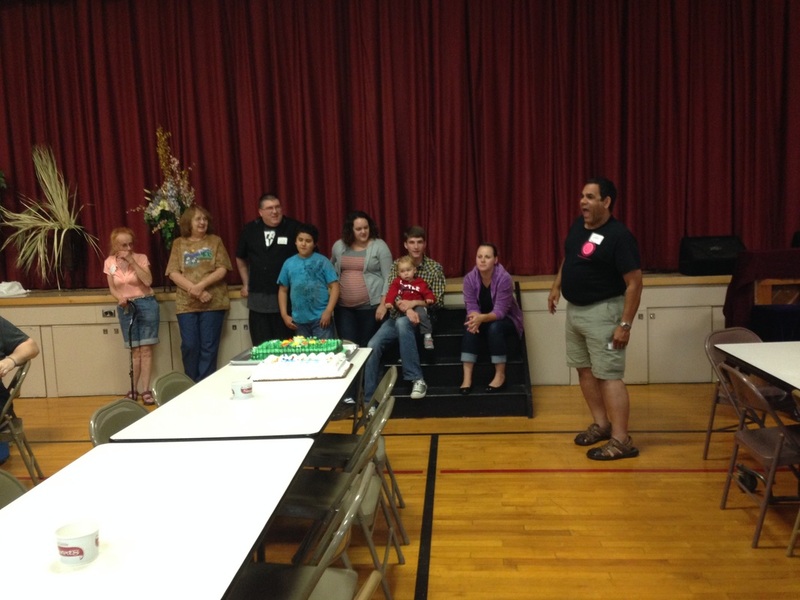 September Birthday celebration including Taryn in college via cellphone. 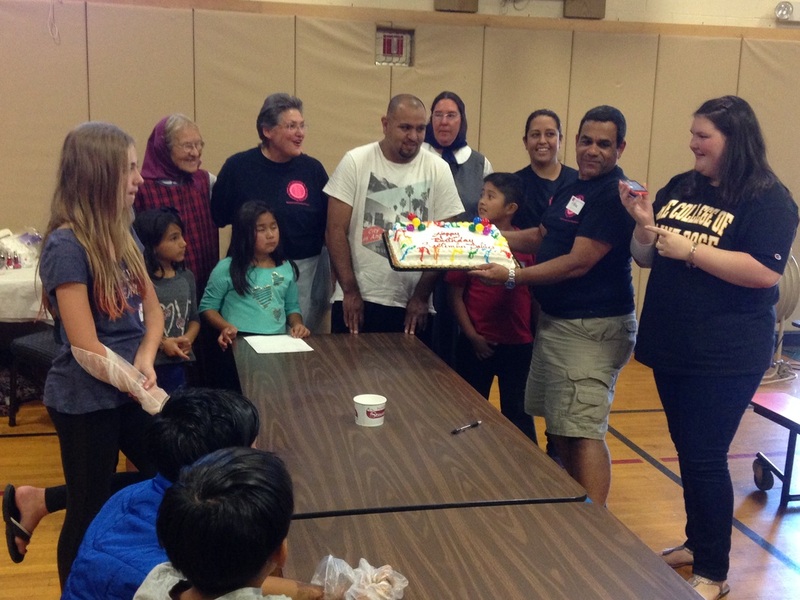 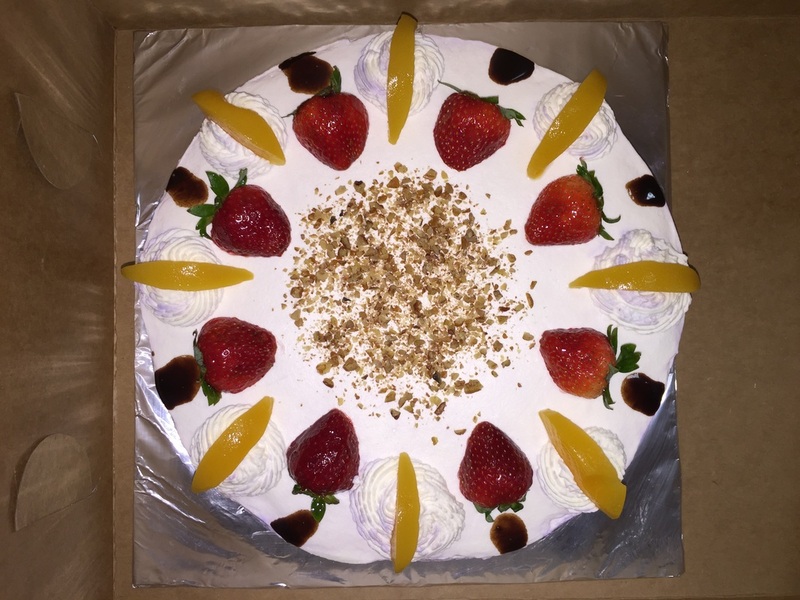 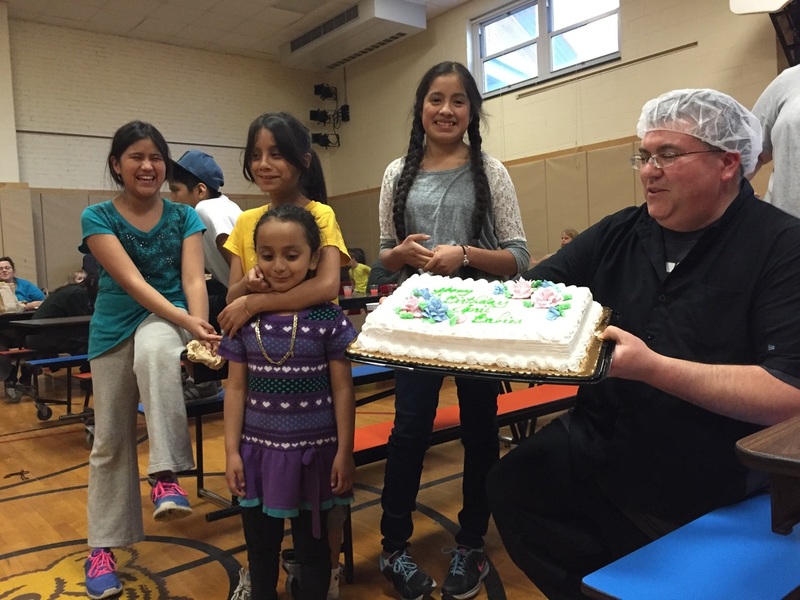 A beautiful Tres Leches cake made by Hernan, Kathleen, Andrew and Bendon's mom, Revecca. 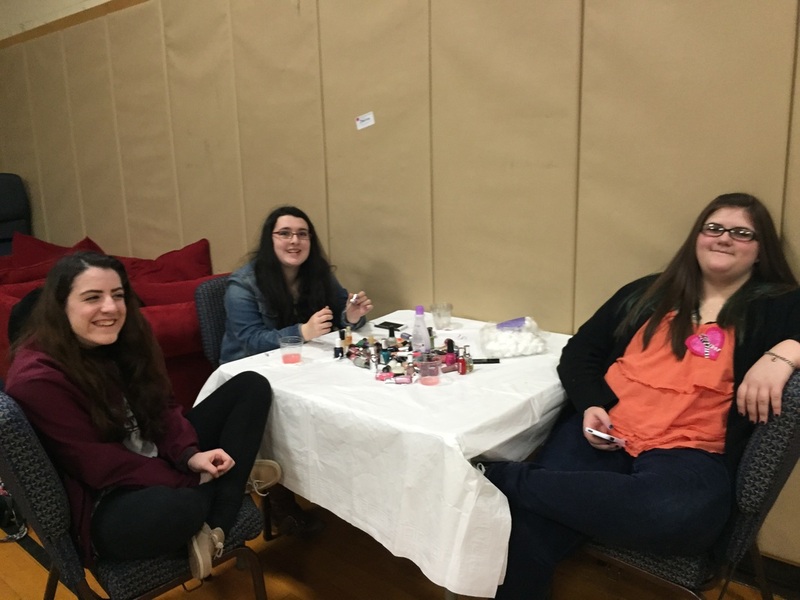 Getting the Nail Studio ready. 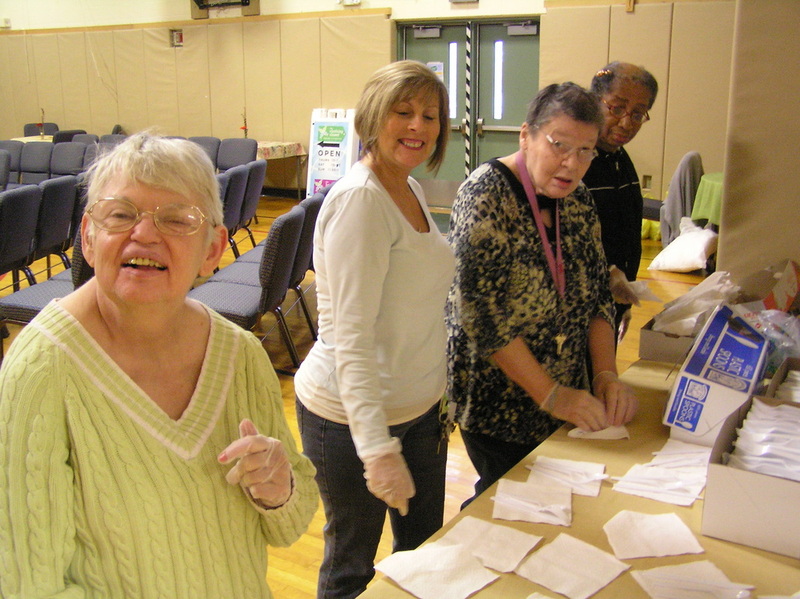 Getting the buffet line ready. 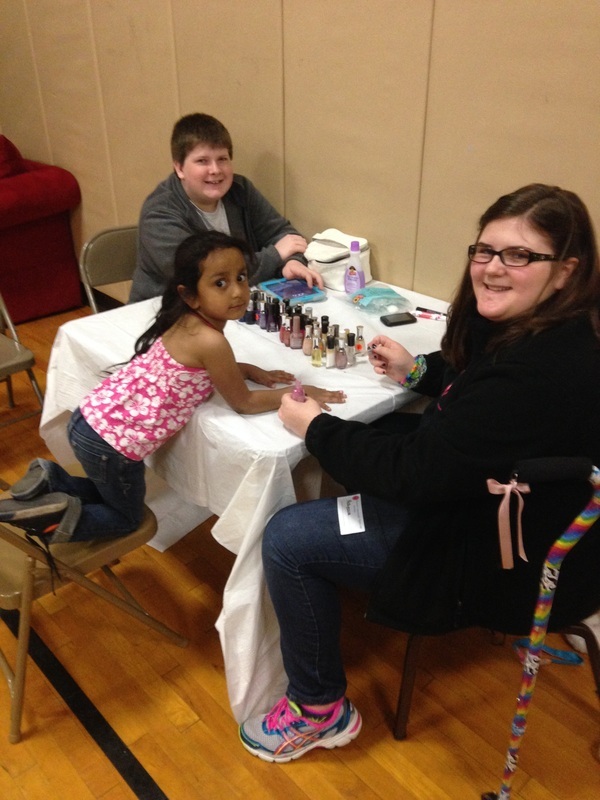 Rebecca and Travis working at the Nail Salon. 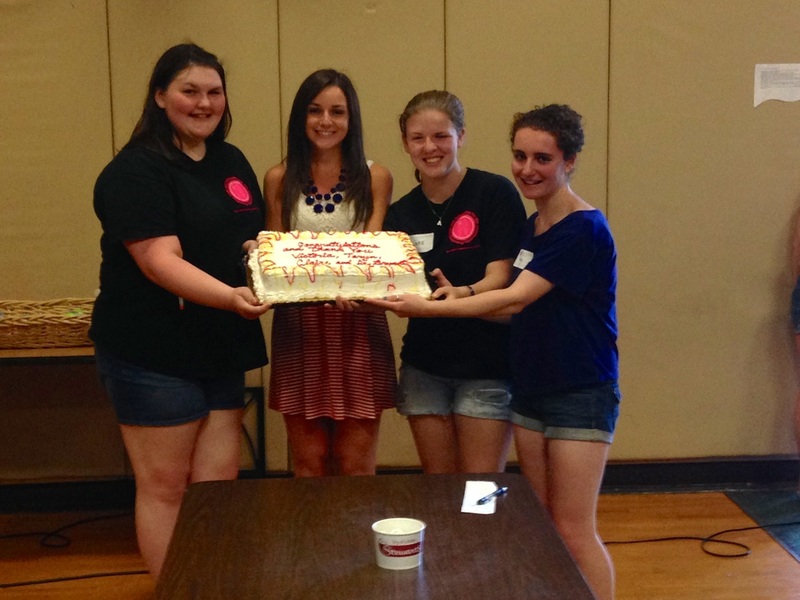 Graduates Victoria, Taryn, Clare and Avery. 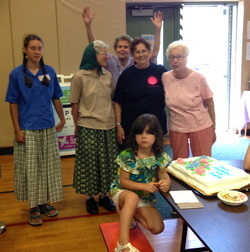 Our June Birthday and Anniversary Celebrants. 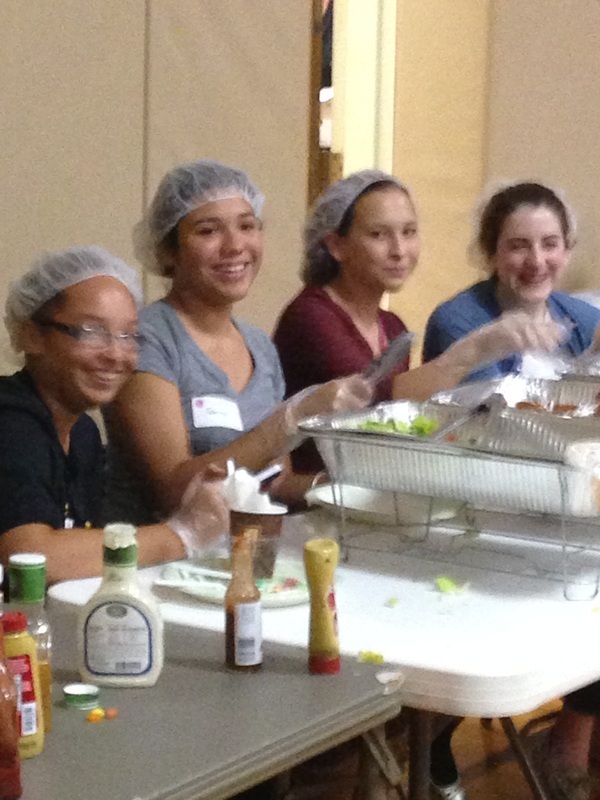 Some of our youth volunteers. 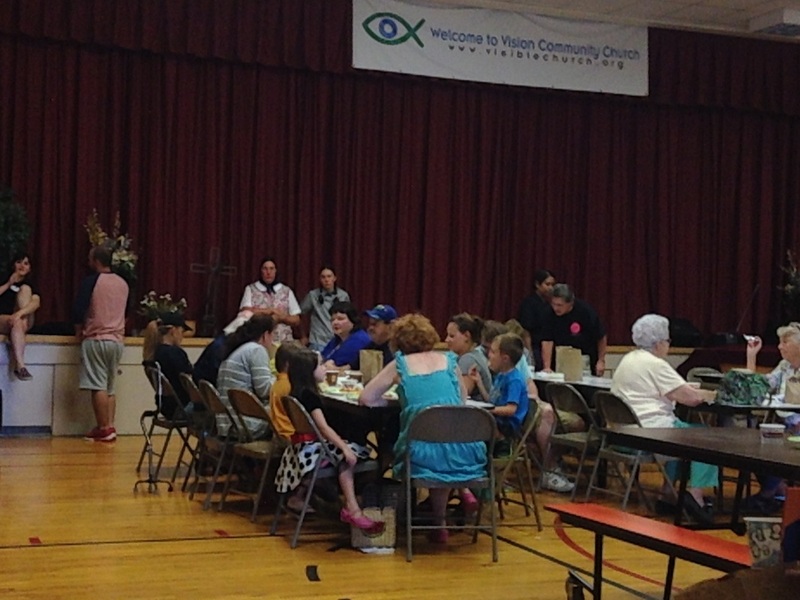 Victoria handing out meal tickets. 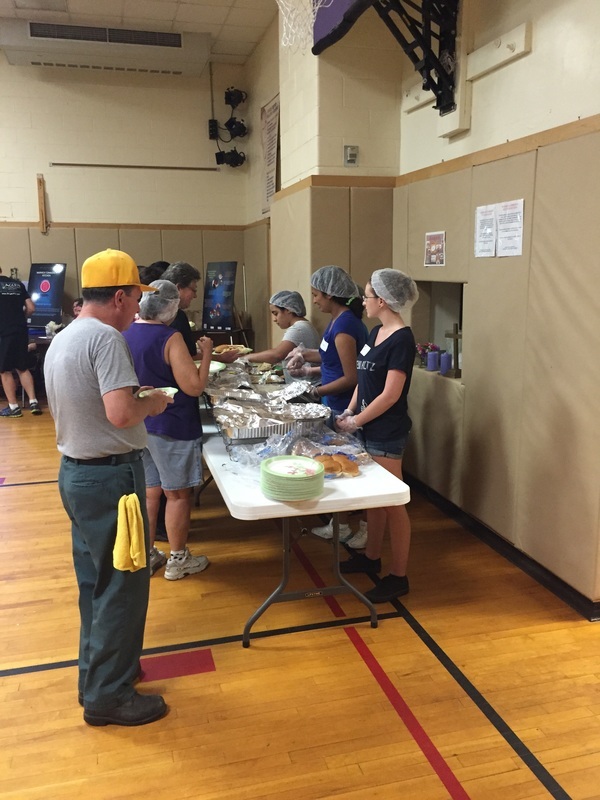 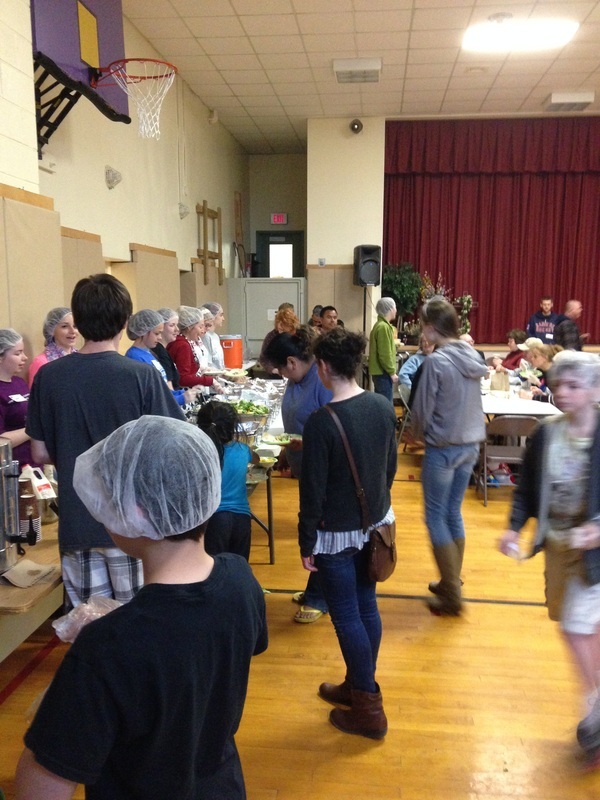 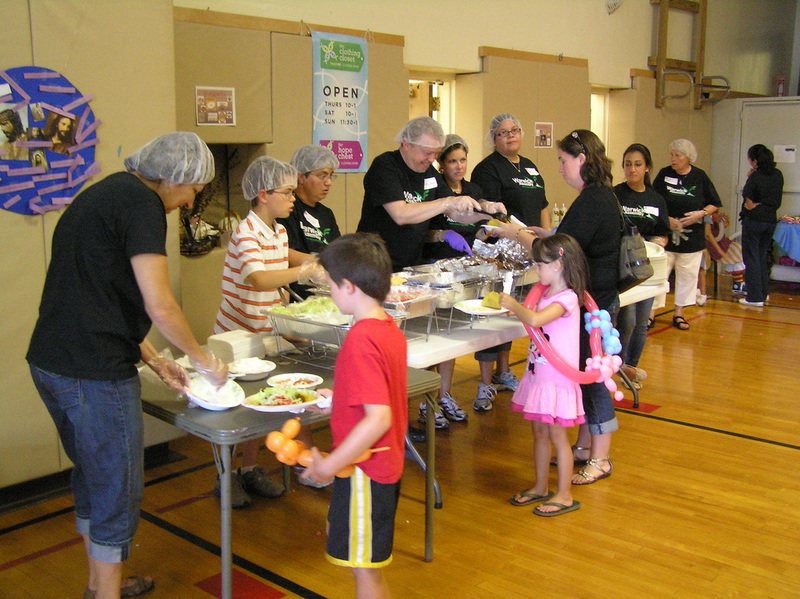 Volunteers getting ready to serve. 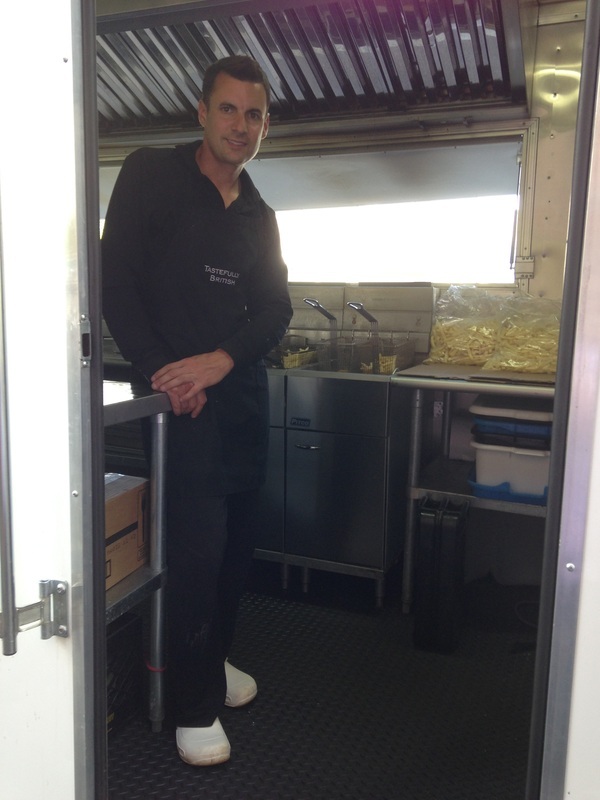 Scott, owner of Tastefully British. 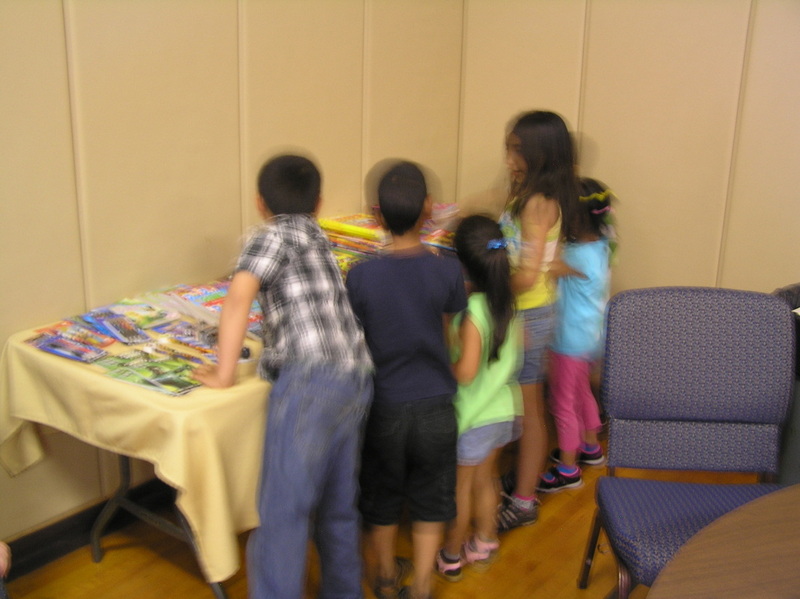 Guests looking through the donated toys. 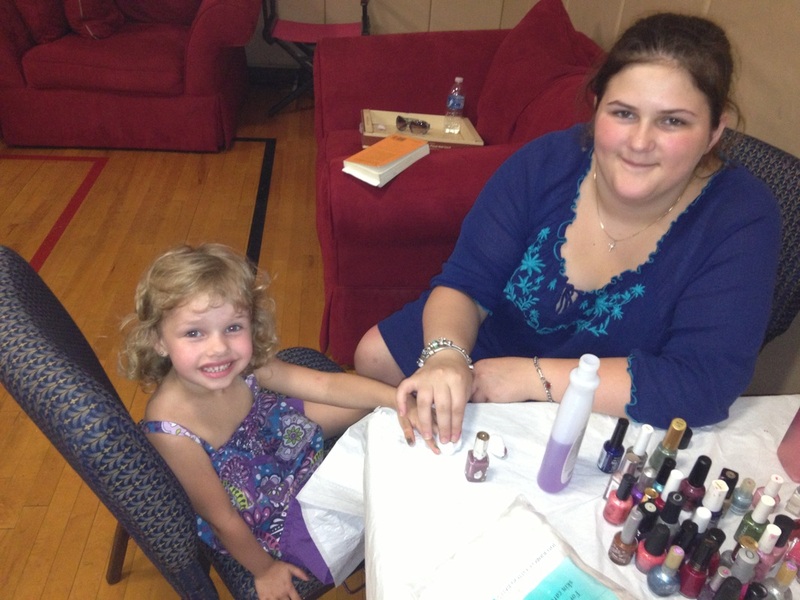 Rebecca and Travis having fun at the nail salon. 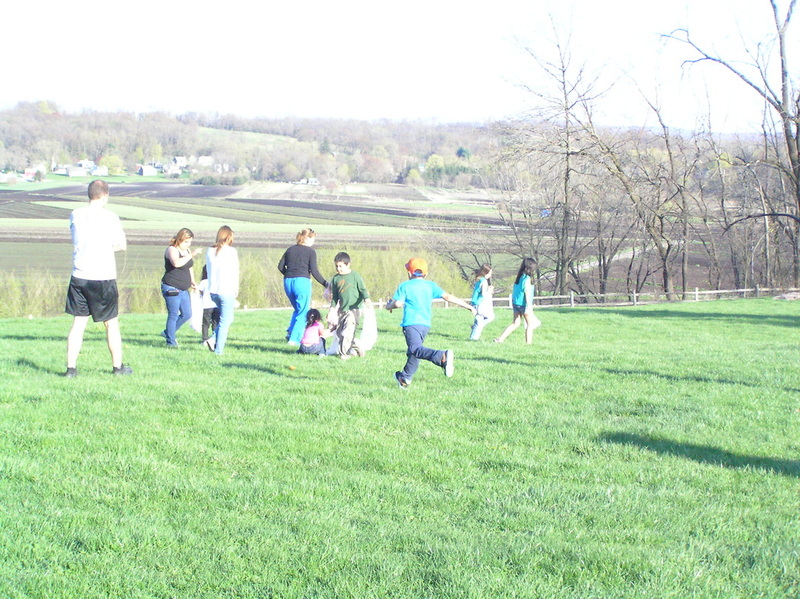 Getting ready for the After Easter Egg Hunt. 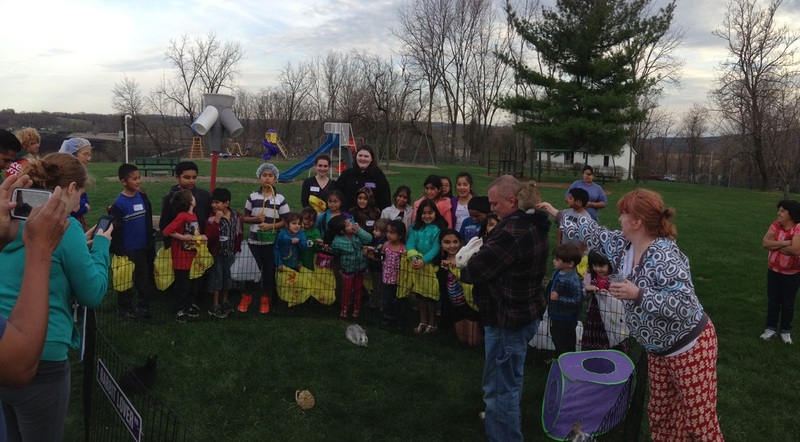 We had therapy bunnies for the guests to pet. 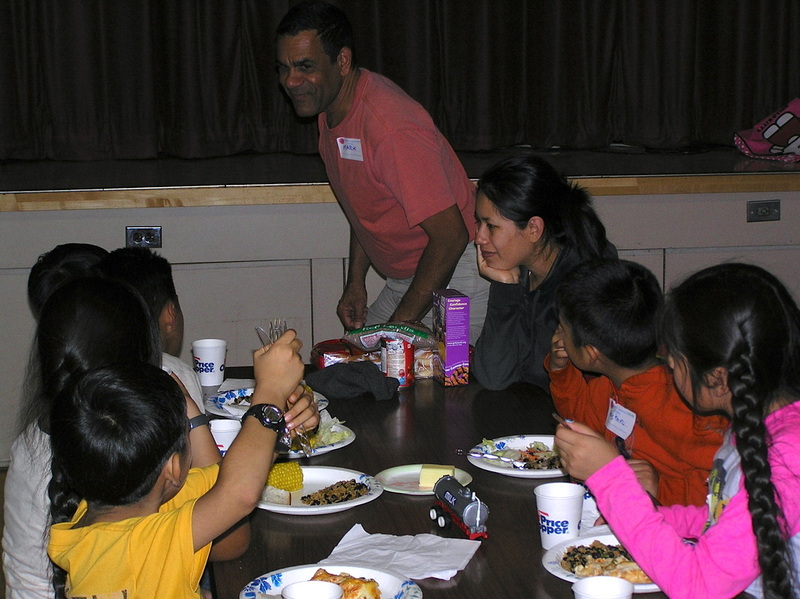 The Chef enjoying dinner with the guests. 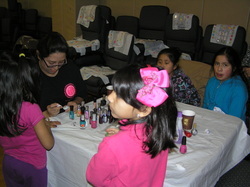 Tania busy at the Nail Salon. 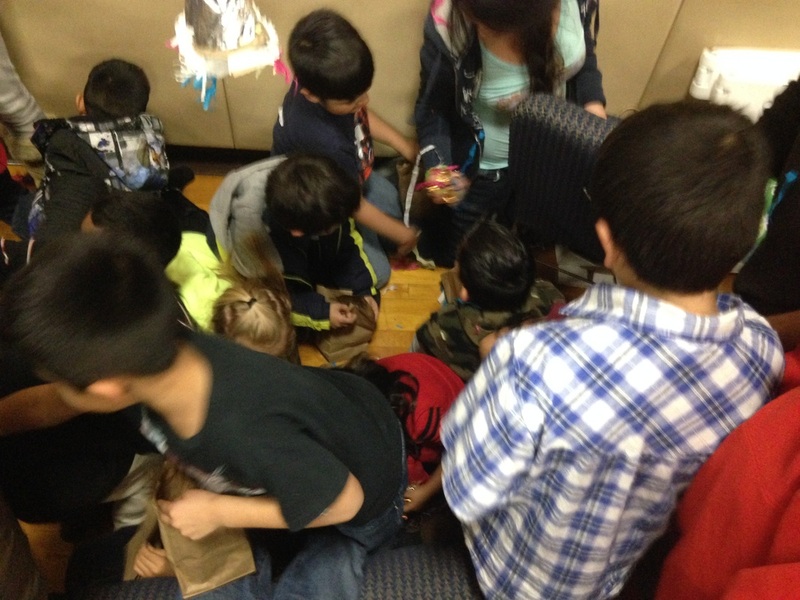 Decorating a bag for the After Easter Egg Hunt. 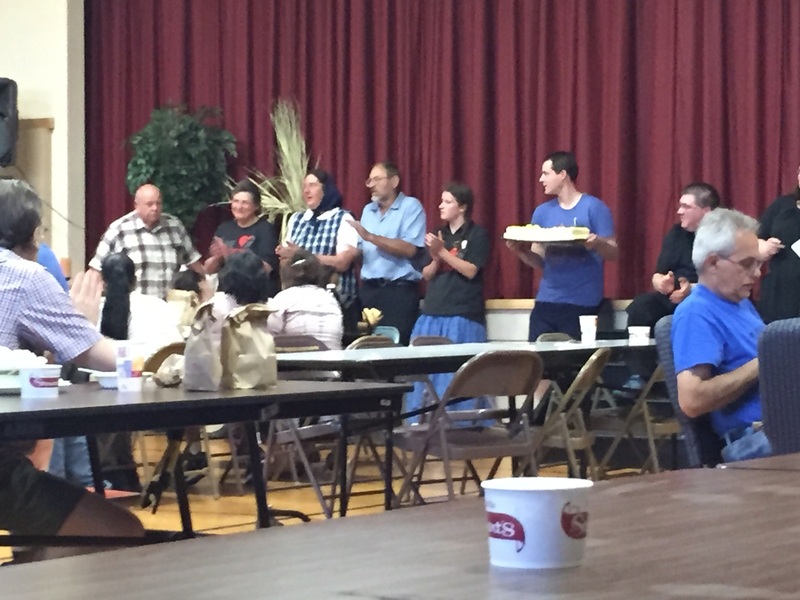 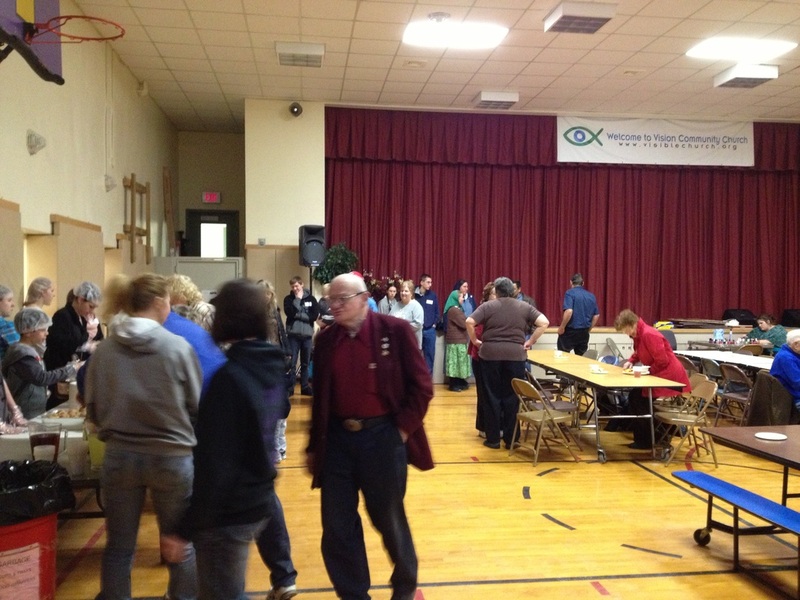 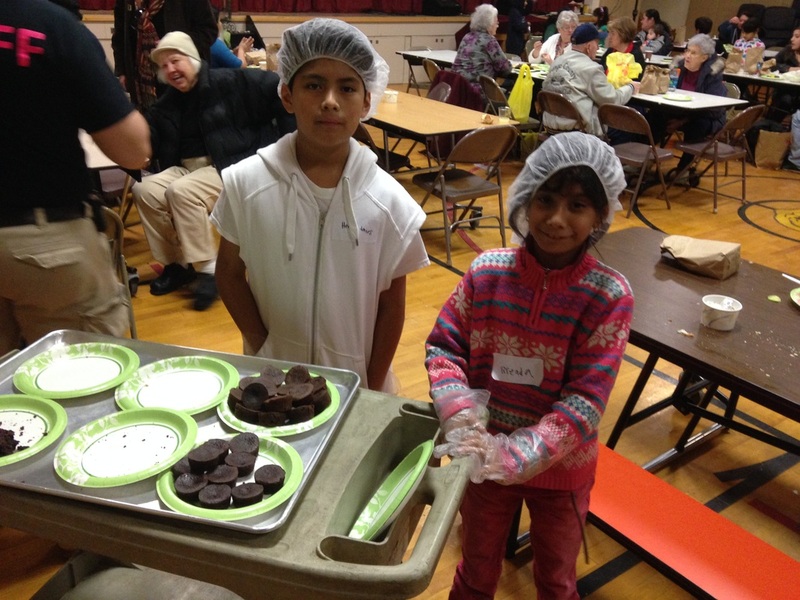 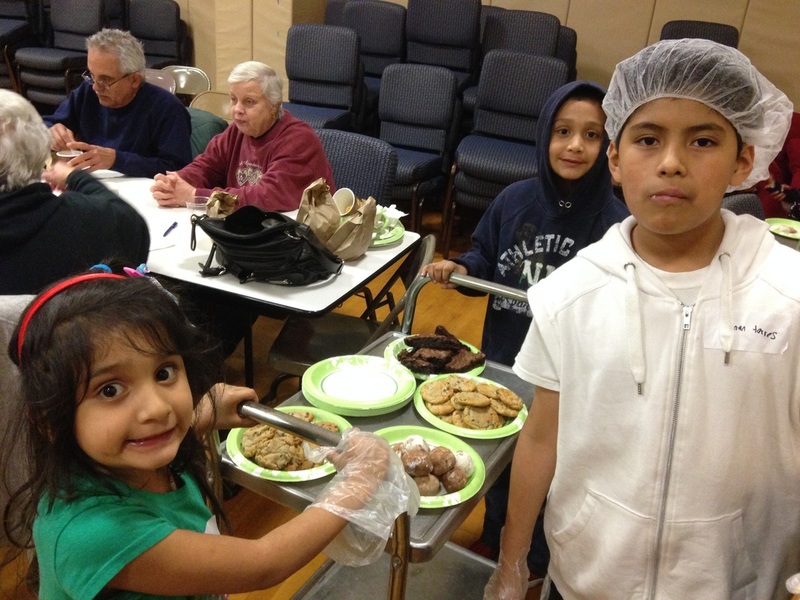 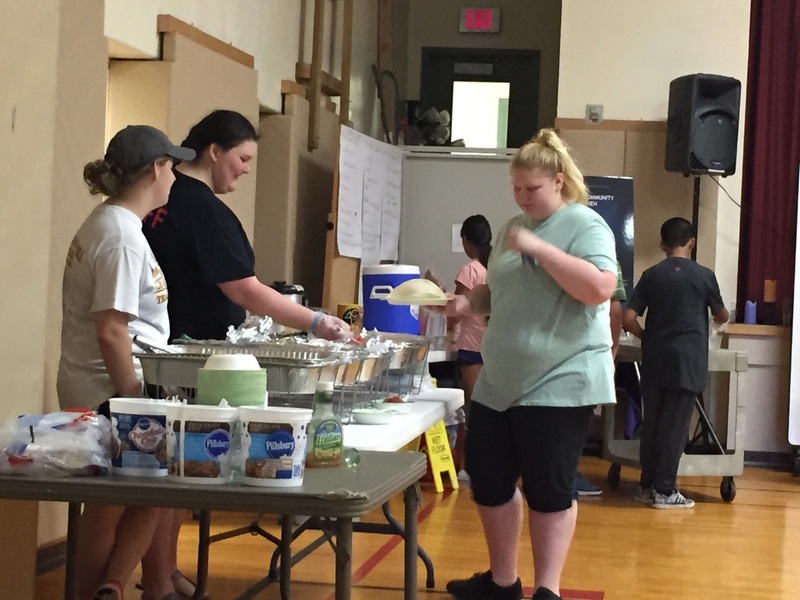 Our youth volunteers handing out dessert. 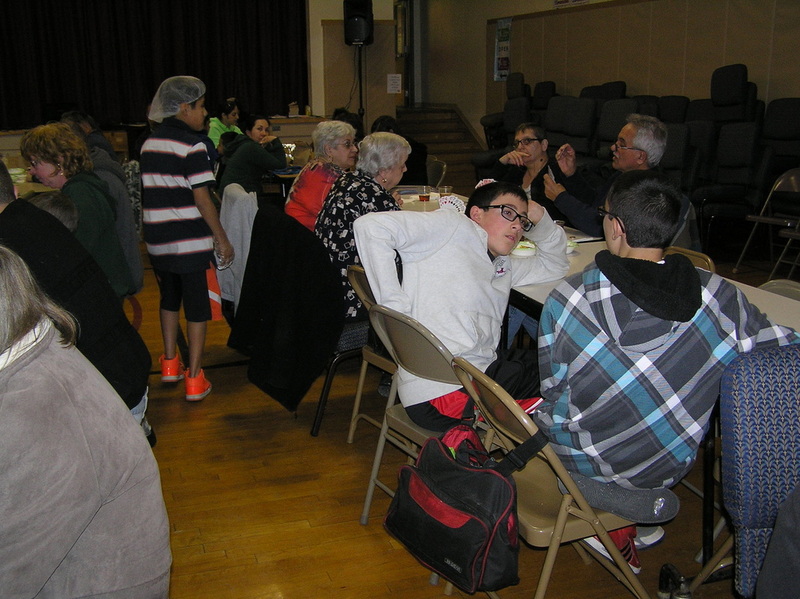 Additional volunteers helping with dessert. 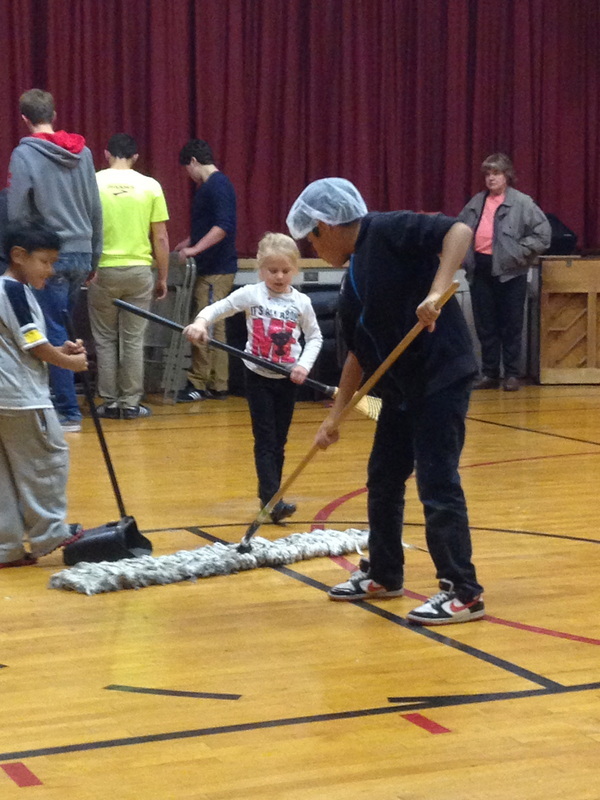 More youth volunteers cleaning up. 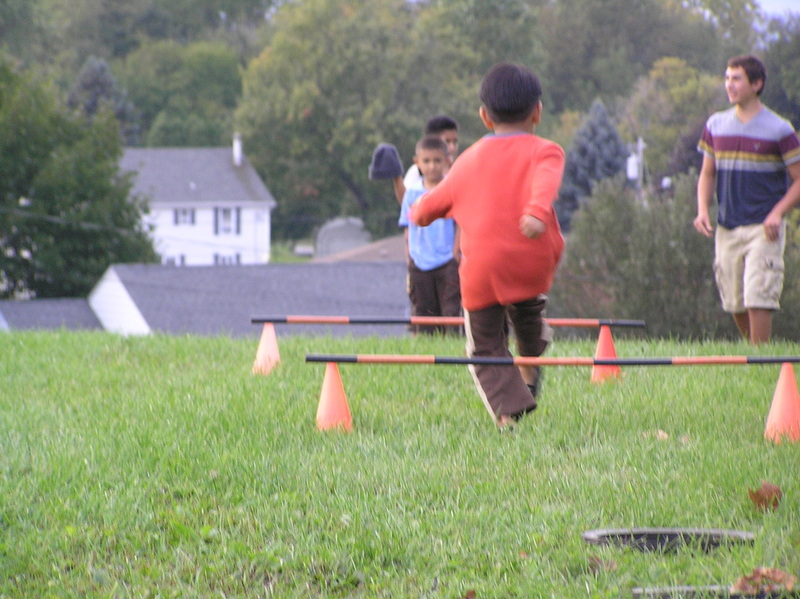 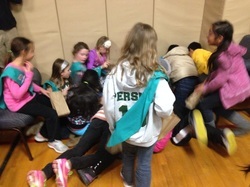 The older kids making a mad dash for candy. 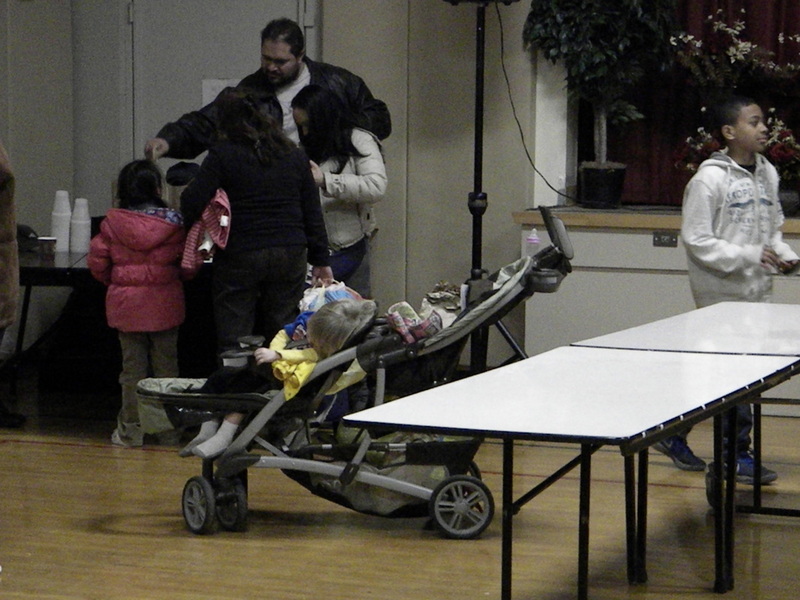 The younger kids getting candy. 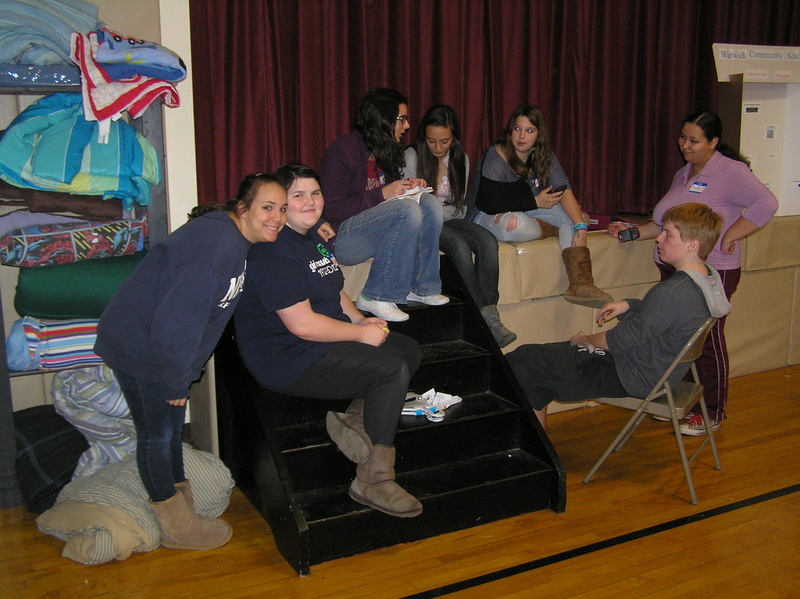 Some of Junior Troop 426 who volunteered. 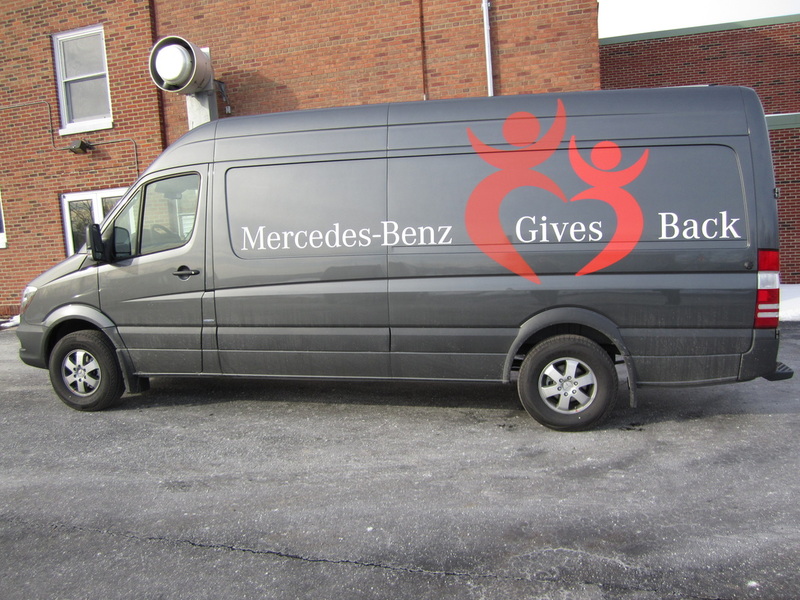 Merces-Benz USA lent this Sprinter Van to use. 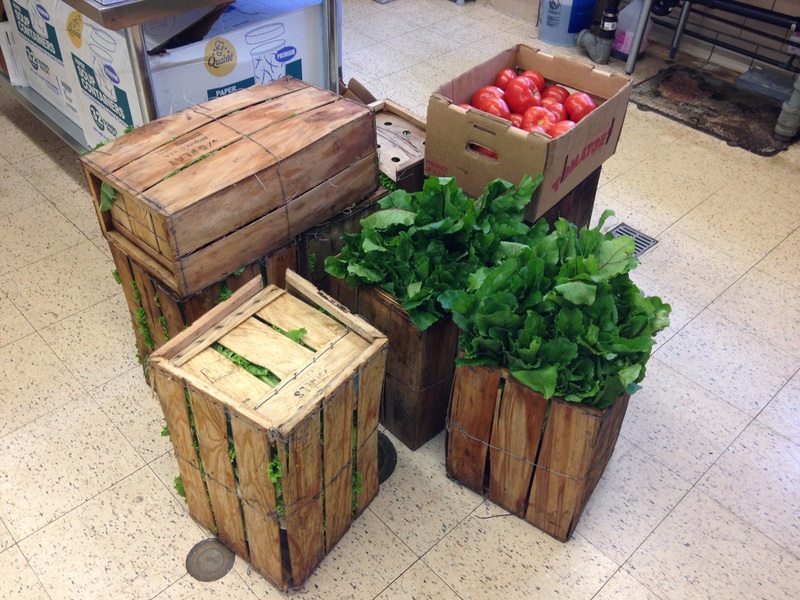 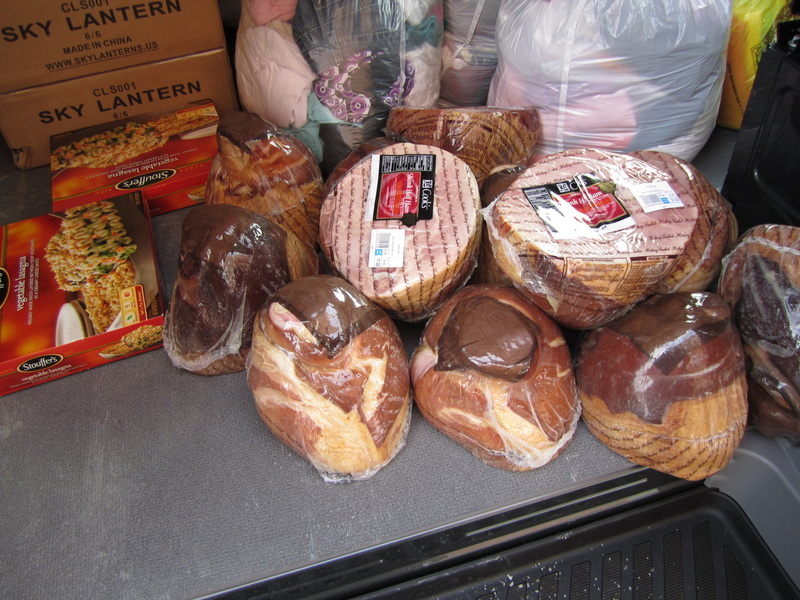 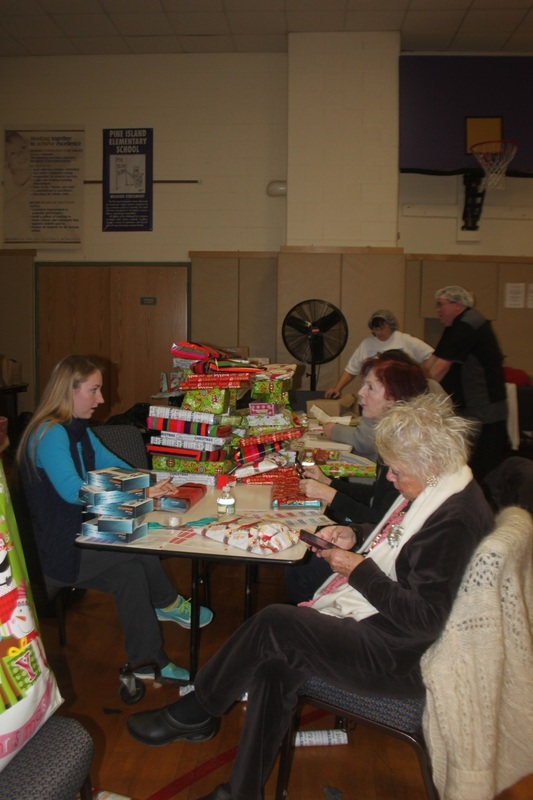 Food donations from ShopRite of Warwick. 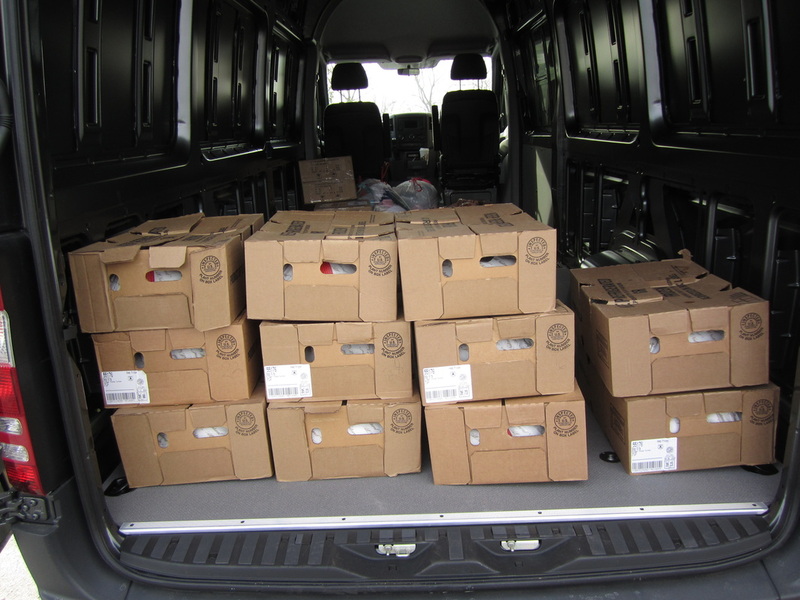 40 turkeys donated by ShopRite. 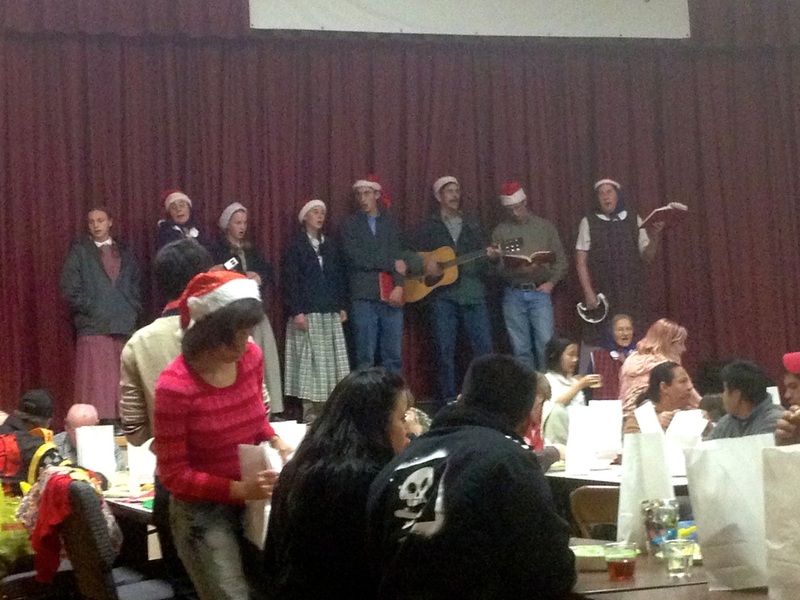 Members of the Bellvale Community singing. 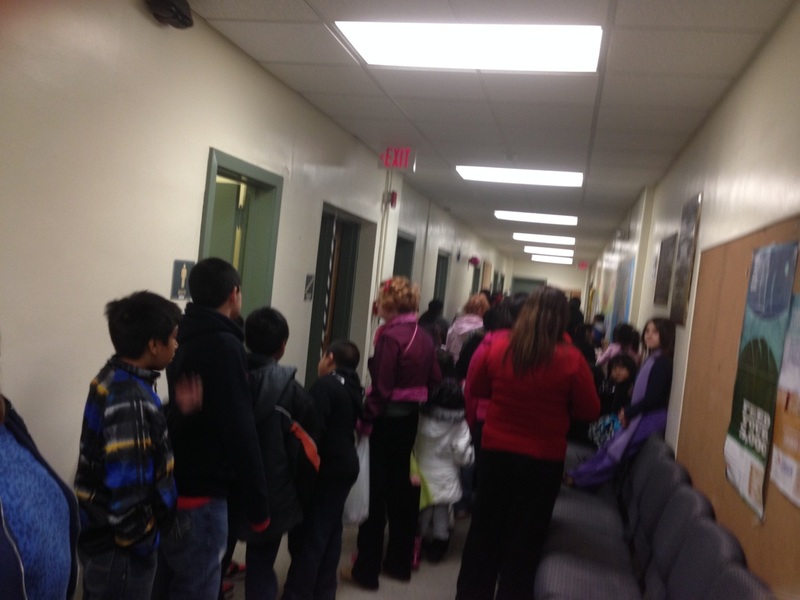 The line to visit Santa Claus. 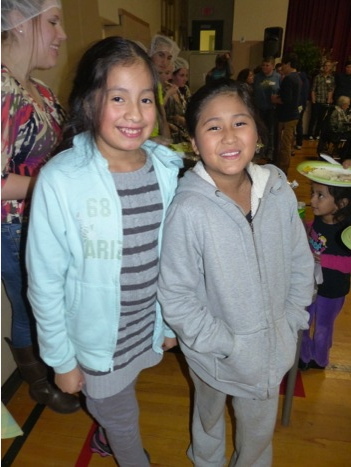 Our December Birthday Babies. 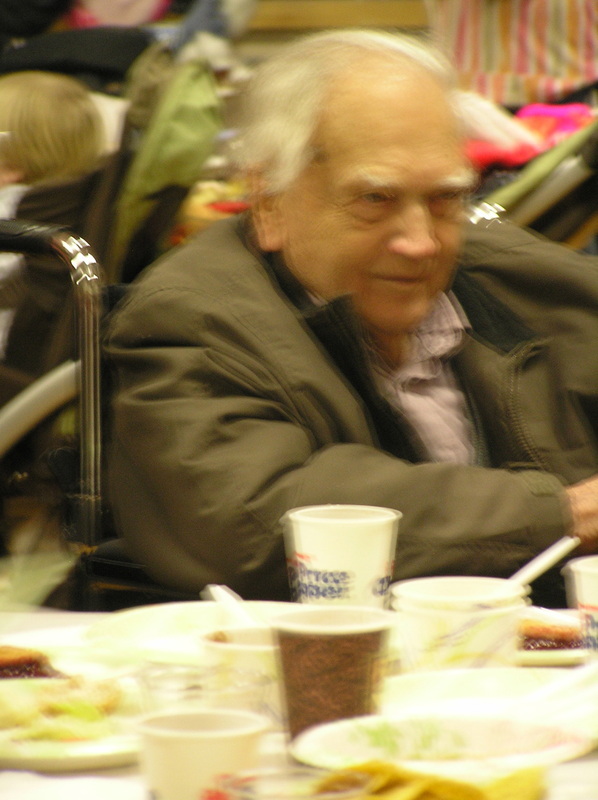 Happy 101 to Adam! 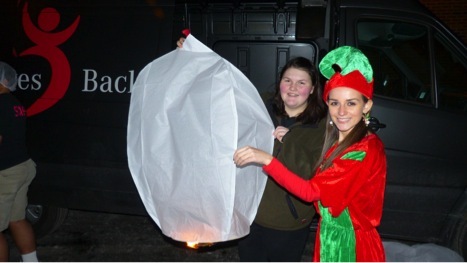 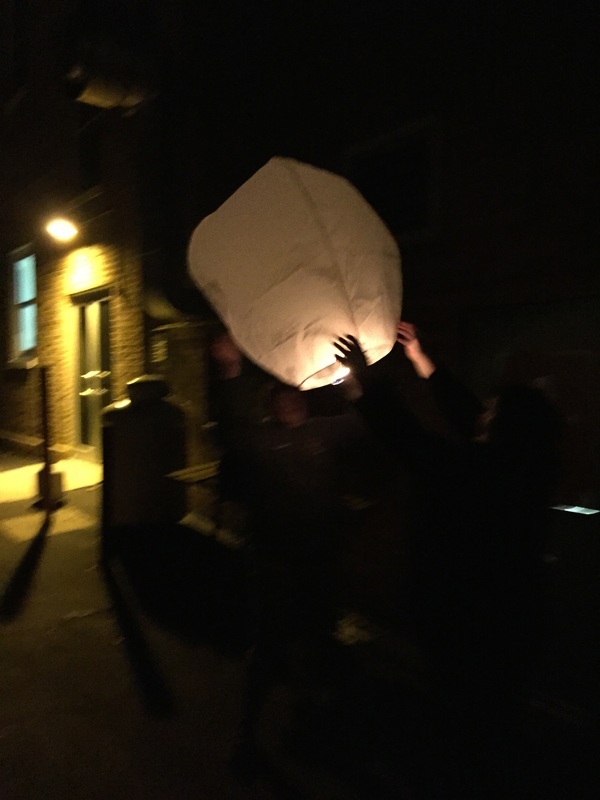 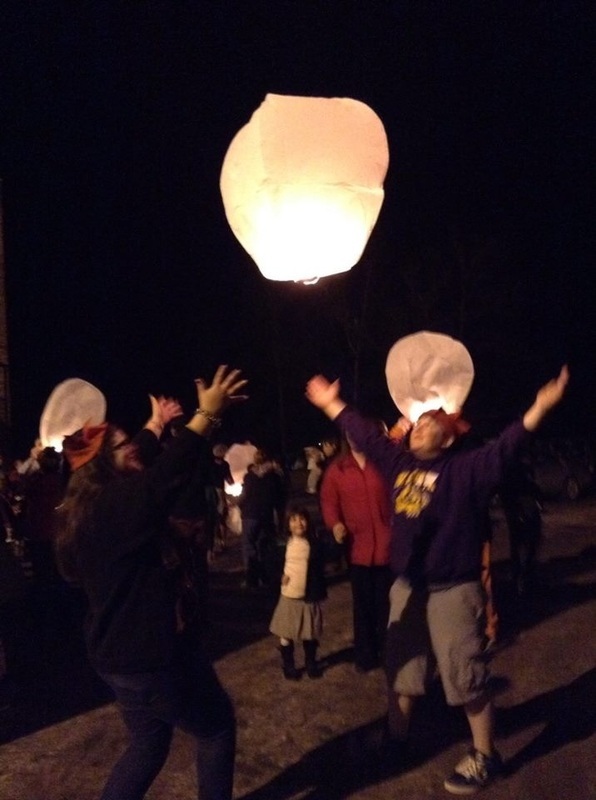 Victoria and Taryn lighting their lantern. 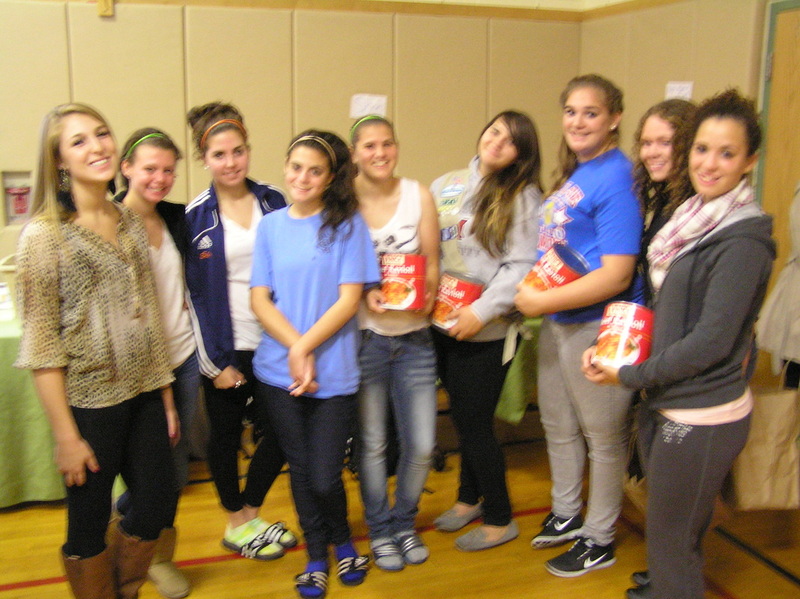 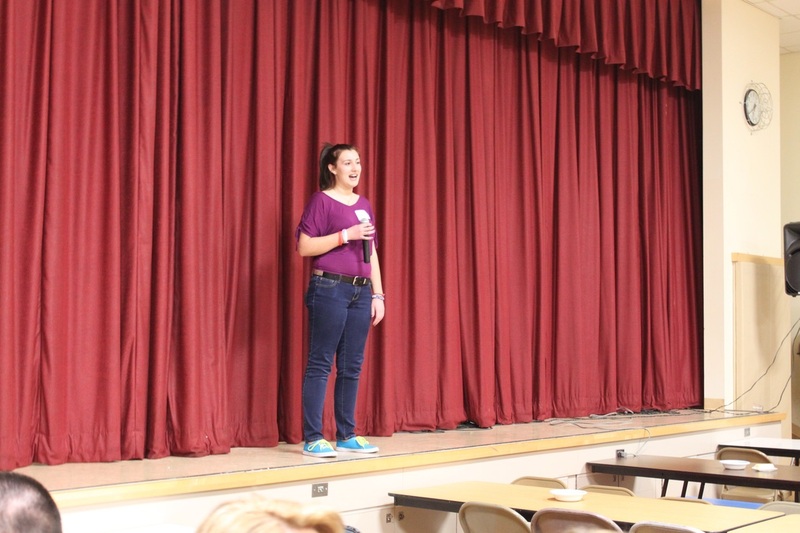 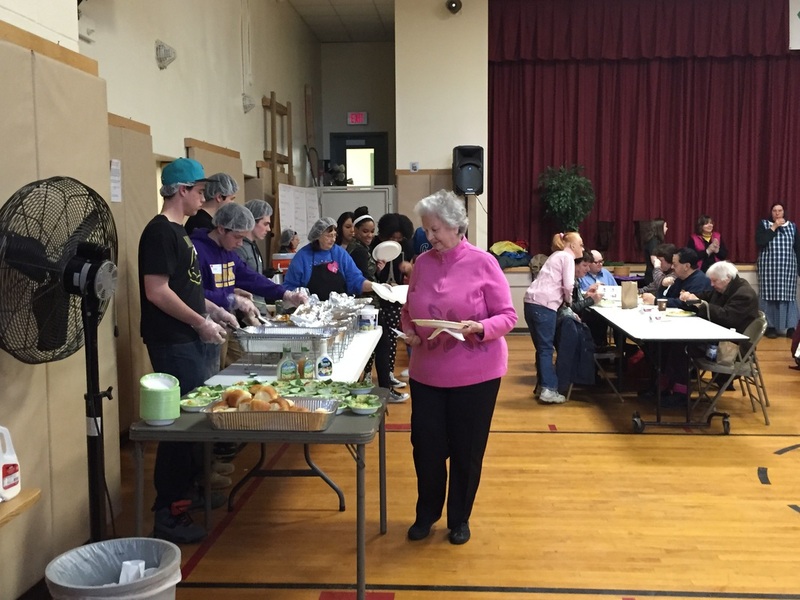 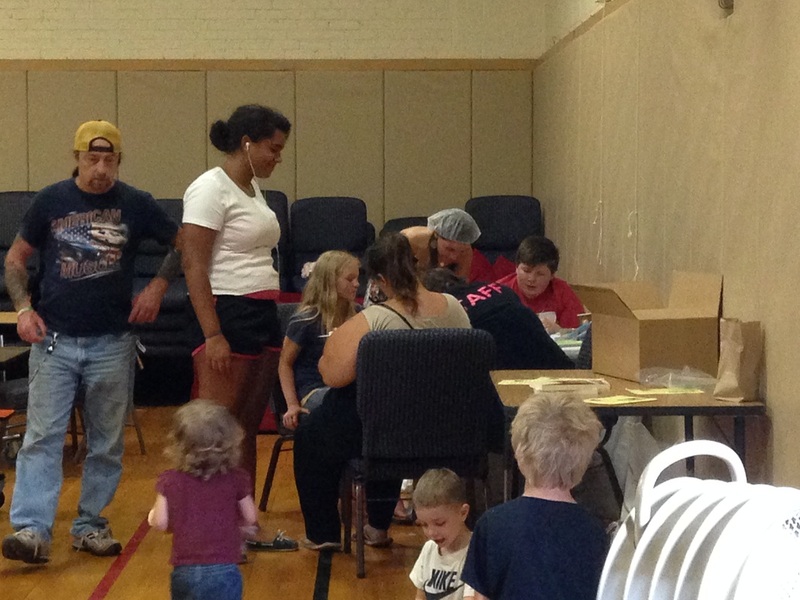 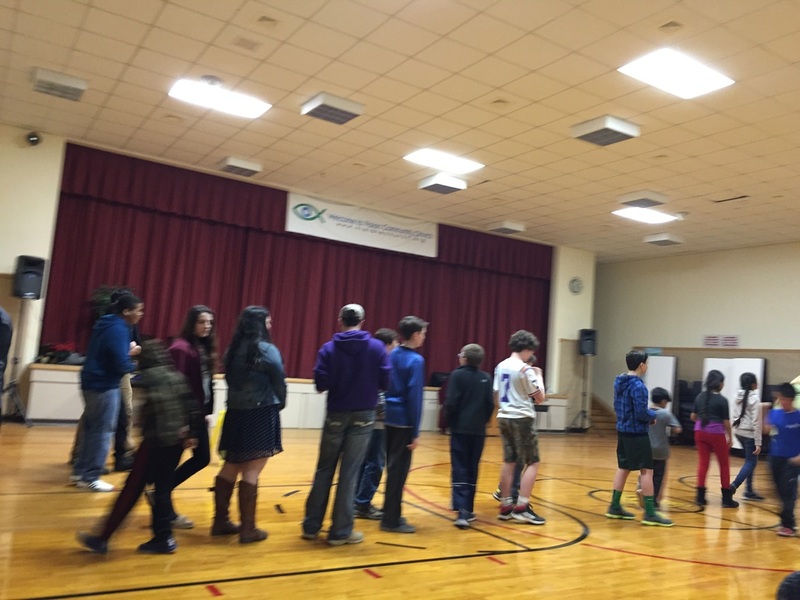 Volunteers from Warwick High School's Future Business Leaders of America Club came to help. 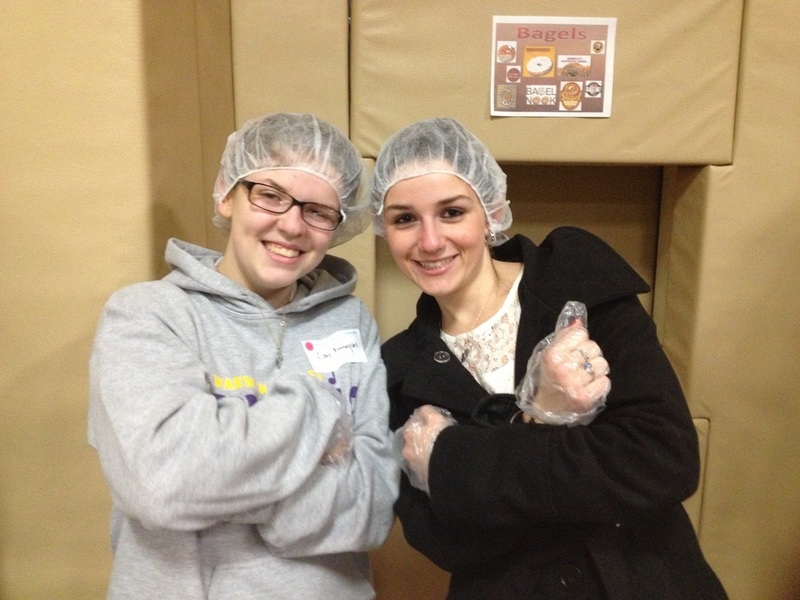 More volunteers both from the community and FBLA. 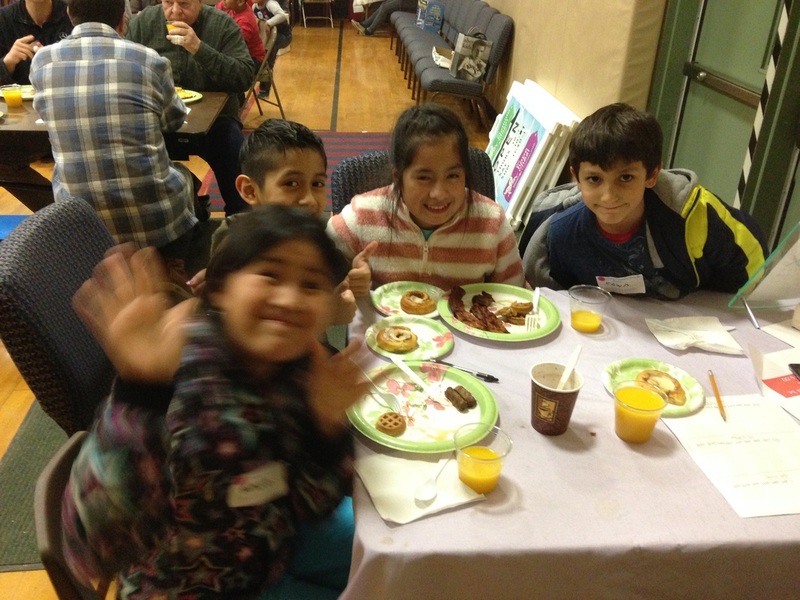 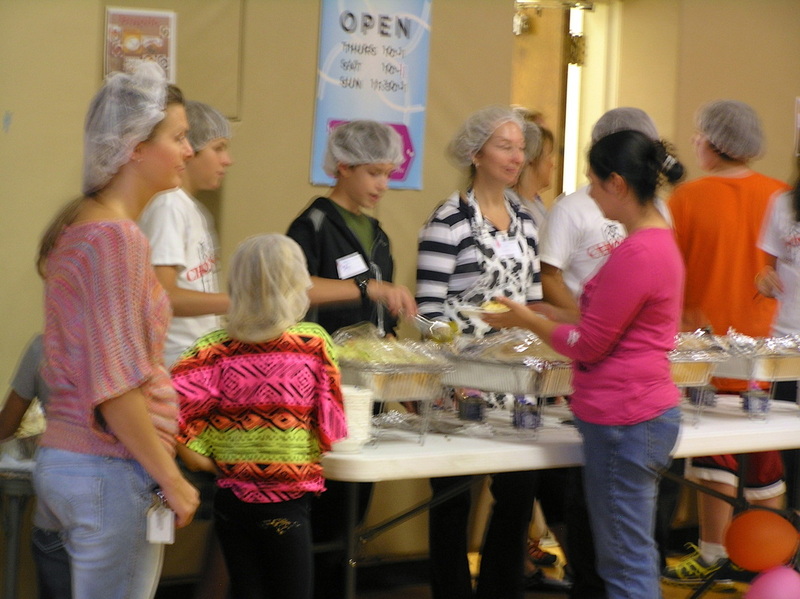 Some of the children who have been coming to our dinners want to give back and asked if they could volunteer. 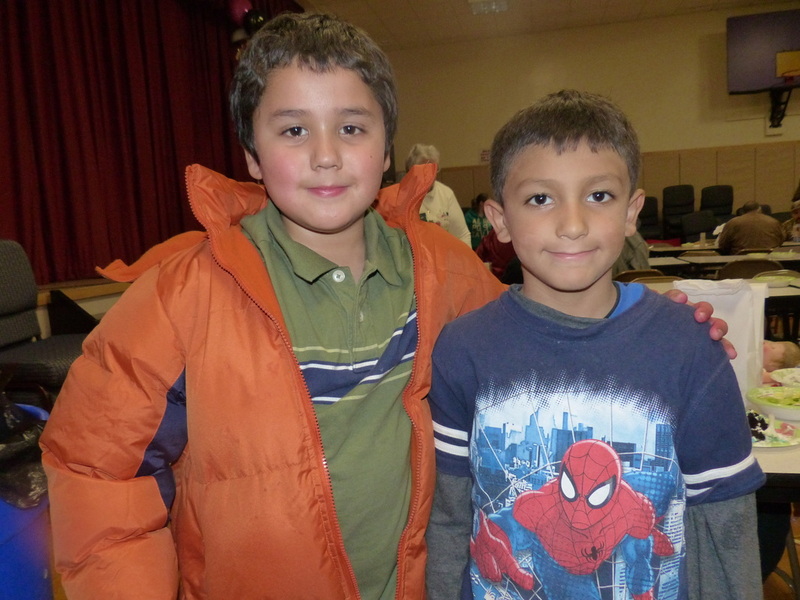 Here are two of them. 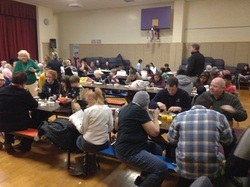 A very busy dining room. 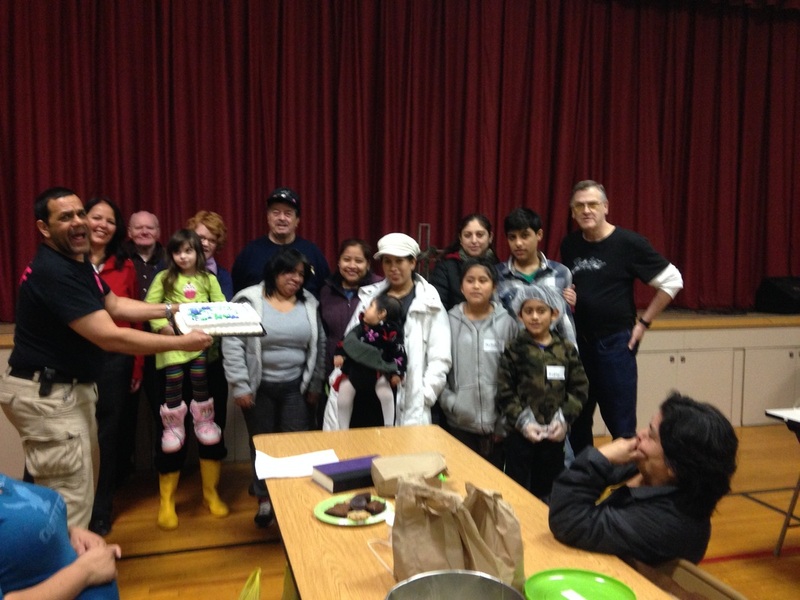 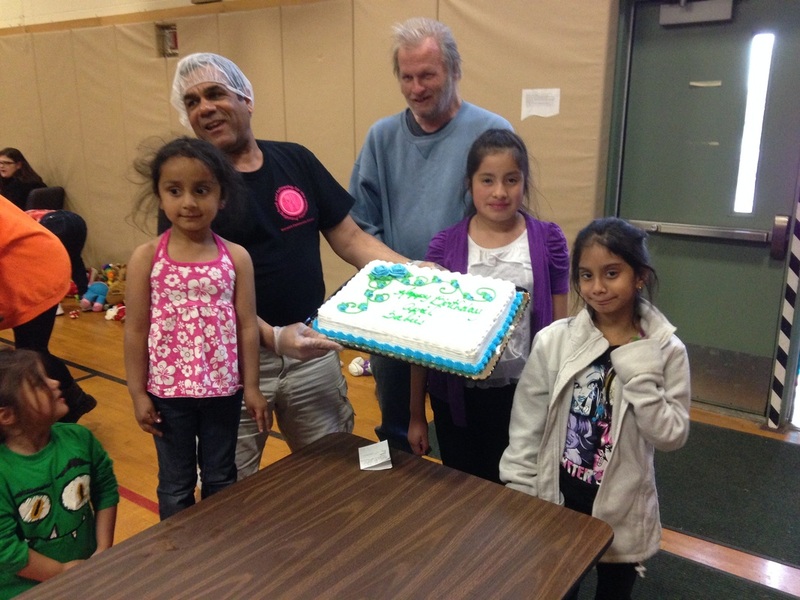 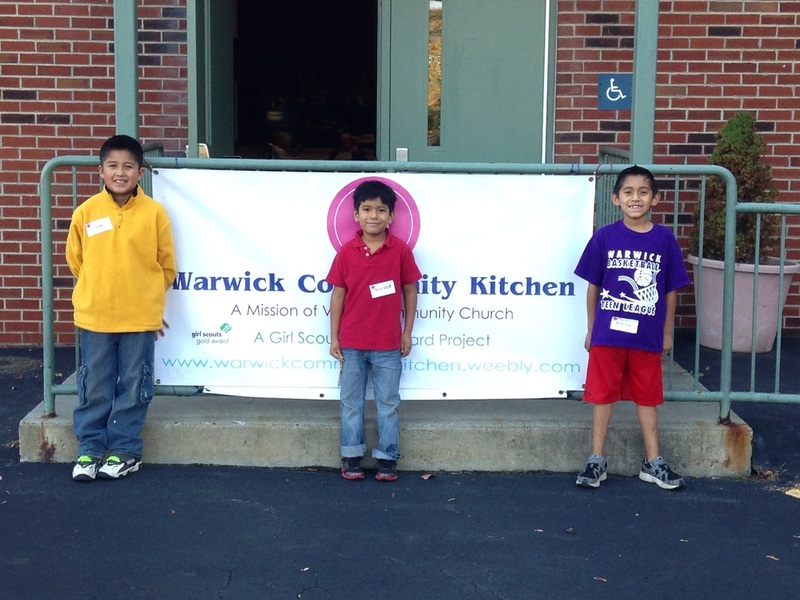 Mark, Paty and Hernan celebrating November birthdays as well as celebrating the Two Year Anniversary of the Warwick Community Kitchen. 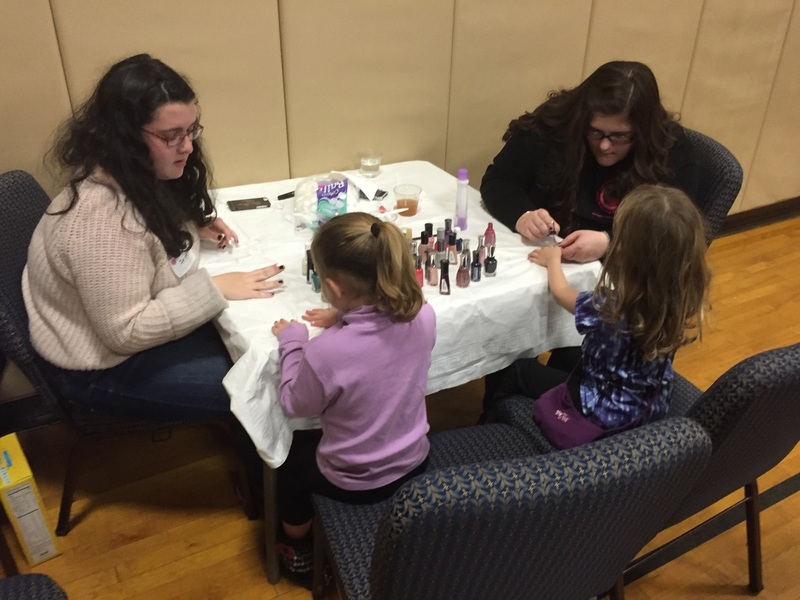 The craft table and the nail salon. 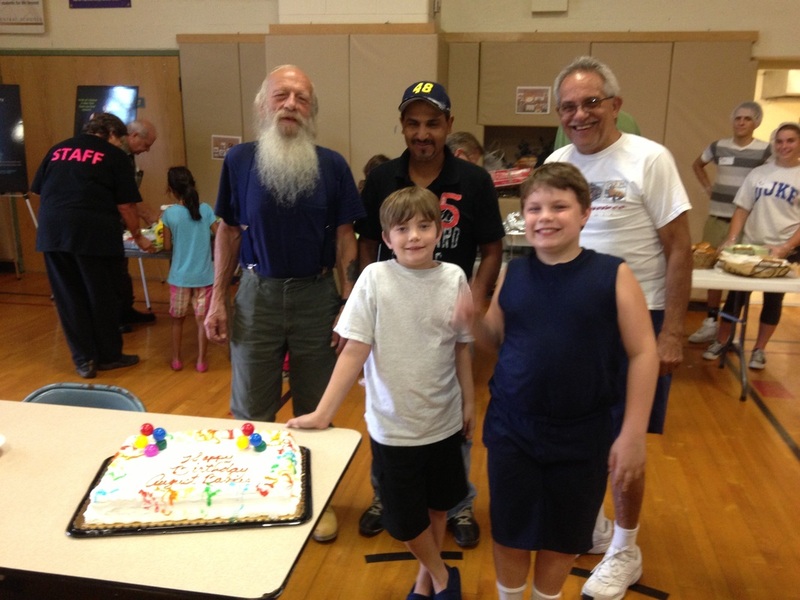 Our three newest volunteers; Gustavo, Brendon and Andrew. 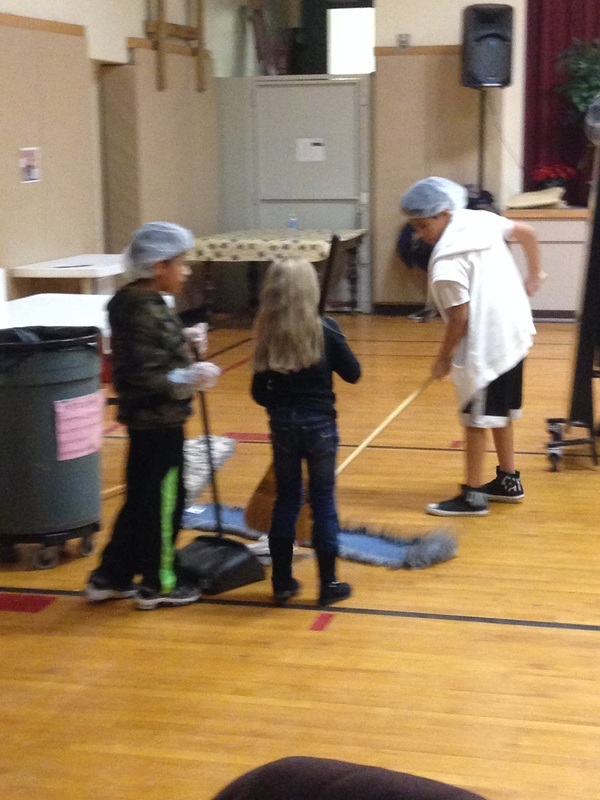 They were a huge help! 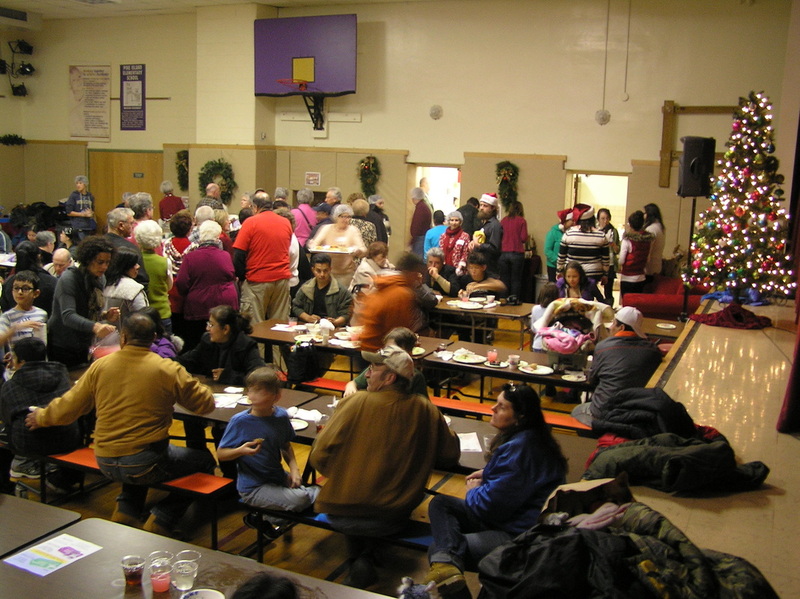 A diningroom full of guests. 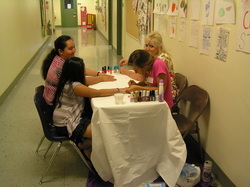 Guests visiting the nail salon. 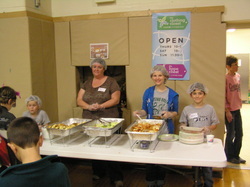 Great volunteers serving our guests. 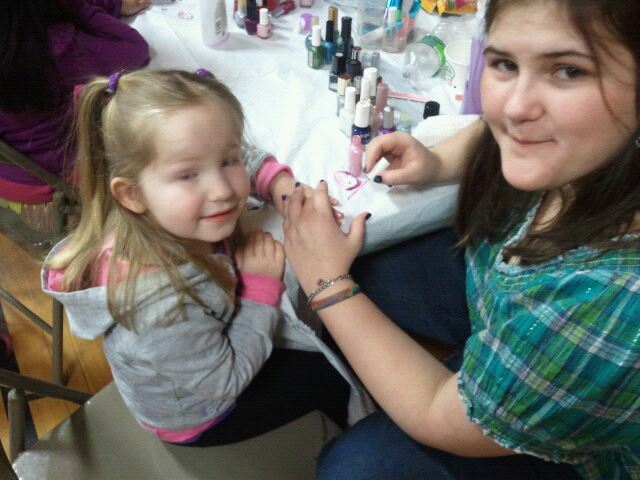 Beautiful fingers at the nail salon. 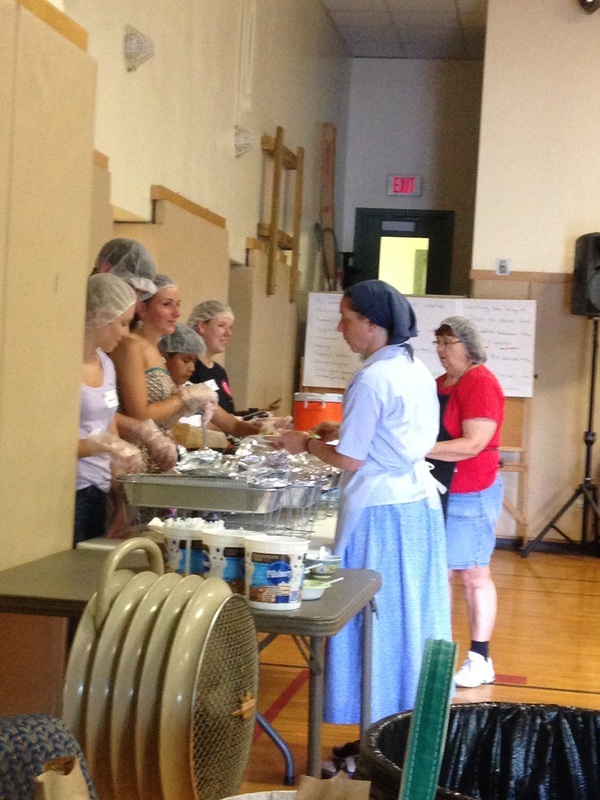 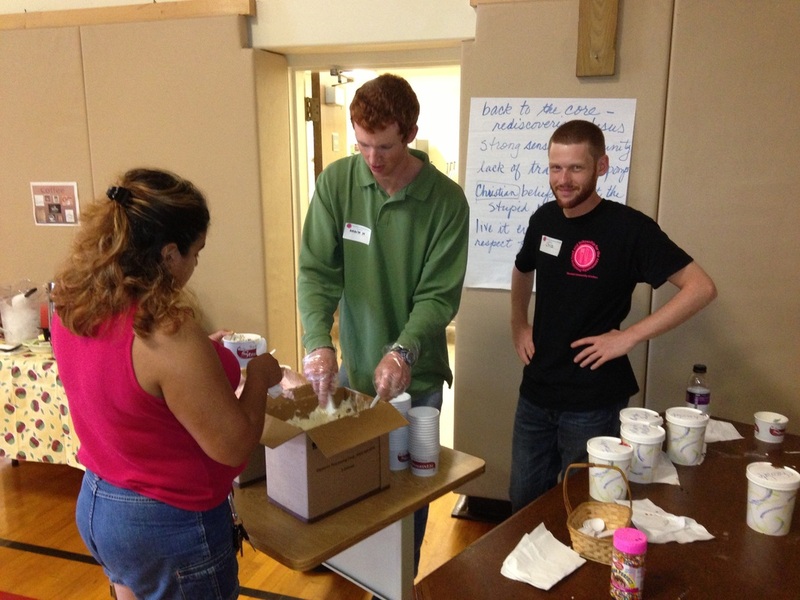 Volunteers making ice cream sundaes. 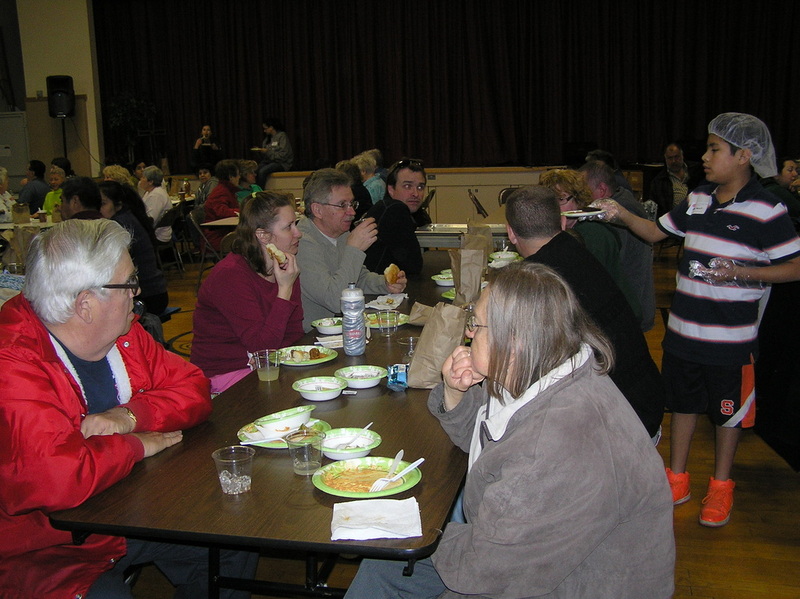 More guests enjoying the dinner. 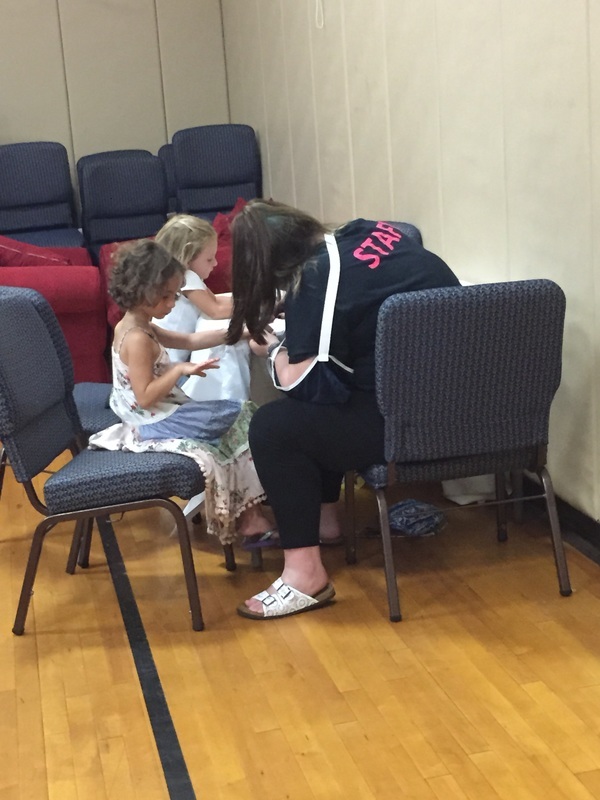 Girls getting their nails done. 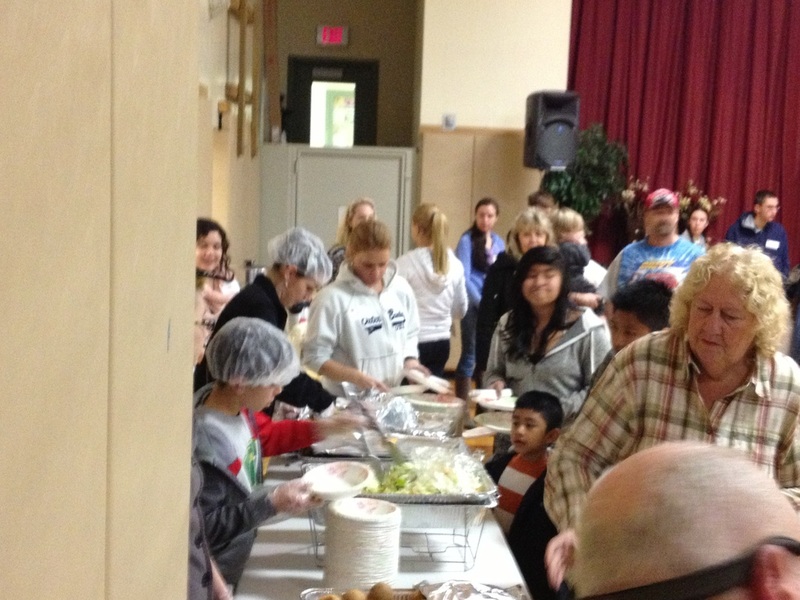 Victoria and volunteers preparing the food. 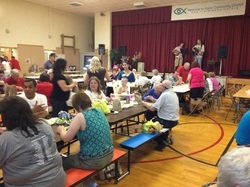 Guests eating and enjoying the music. 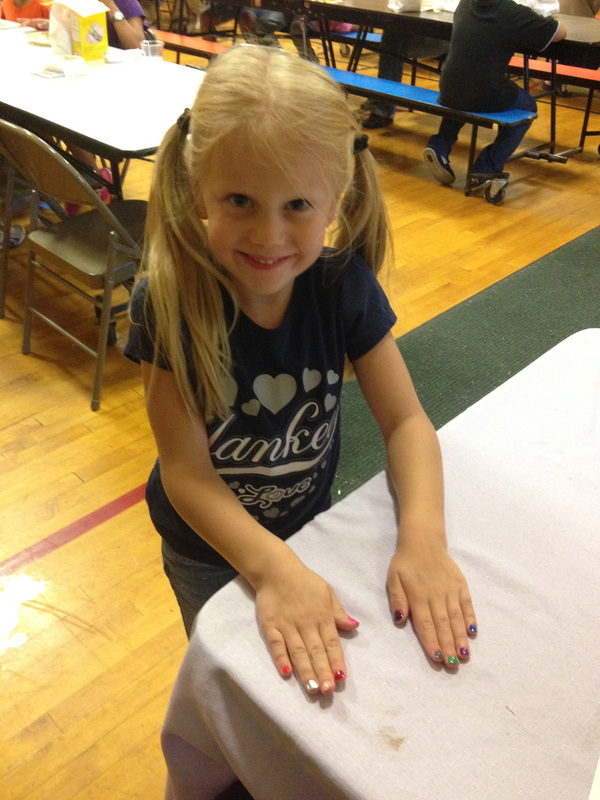 Rebecca painting nails at the Nail Salon. 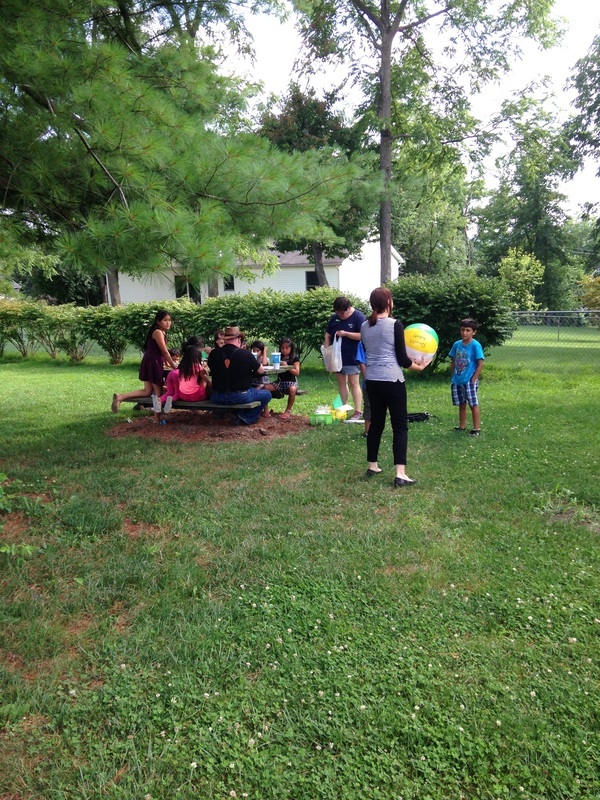 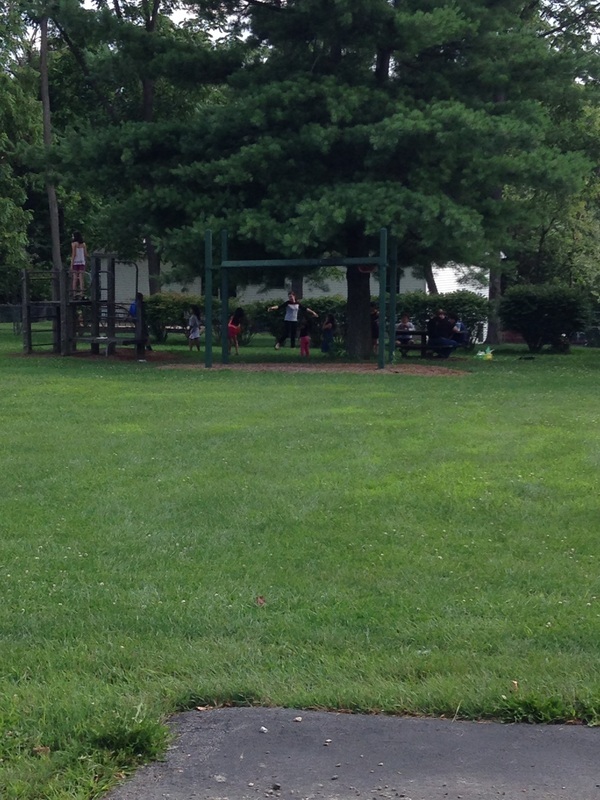 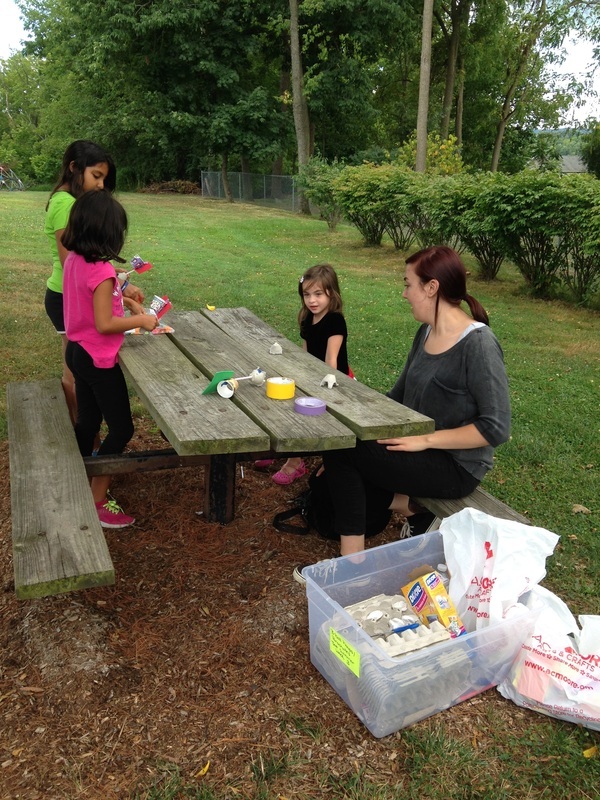 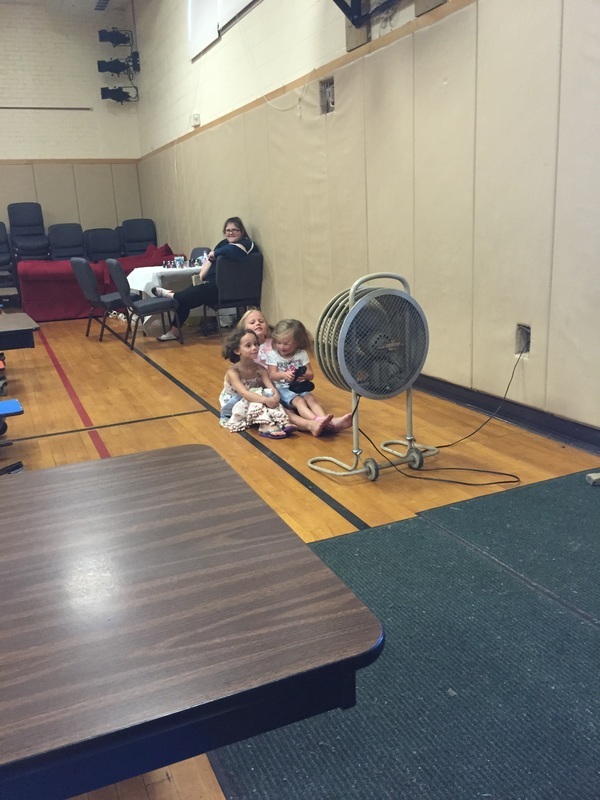 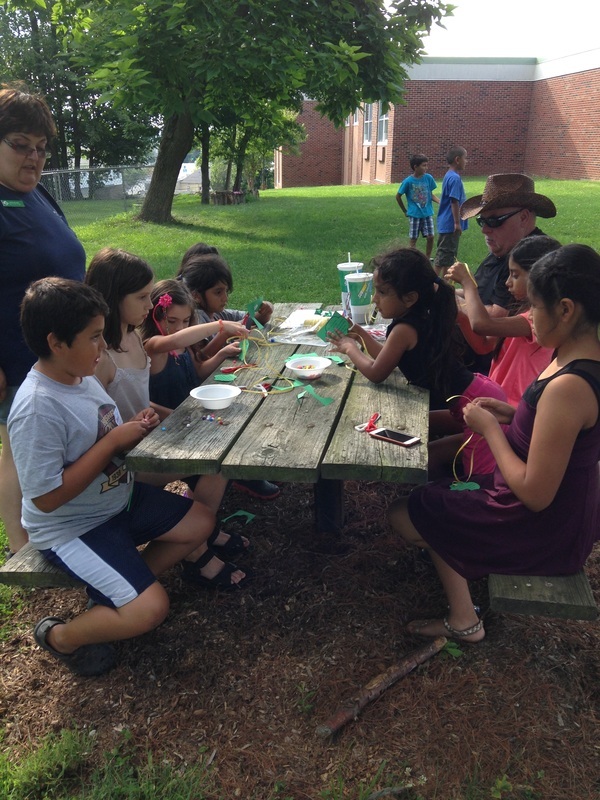 Girl Scout Troop 627 working on a project. 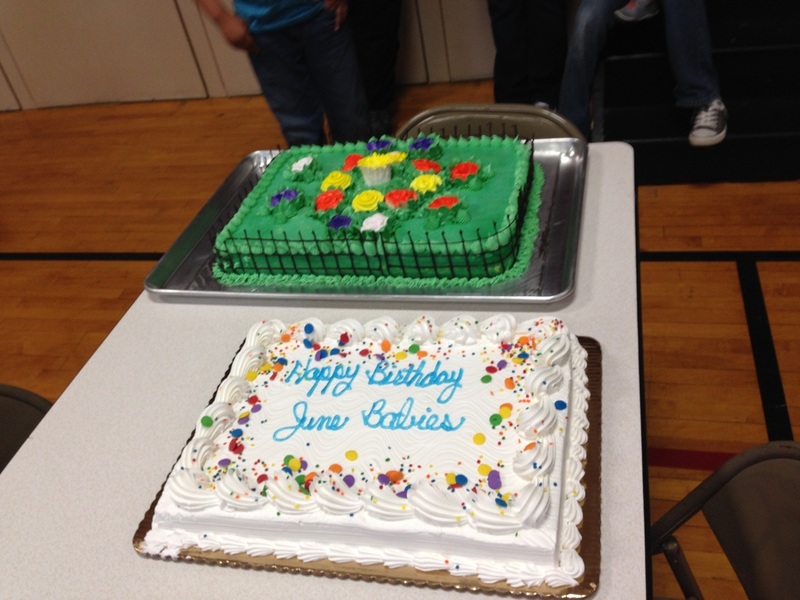 Our May Birthdays and Anniversaries. 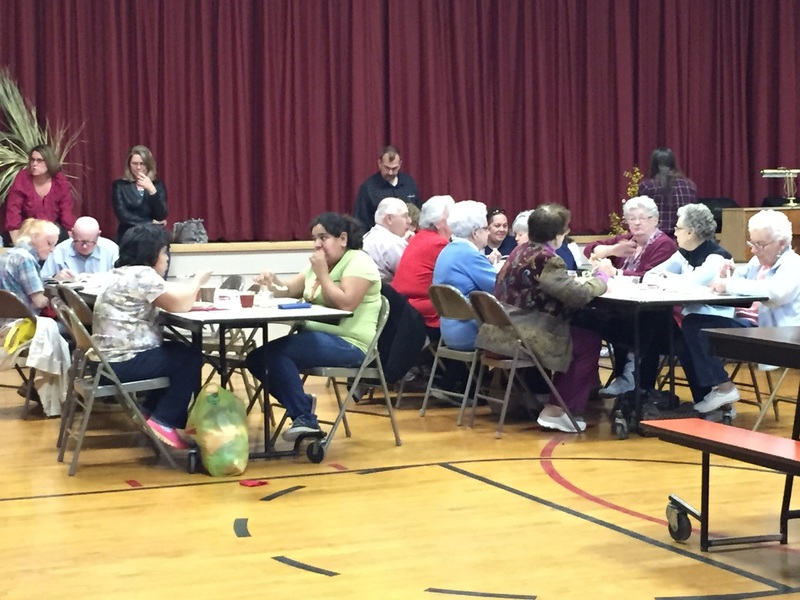 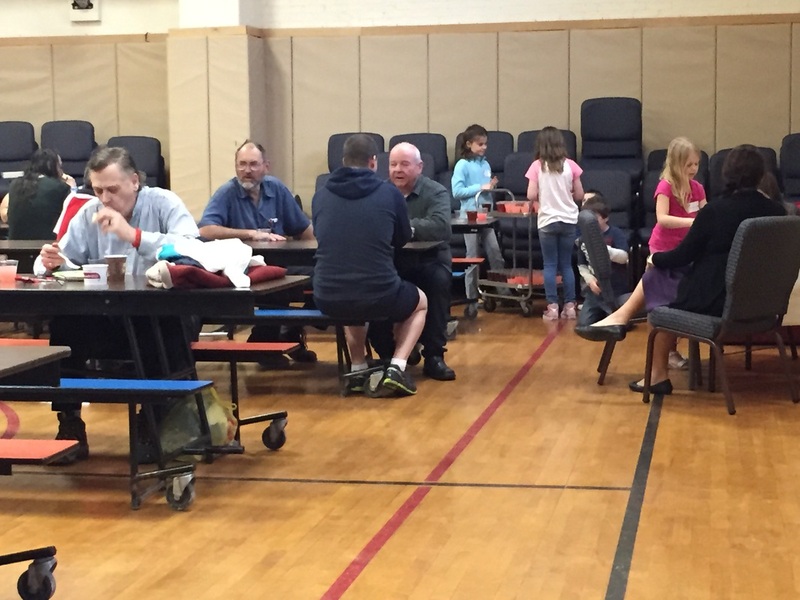 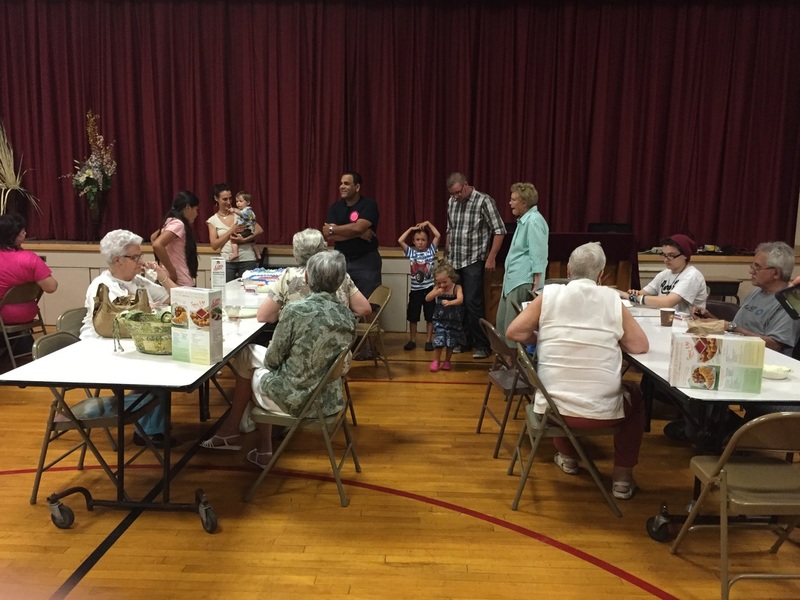 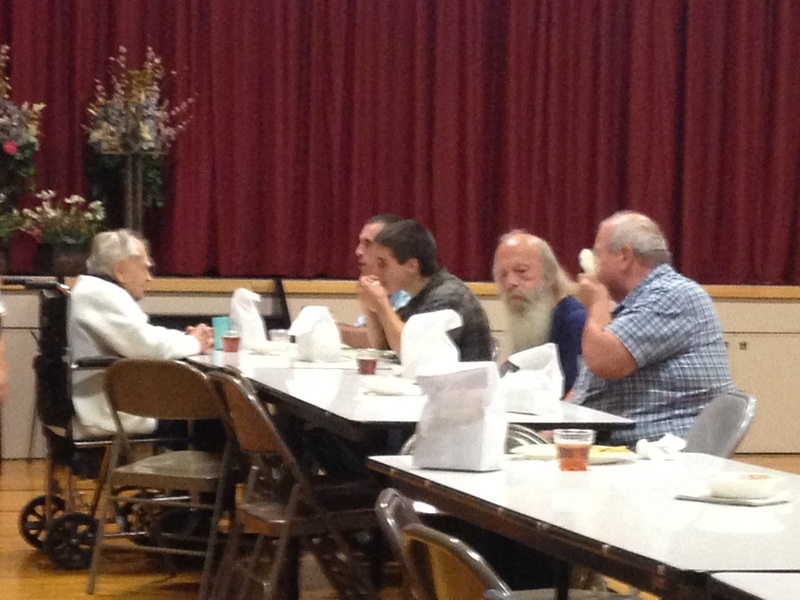 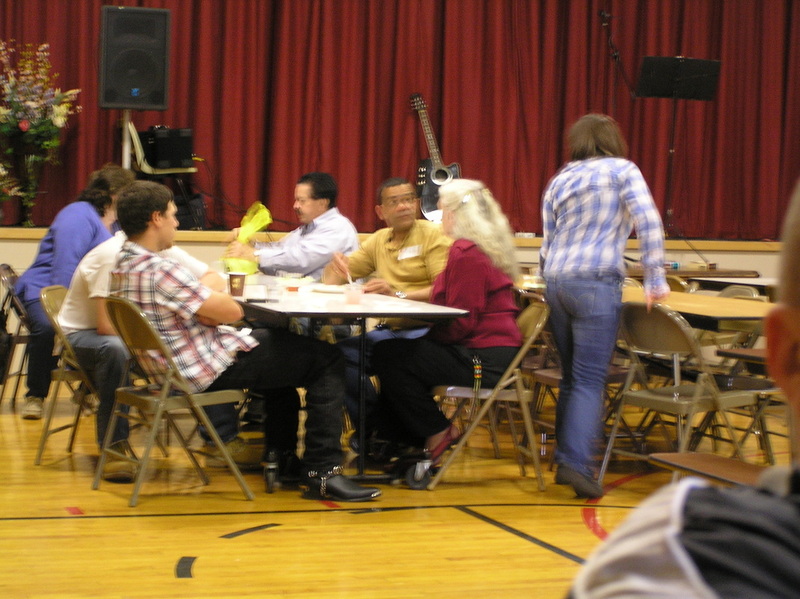 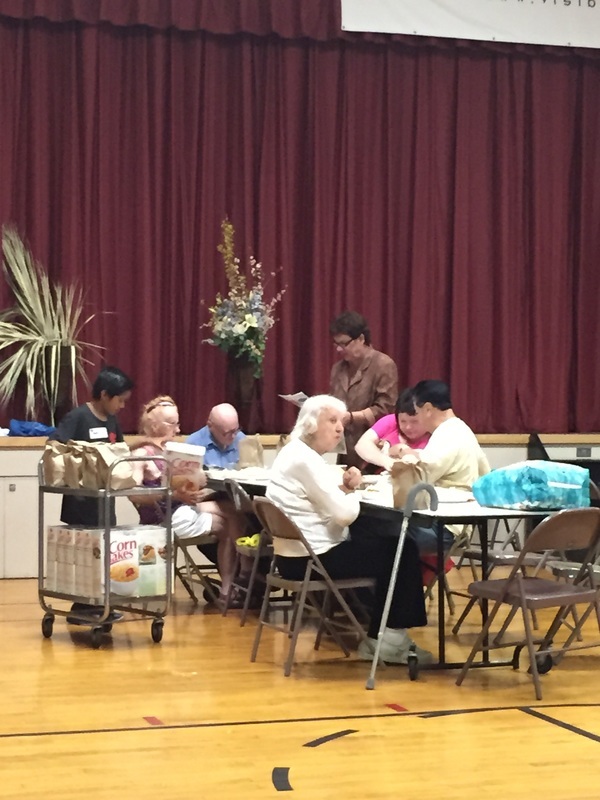 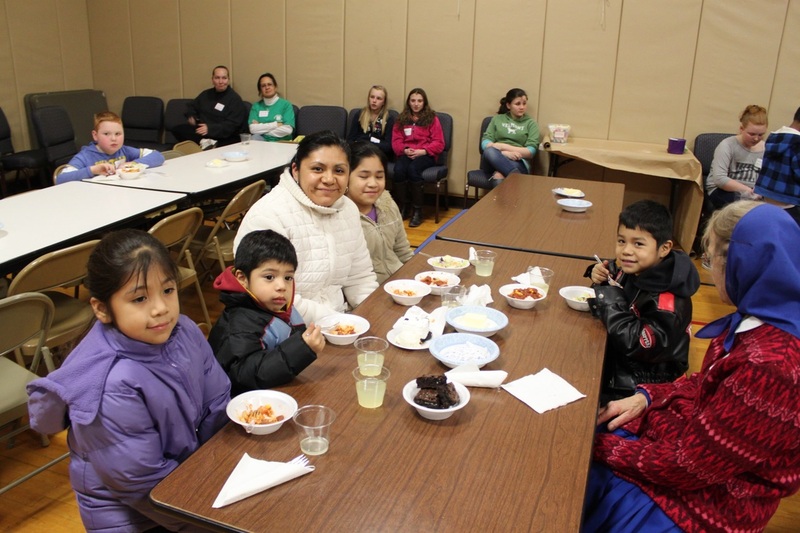 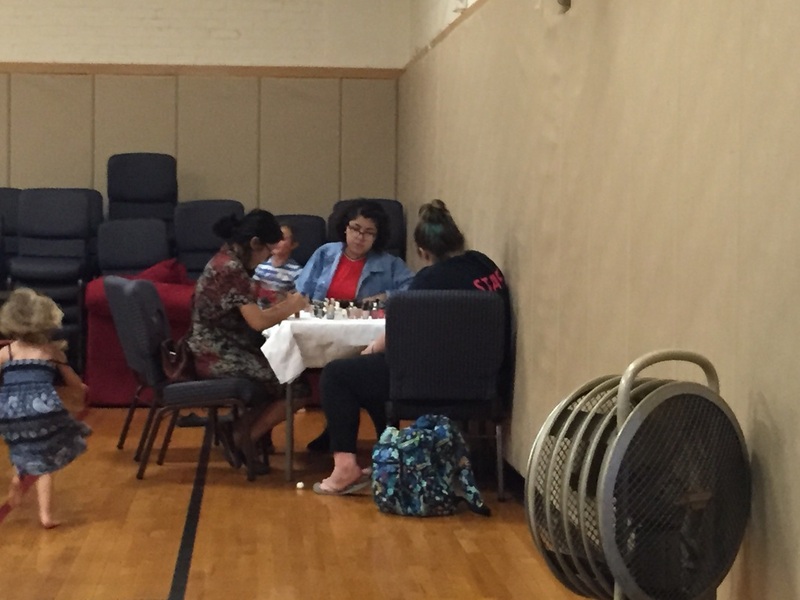 Guests enjoying fellowship with their neighbor. 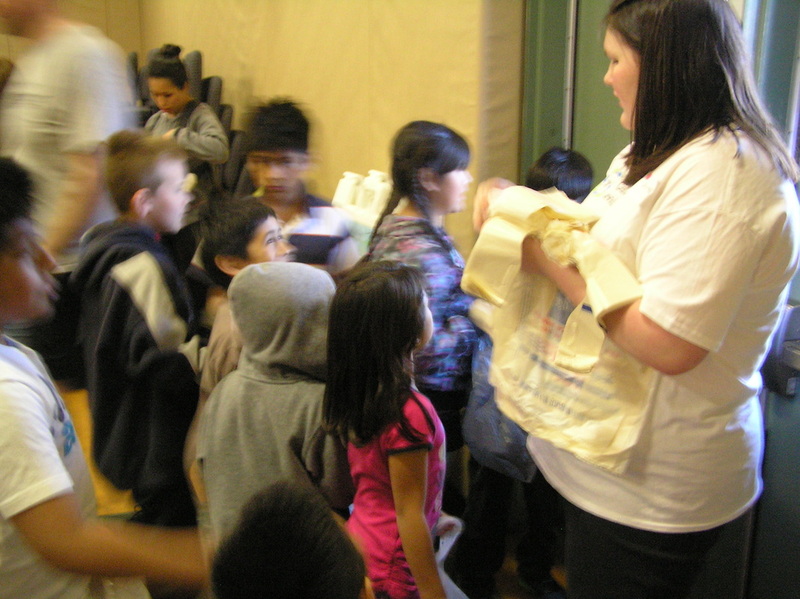 Victoria handing out bags for the Egg Hunt. 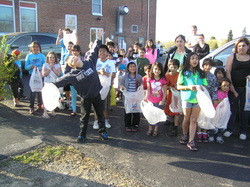 After Easter Egg Hunt participants. 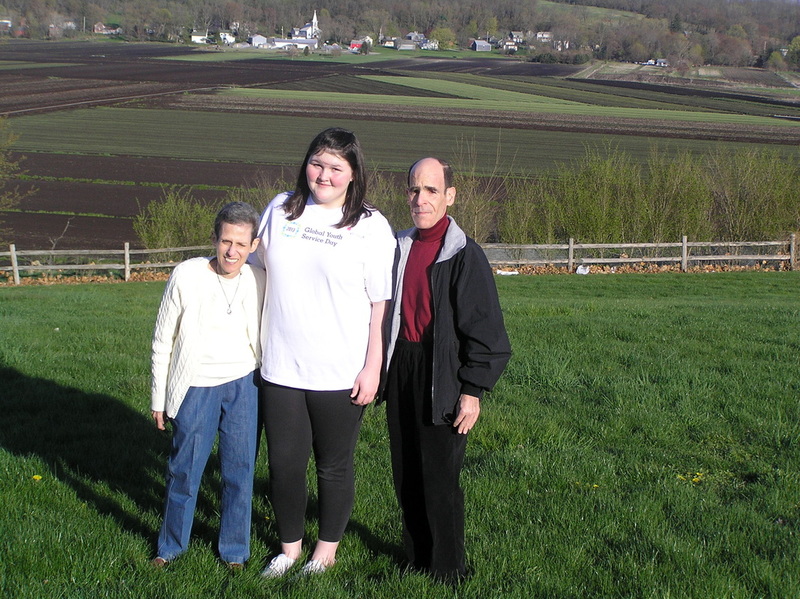 Victoria with Glenn P. and Susan D. Dickes. 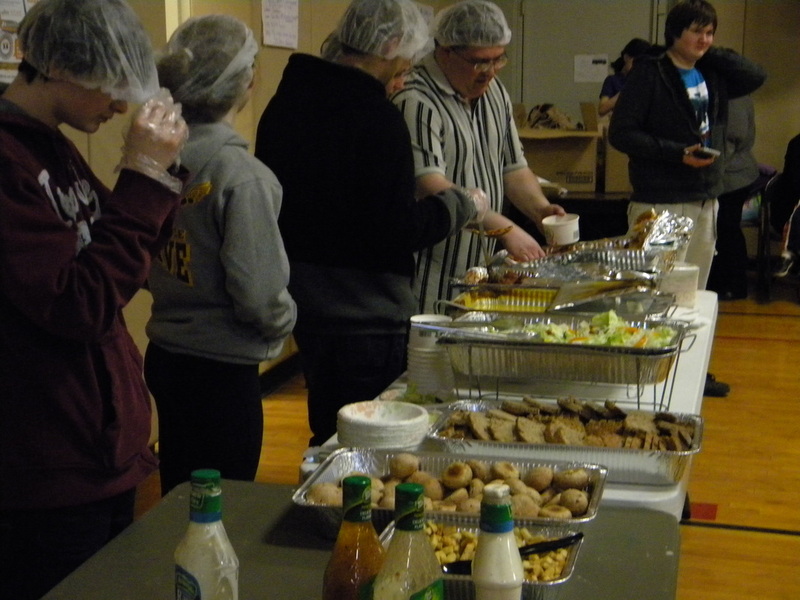 Chef David helping at the buffet line. 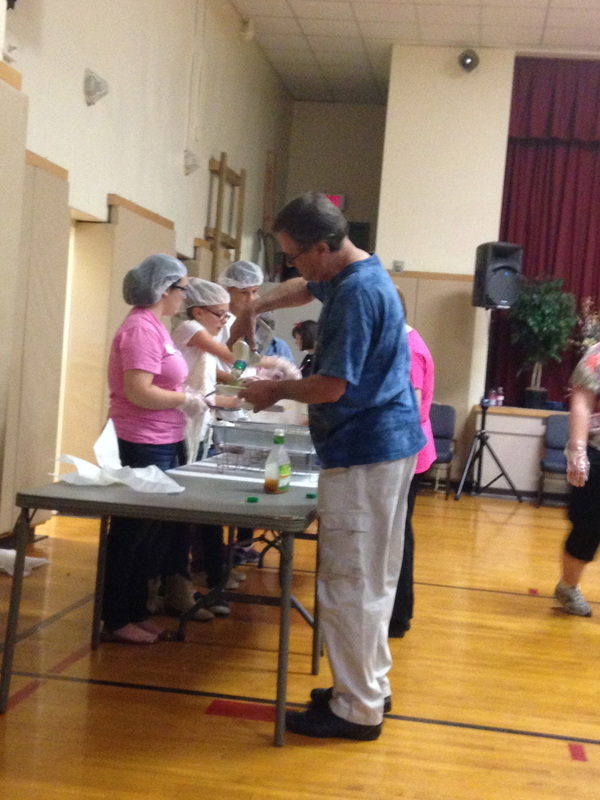 Chef David instructing the volunteers. 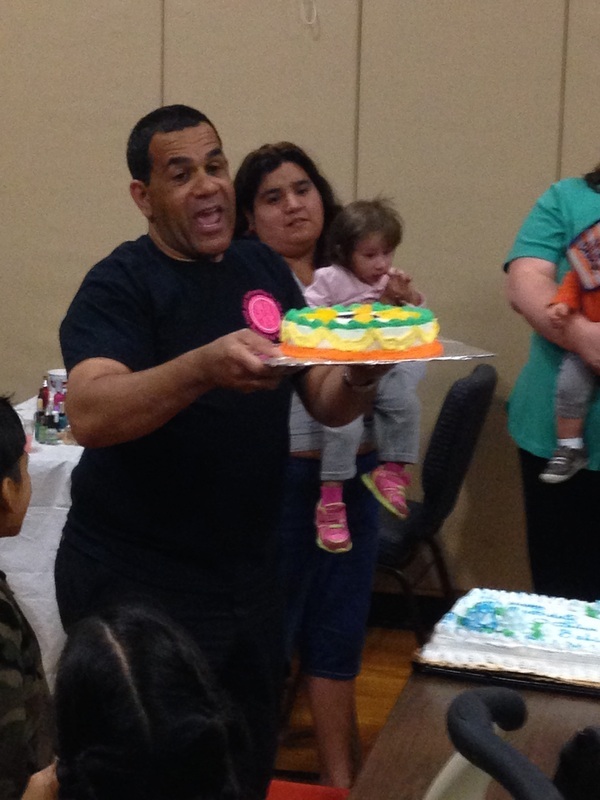 Chef David getting the birthday cake ready. 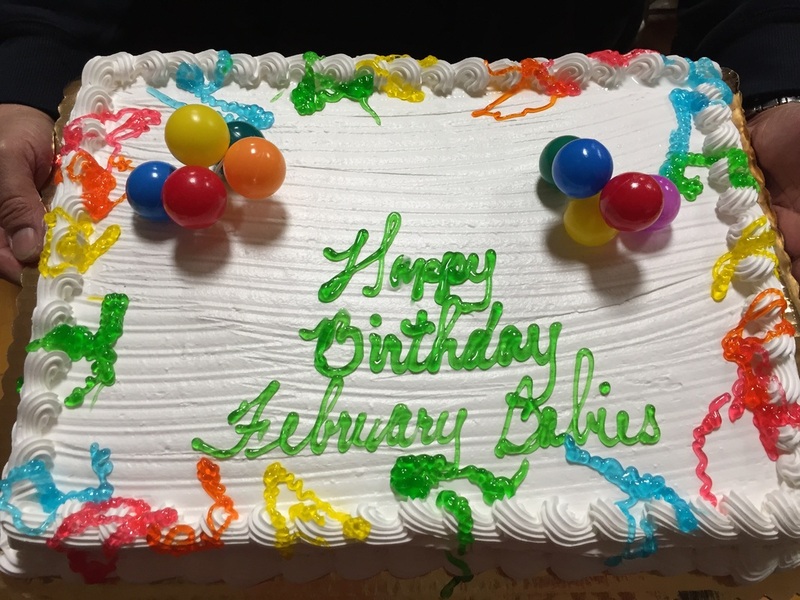 Celebrating our friends with March birthdays. 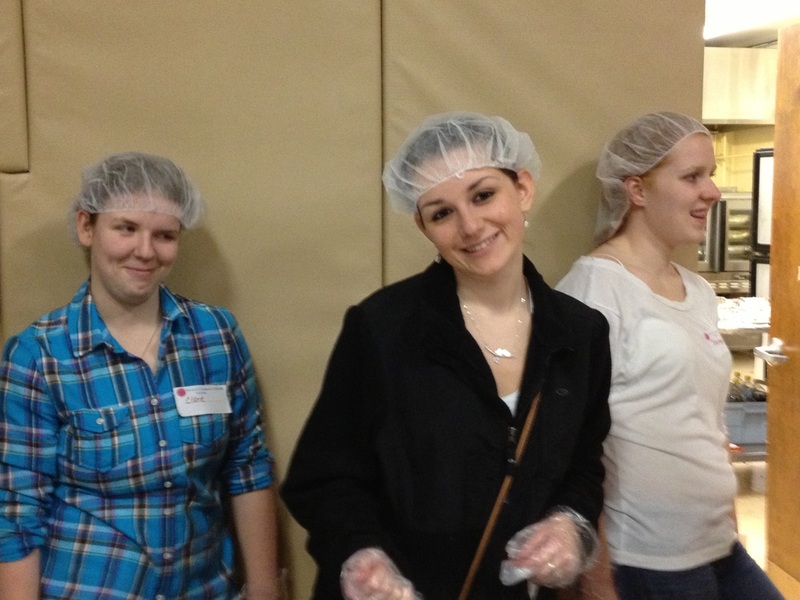 Volunteers from Warwick High School and the Future Business Leader of America Club. 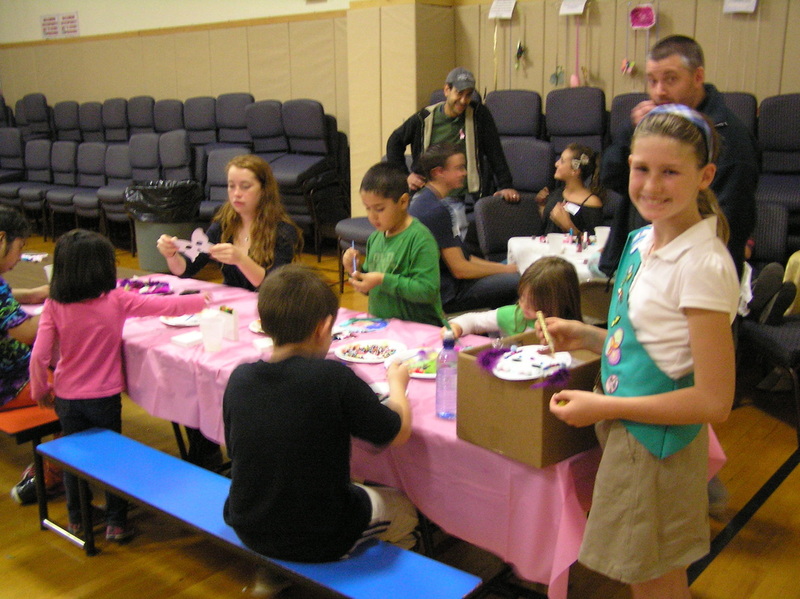 Emma ready to help with the craft. 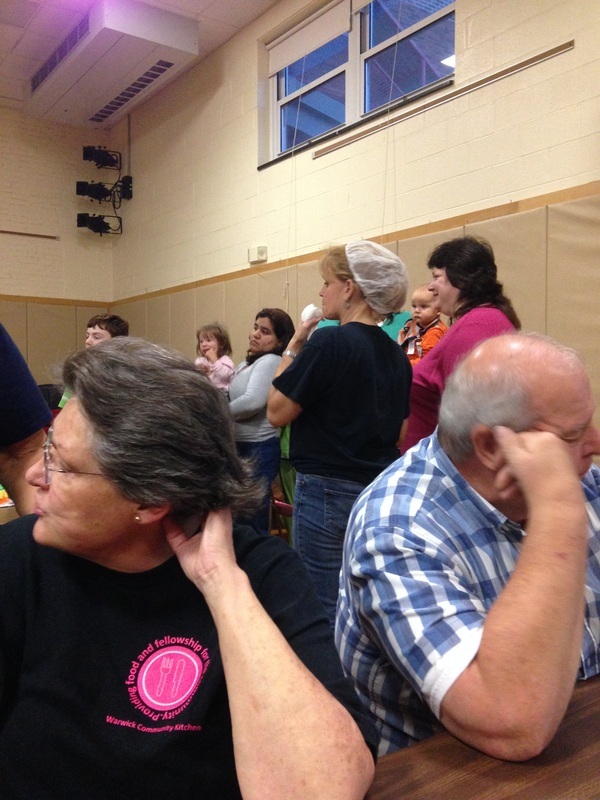 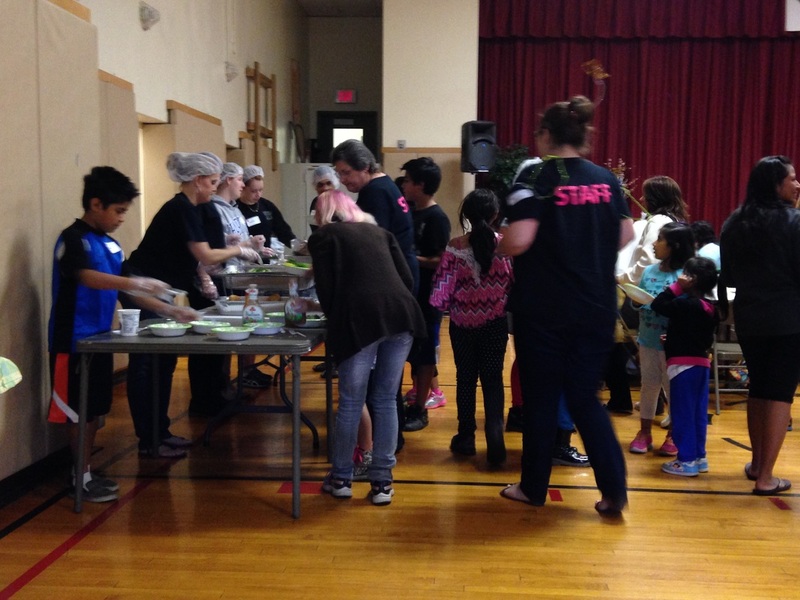 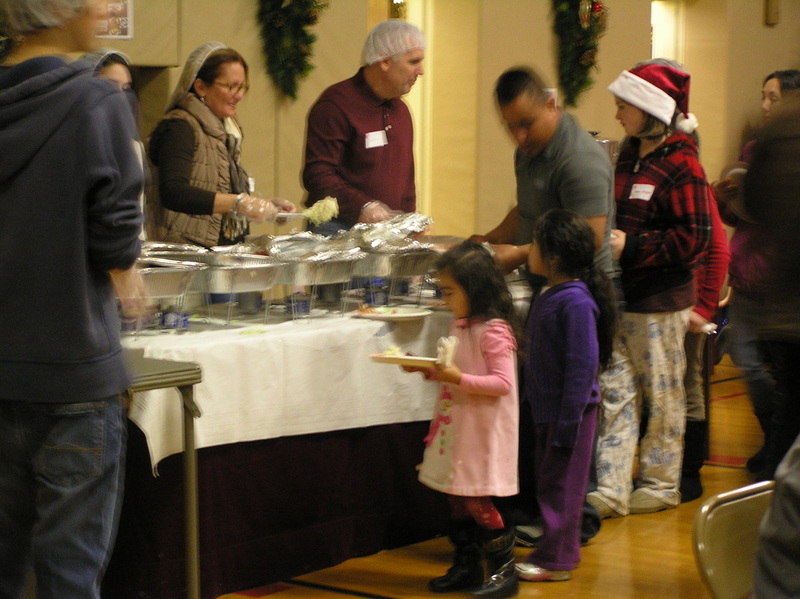 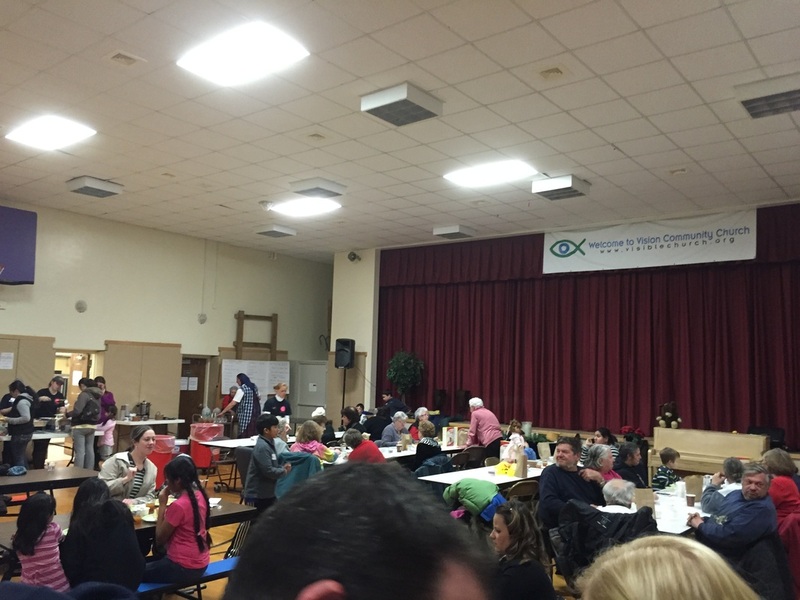 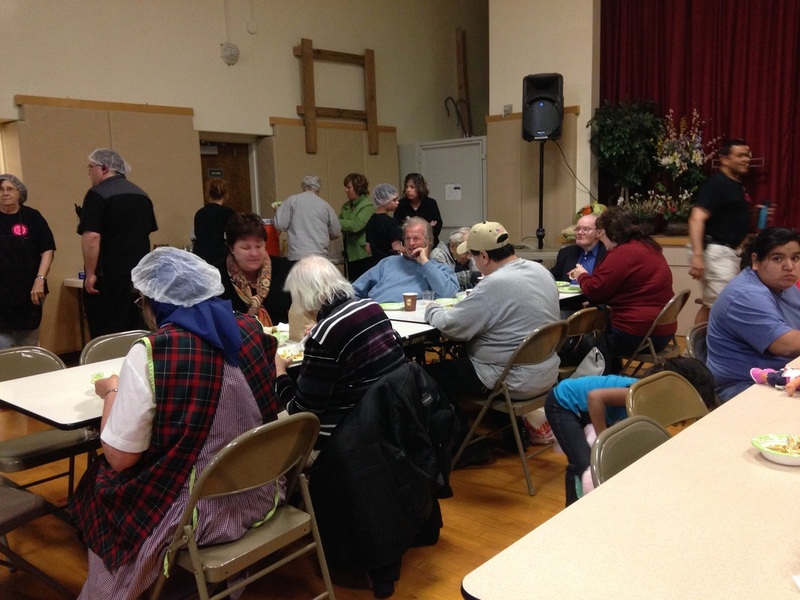 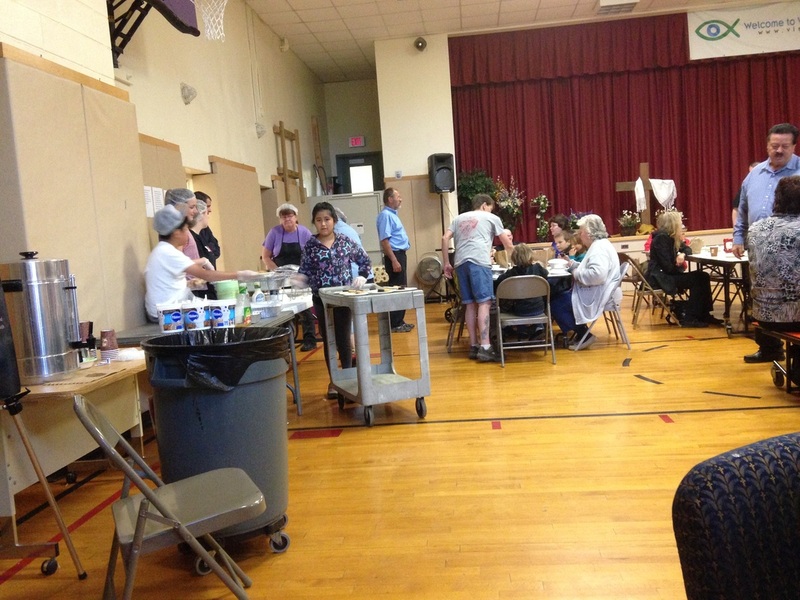 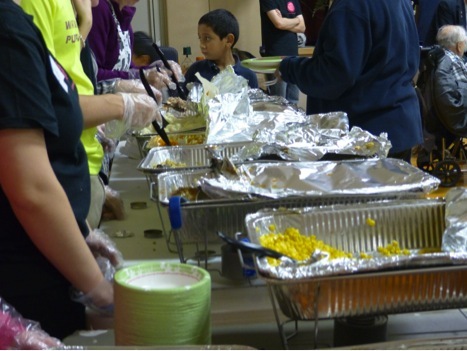 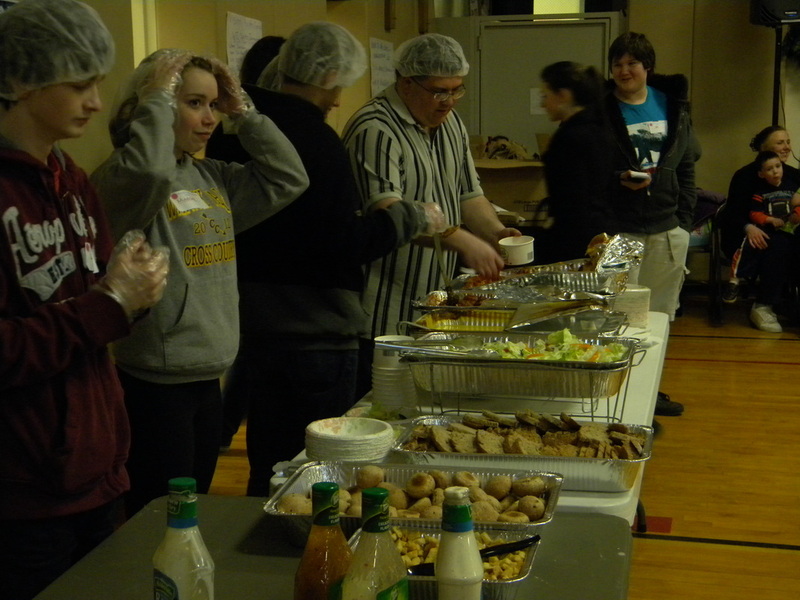 Volunteers getting ready to serve dinner. 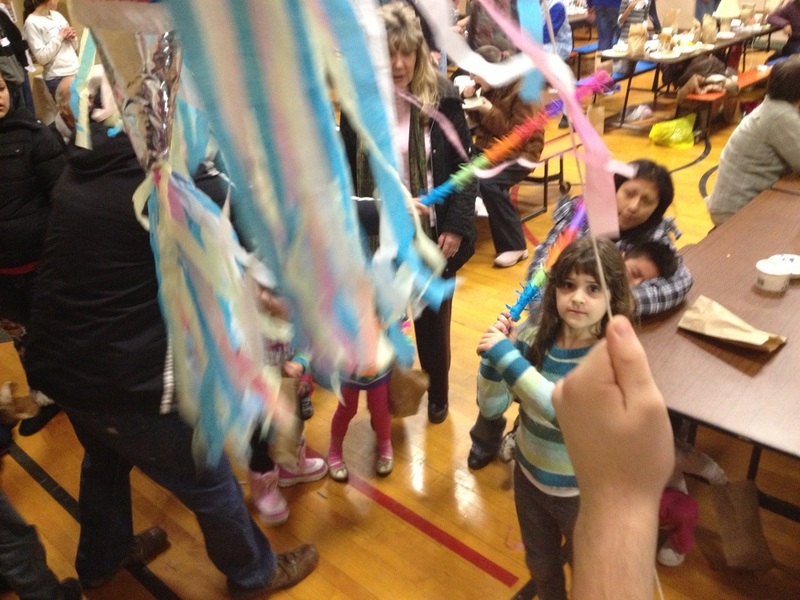 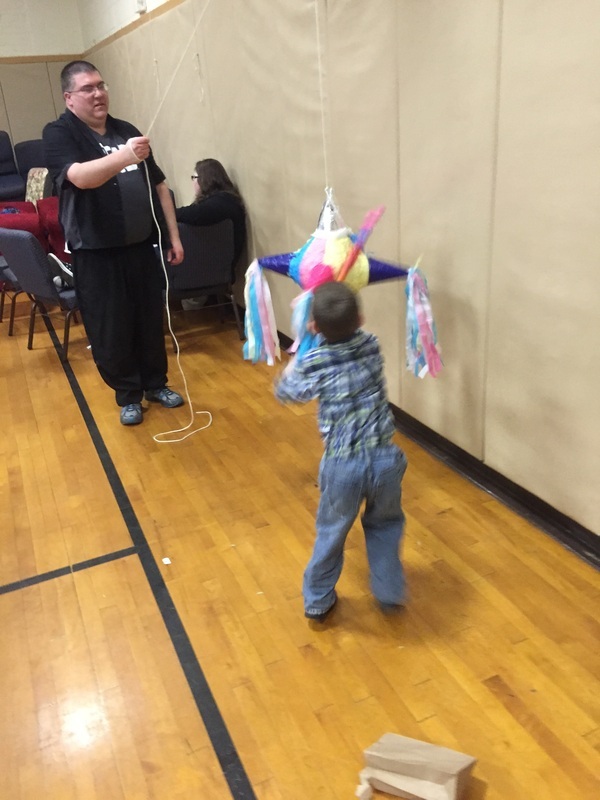 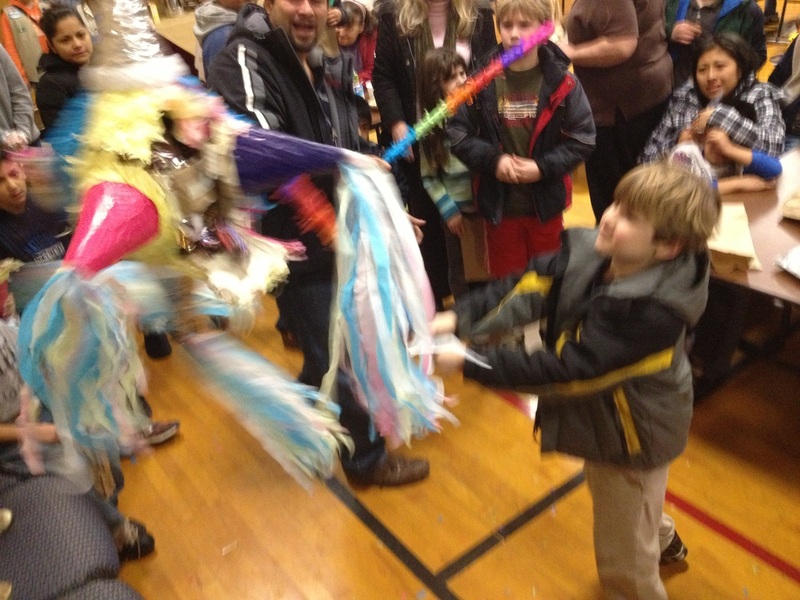 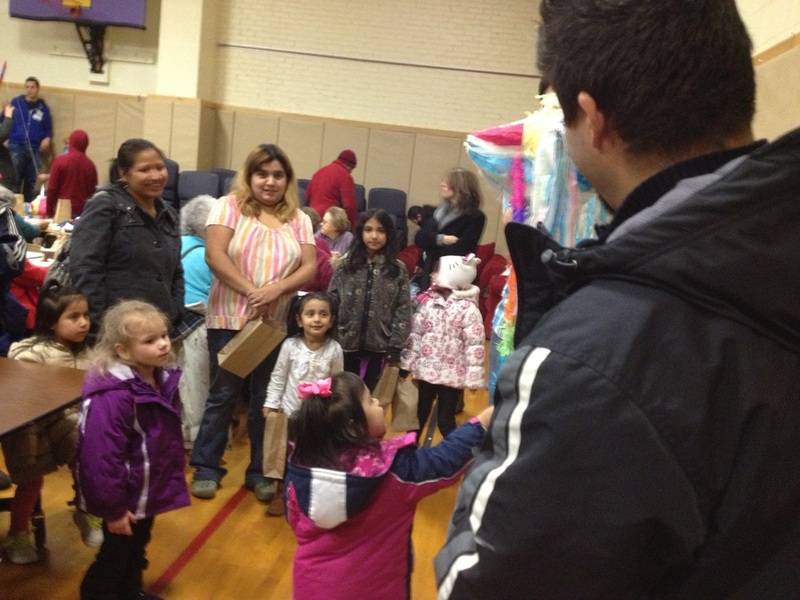 Dylan helping the younger children with the piniata. 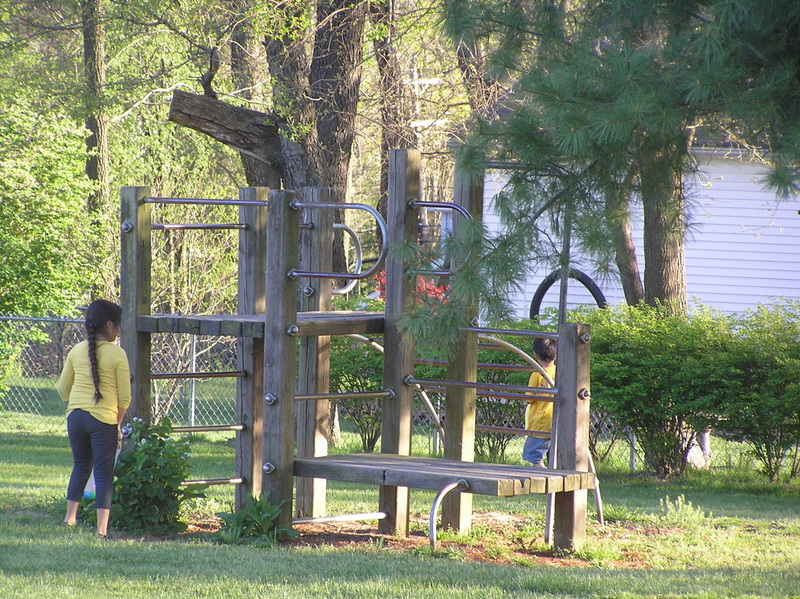 Waiting to hit it. 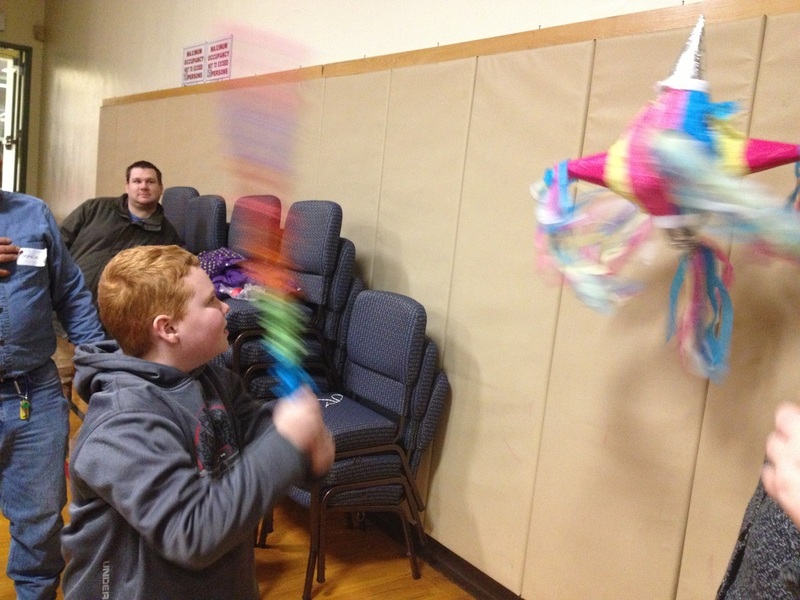 We used the piniatas to celebrate Three Kings Day. 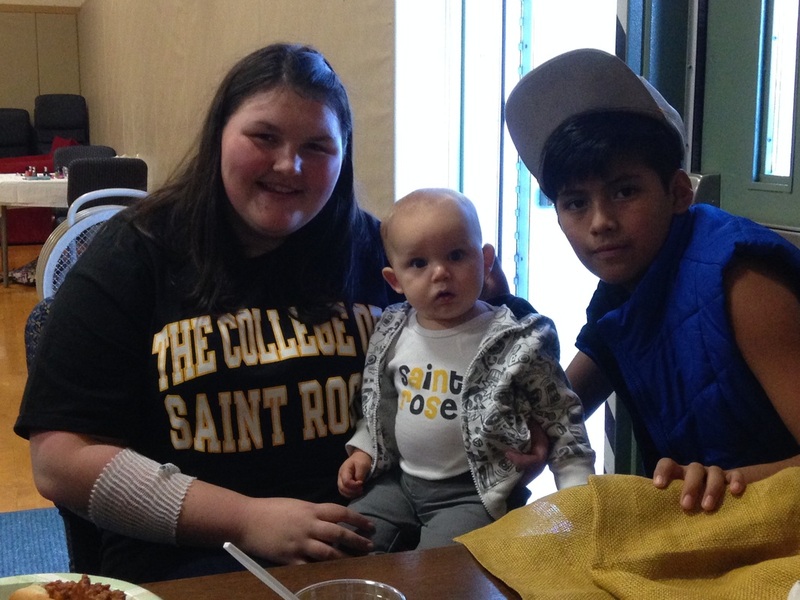 One of our youngest guests. 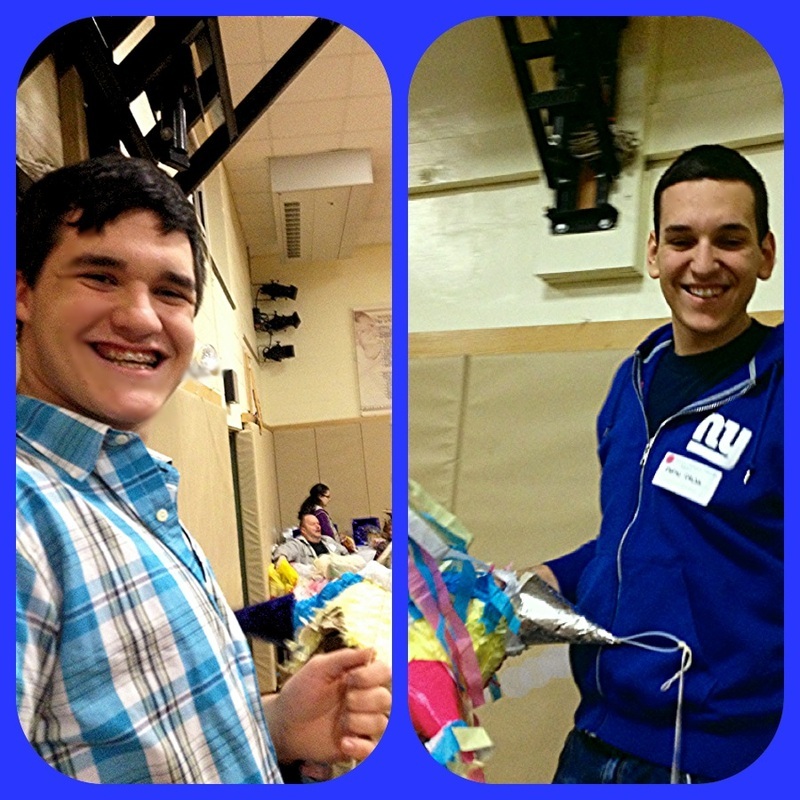 Dylan and Stefan - our pinata helpers. 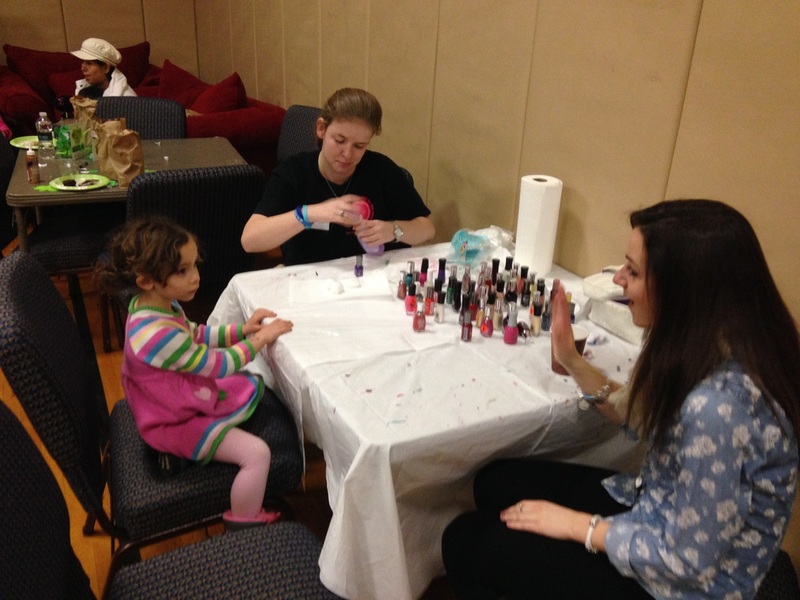 Rebecca painting the nails of one of our guests. 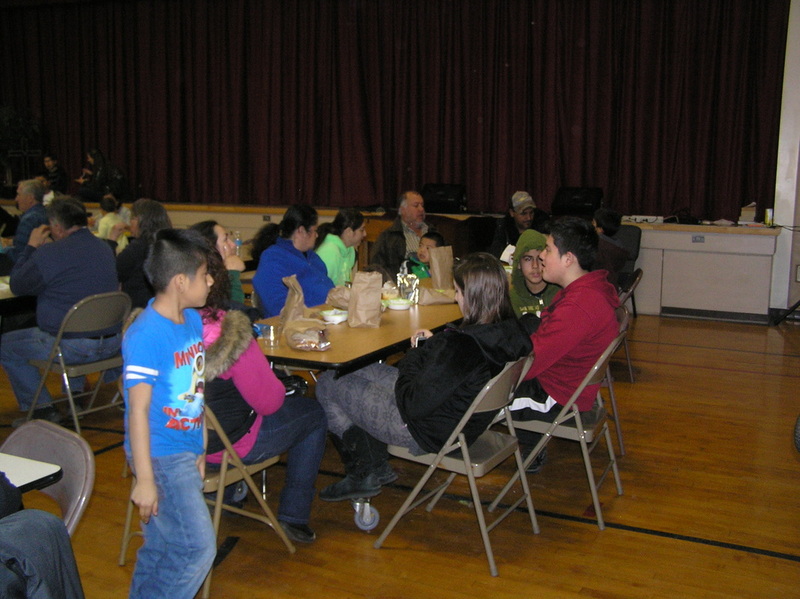 Guests that came for dinner. 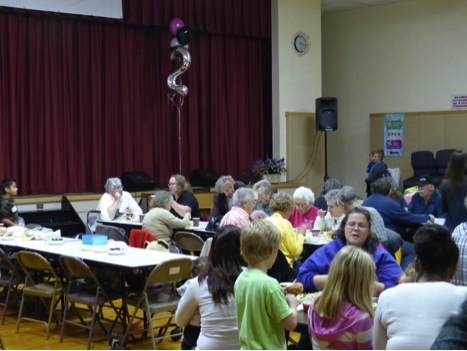 We served 313 guests at this dinner. 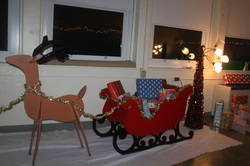 Santa came to deliver toys to the children. 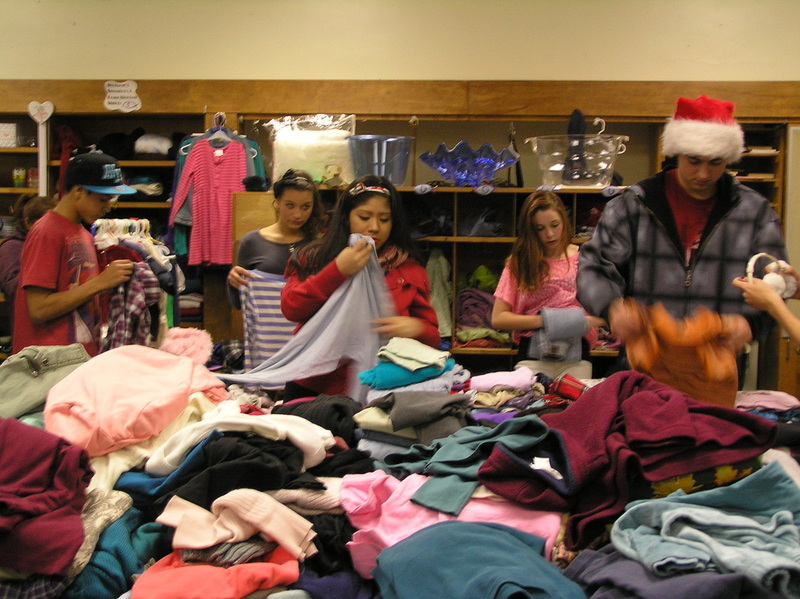 Shoppers at the Clothing Closet. 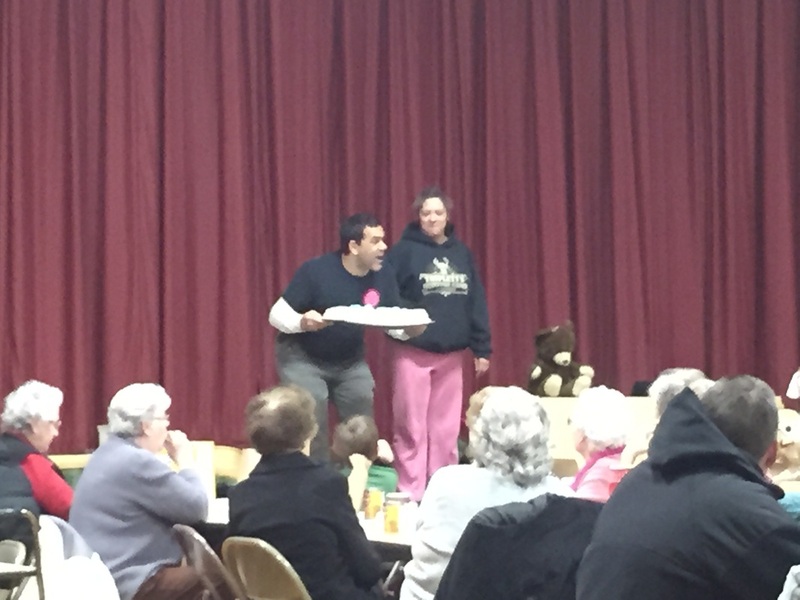 Volunteer Brenda serving dessert while others are still on line for dinner. 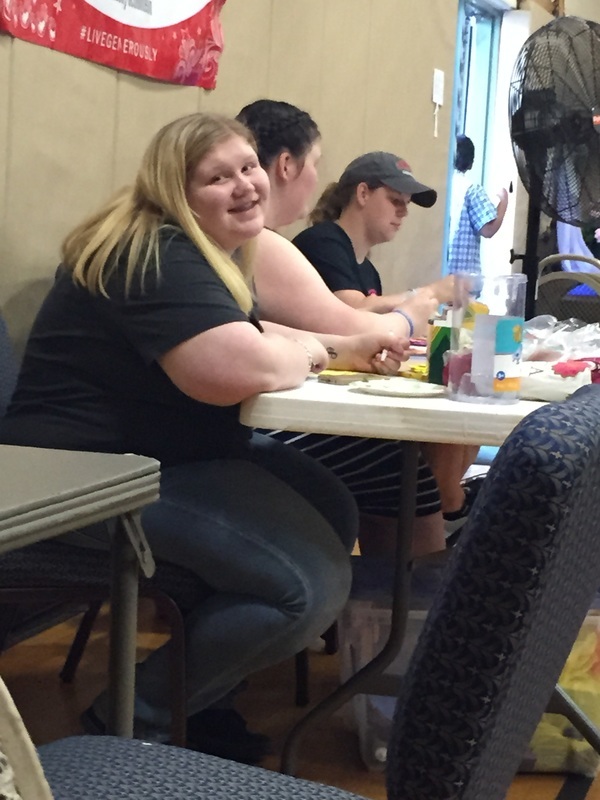 Morgan with rolls donated by Janet's Quality Baked Goods. 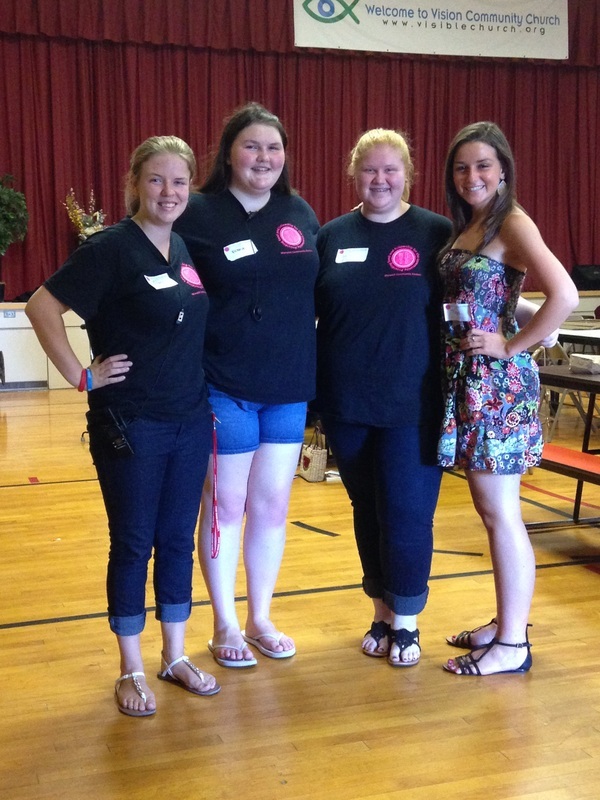 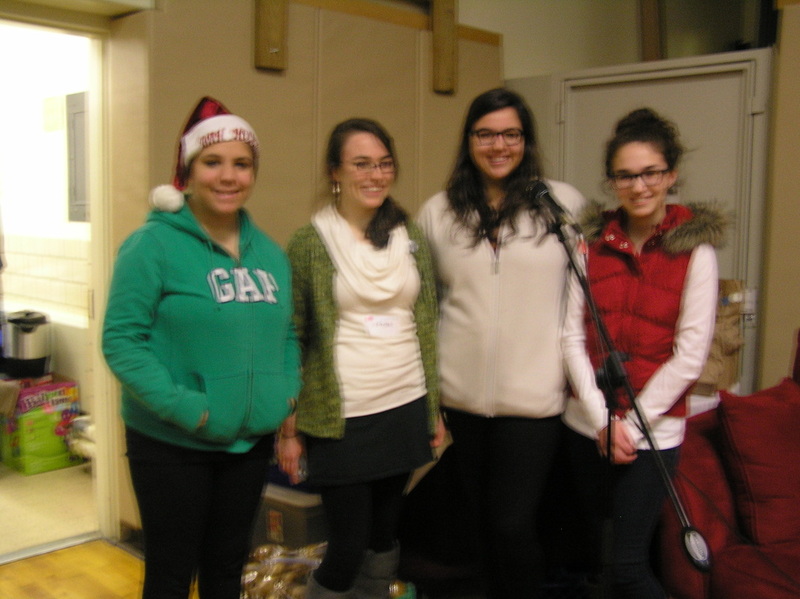 A few members of the Warwick High School Women's Choir that came to sing. 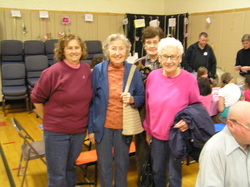 The Alumni class of 1948 who attended the first ever Kindergarten class at Pine Island Elementary School. 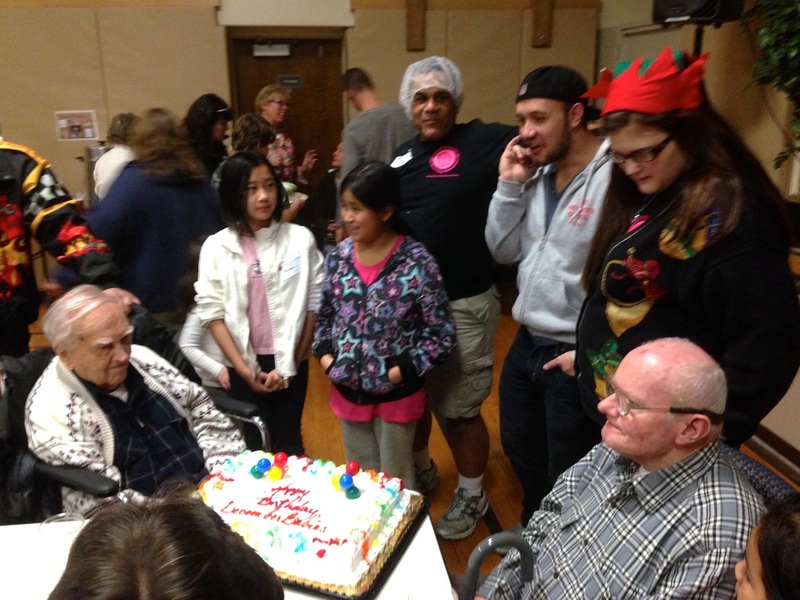 We celebrated Adam's 100th Birthday at the dinner. 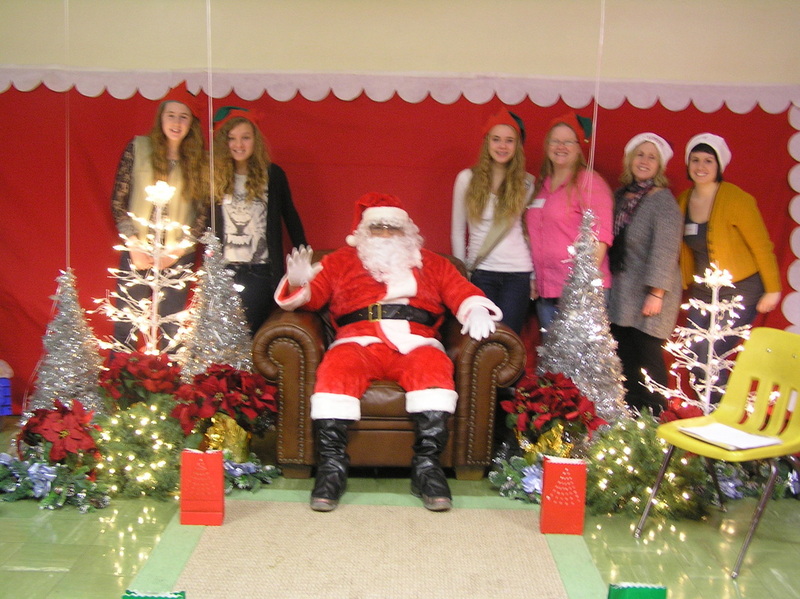 Santa and his volunteer Elves. 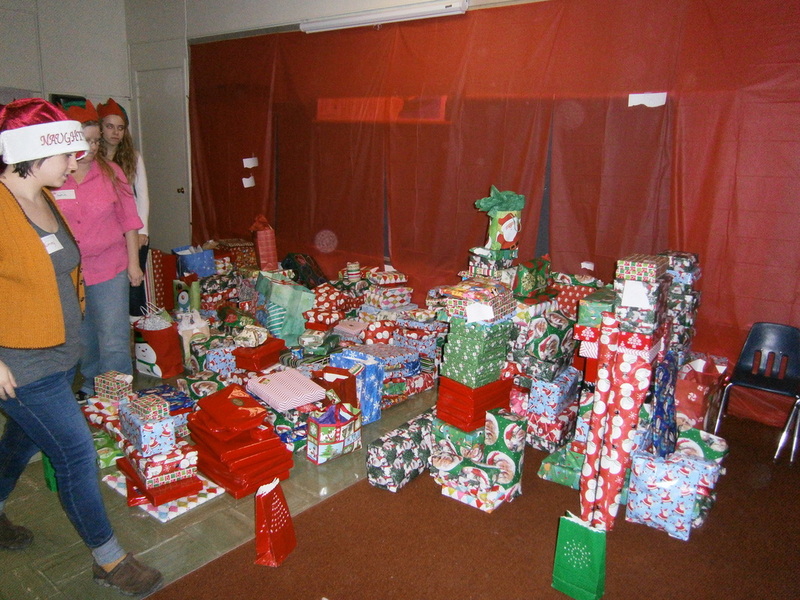 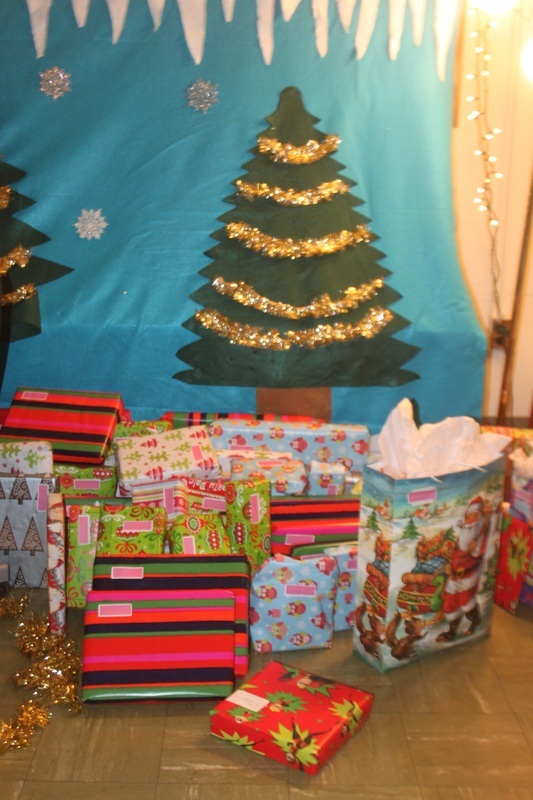 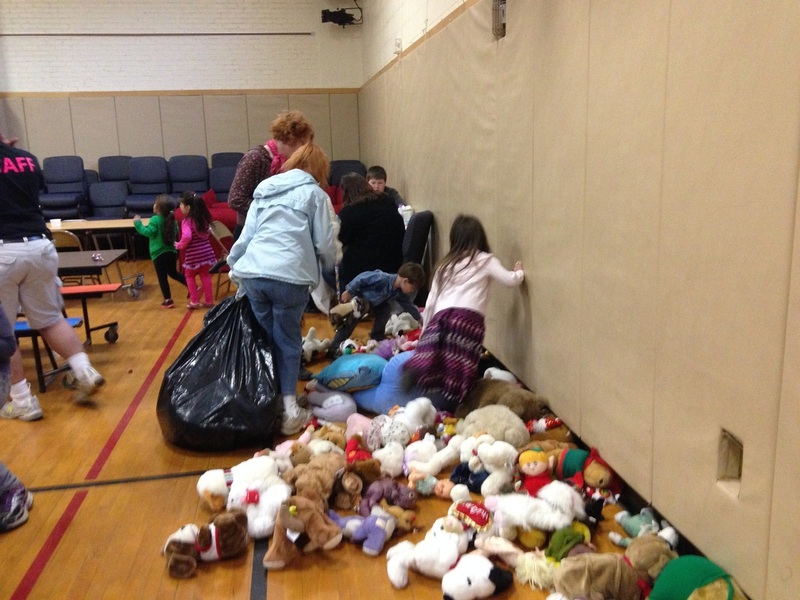 Many of the gifts that were donated for the children. 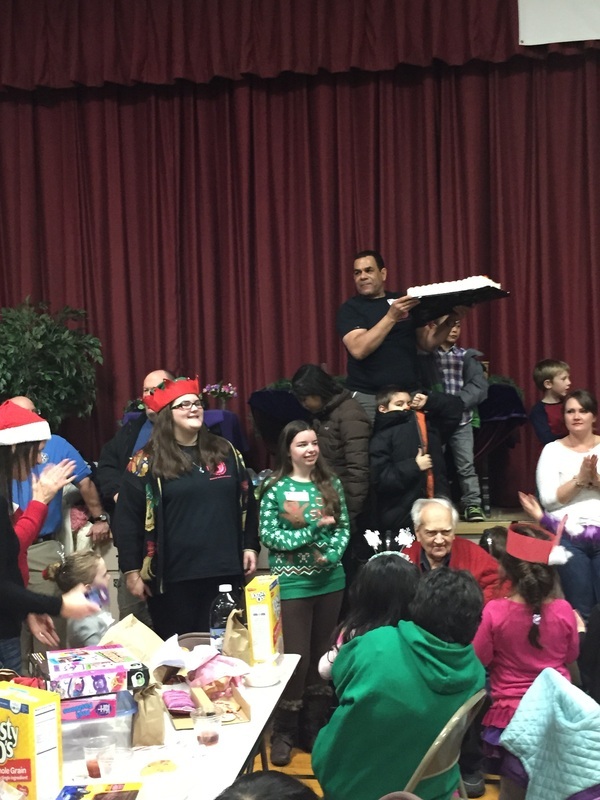 Girl of Troop 627 helping Pastor Lynne and Enrique with the Christmas Service. 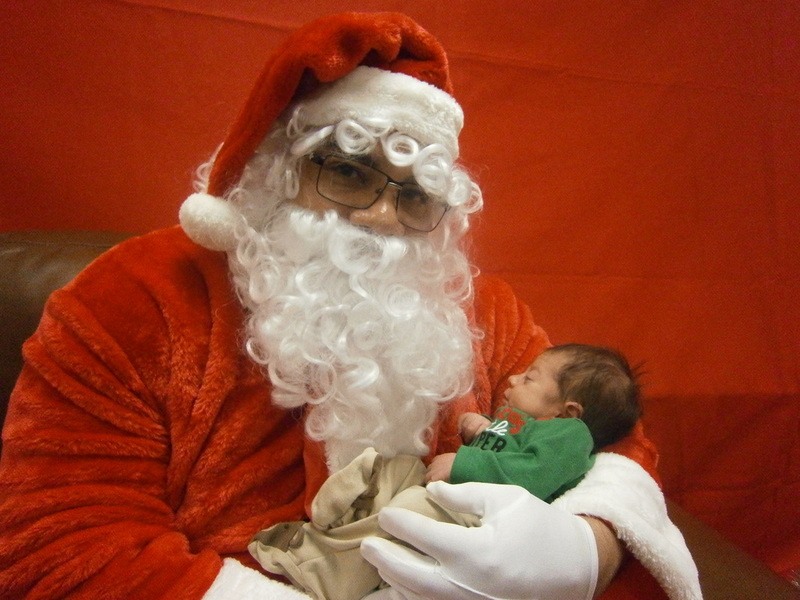 Santa and 10 day old Aidan. 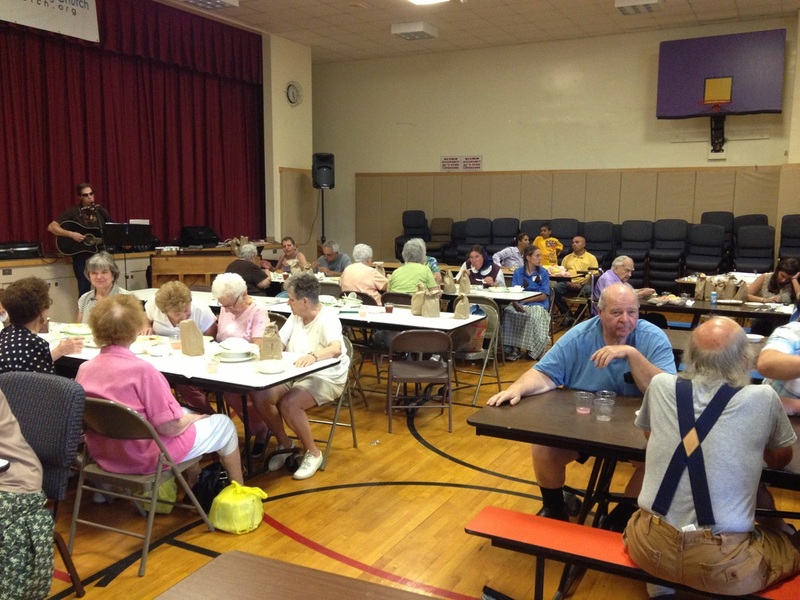 Our Senior friends that came for dinner. 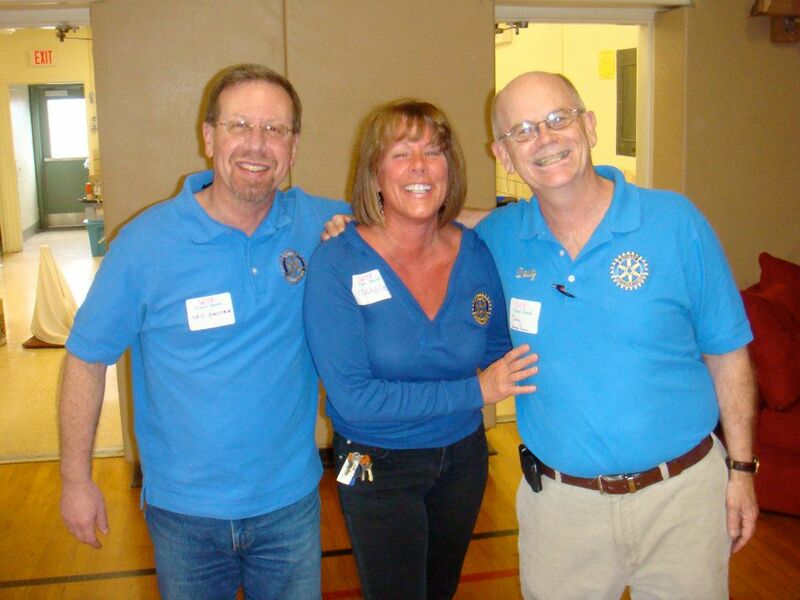 Mark, Victoria and Davie thanking everyone for a successful first year or WCK. 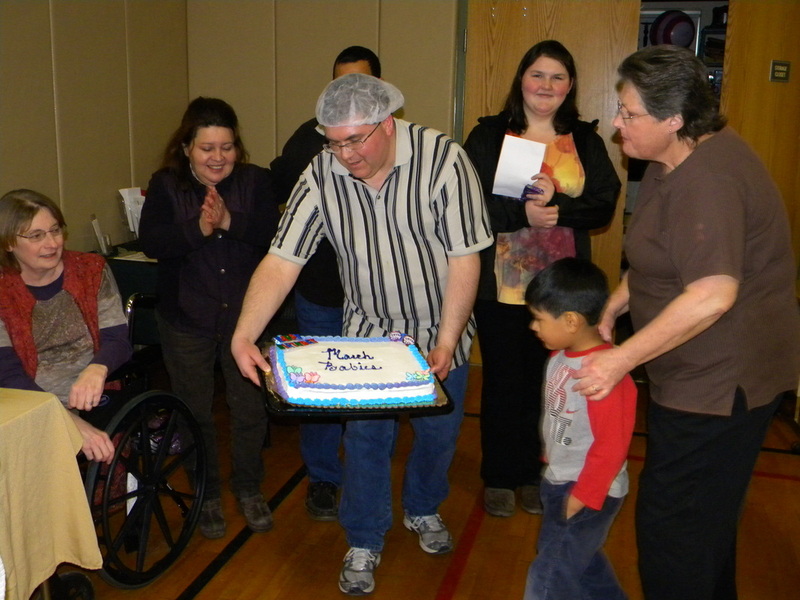 Dave is holding our celebration cake. 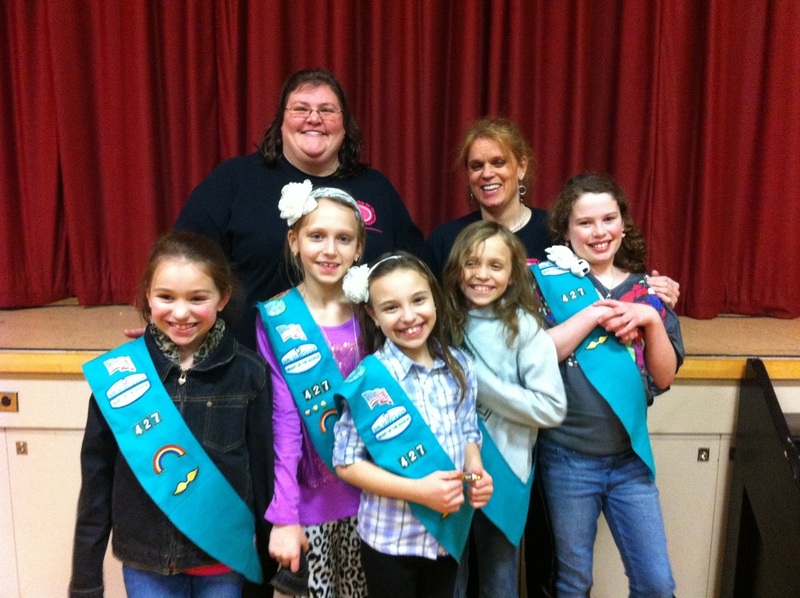 Carrie meeting with the members of Girl Scout Troop 627. 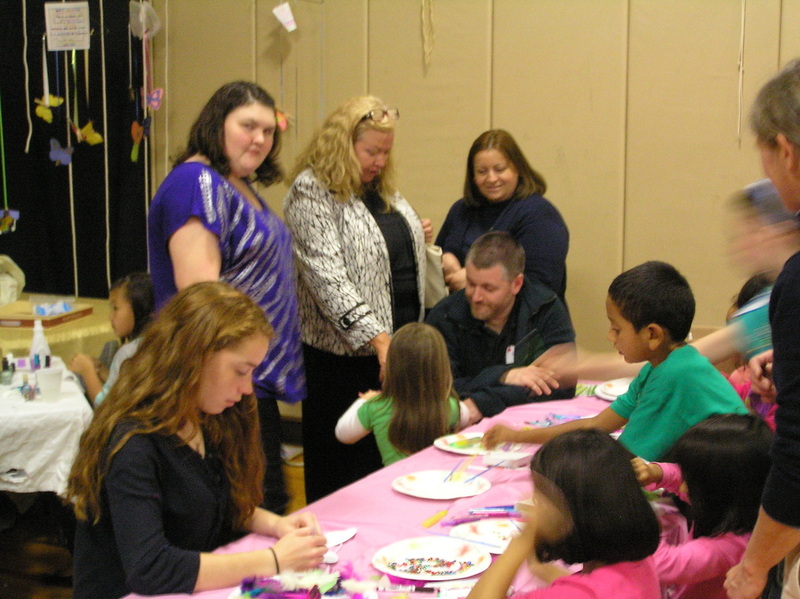 Barrett working with children who are decorating cookies. 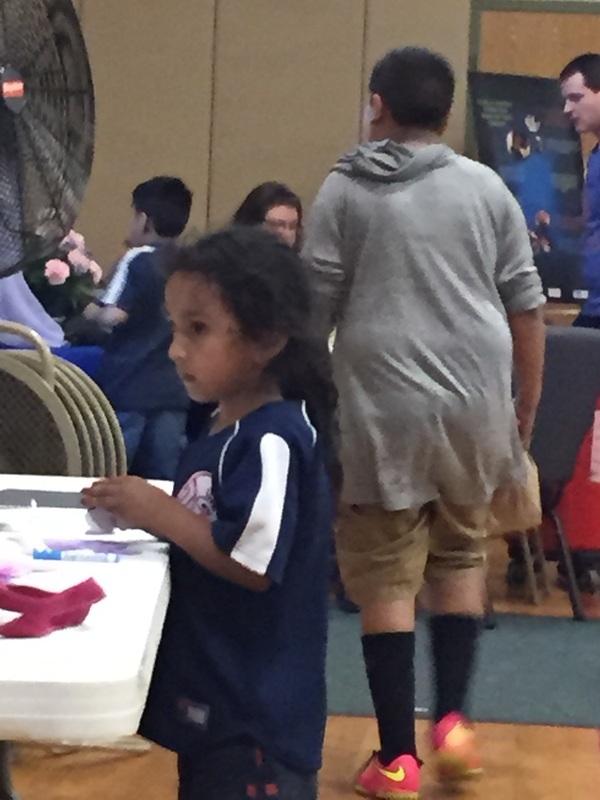 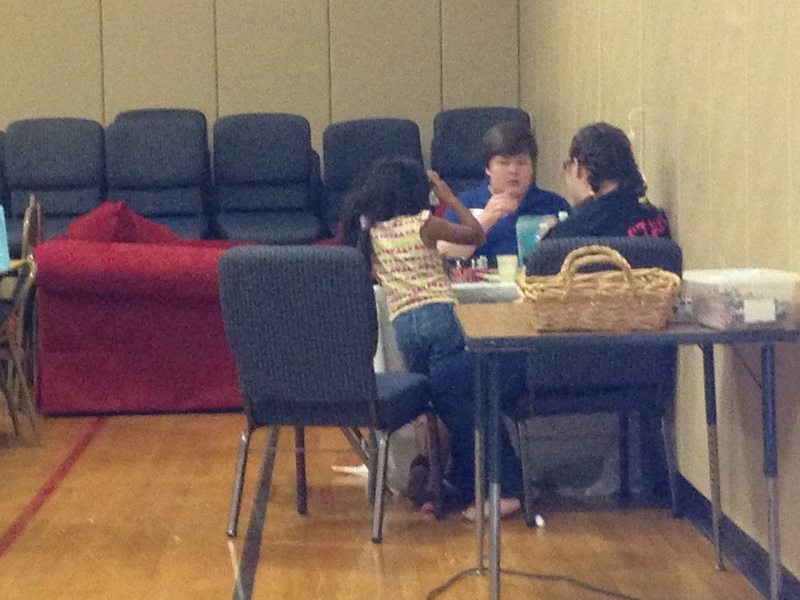 Our youngest volunteer doing temporary tattoos. 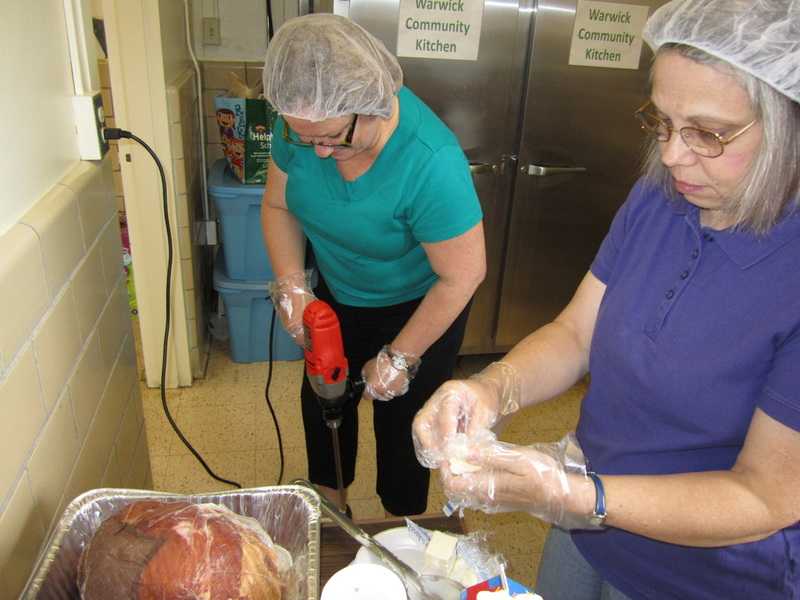 Donna and Debbie prepping onions. 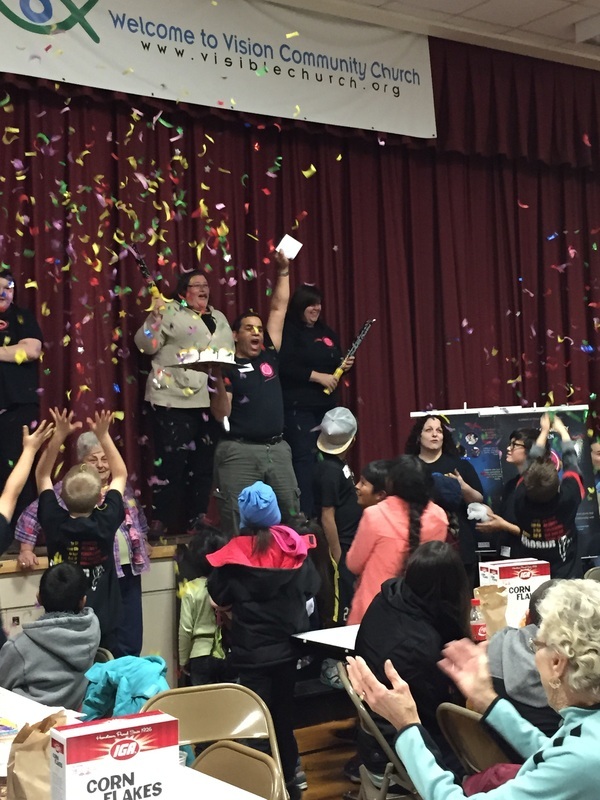 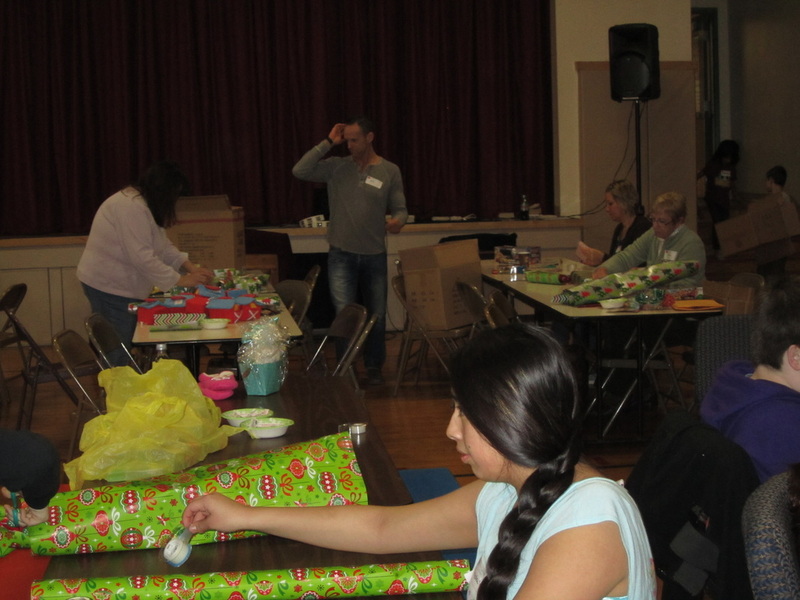 Our friends from Occupations come every month to help by wrapping the silverware. 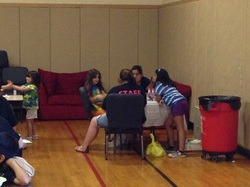 Barret working with the children who are decorating masks. 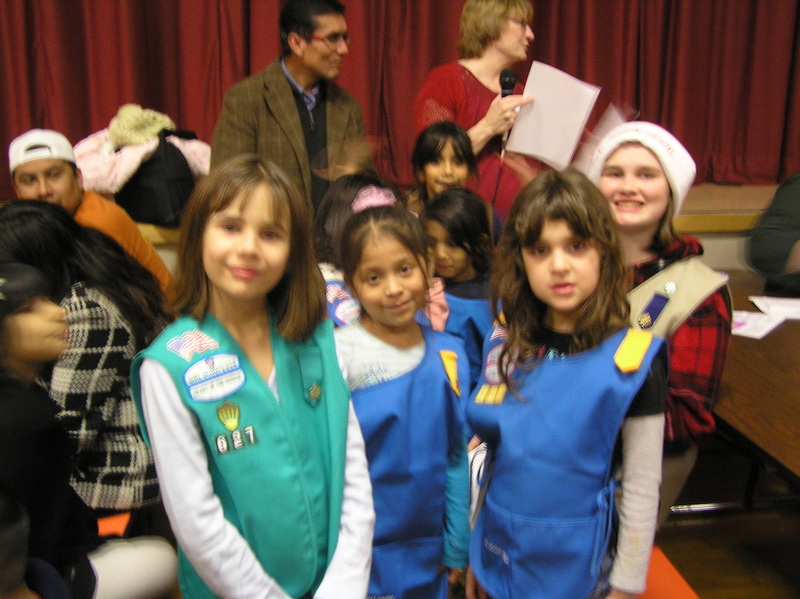 Victoria with Mary Benes and Hada Reed from Girl Scouts Heart of the Hudson. 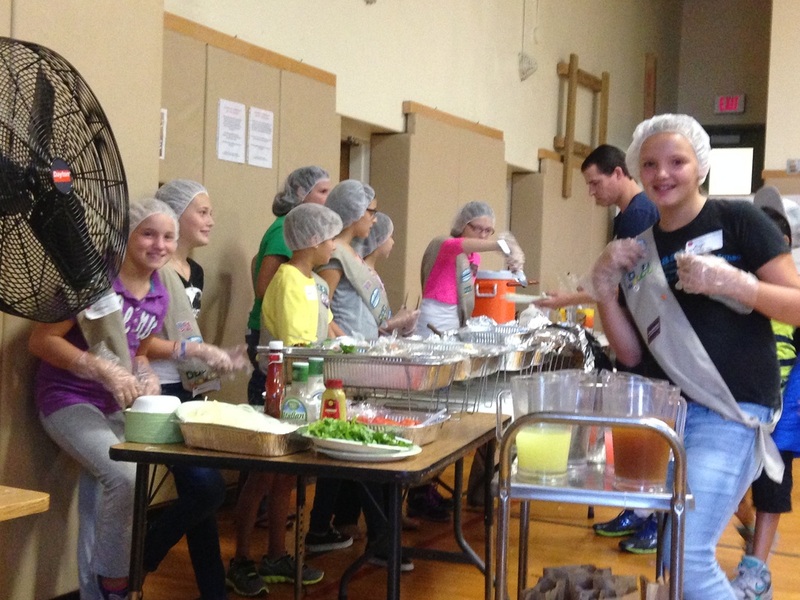 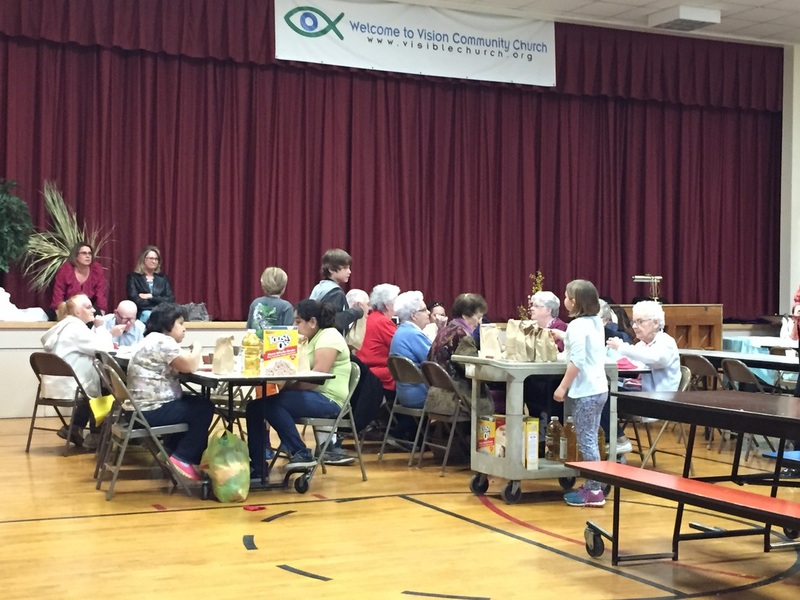 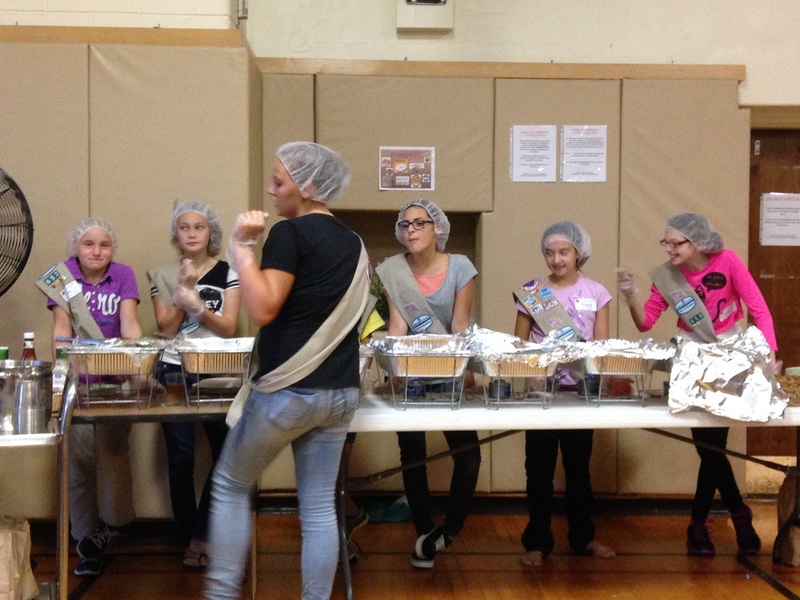 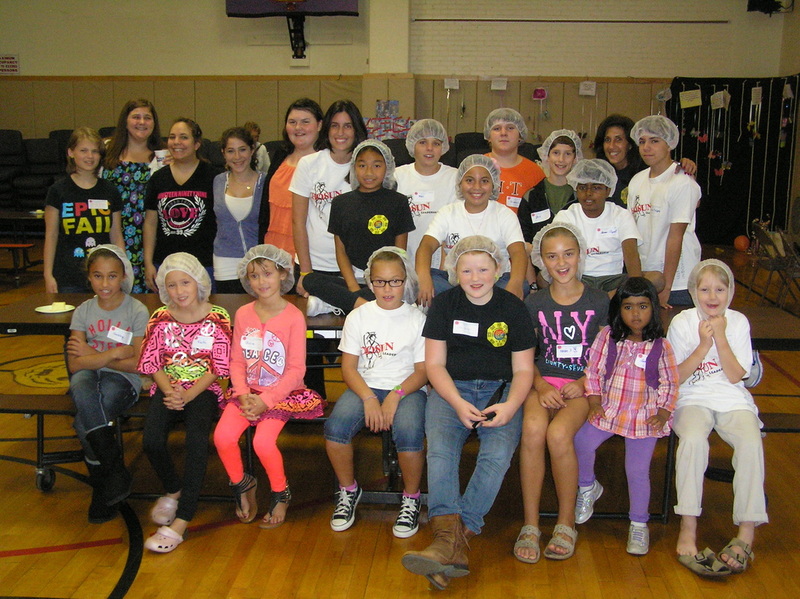 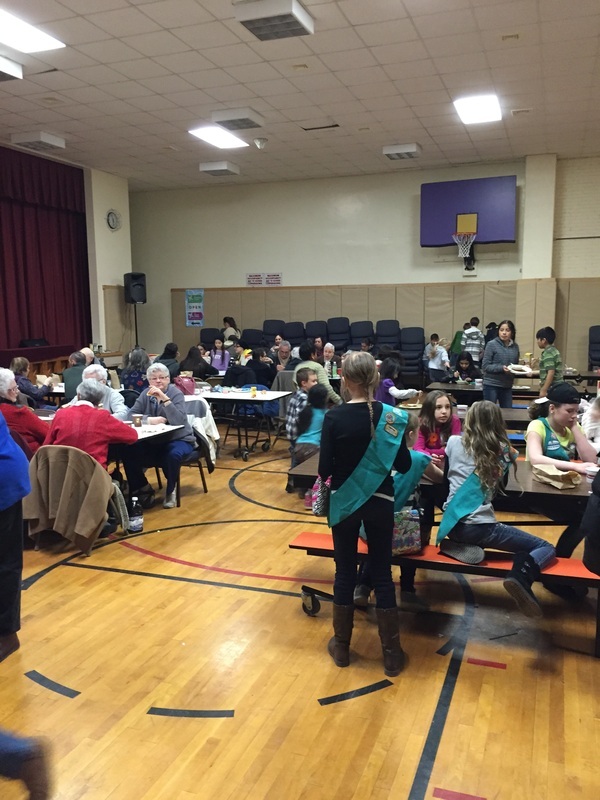 Girl Scout Troop 571 from Florida, NY donated the lunches for the dinner. 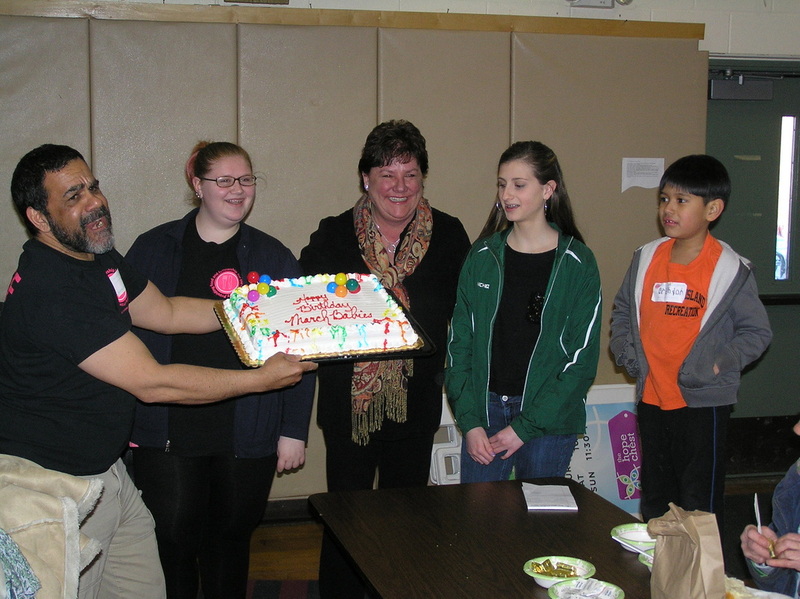 Members of Chosun Taekwondo Leadership Academy. 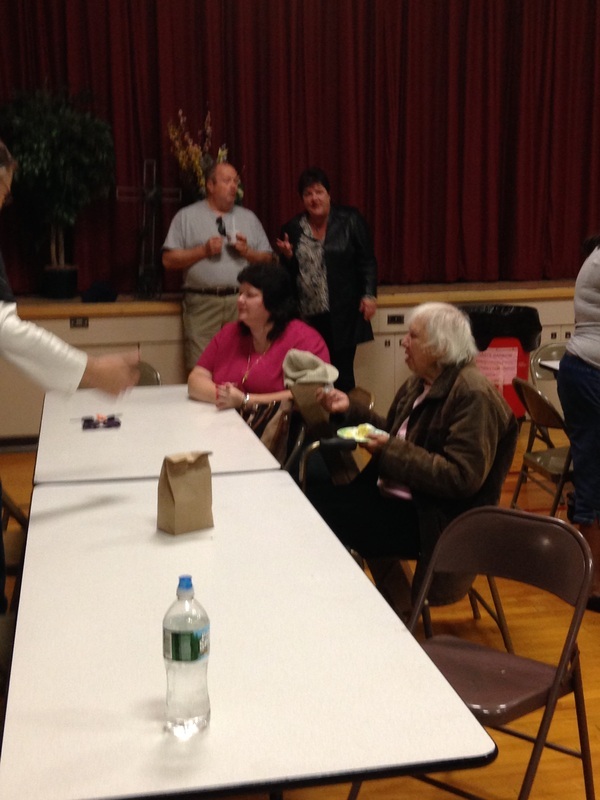 Mark visiting with some of our guests. 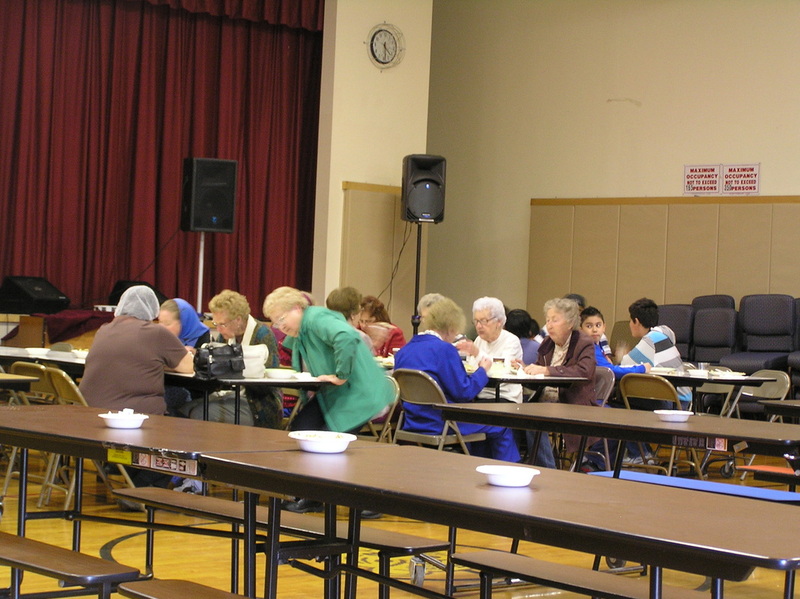 Guests eating and getting served dinner. 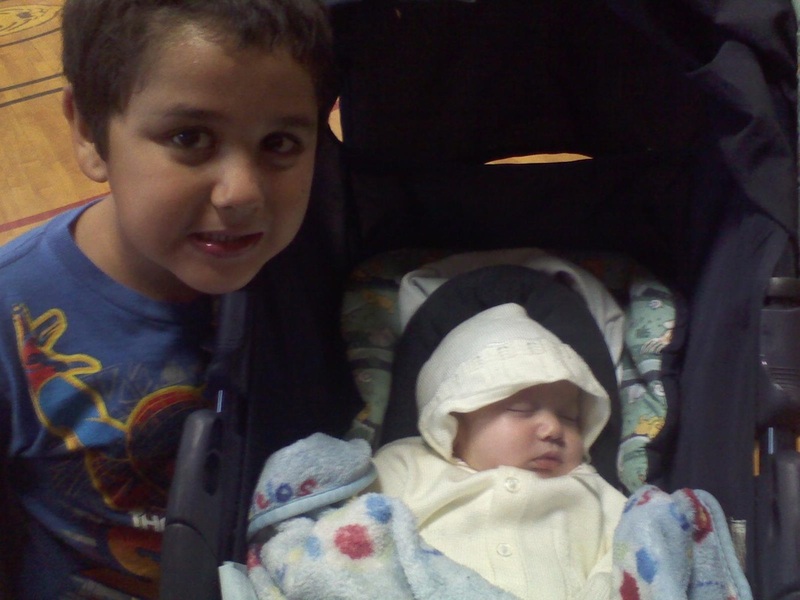 Our youngest guest (7 weeks) and his big brother. 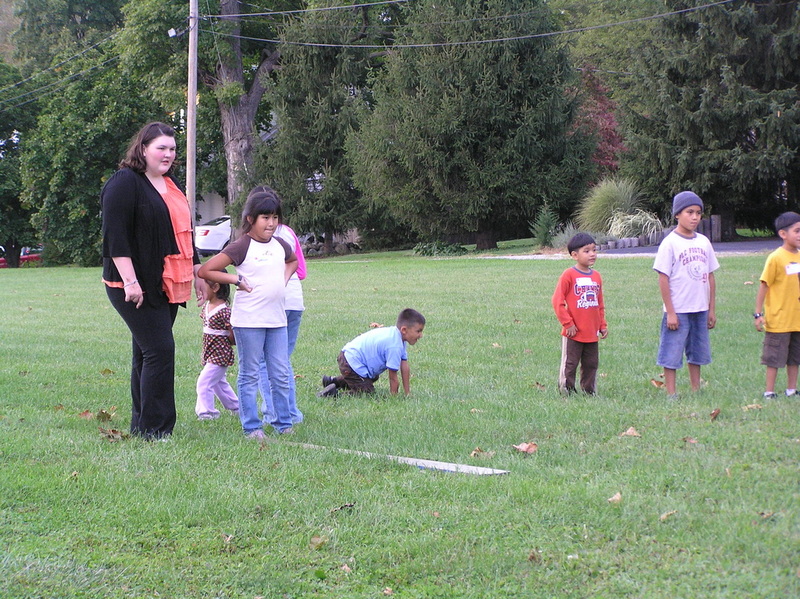 Victoria and the kids waiting for their turn on the obstacle course. 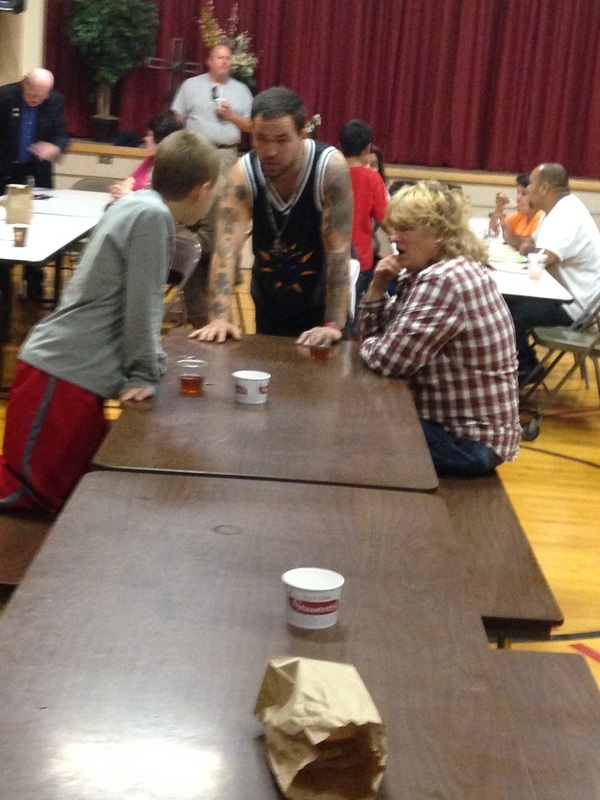 Ian watching one of our kids taking his turn. 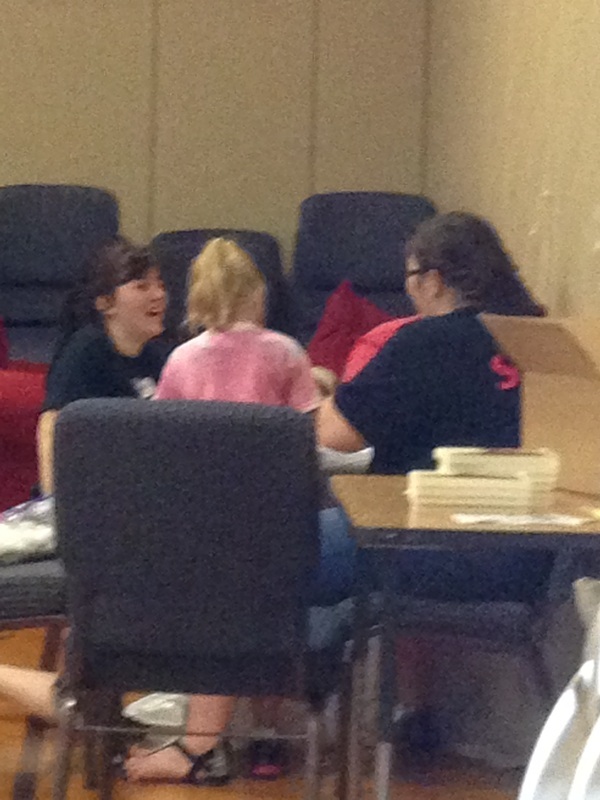 Victoria and Barrett helping one of the younger ones. 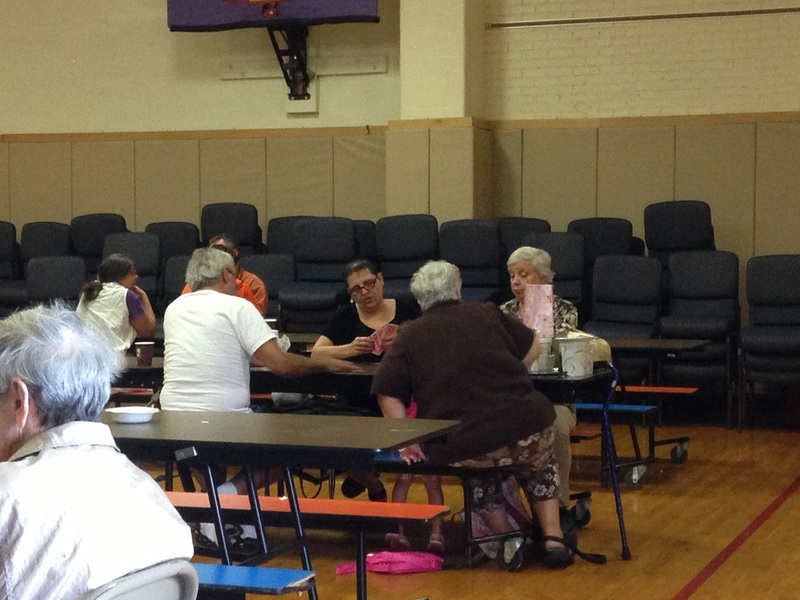 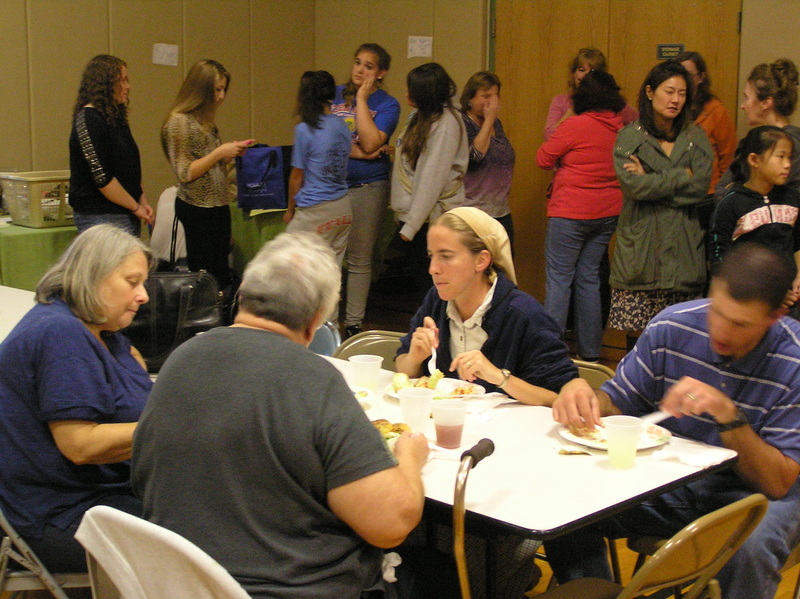 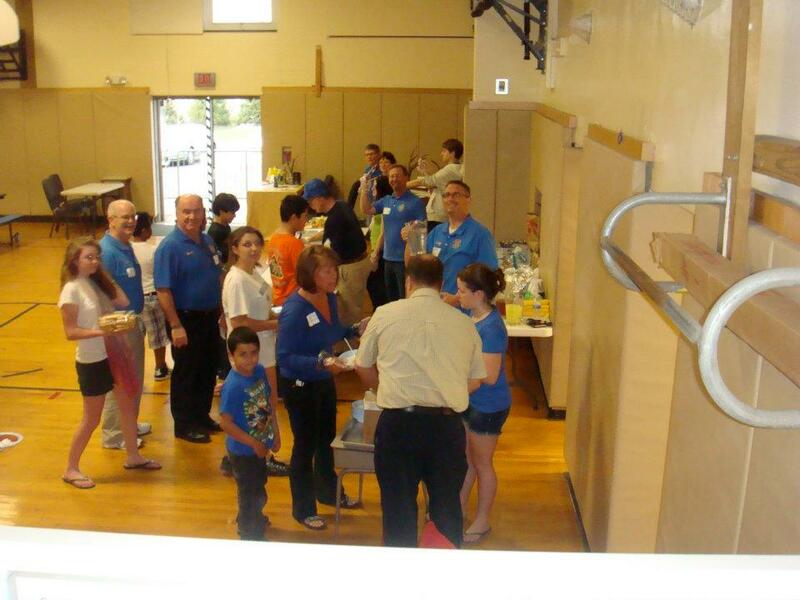 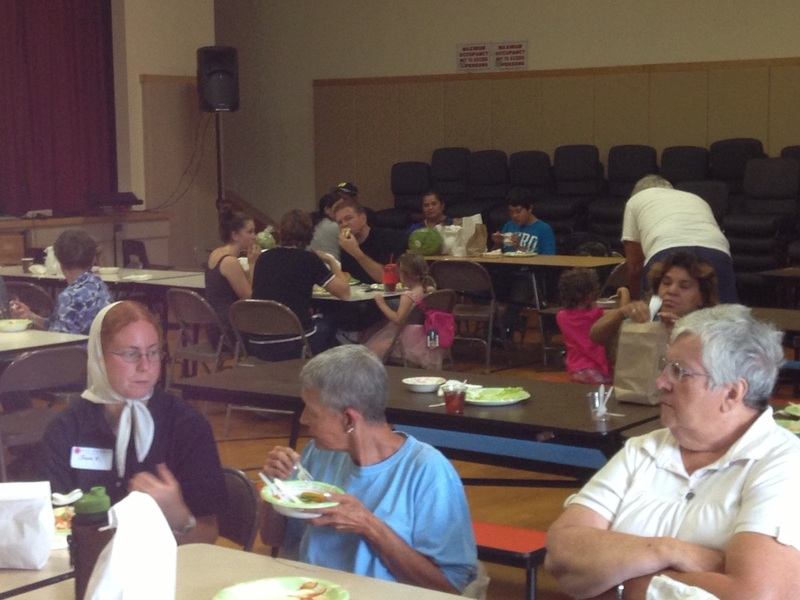 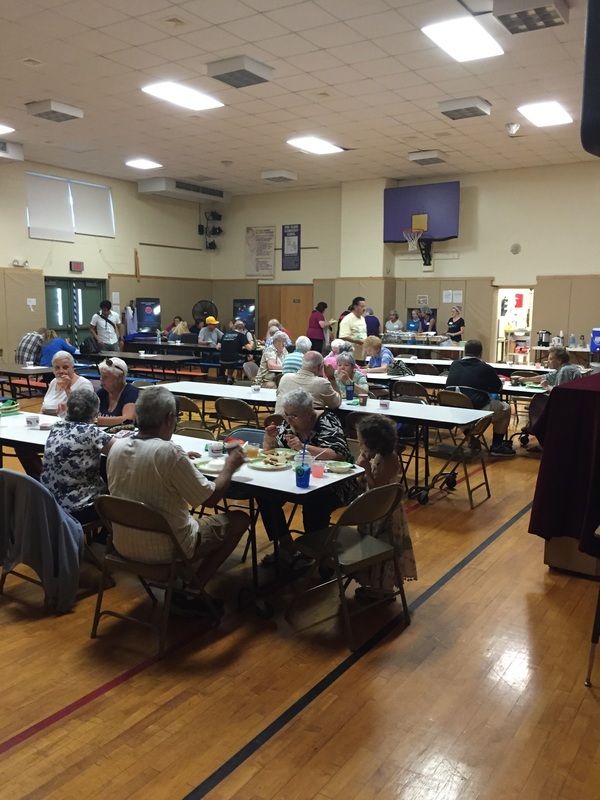 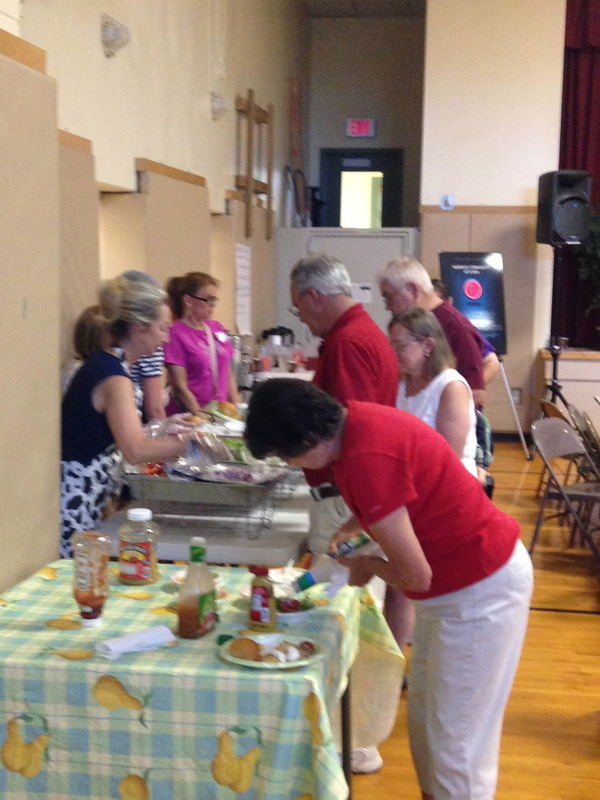 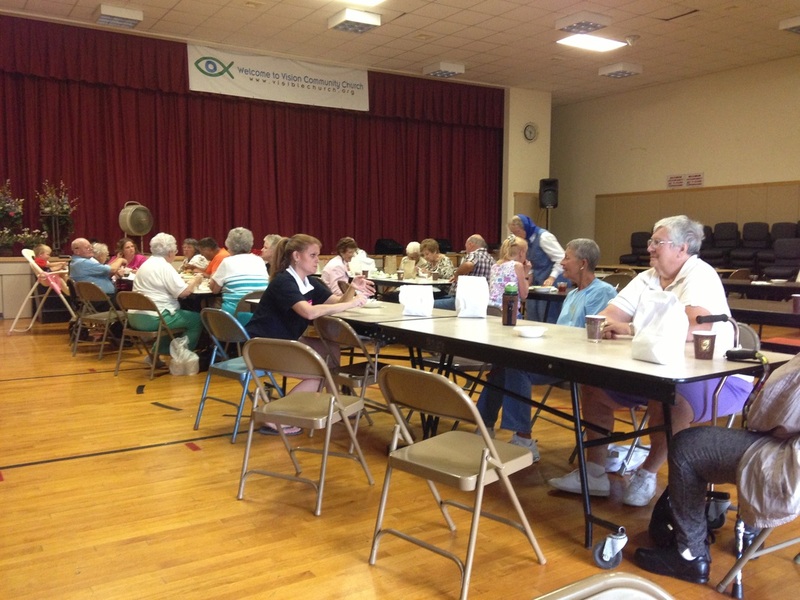 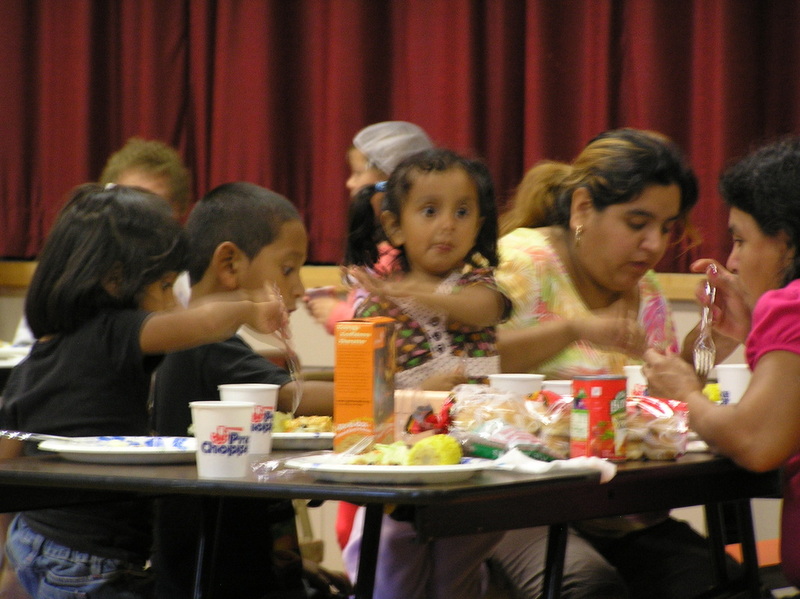 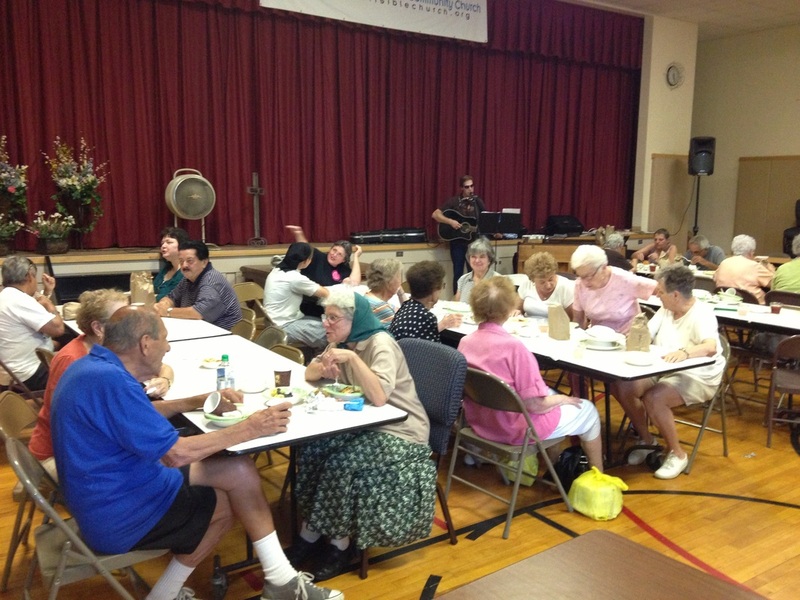 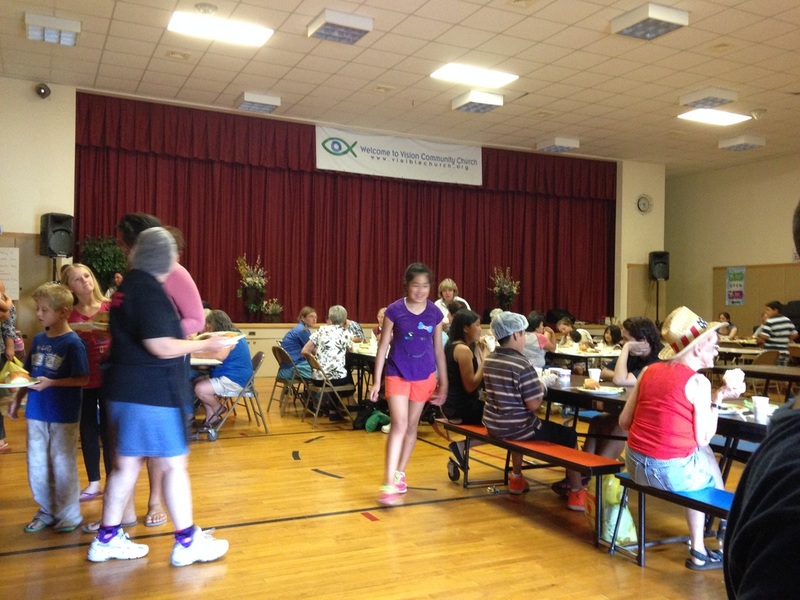 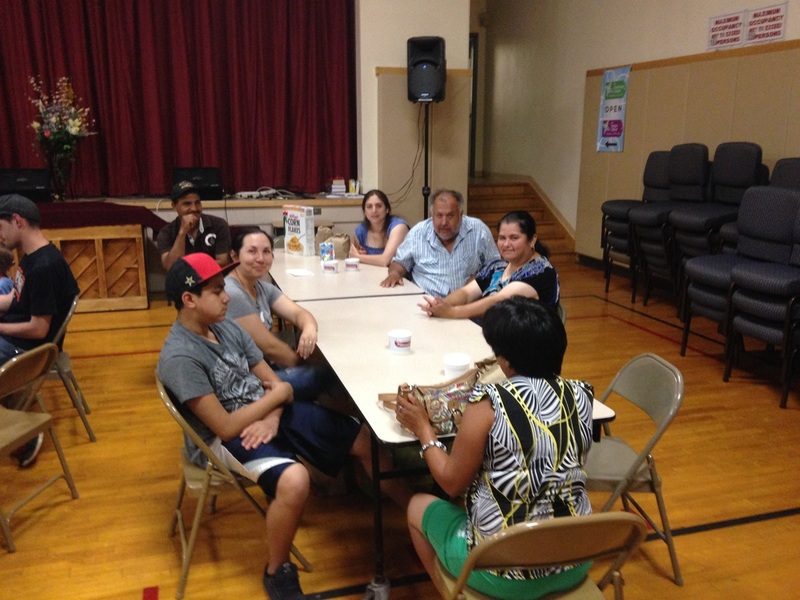 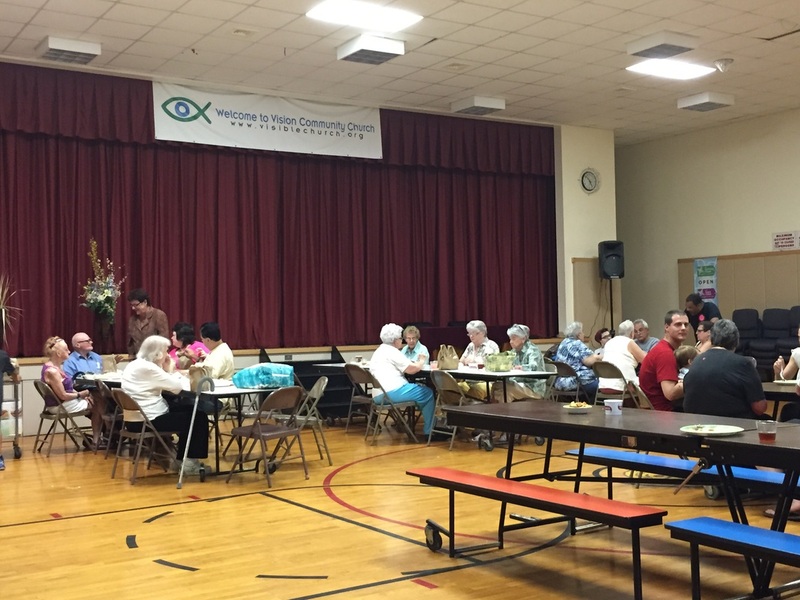 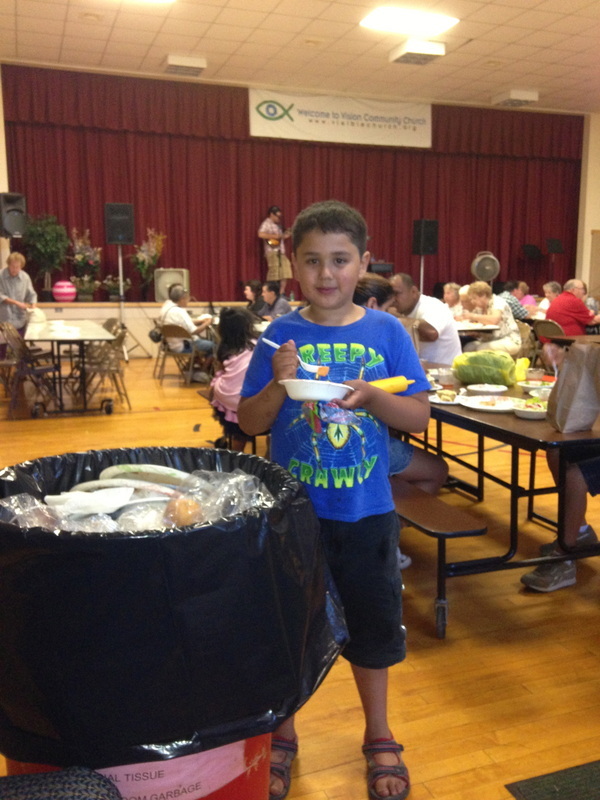 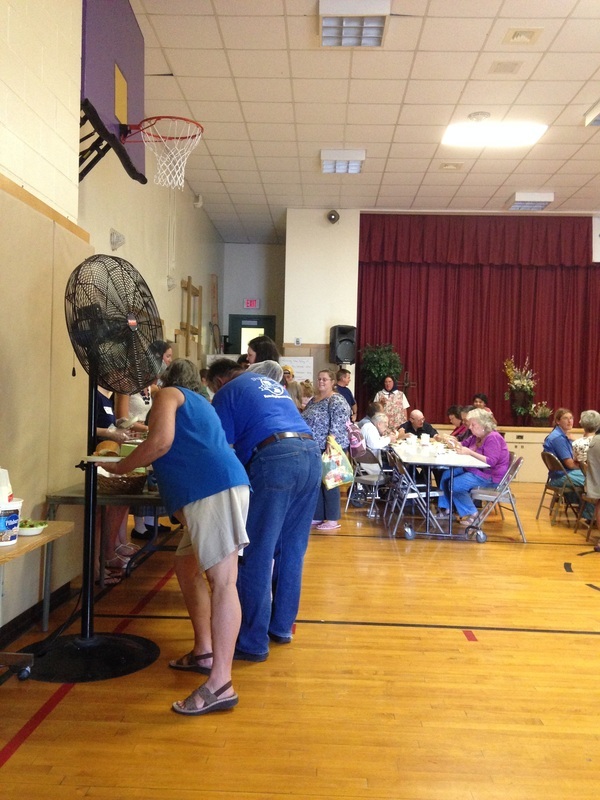 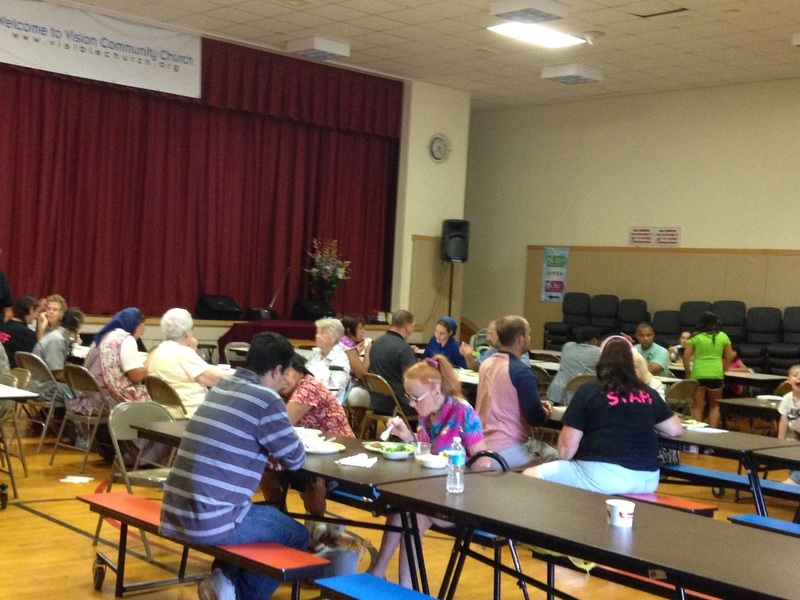 August 19, 2012 Dinner - Sponsored by members of Warwick Assembly of God. 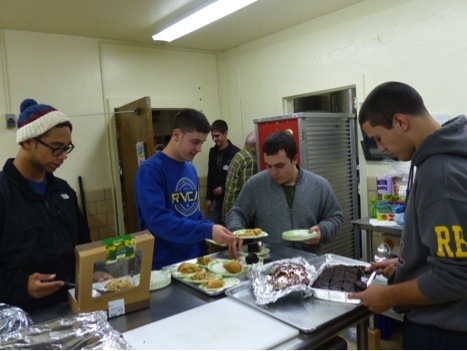 All of the cooking was done by "The Guys". 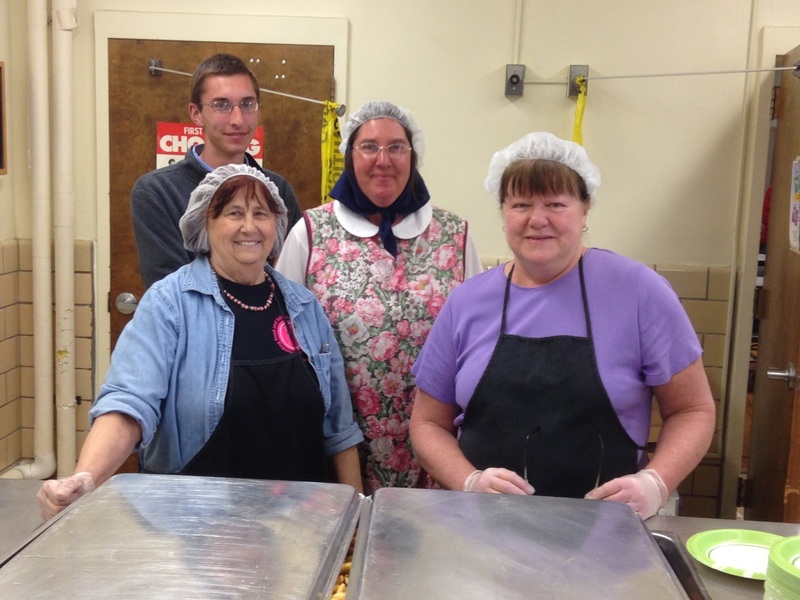 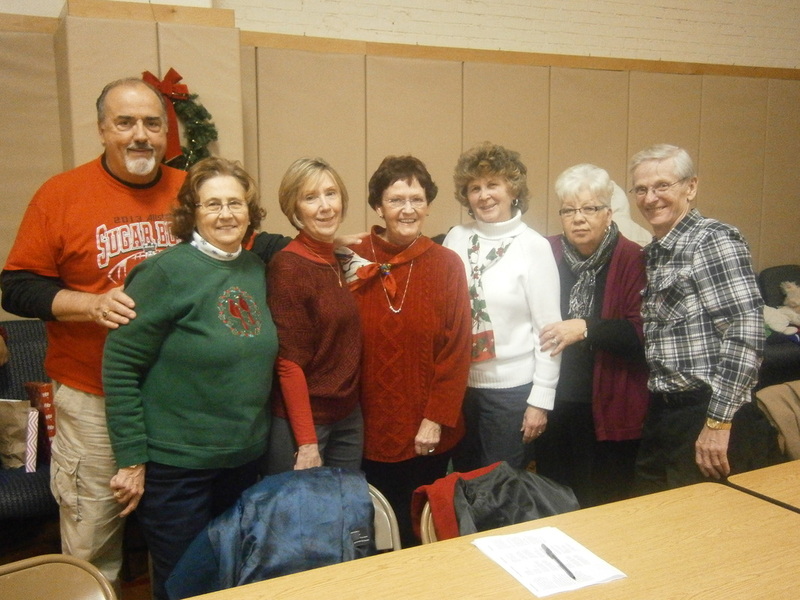 The volunteers from Warwick Assembly of God. 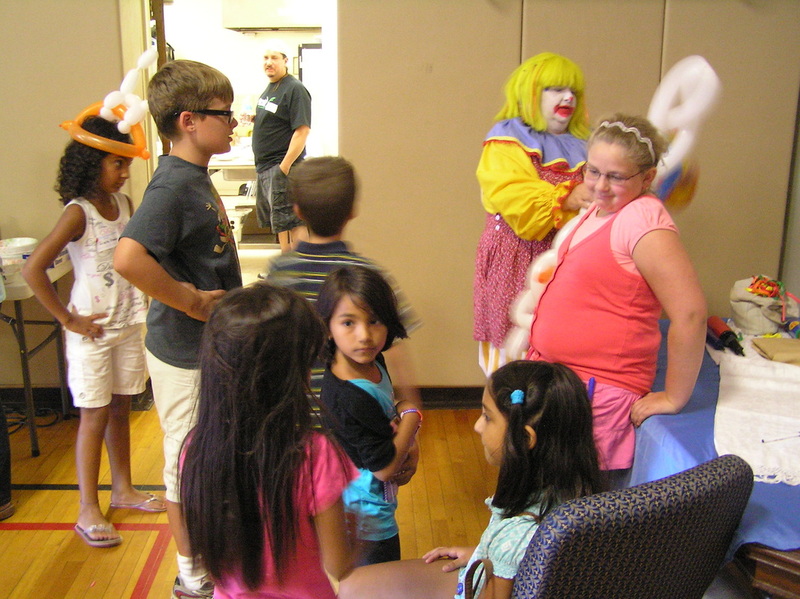 Kizzy T. Clown was busy making balloon figures for everyone. 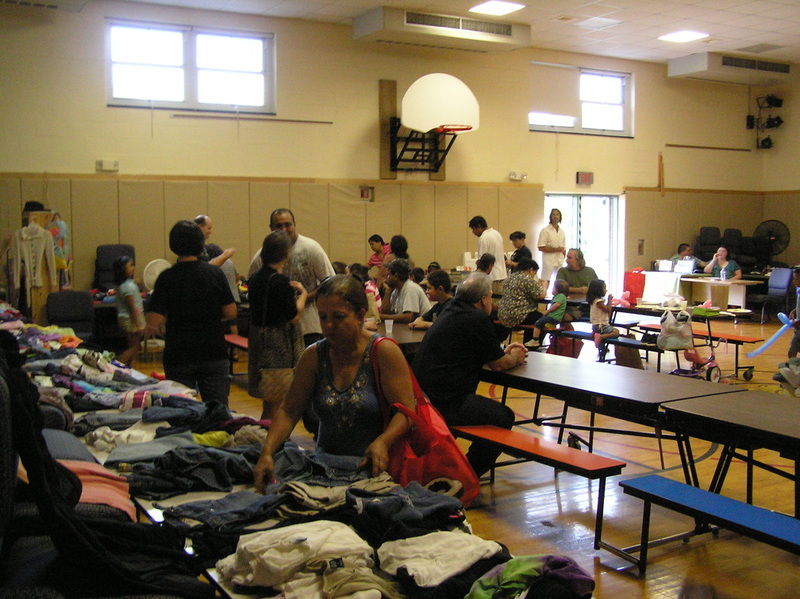 The Clothing Closet had set up for "Back to School". 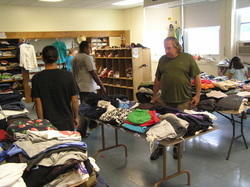 Guests shopping in the Clothing Closet. 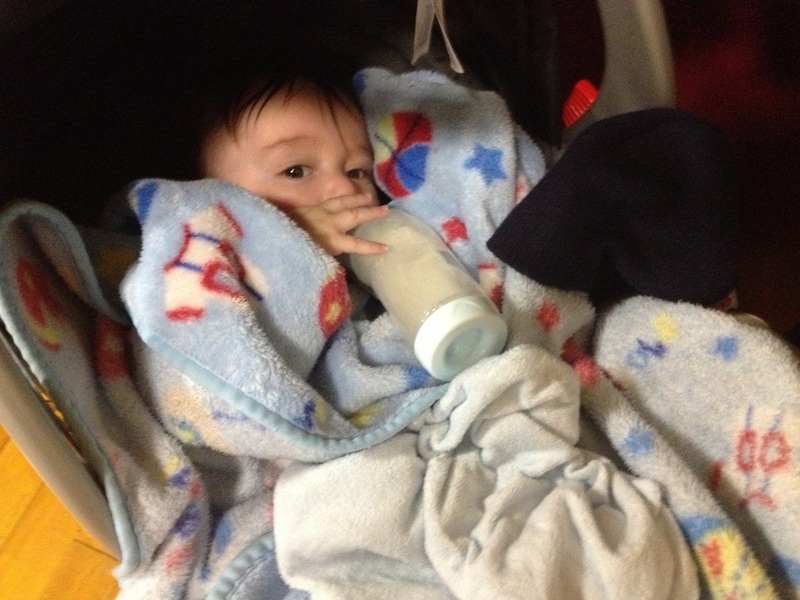 One of our guests is feeding her one month old son. 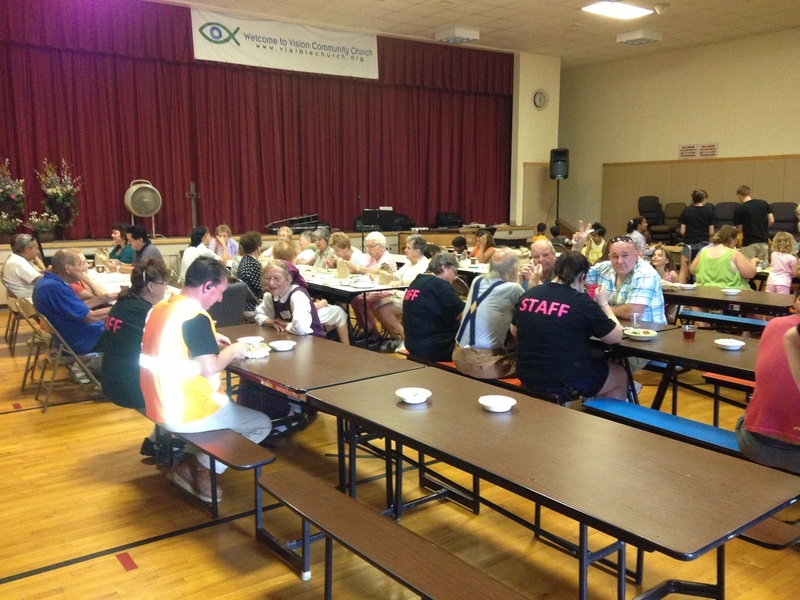 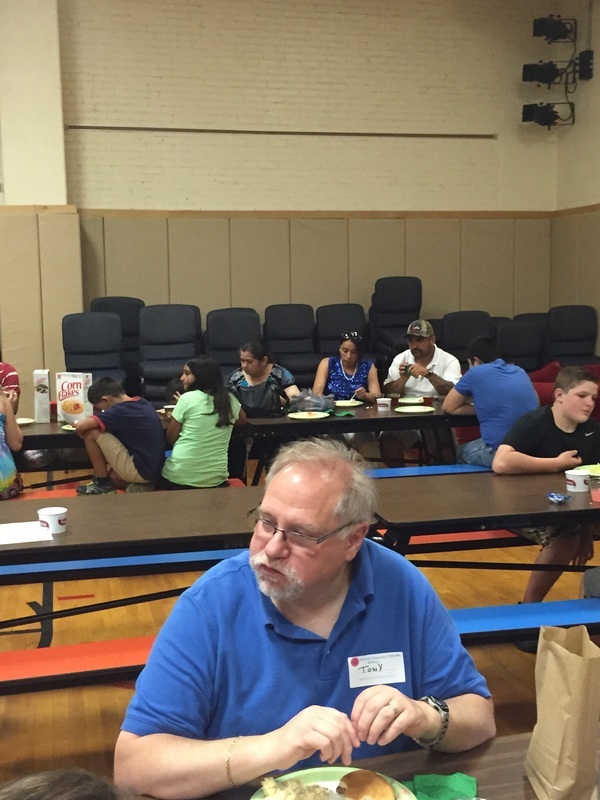 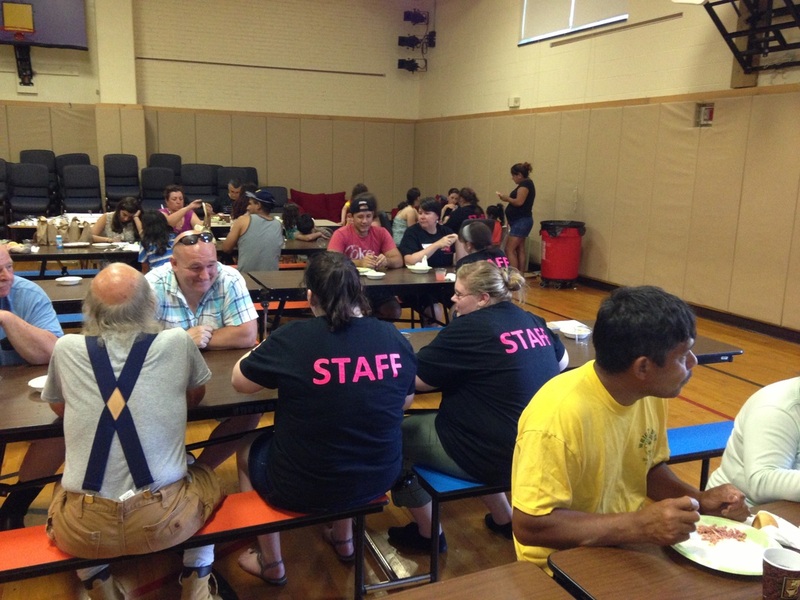 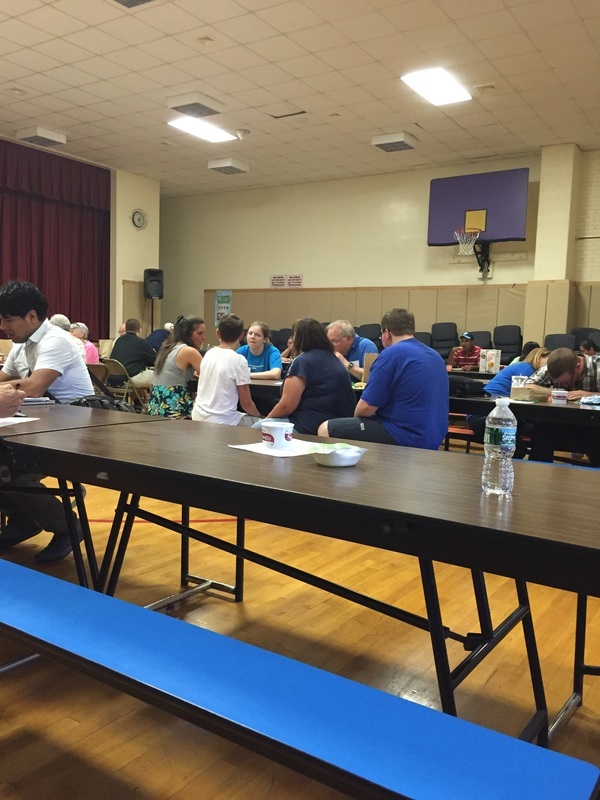 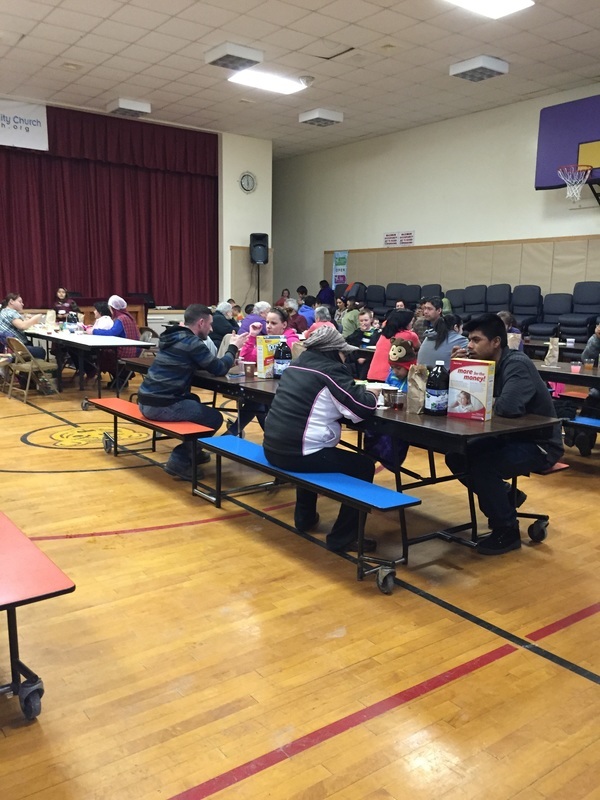 Our volunteers enjoying dinner and each other. 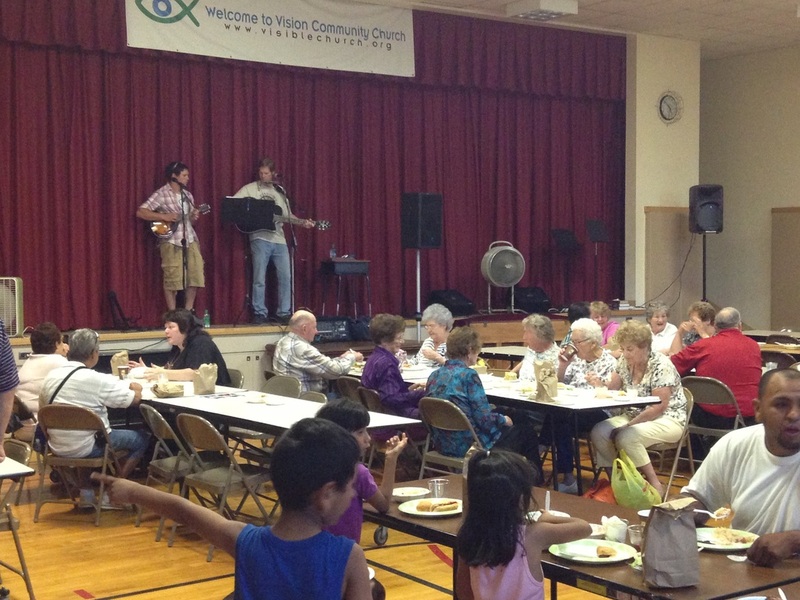 July 15, 2012 Dinner - Sponsored by members of Vision Community Church and the Warwick Community Kitchen. 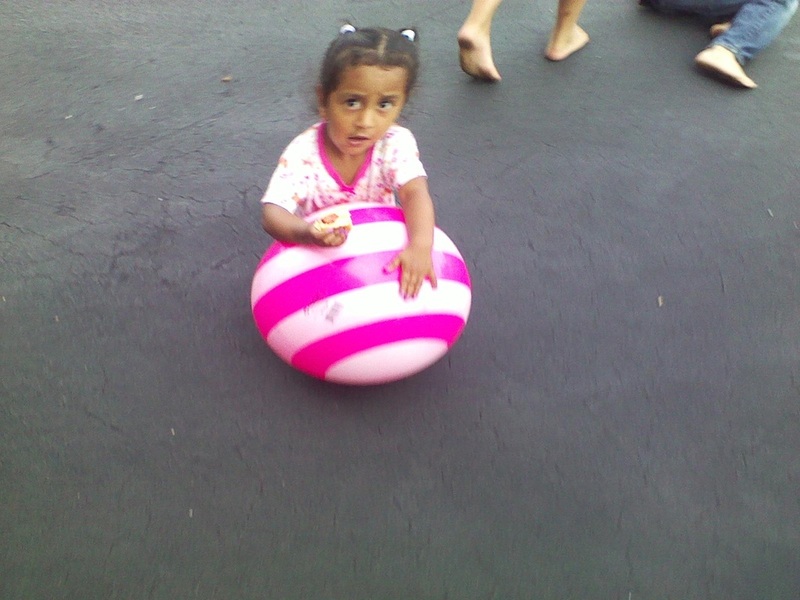 A little girl enjoying her hotdog while playing with a ball. 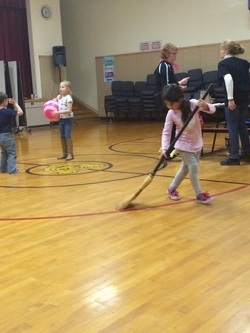 Victoria had a ball toss contest for the children attending the dinner. 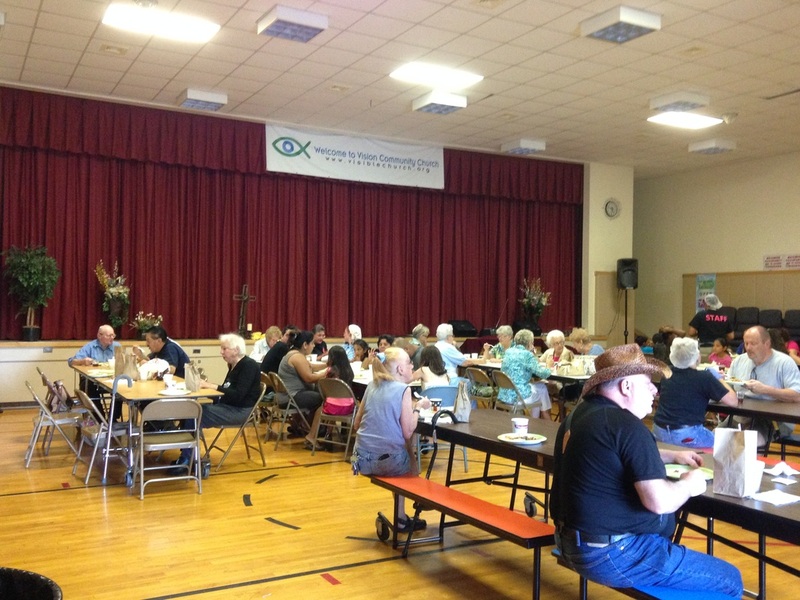 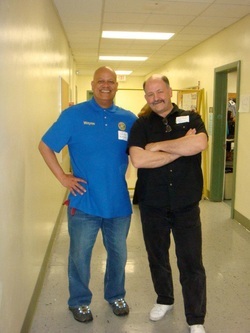 June 17, 2012 Dinner - Sponsored by the Acute Care and Inpatient Rehabilitation Departments of Orange Regional Medical Center. 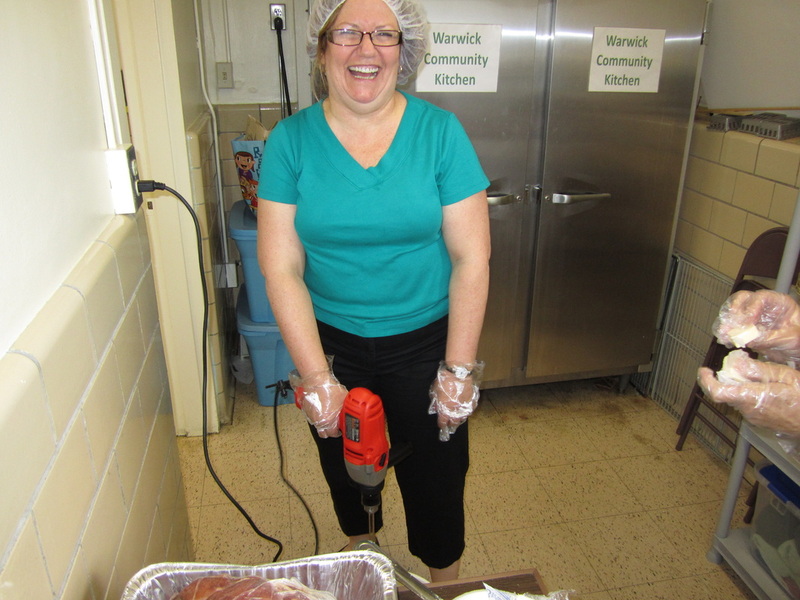 Making mashed potatoes with a drill. 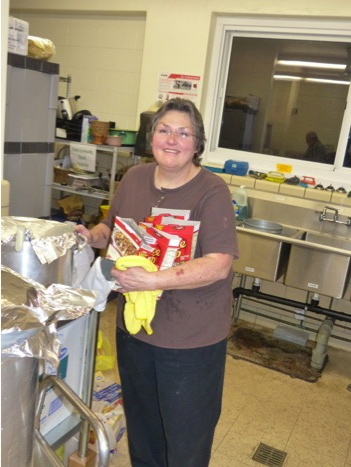 Maryann is loving making the mashed potatoes. 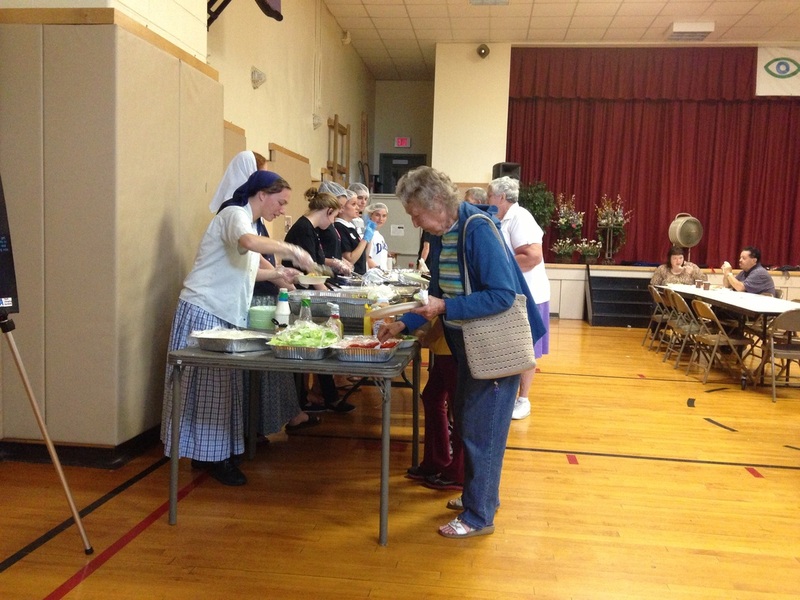 Mary adding butter while Maryann continues to mash the potatoes. 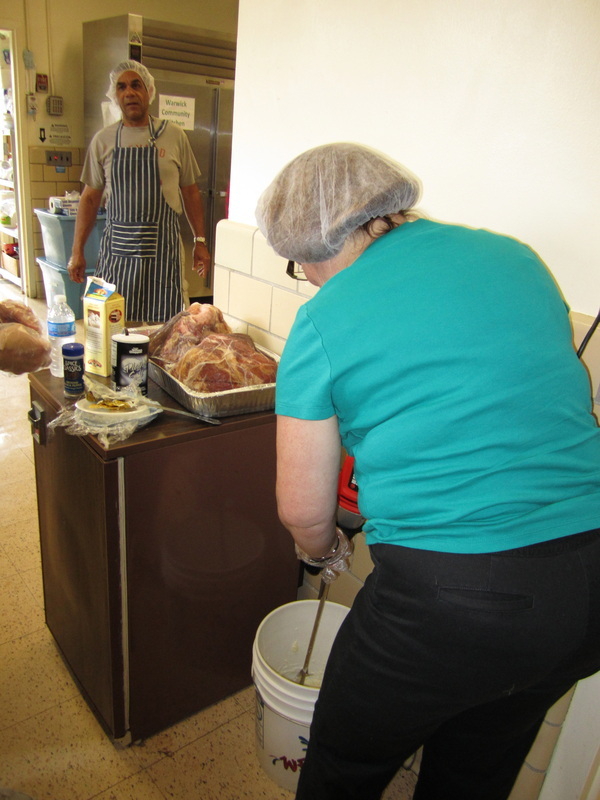 Jim and Mark cutting the ham while Andrea and Rhonda are helping in the back. 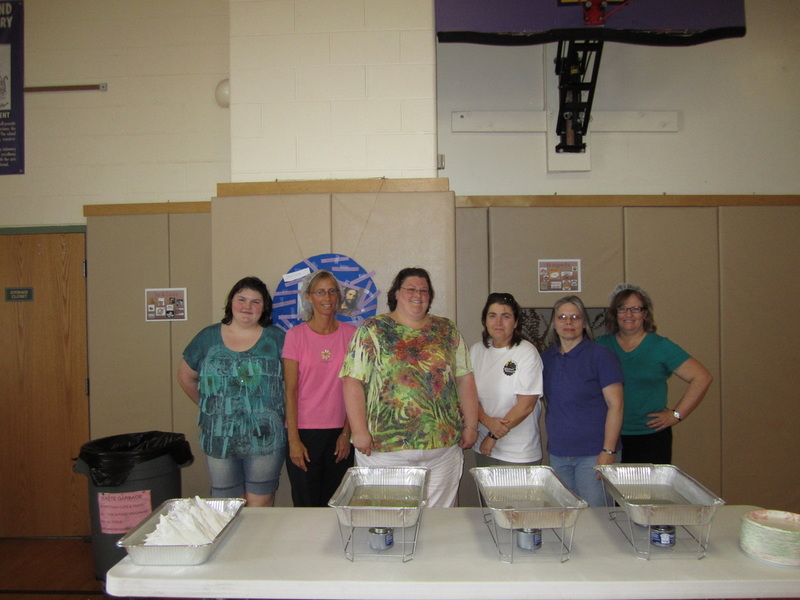 Victoria, Rhonda, Carrie, Andrea, Mary and Maryann getting ready to serve dinner. 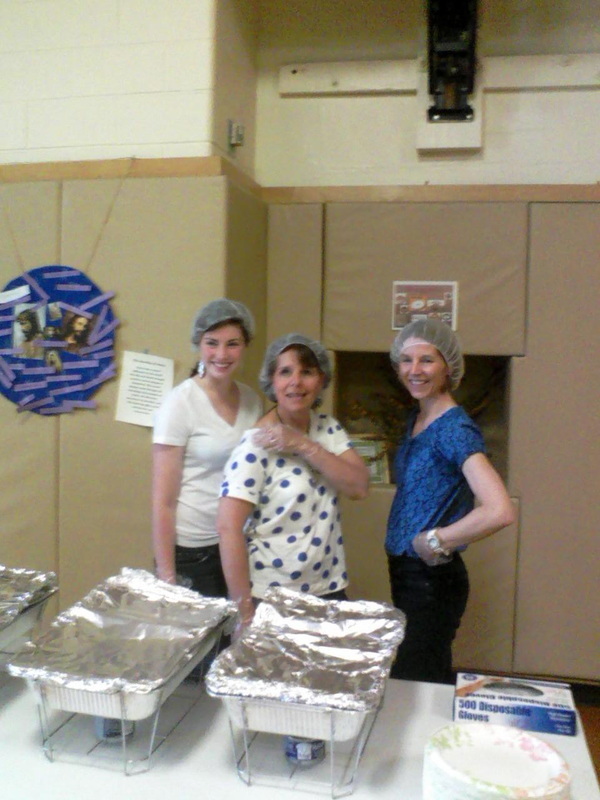 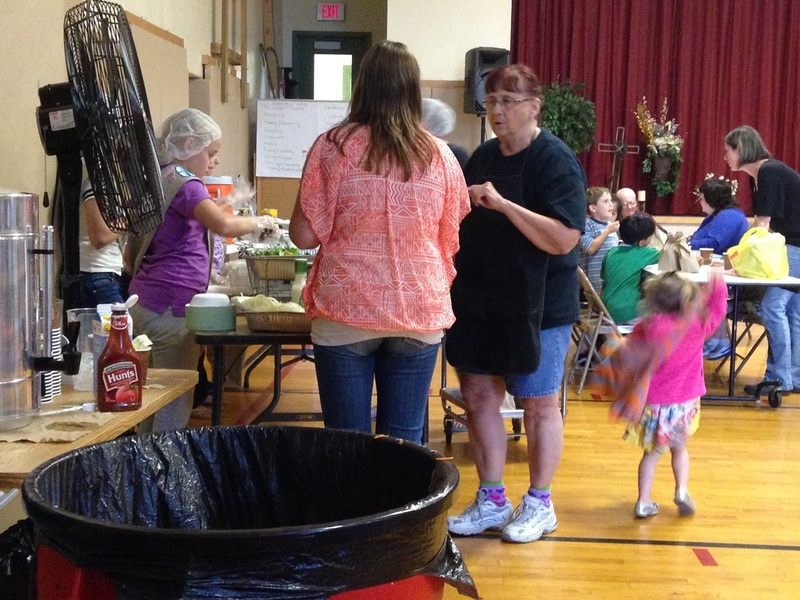 Taylor, Marge and Patricia serving dinner. 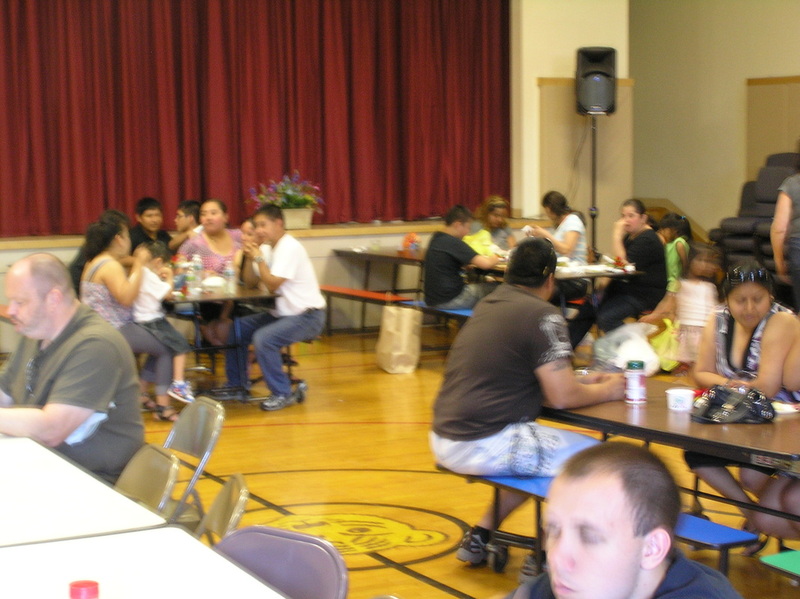 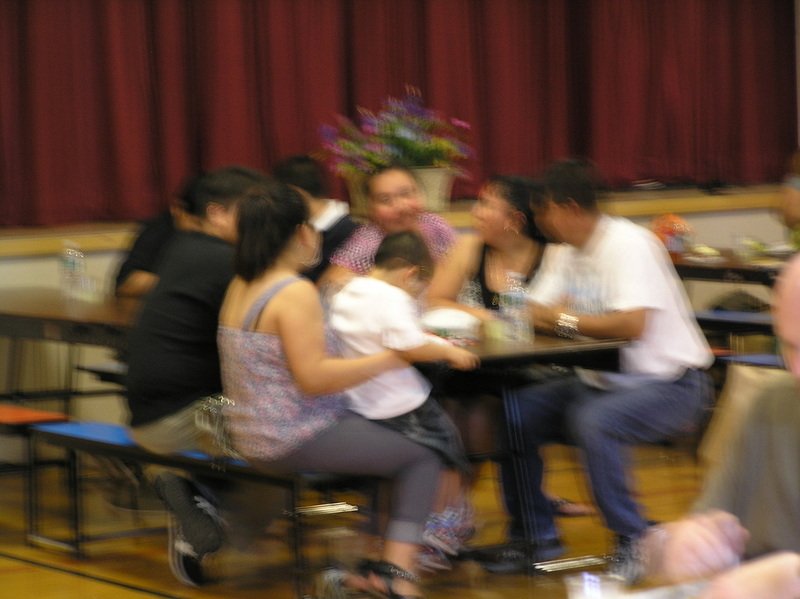 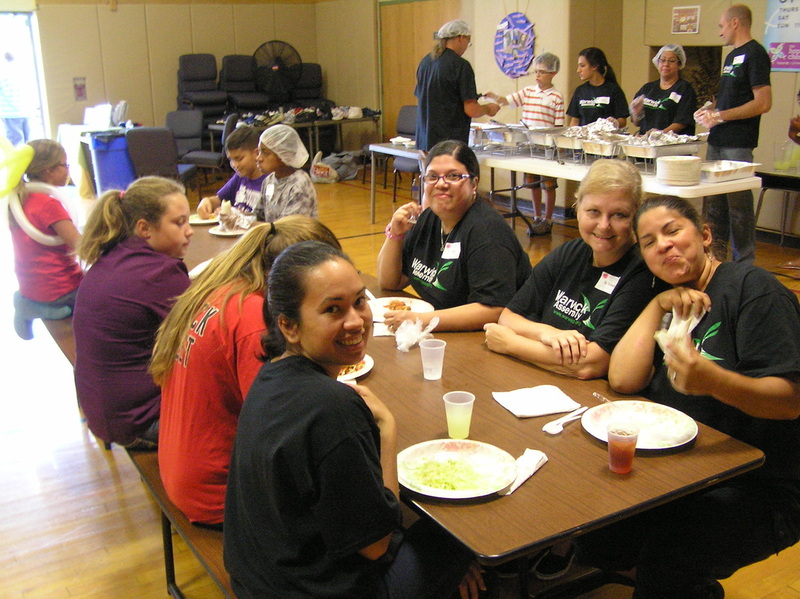 May 20, 2012 Dinner - Sponsored by Vicky of Headlines Salon in Florida, New York and Members of the Warwick Community. 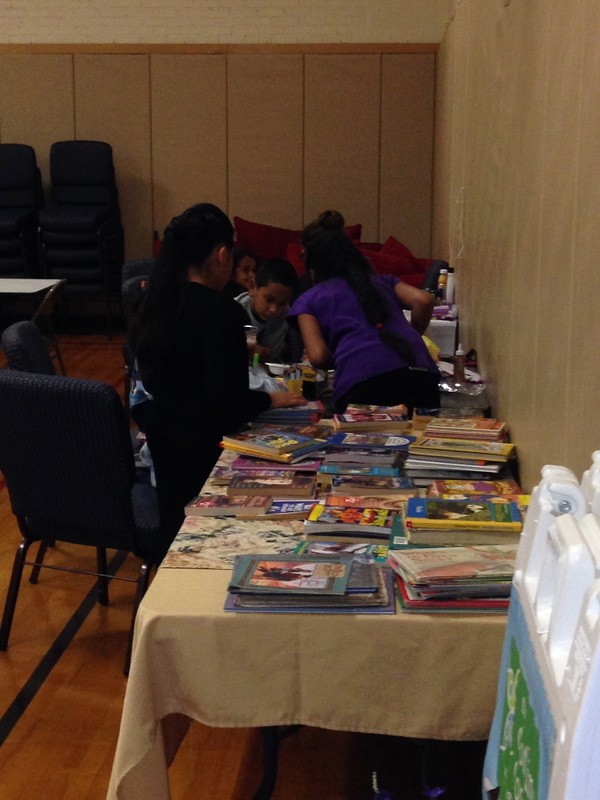 Children getting coloring and activity books. 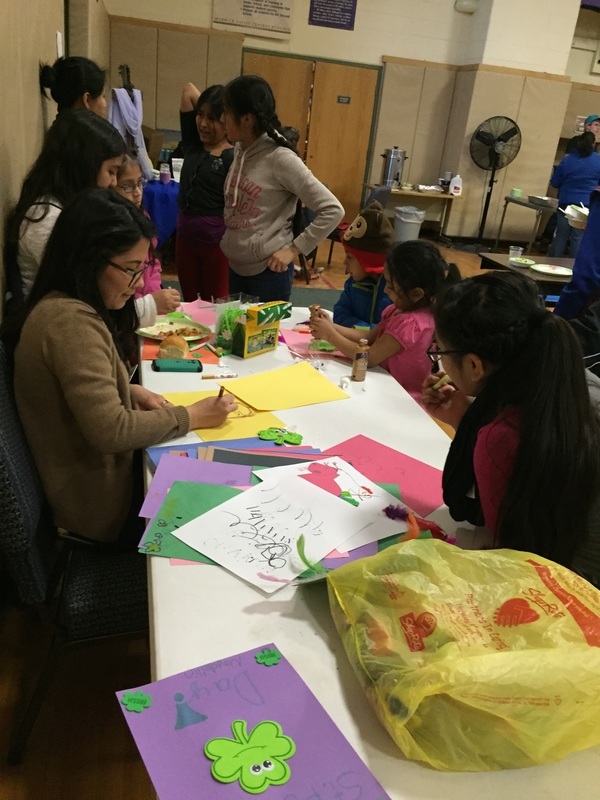 Children making their mom a flower napkin holder. 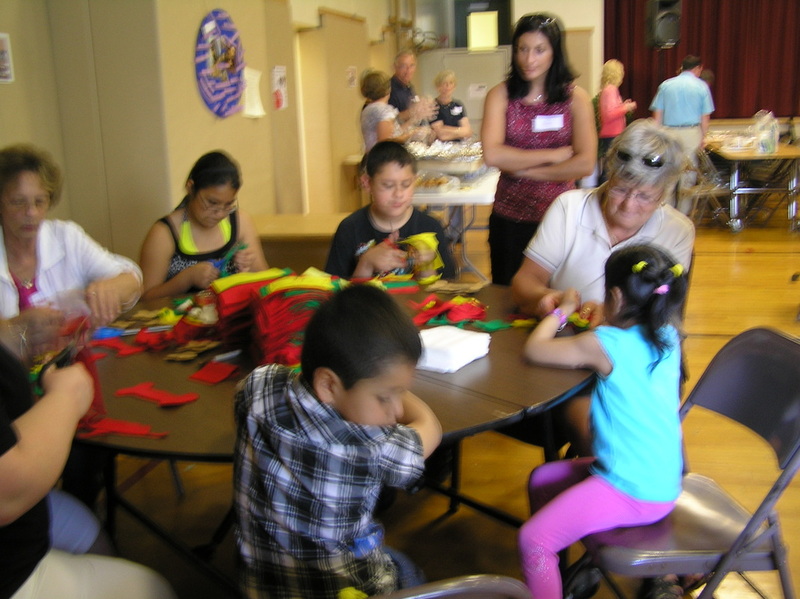 More children working on the gift for their mom. 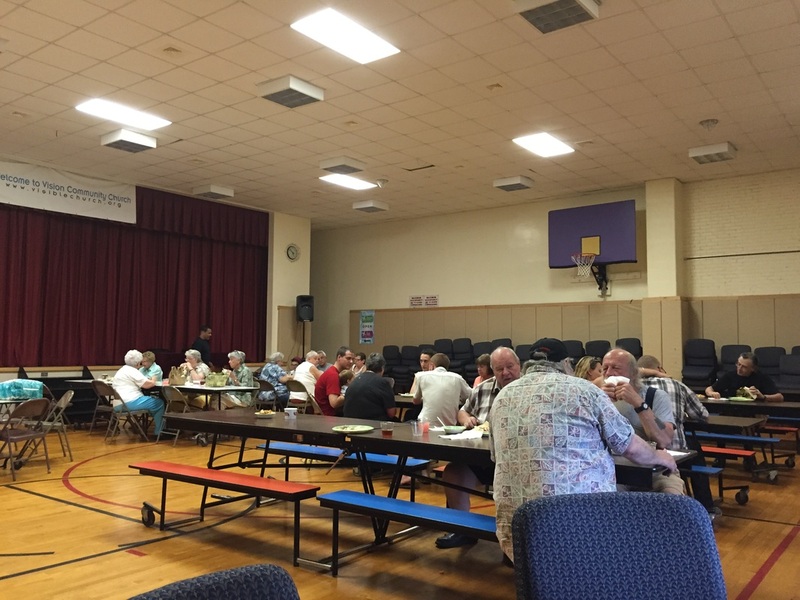 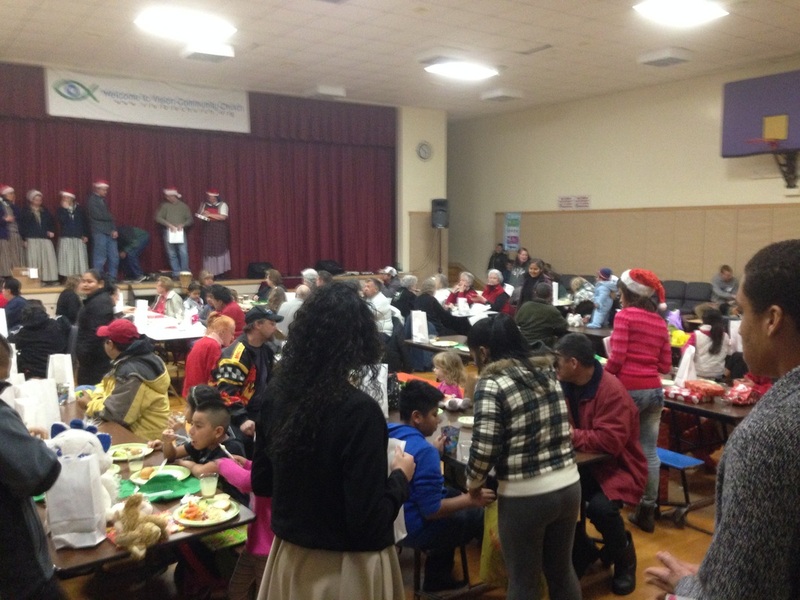 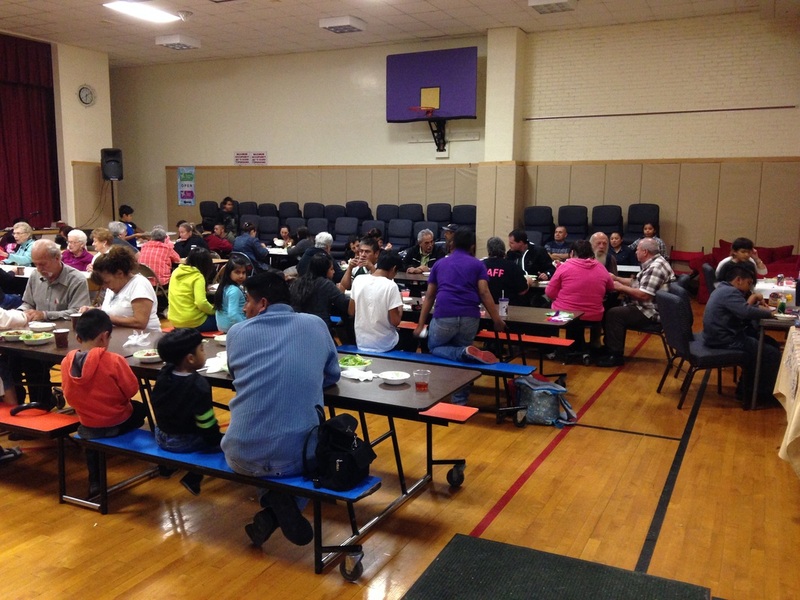 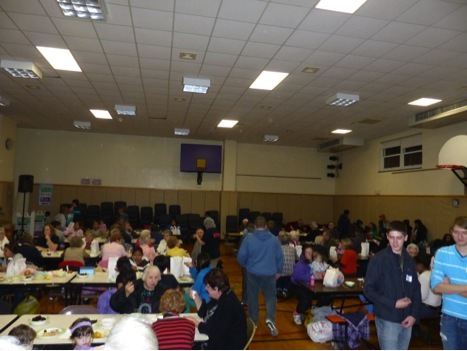 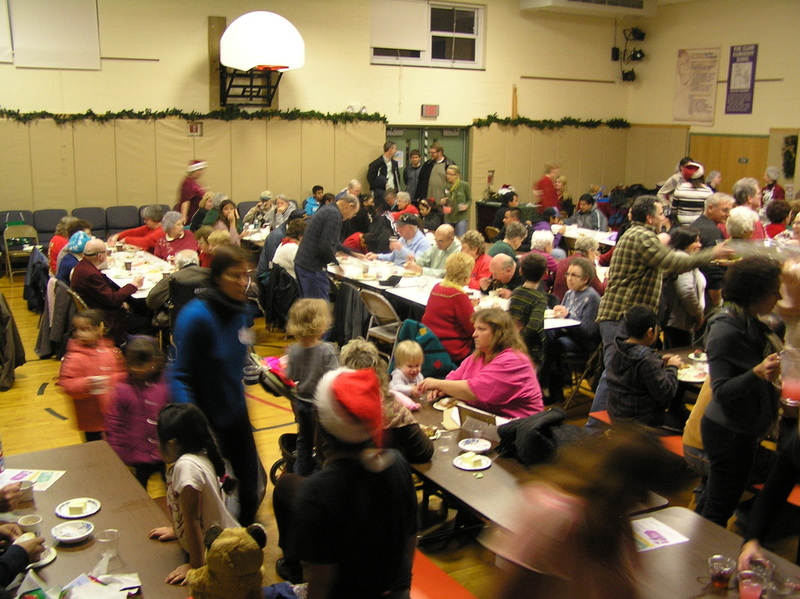 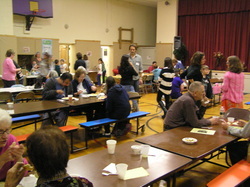 Guests and volunteers having dinner. 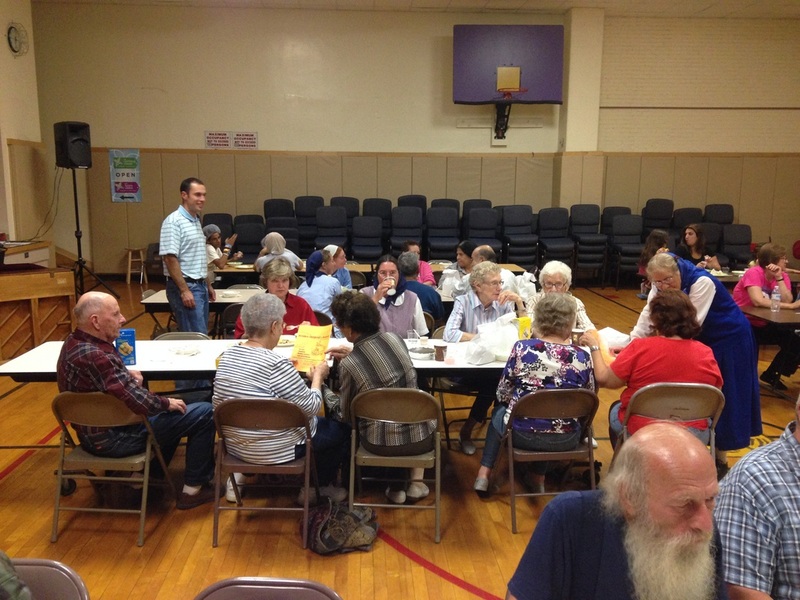 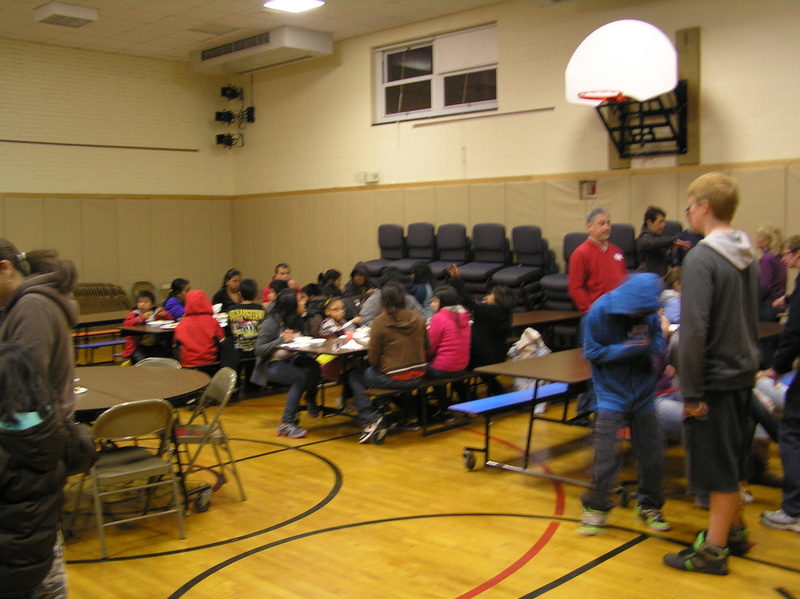 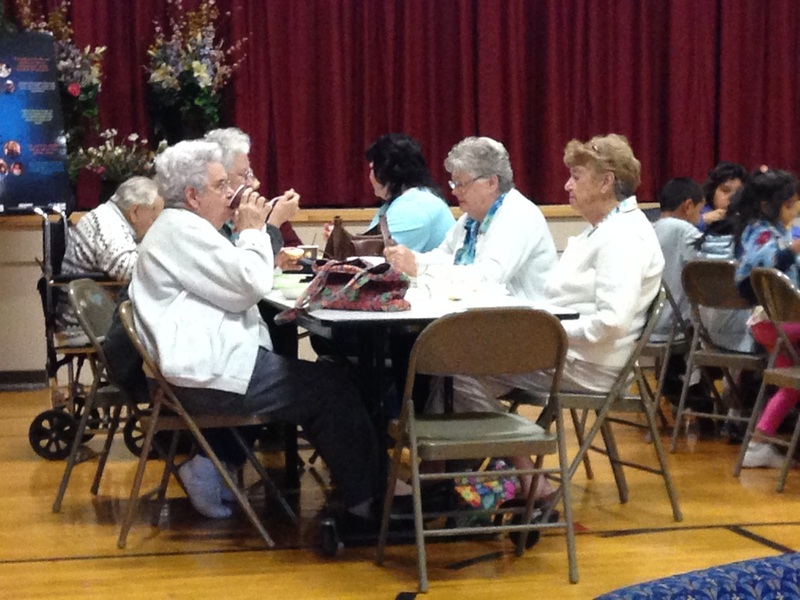 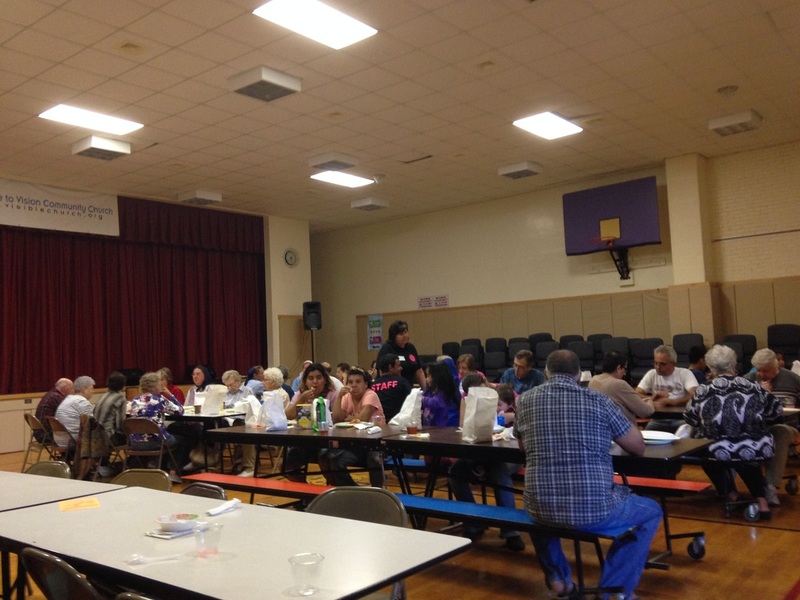 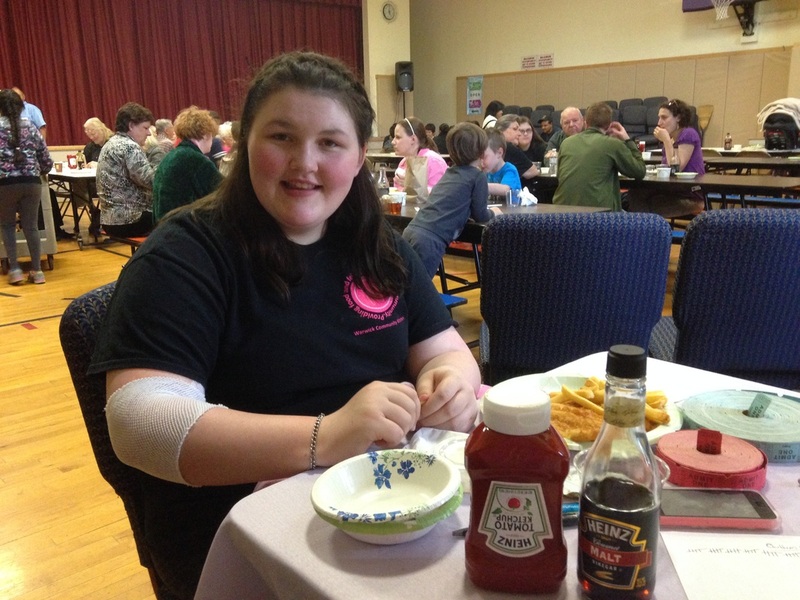 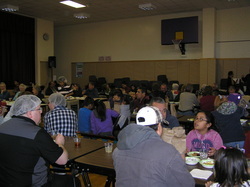 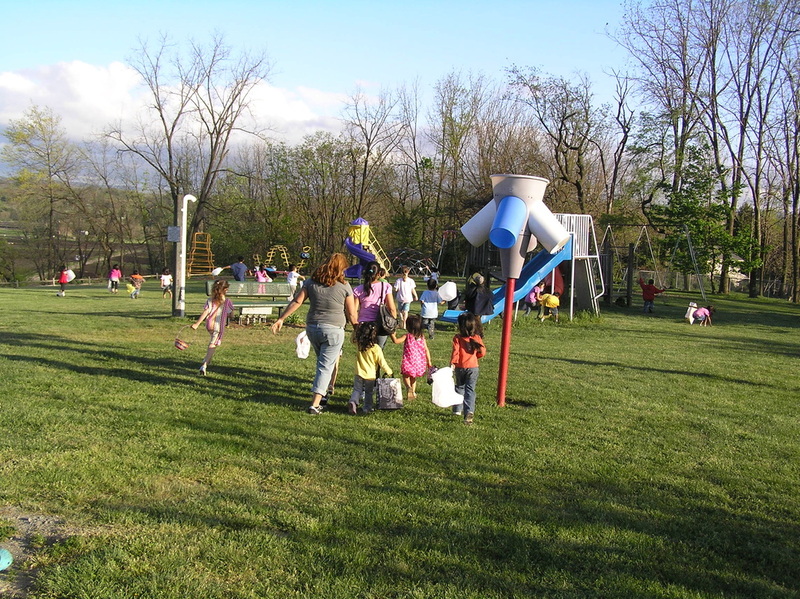 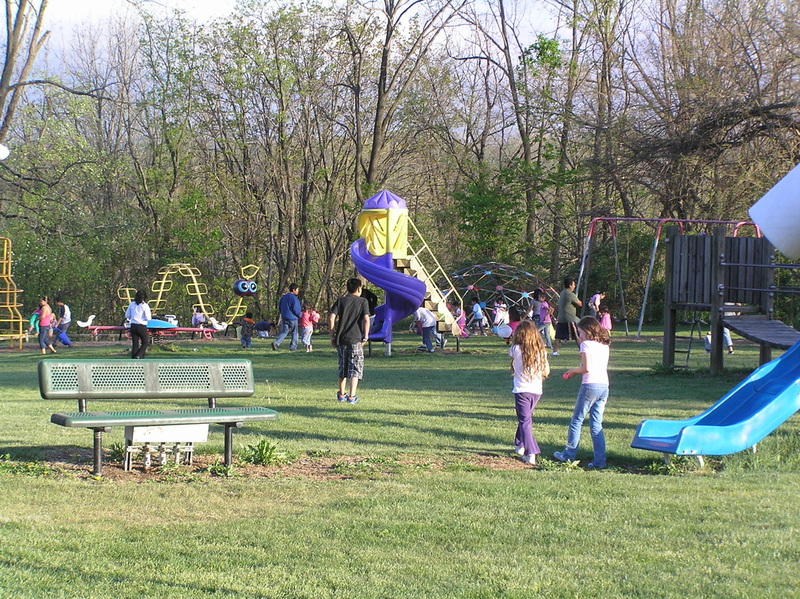 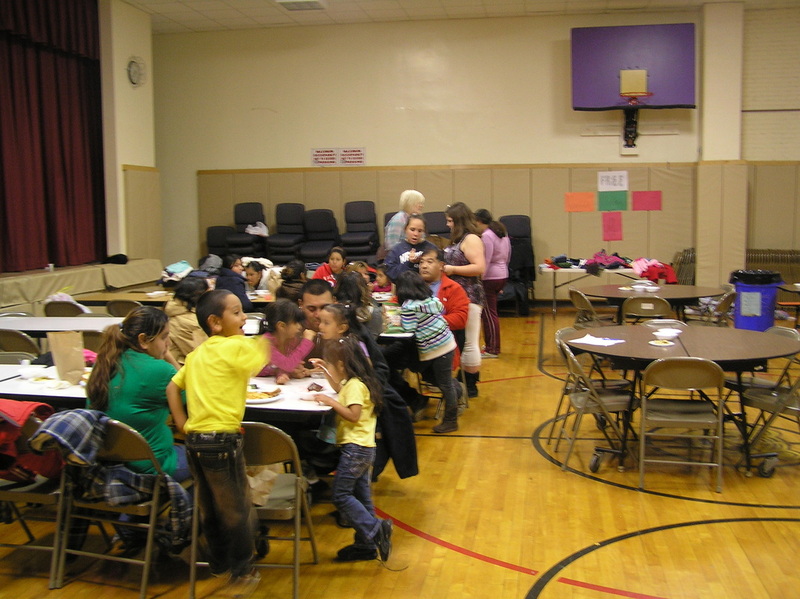 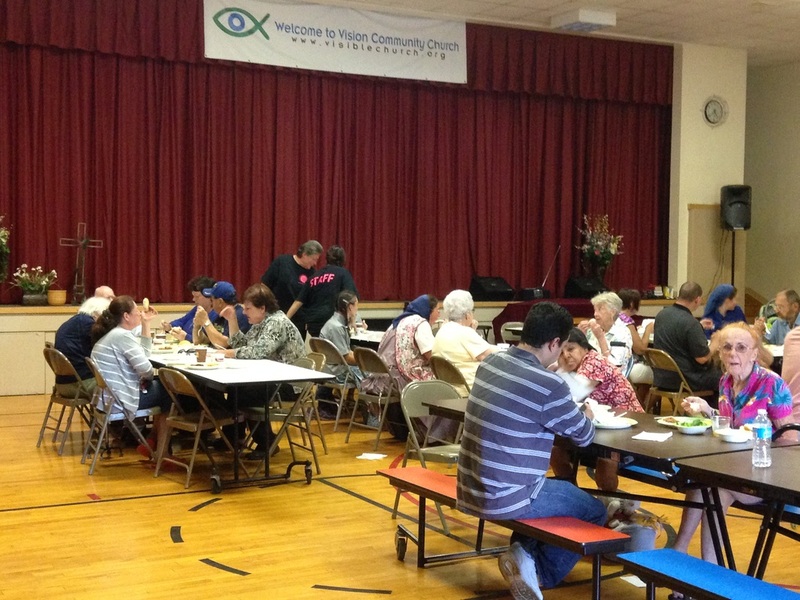 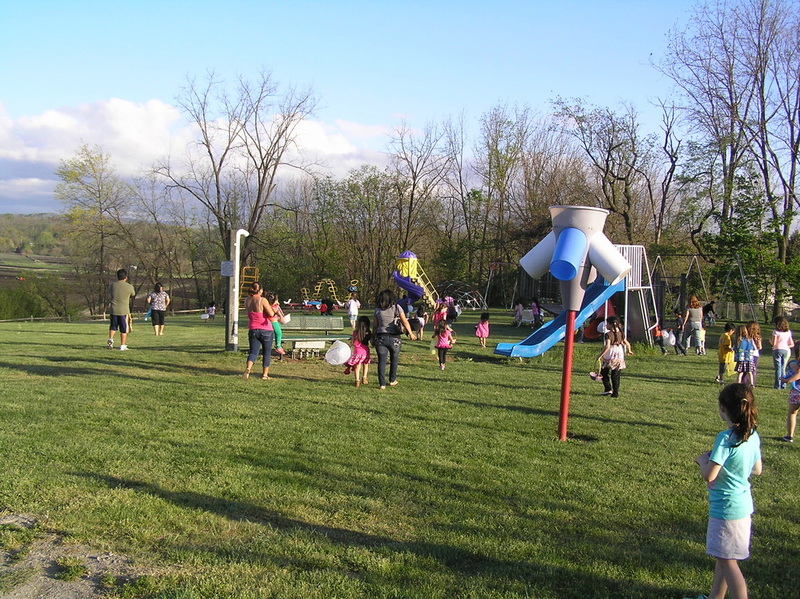 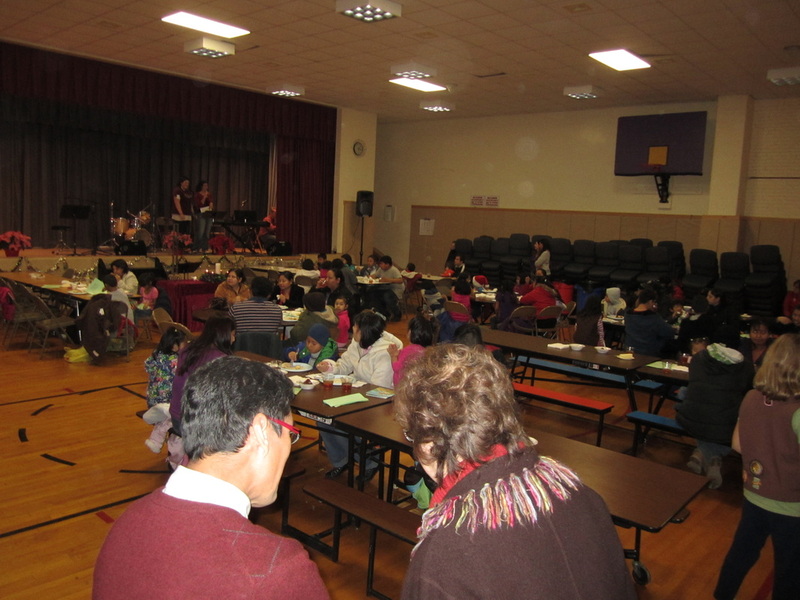 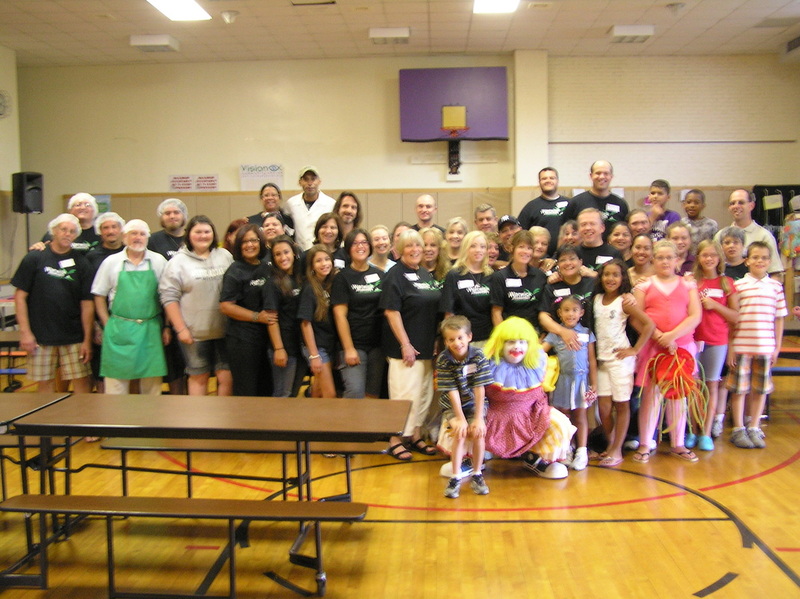 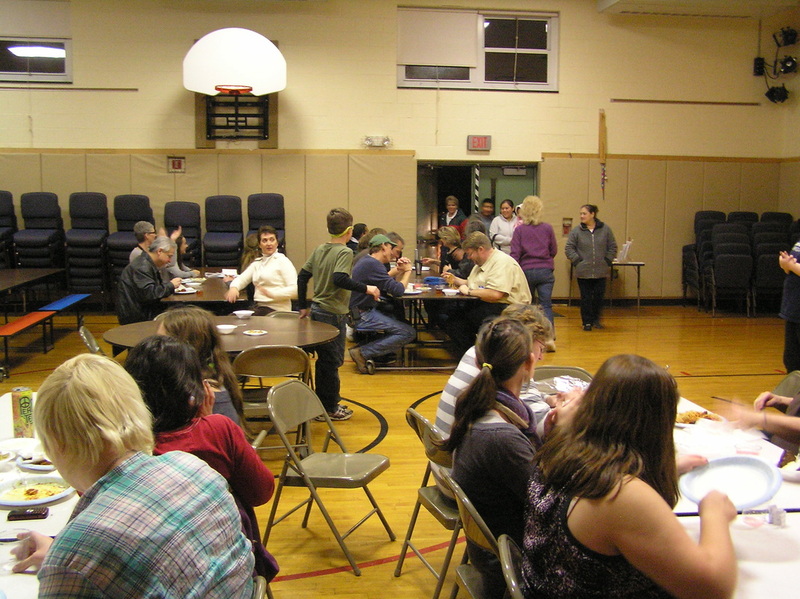 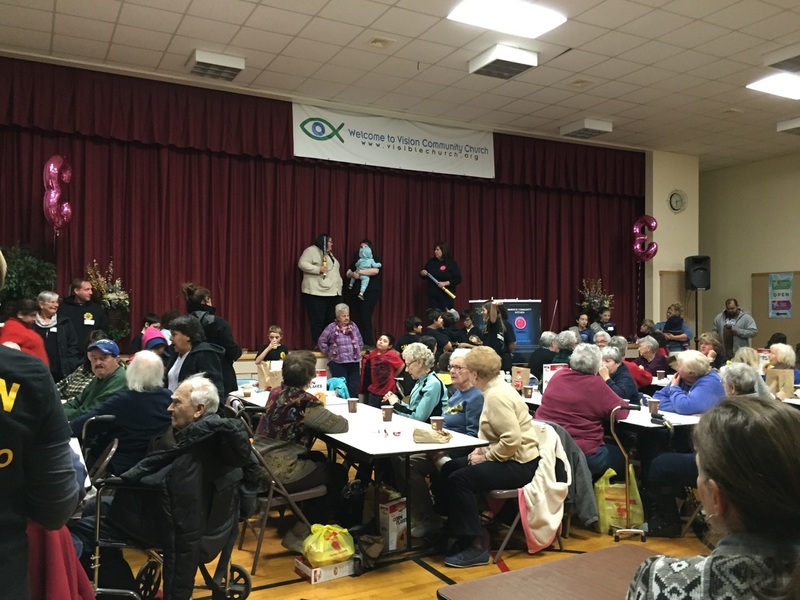 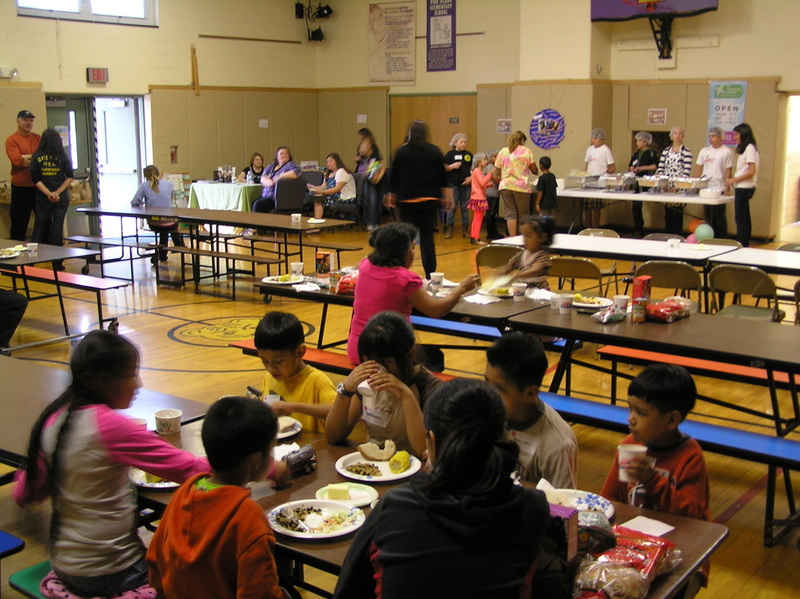 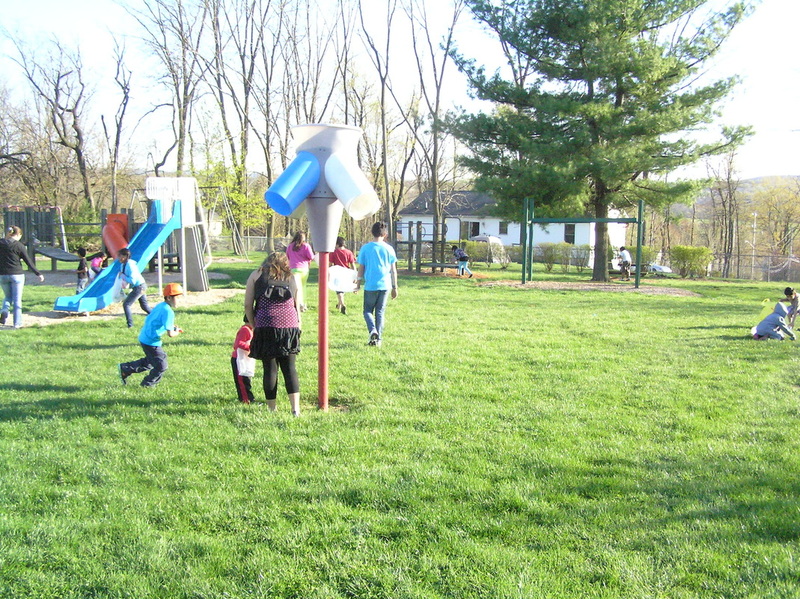 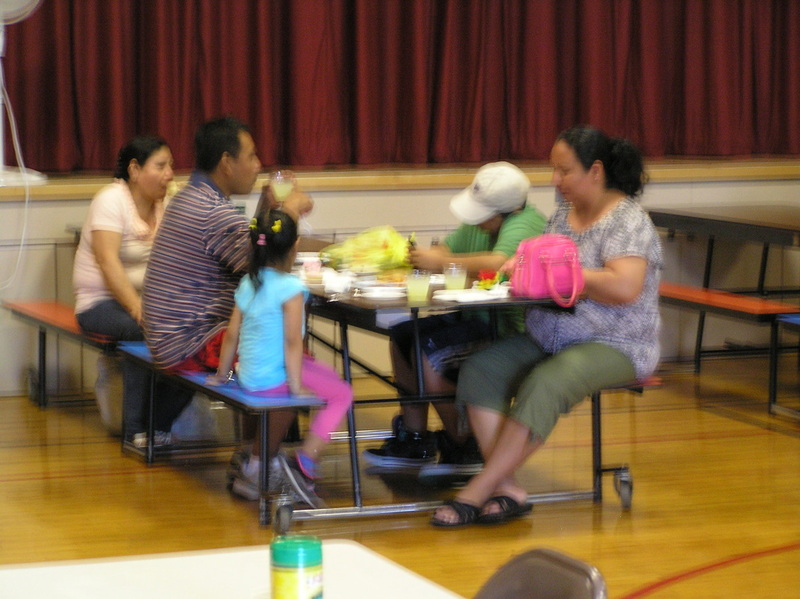 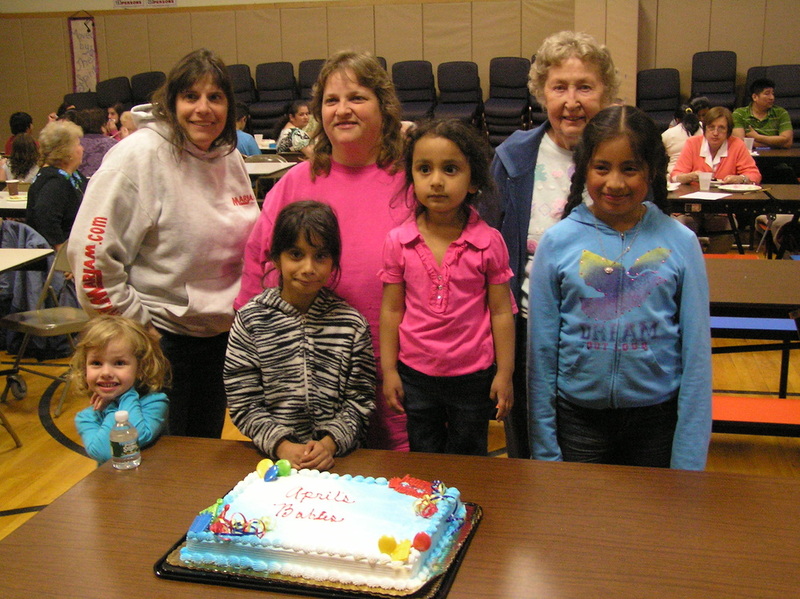 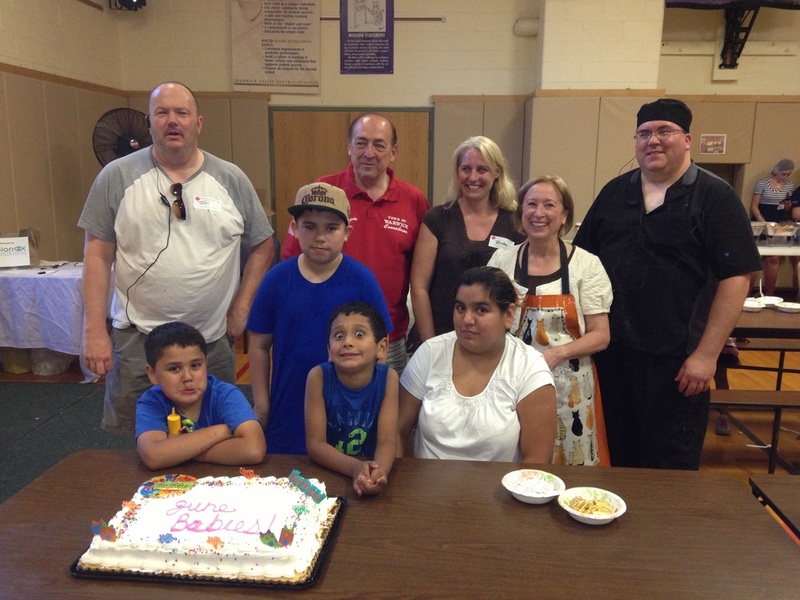 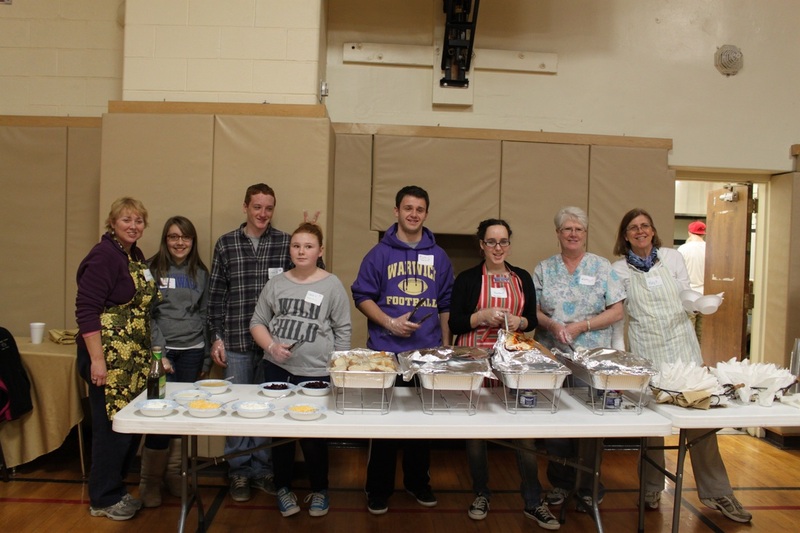 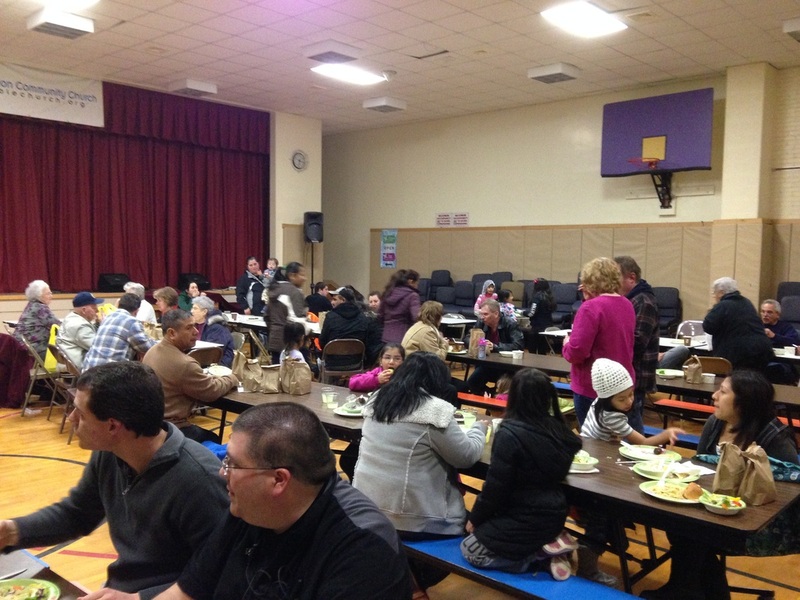 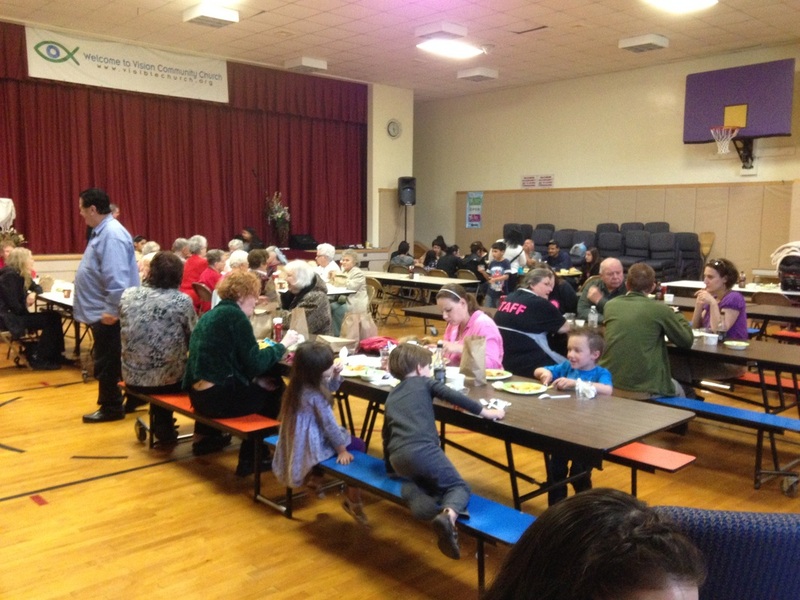 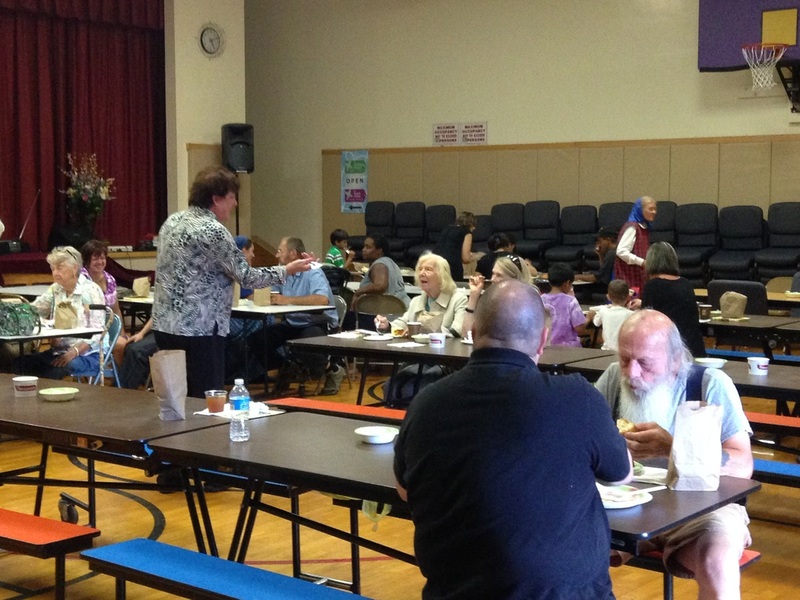 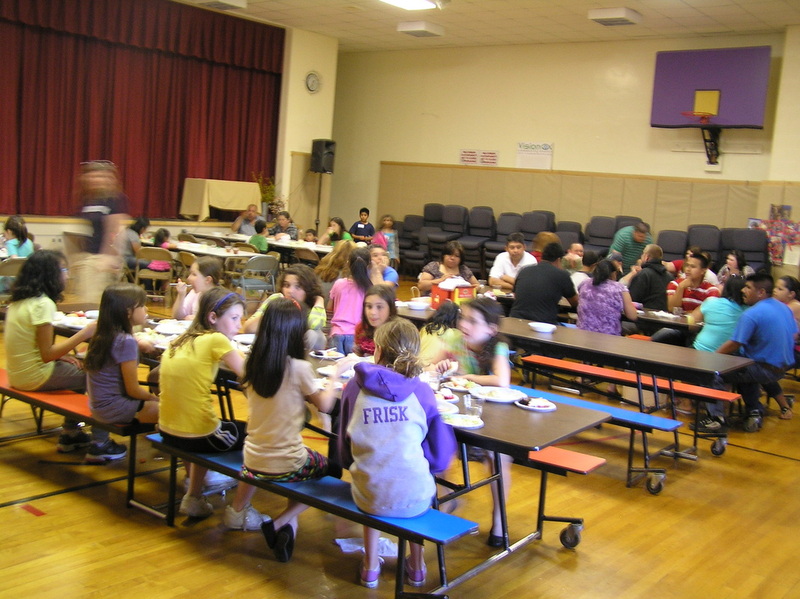 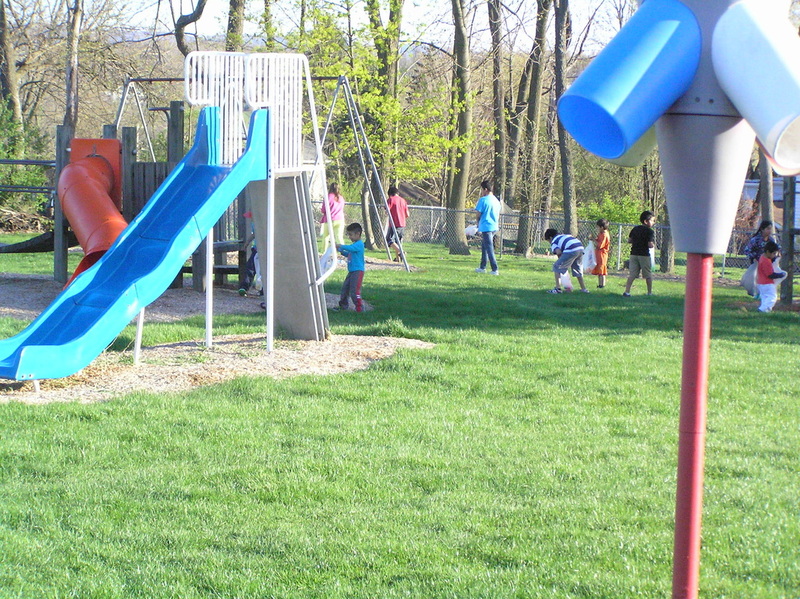 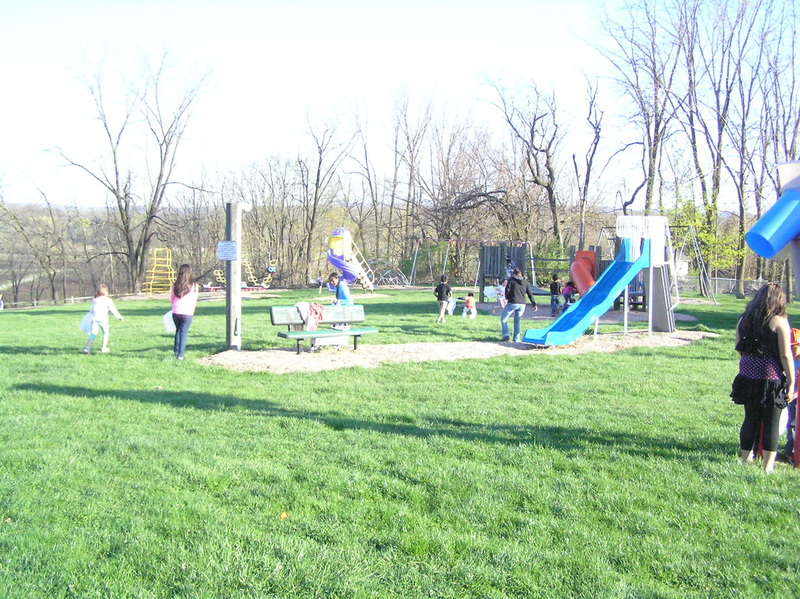 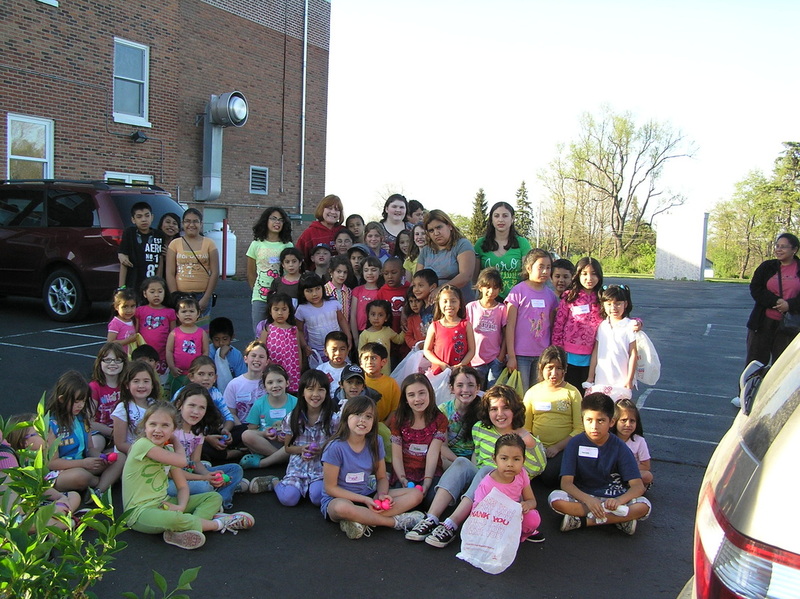 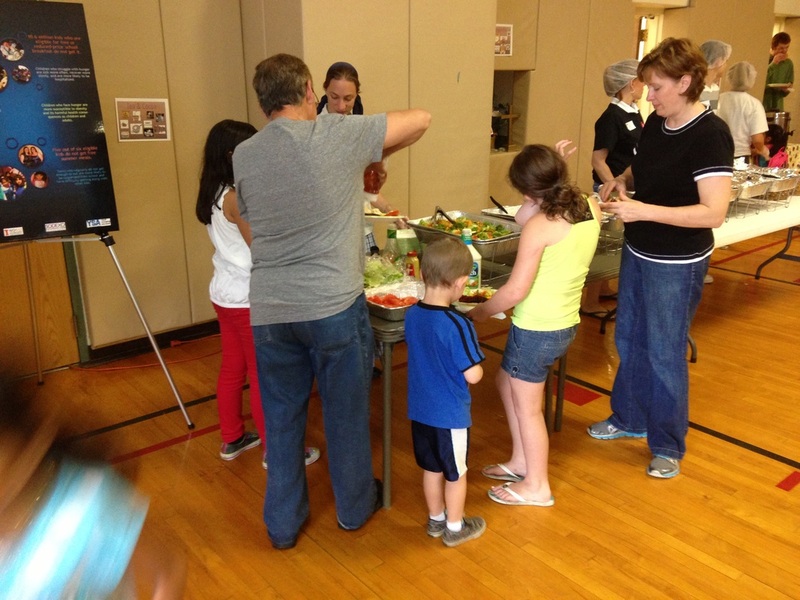 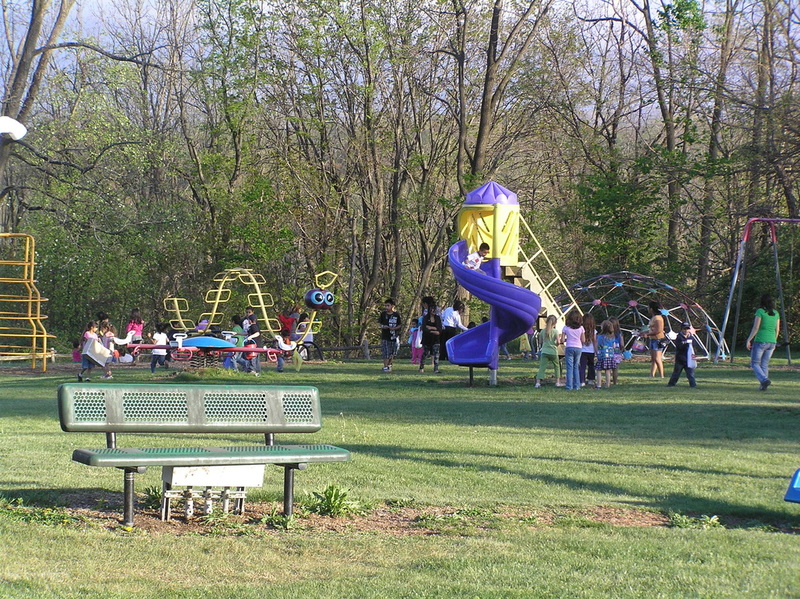 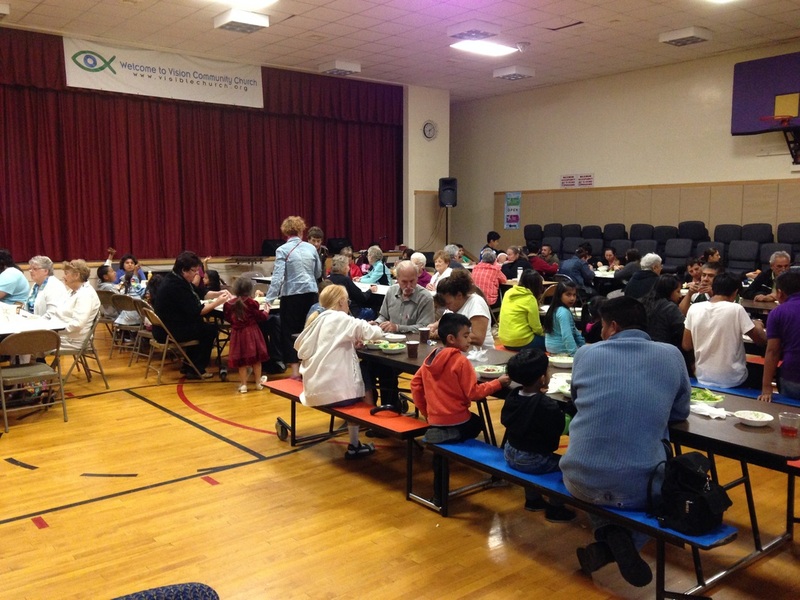 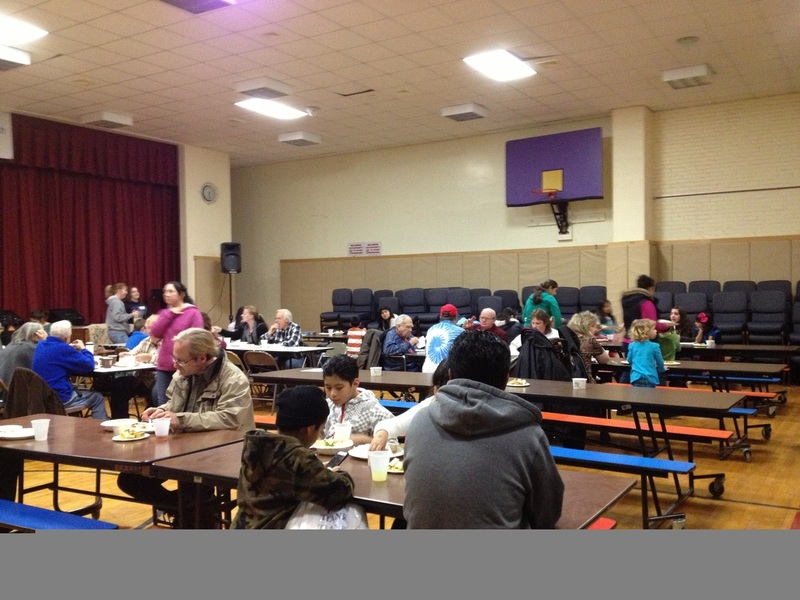 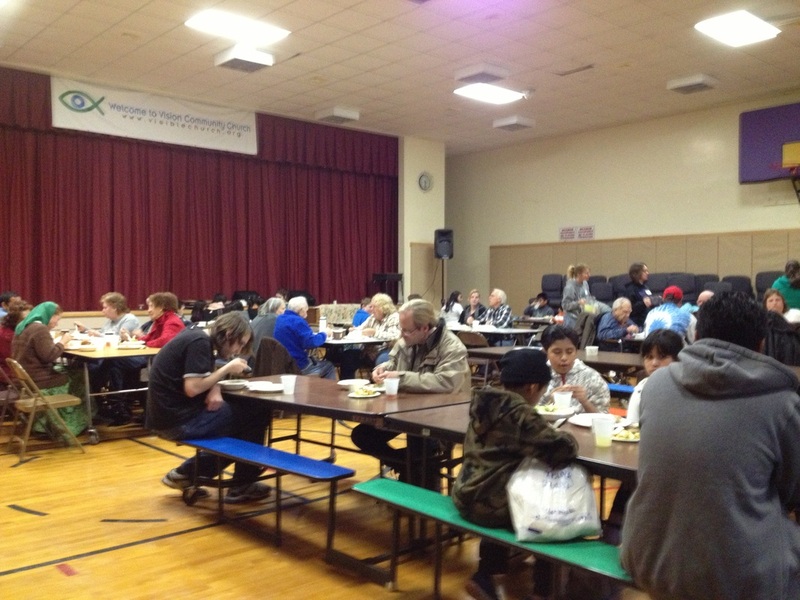 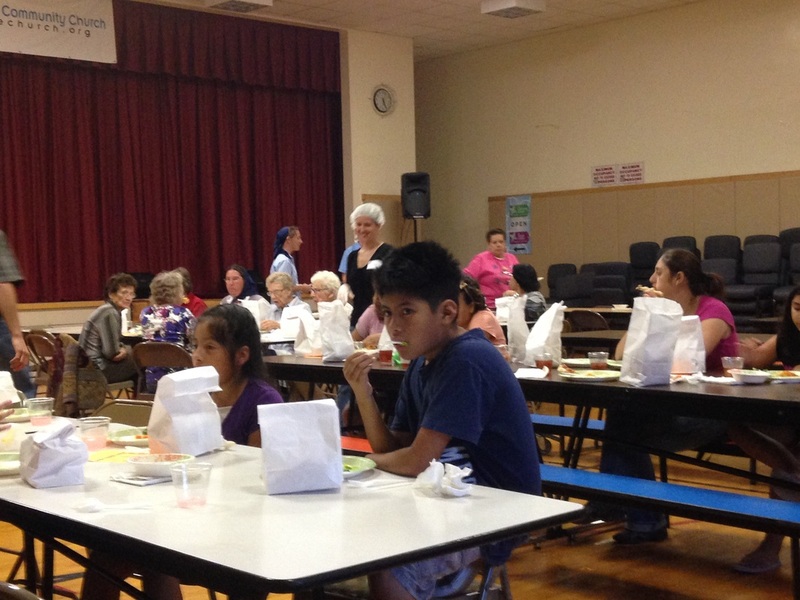 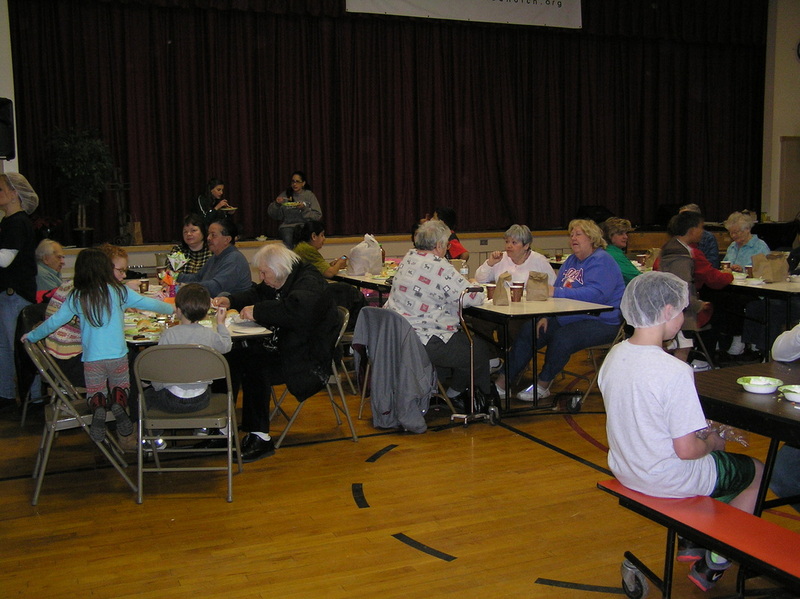 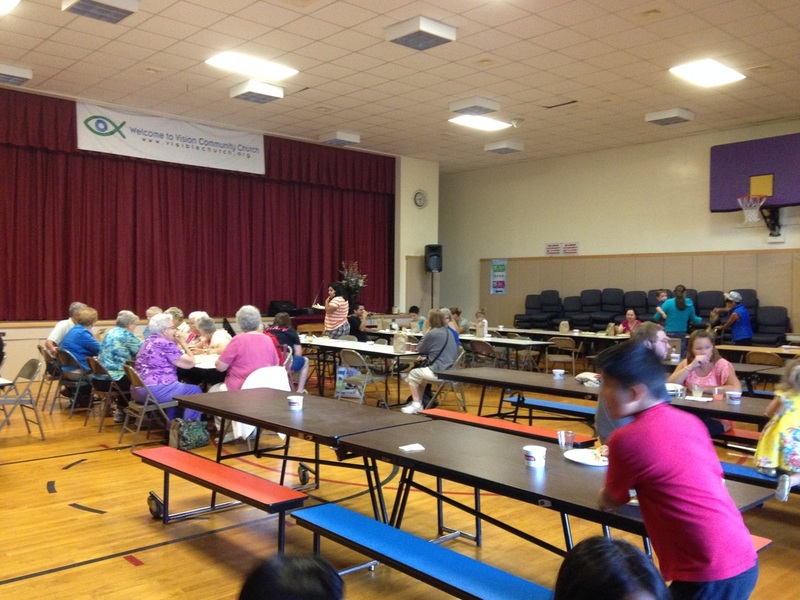 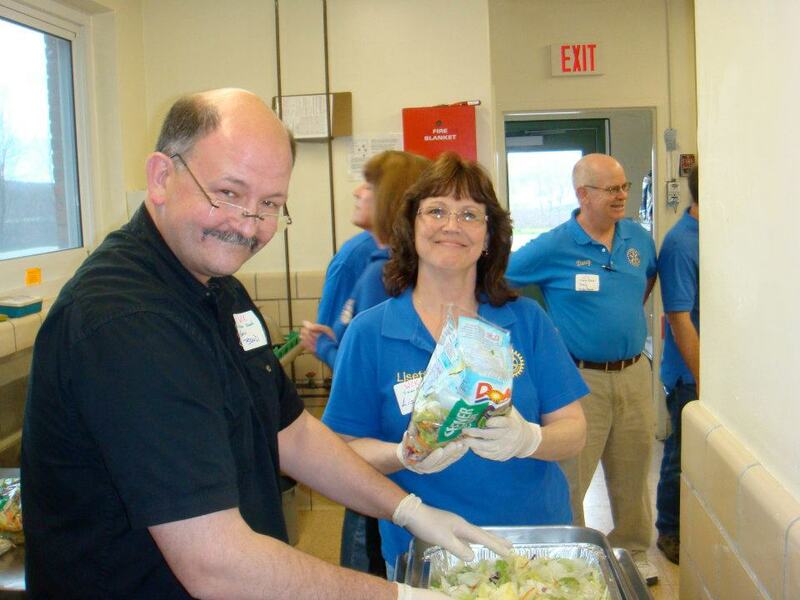 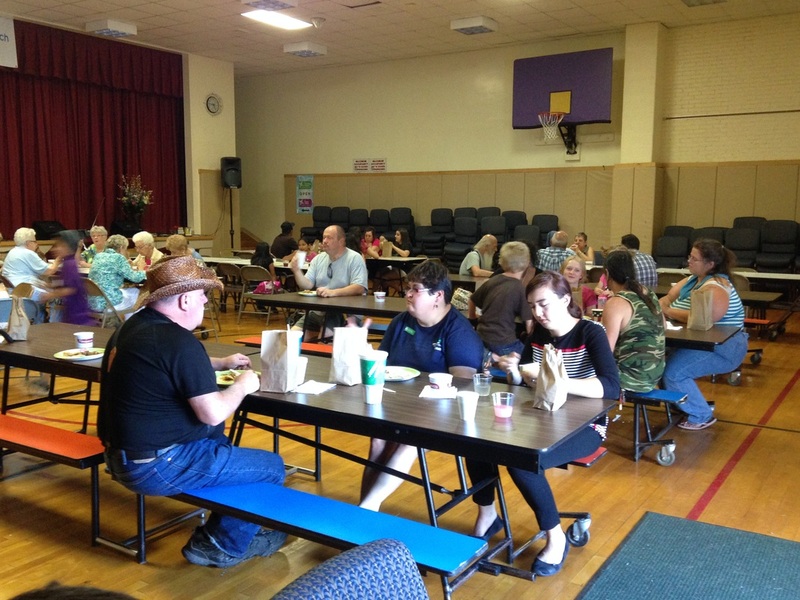 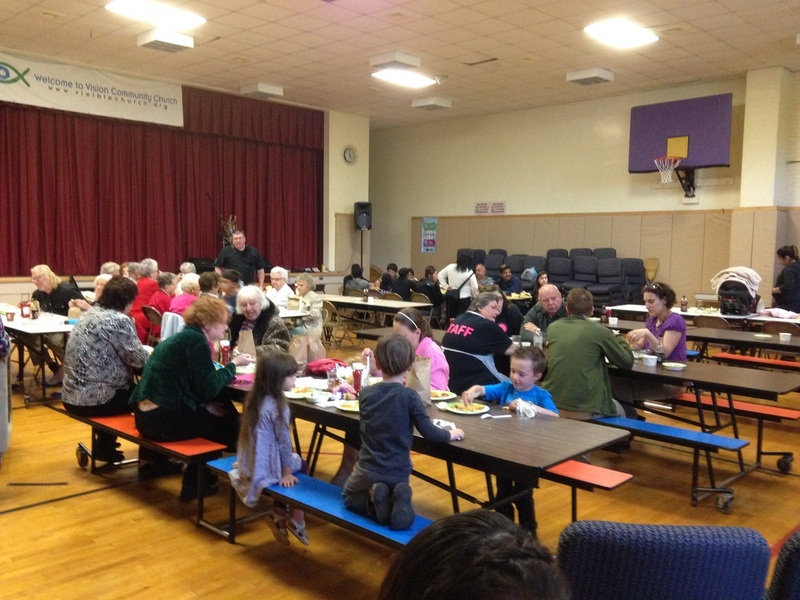 April 20, 2012 Dinner - Sponsored by Lora McDonald and Members of the Warwick Community. 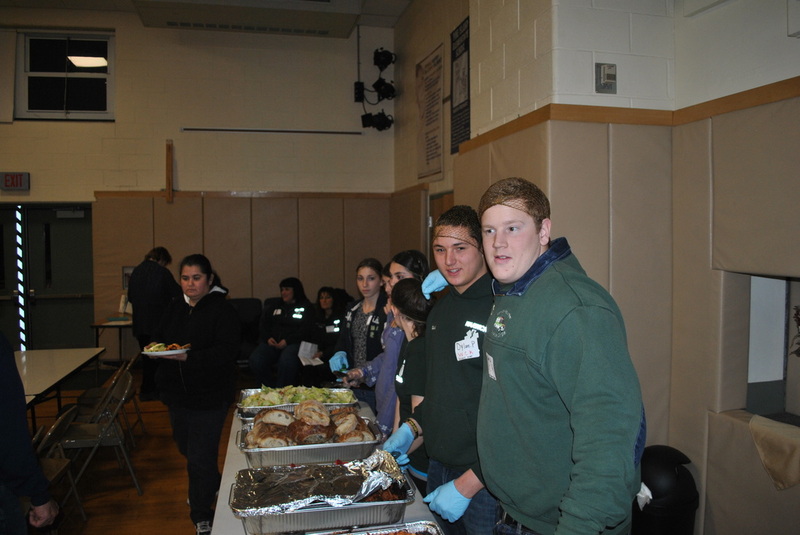 Servers at the buffet line. 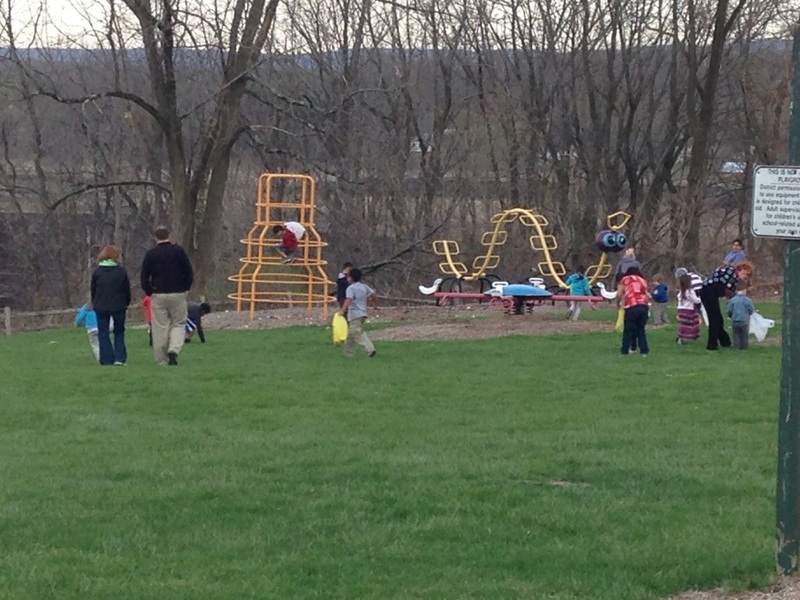 Everyone came out for the After Easter Egg Hunt. 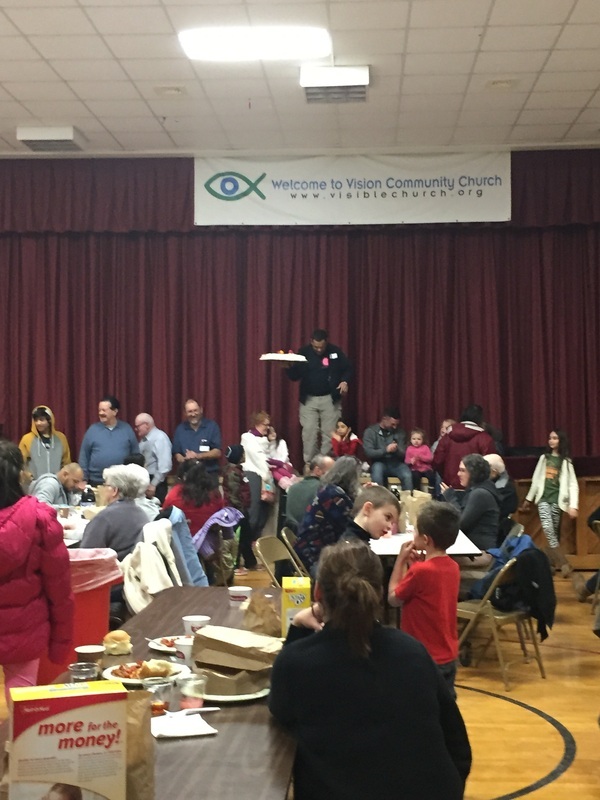 The search is over and everyone came back in for dessert. 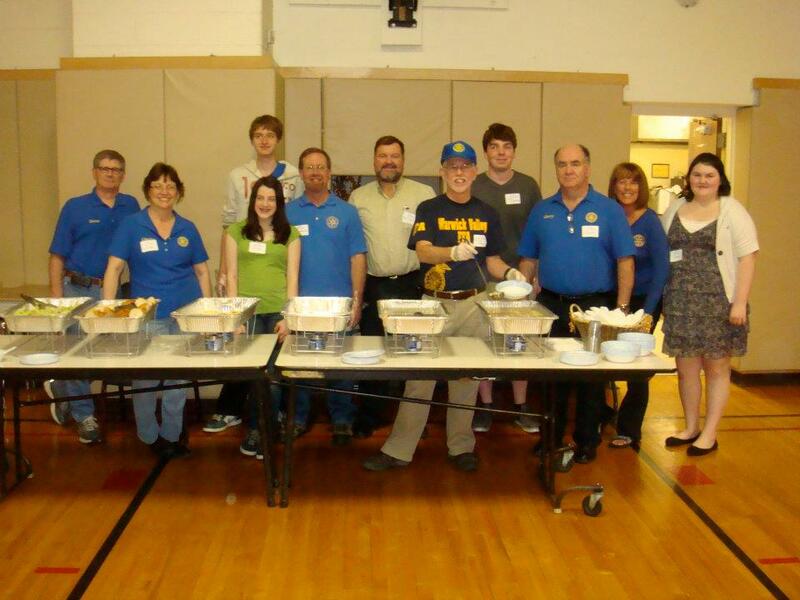 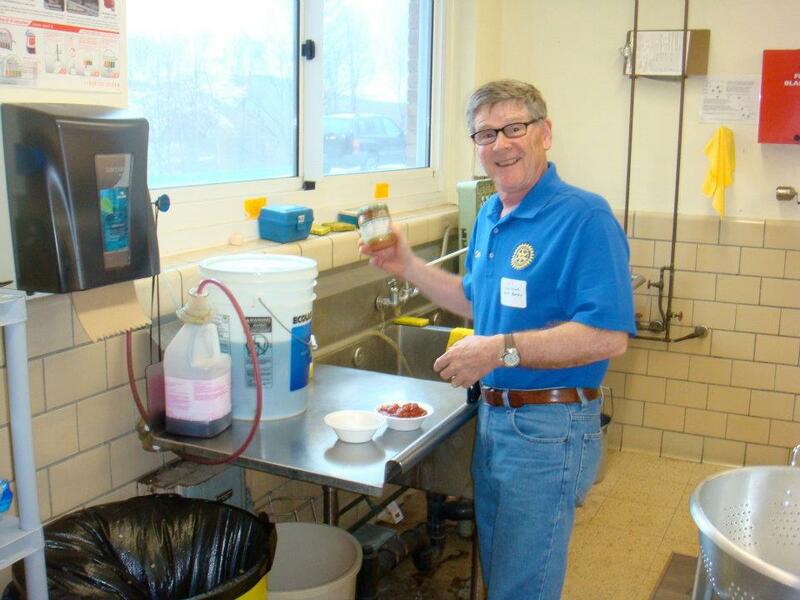 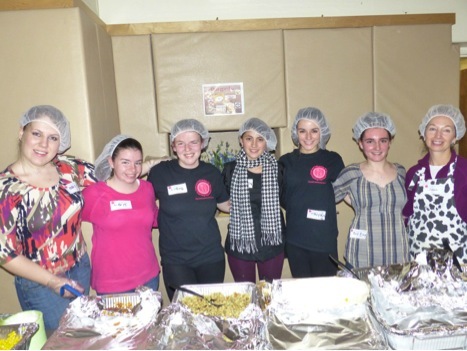 March 23, 2012 Dinner - Sponsored by the Interact Club of the Warwick Valley High School with help from the Warwick Rotary Club. 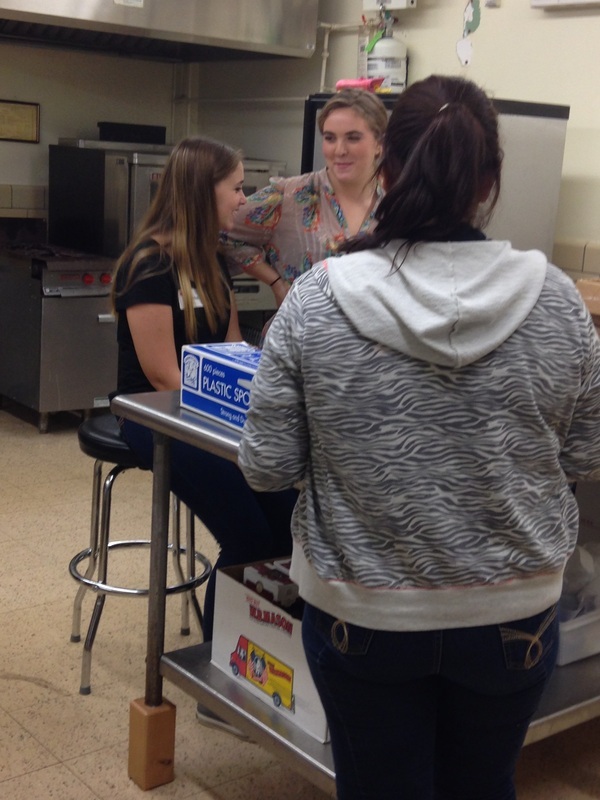 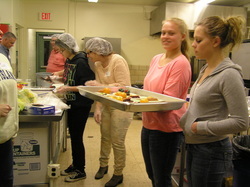 Members of the Interact Club preparing dinner. 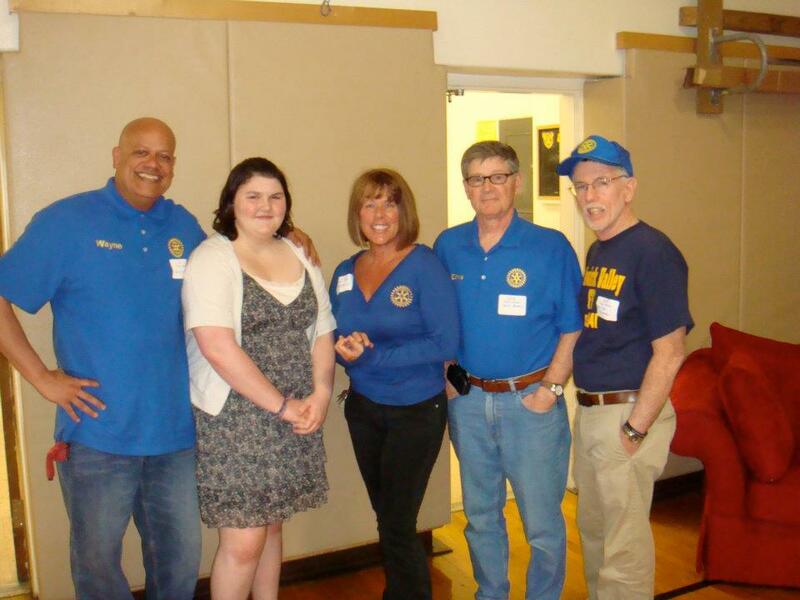 Victoria with member of the Interact Club and the Warwick Rotary Club. 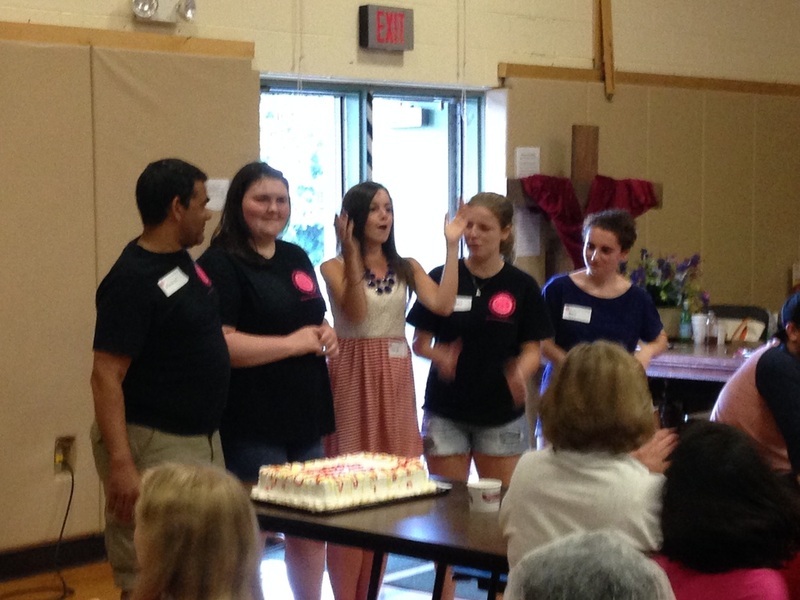 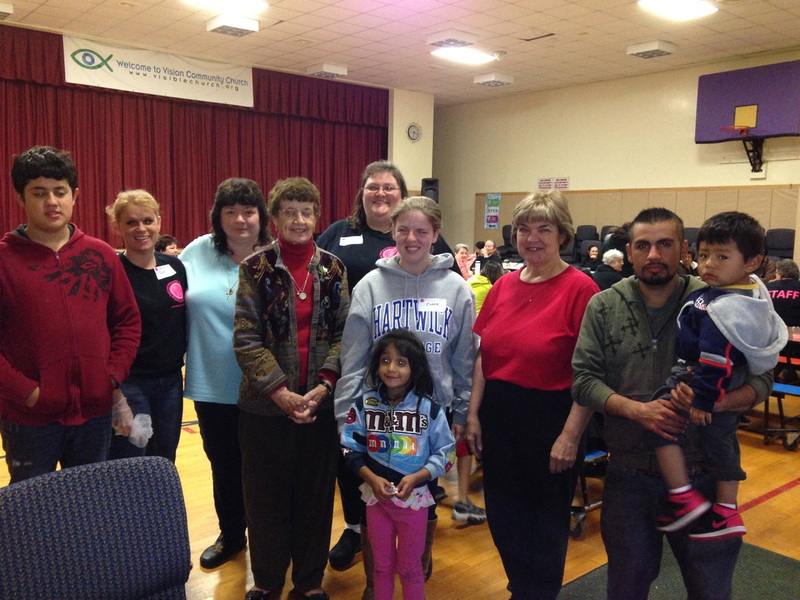 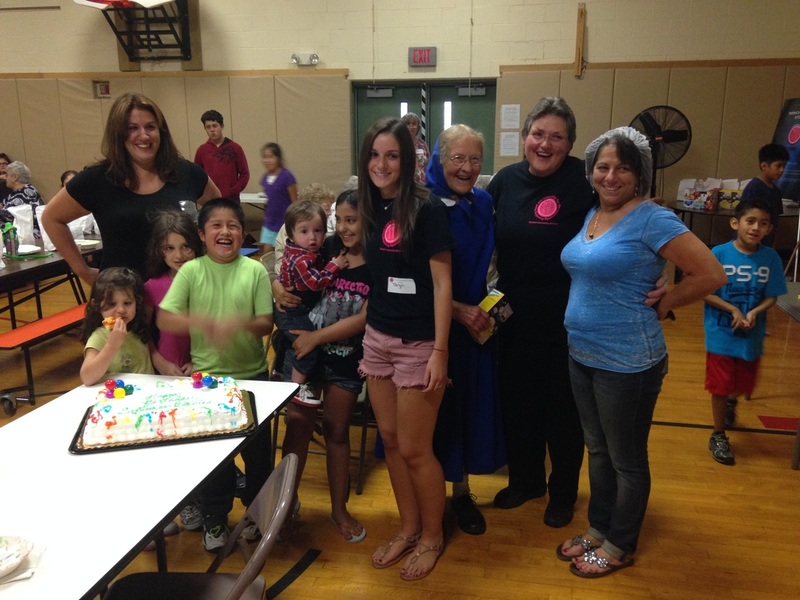 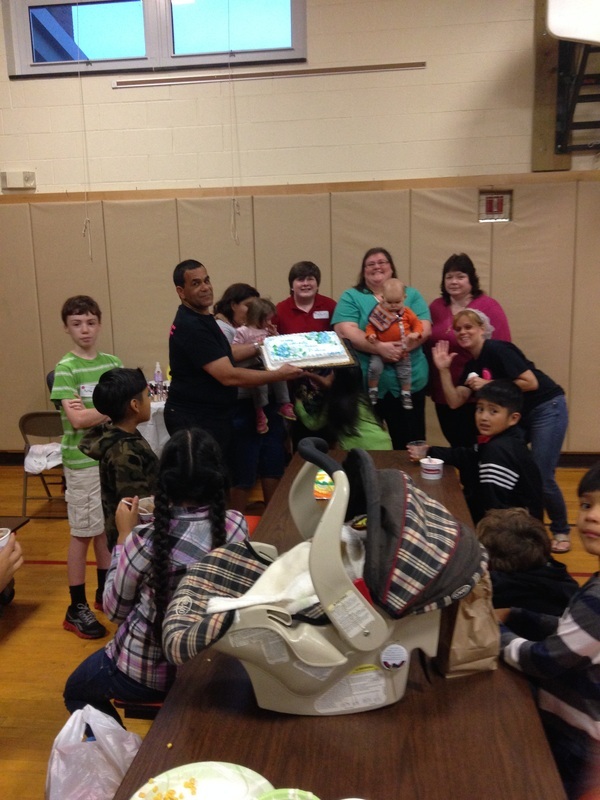 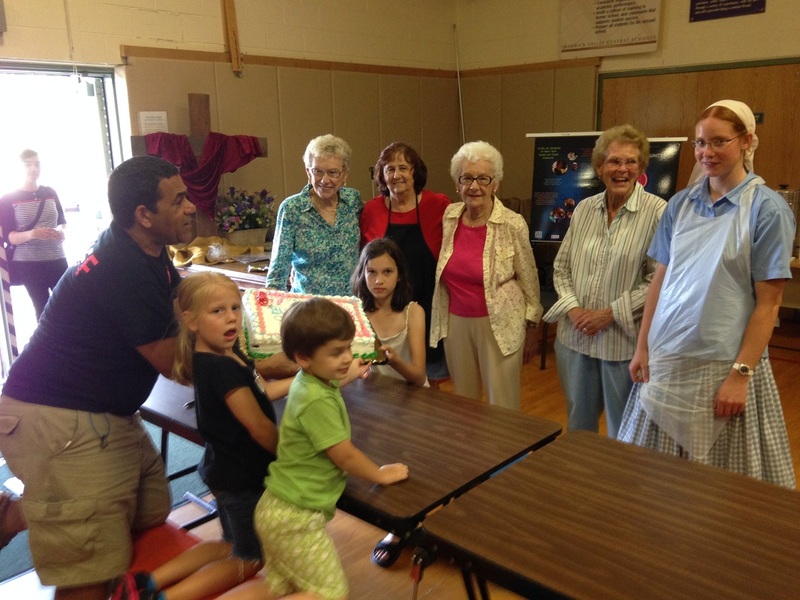 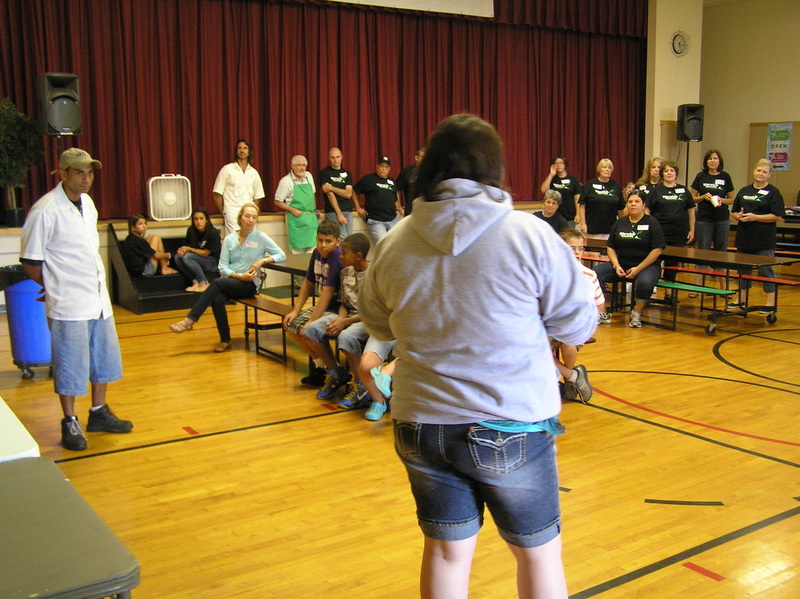 Victoria, Kelsey and the members of the Warwick United Methodist Church. 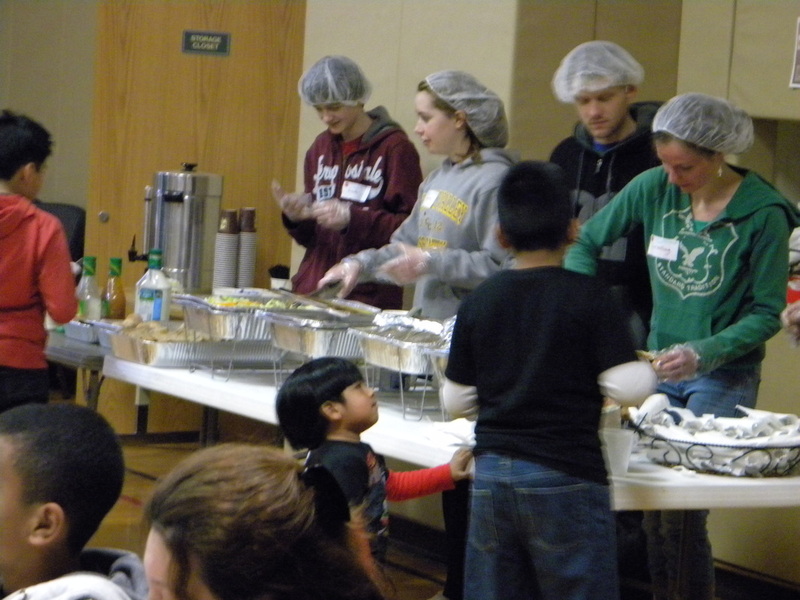 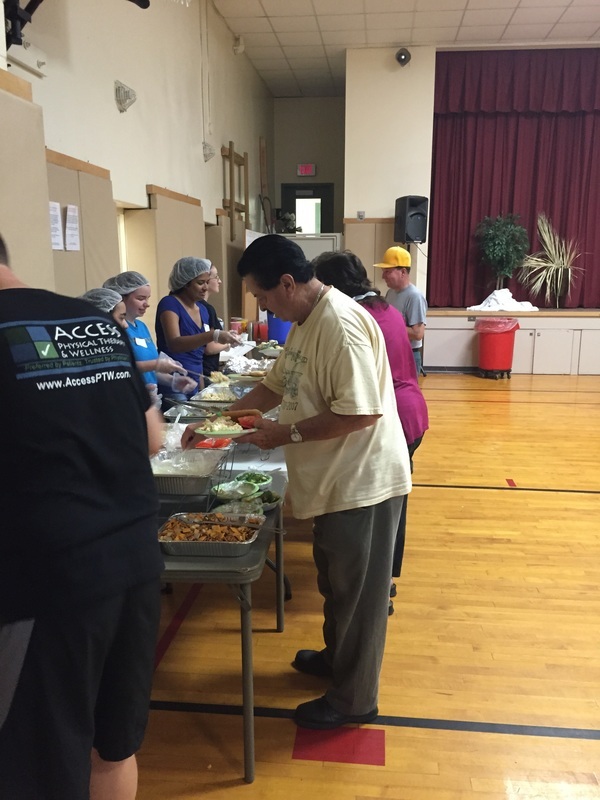 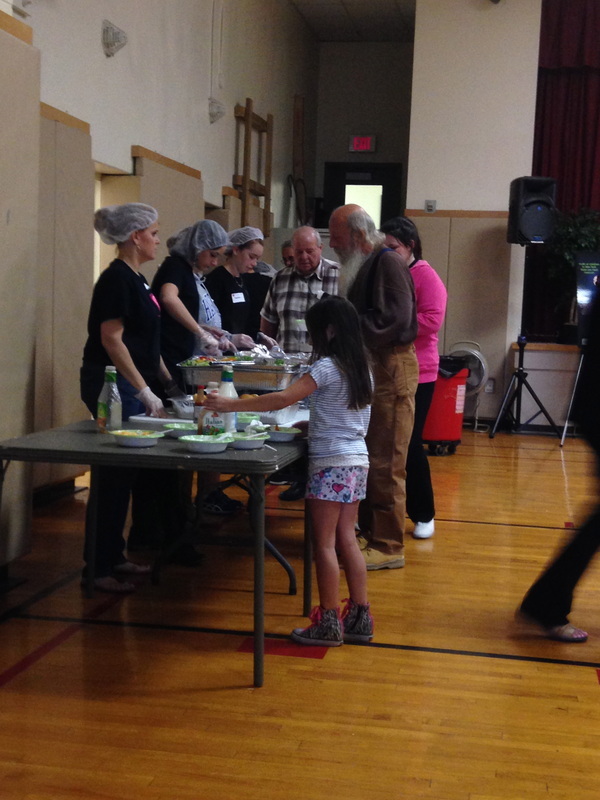 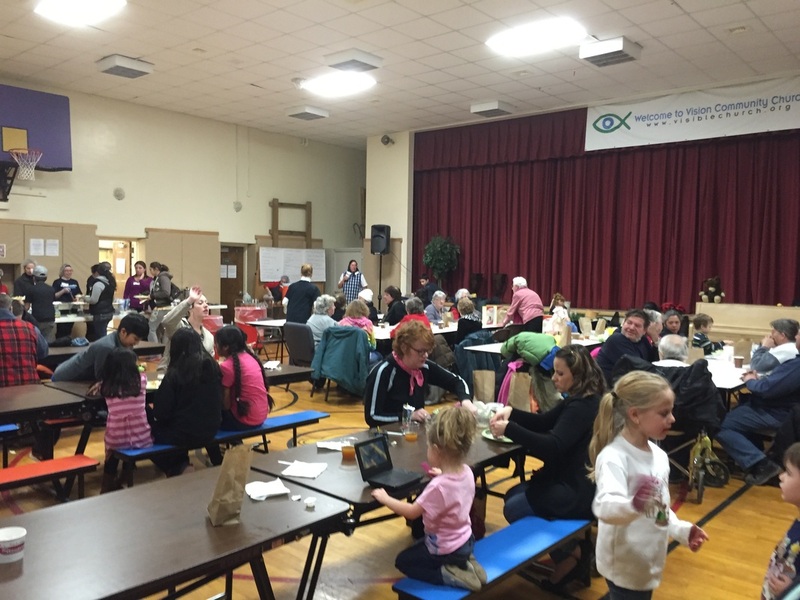 Volunteers serving dinner to our guests. 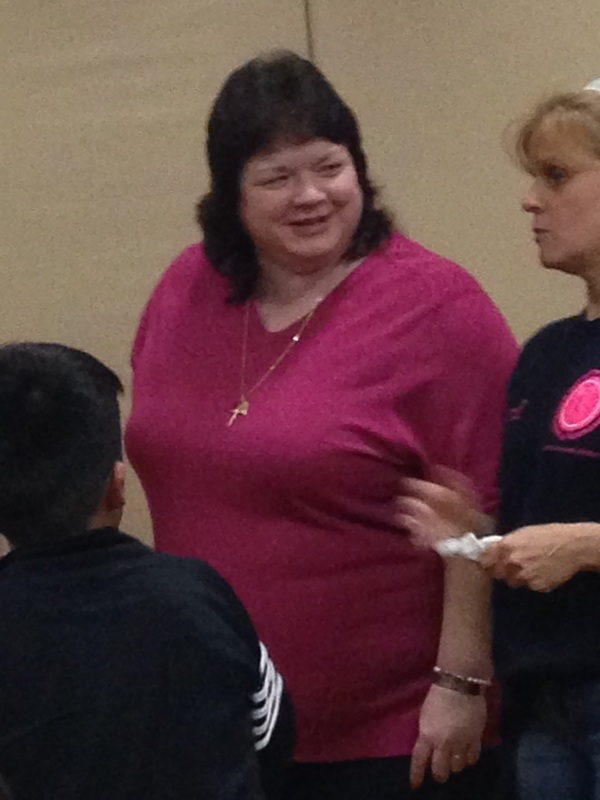 Roberta visiting with a guest. 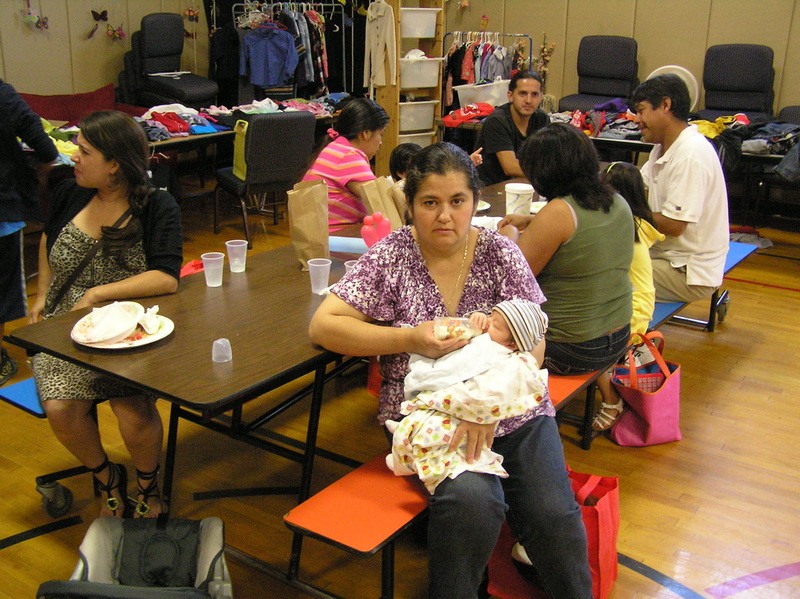 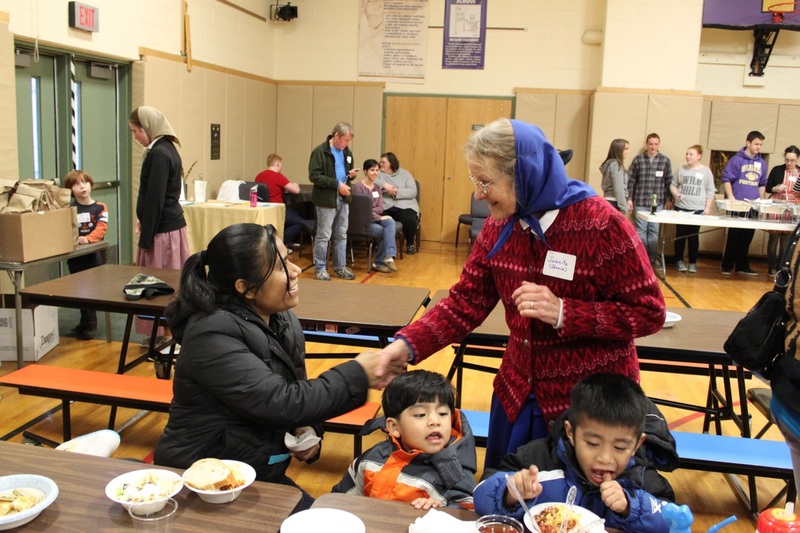 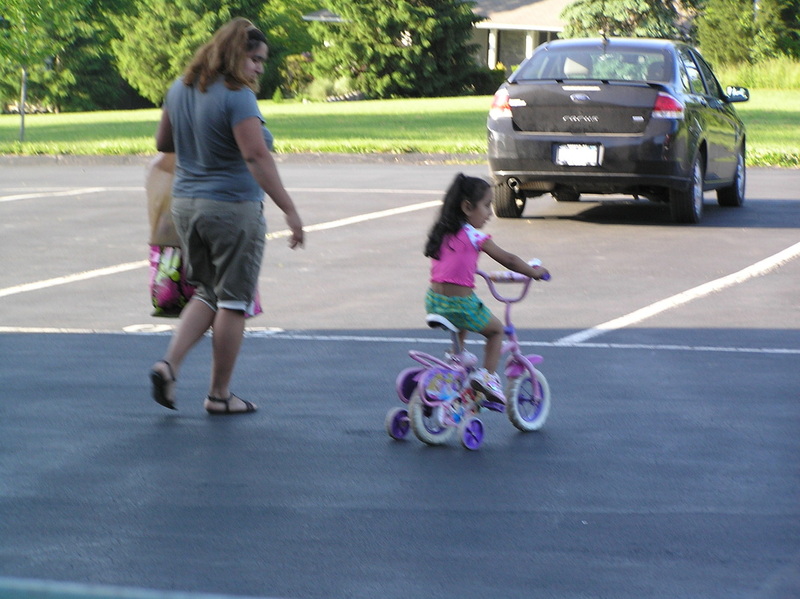 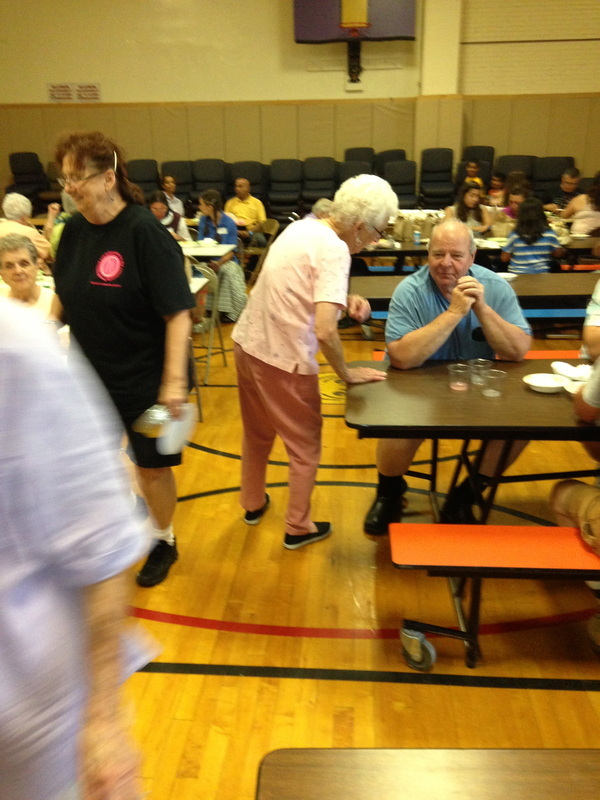 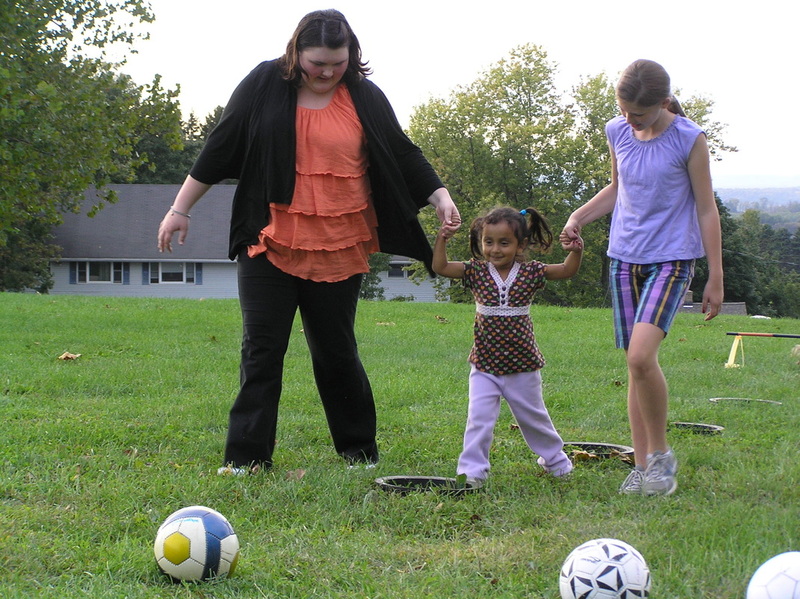 Jenny, a member of the Bellvale Community, visiting with guests. 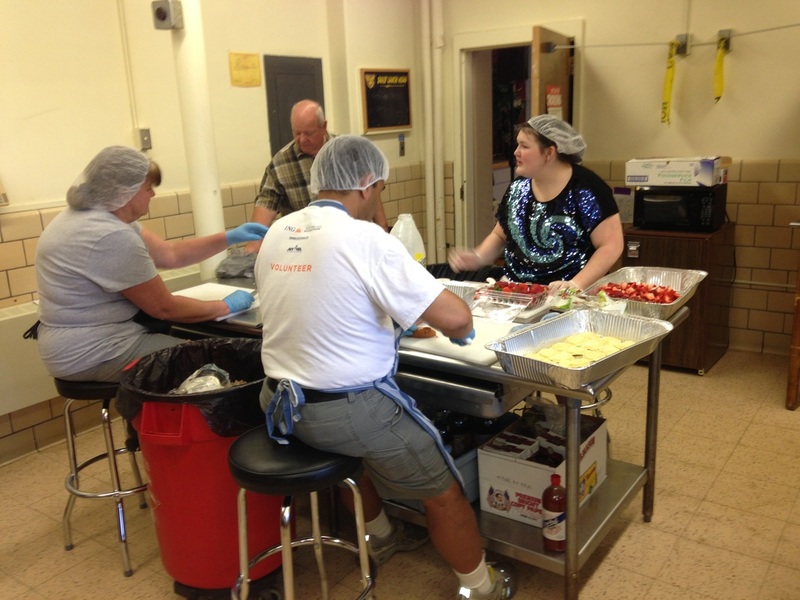 Chef David cutting the sausage for the sausage and peppers. 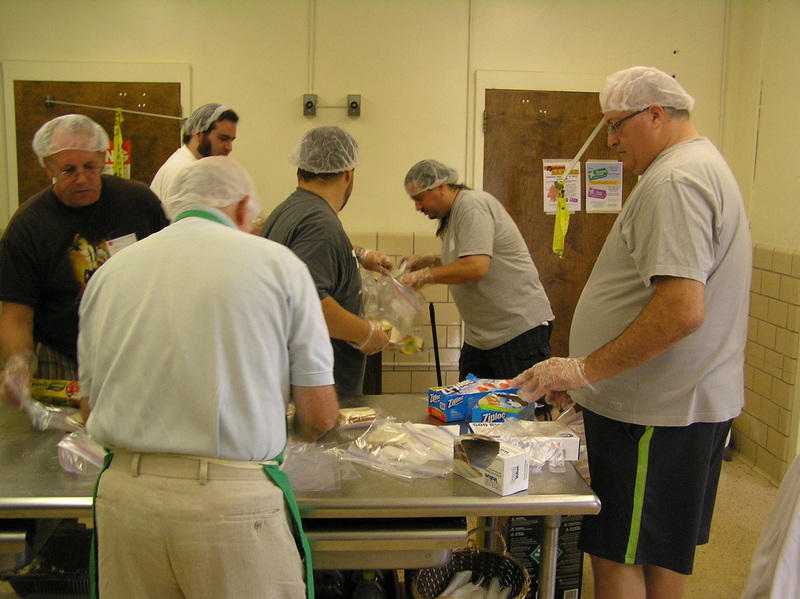 Volunteers cutting up the bread for dinner. 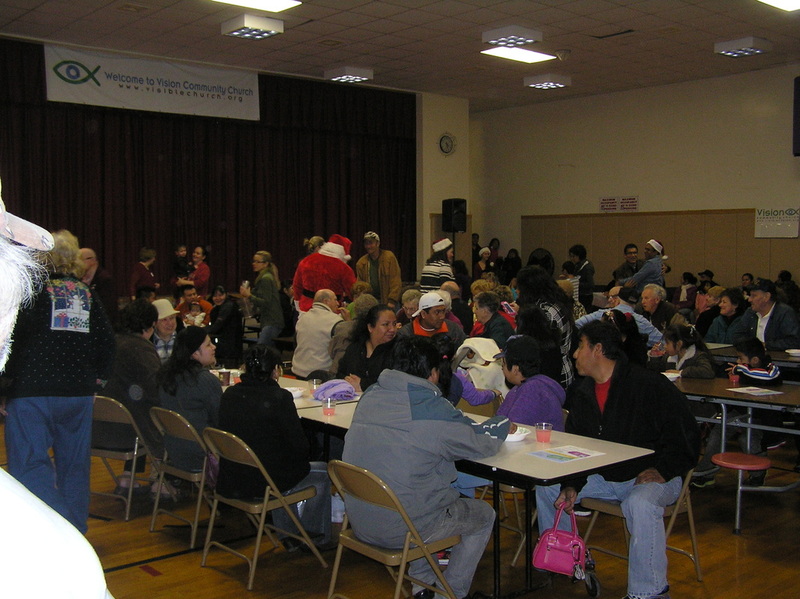 Volunteers waiting for the guests to arrive. 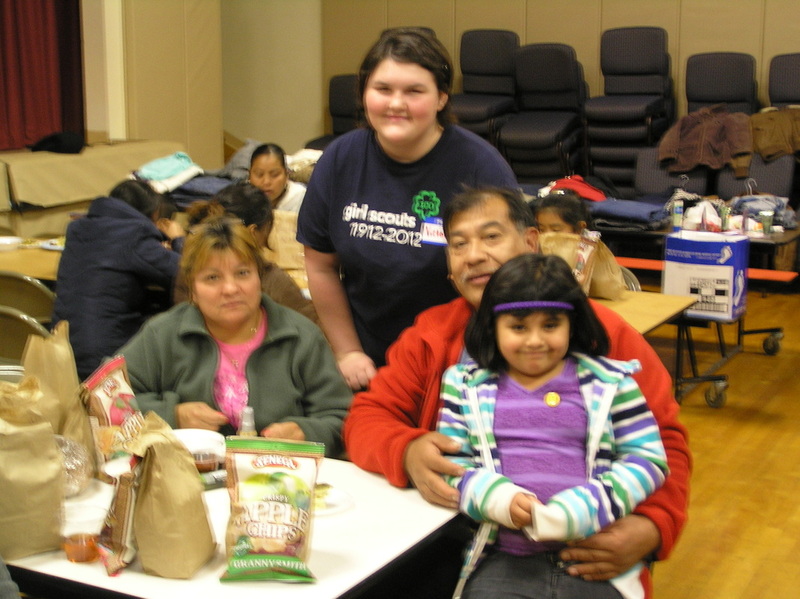 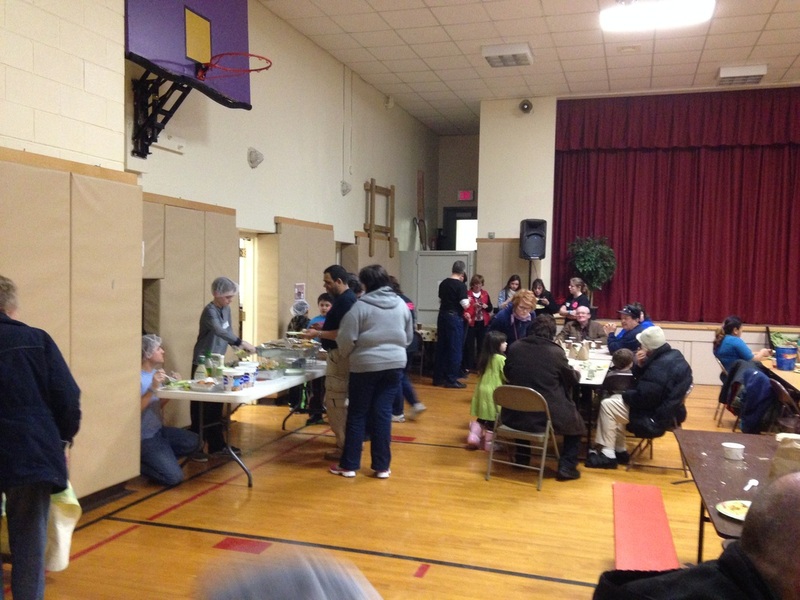 Members of Vision Community Church who run the clothing and coat bank which is available during the dinners. 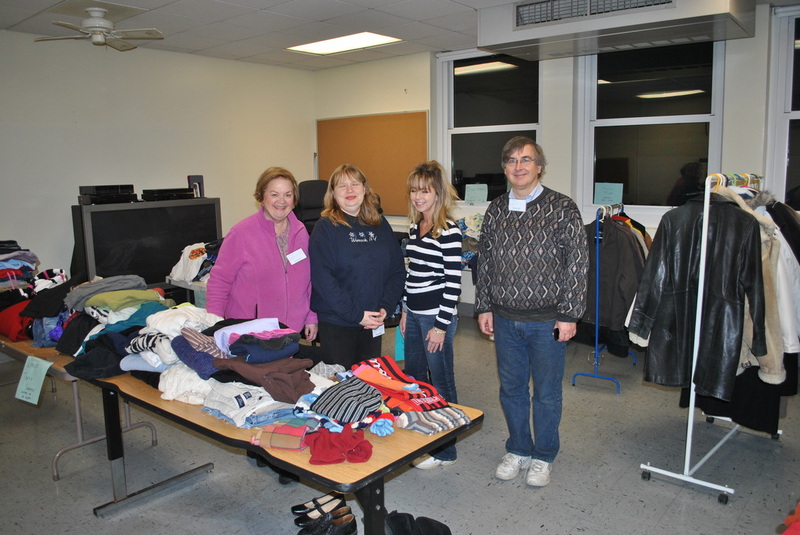 Guests shopping at the clothing and coat bank. 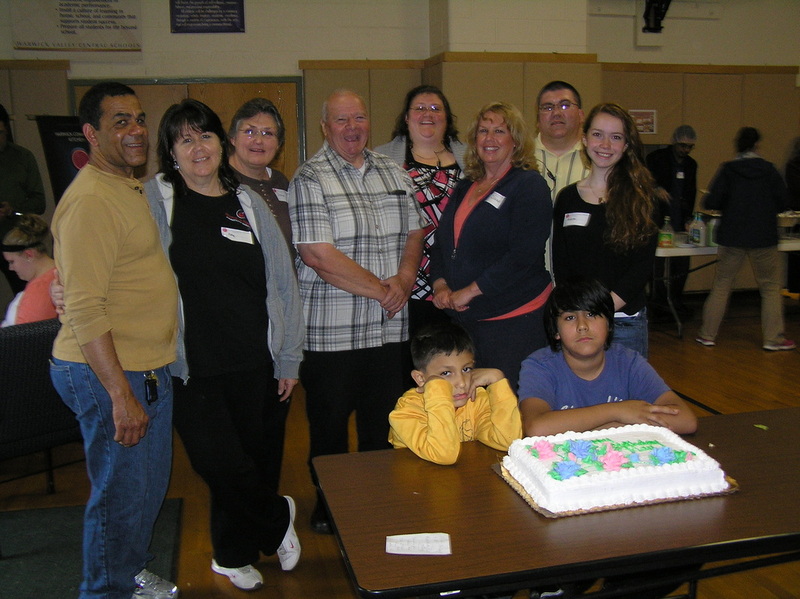 Senor Andy Sheets (center) is one of the Spanish Language teachers at the Warwick Middle School. 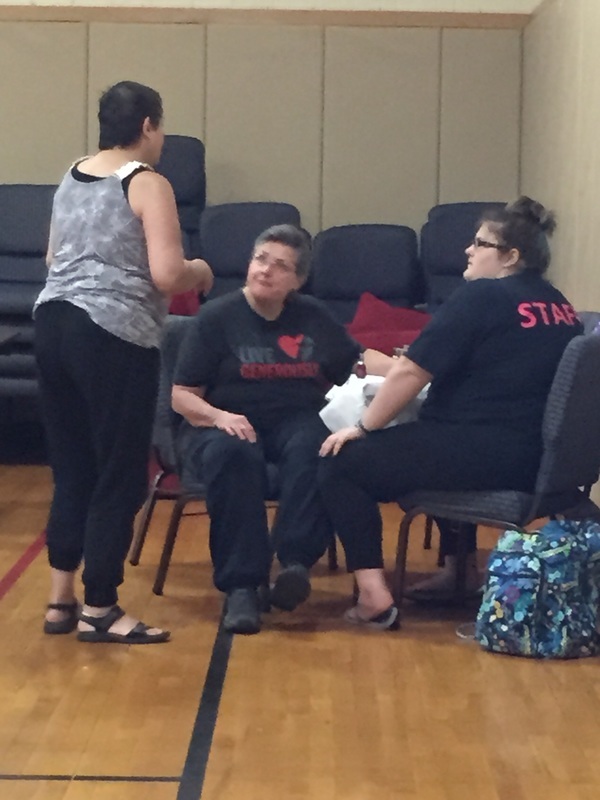 Here, Senor Sheets is assisting two of the Spanish Language students who volunteer to come and speak with our guests and help translate when necessary. 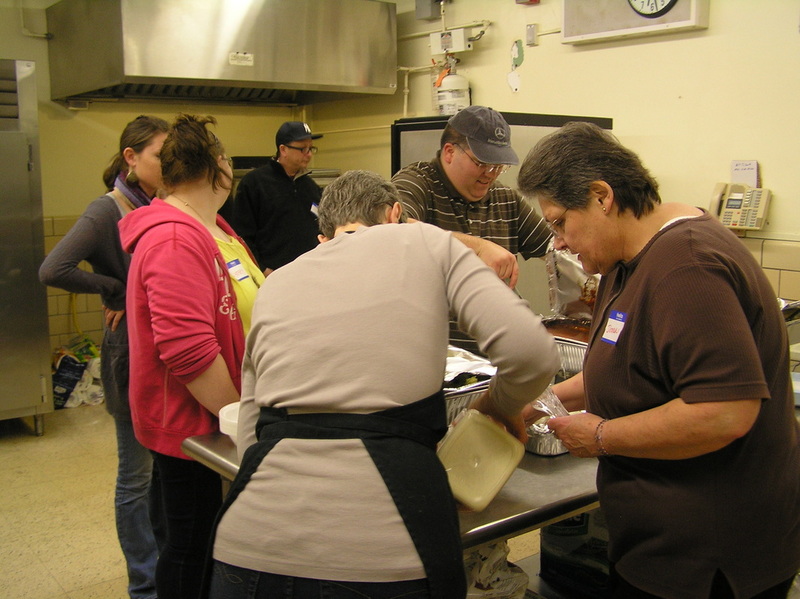 Volunteers cooking the turkey dinner at the Sugar Loaf Fire House. 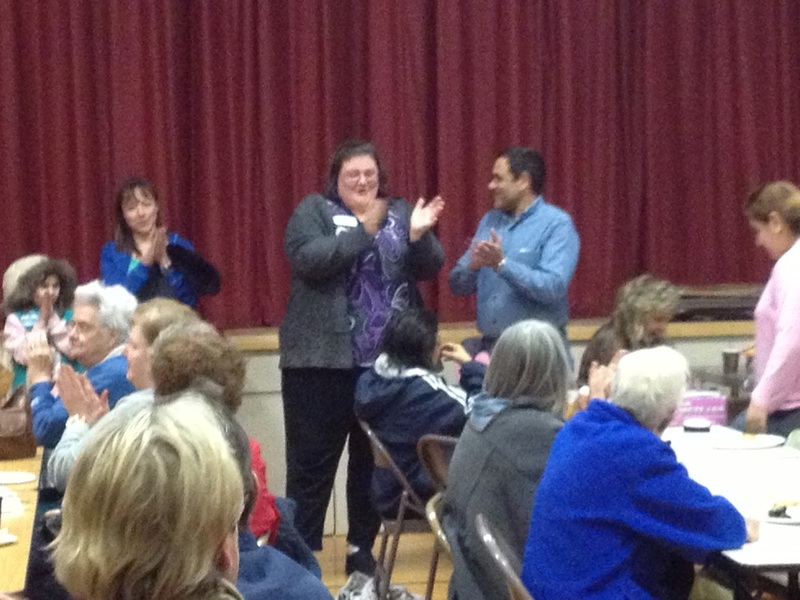 Victoria meeting with the volunteers prior to the dinner beginning. 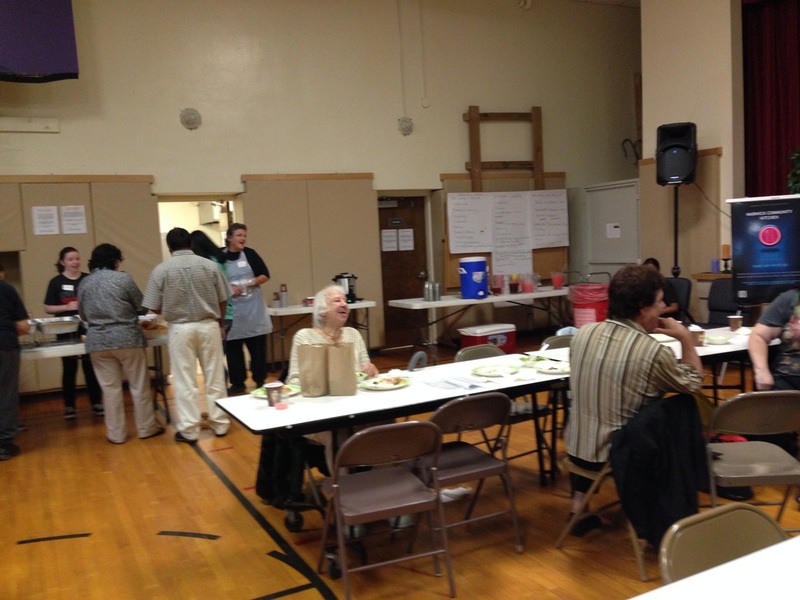 Guests have begun to arrive for dinner. 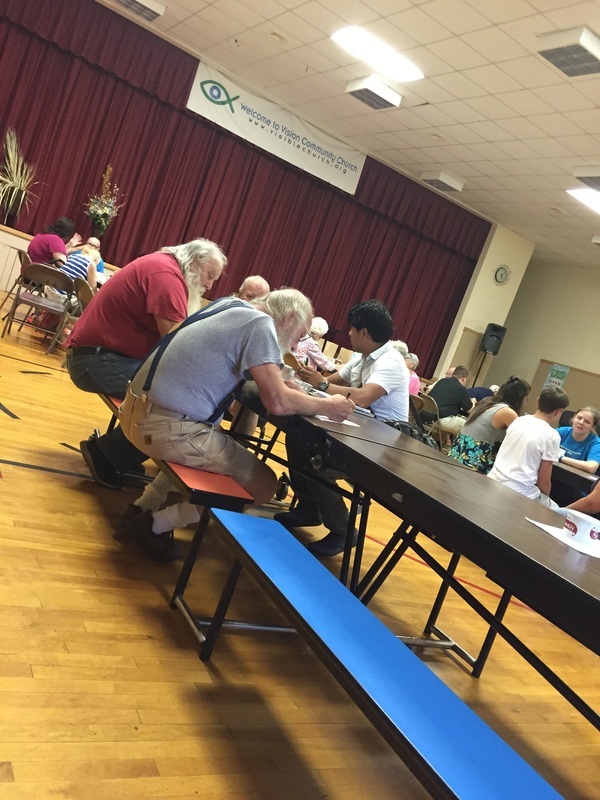 There was live entertainment for them while they ate. 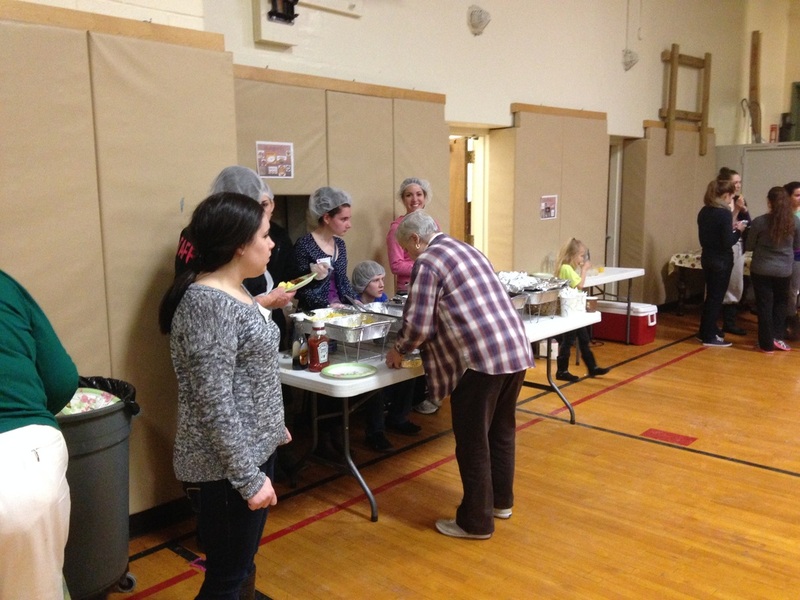 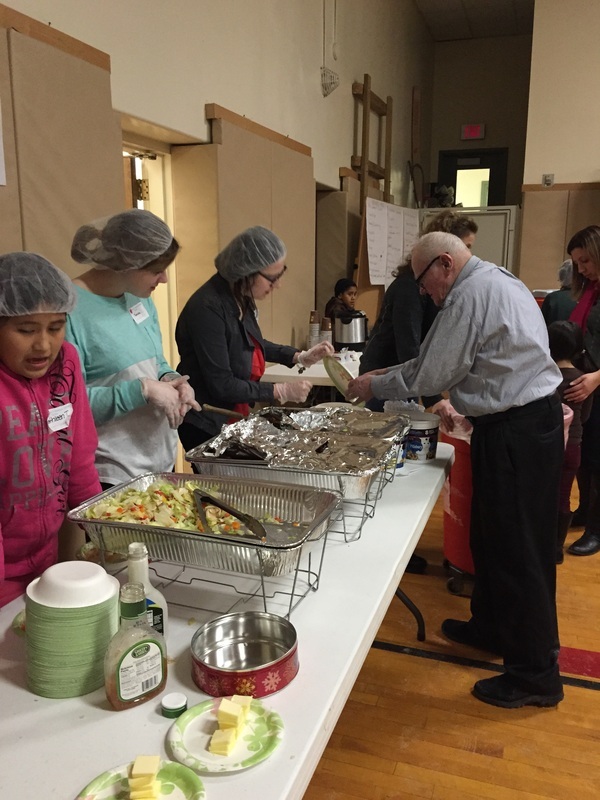 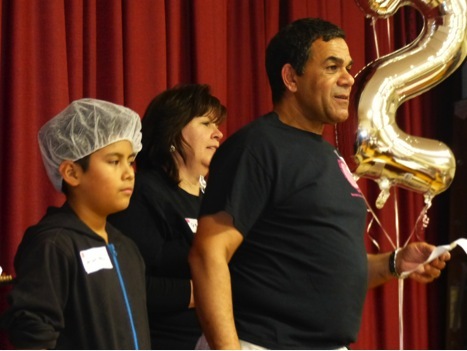 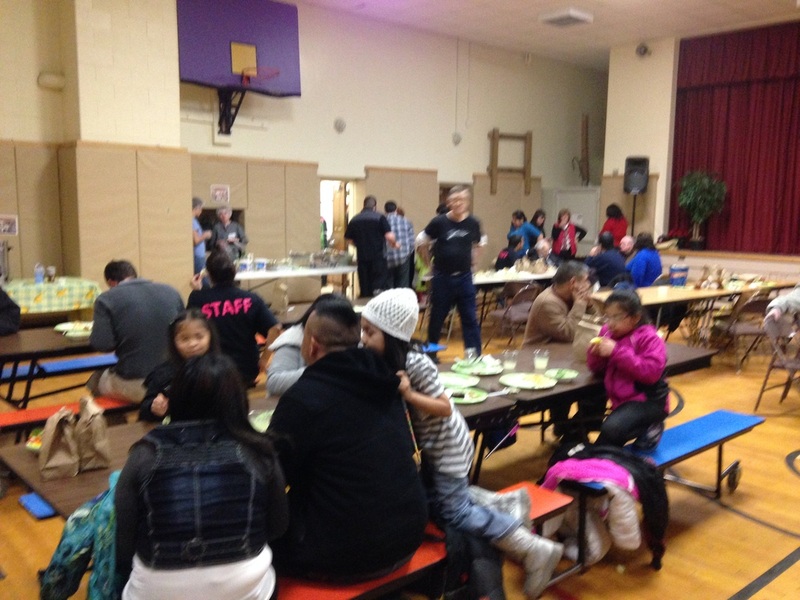 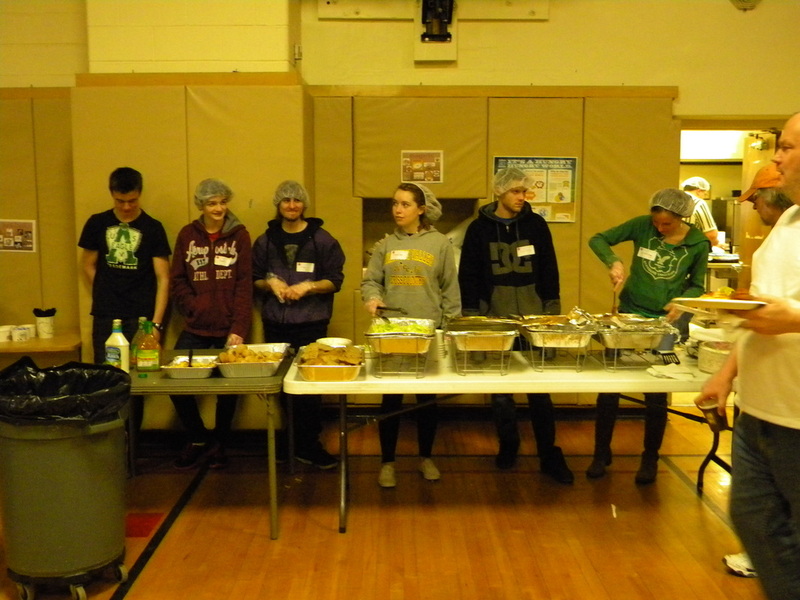 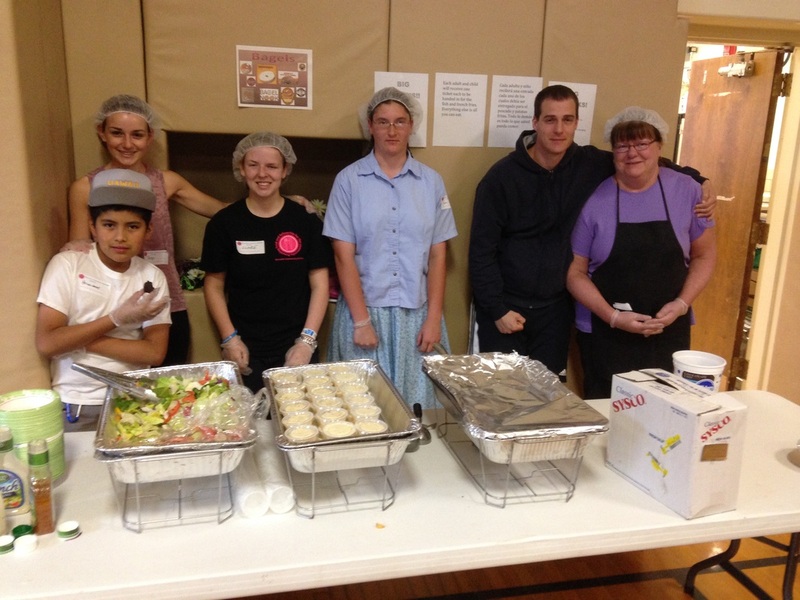 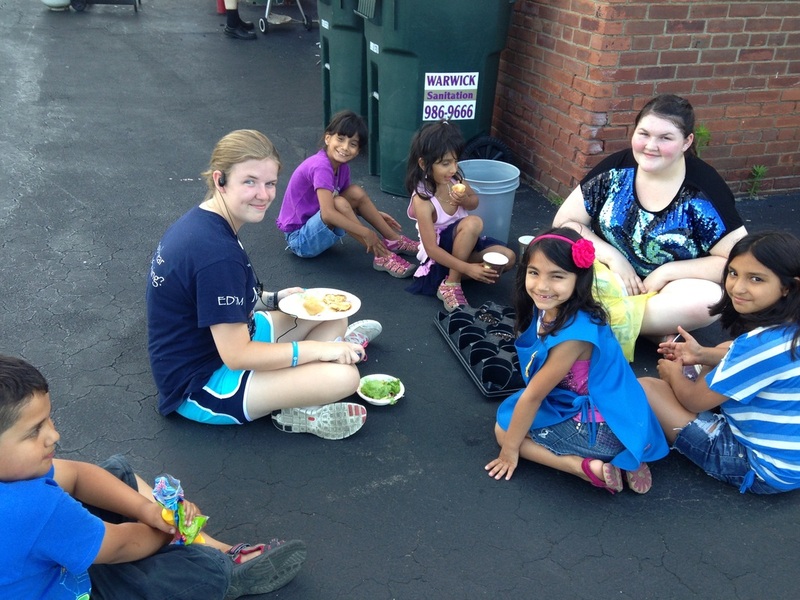 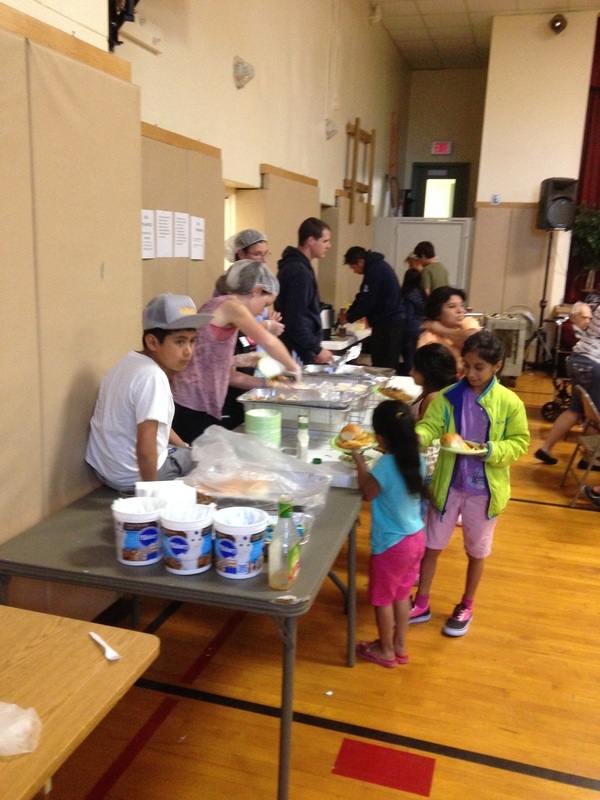 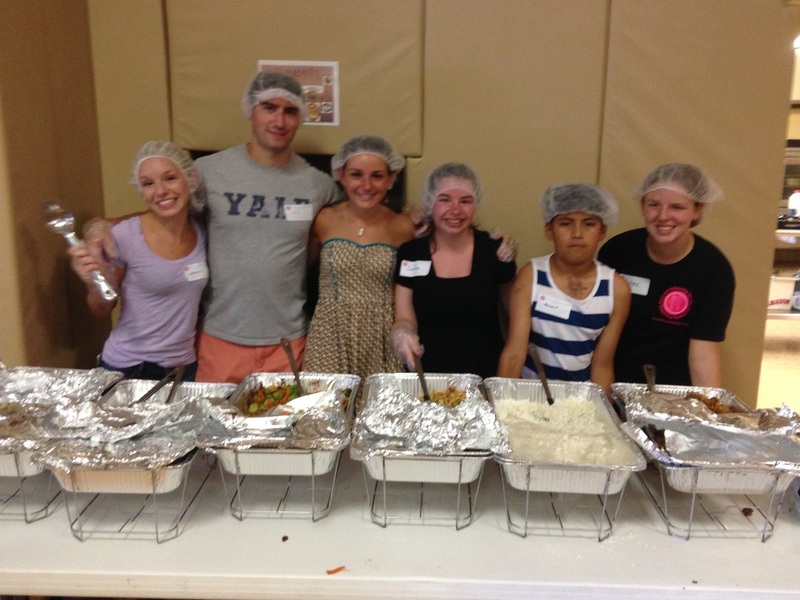 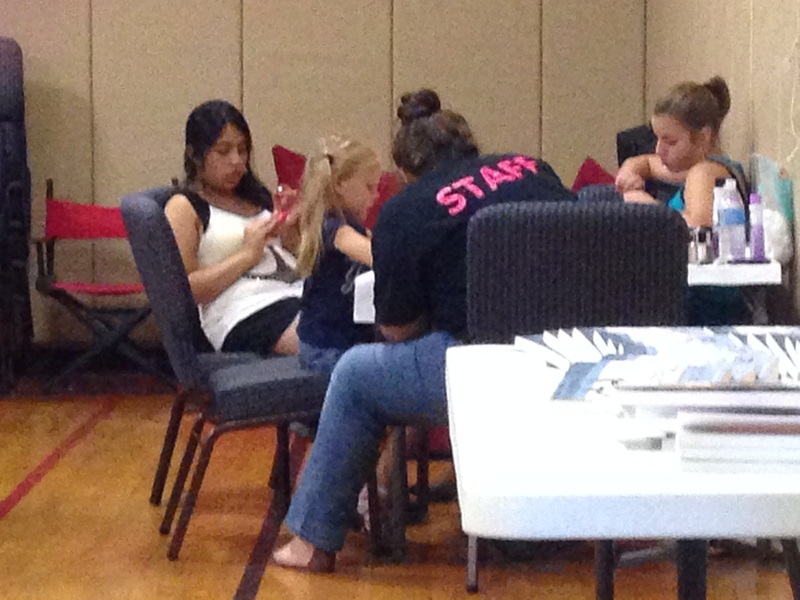 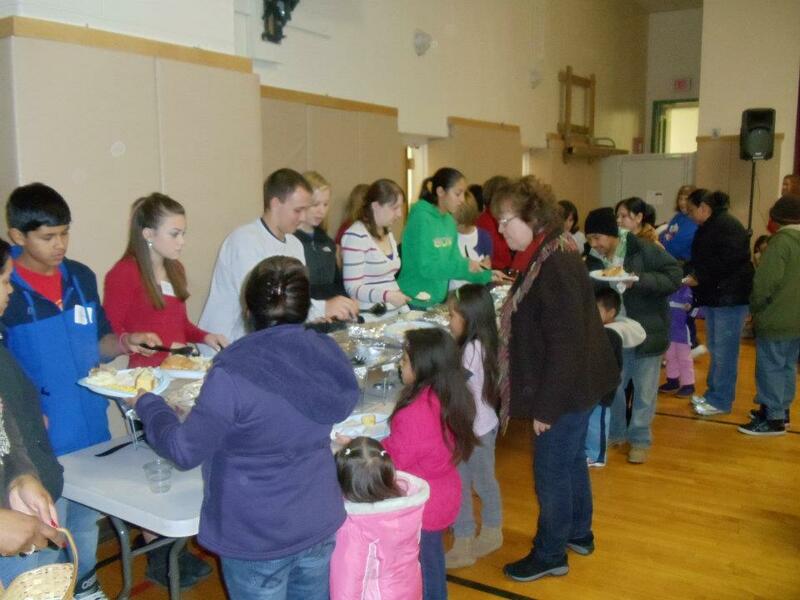 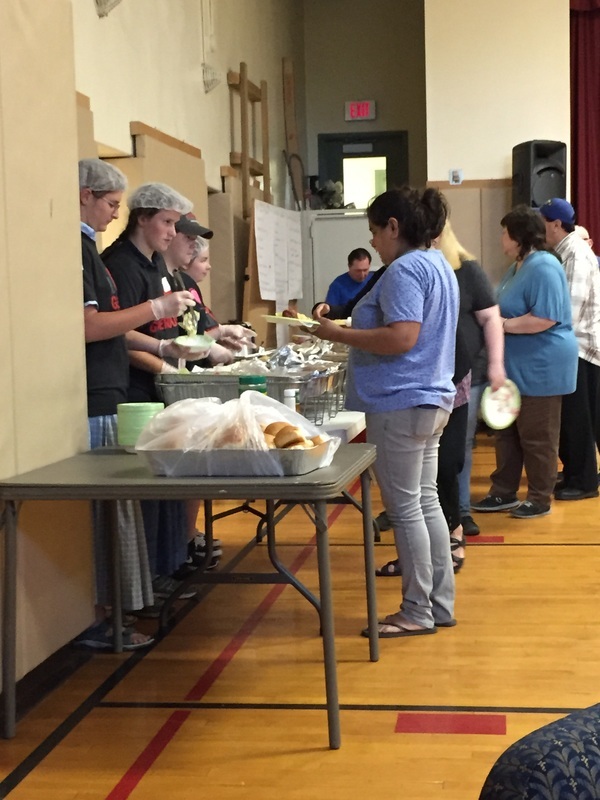 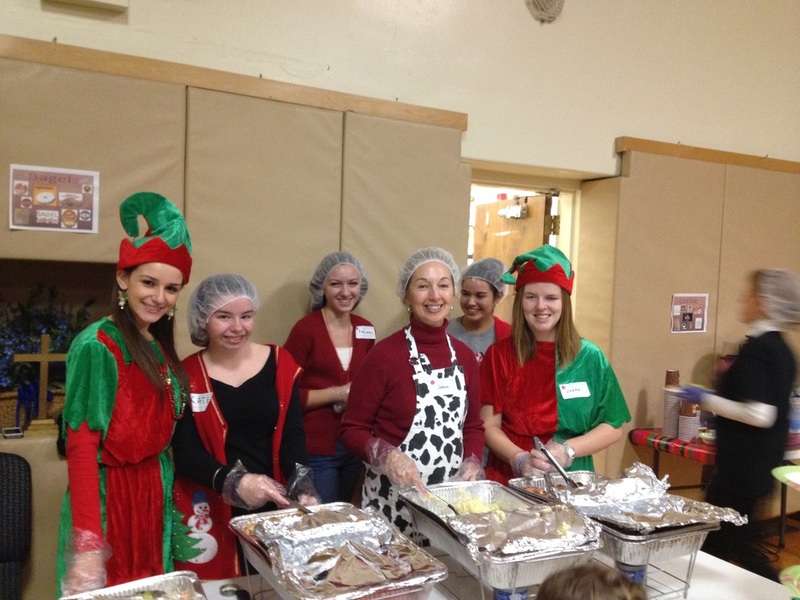 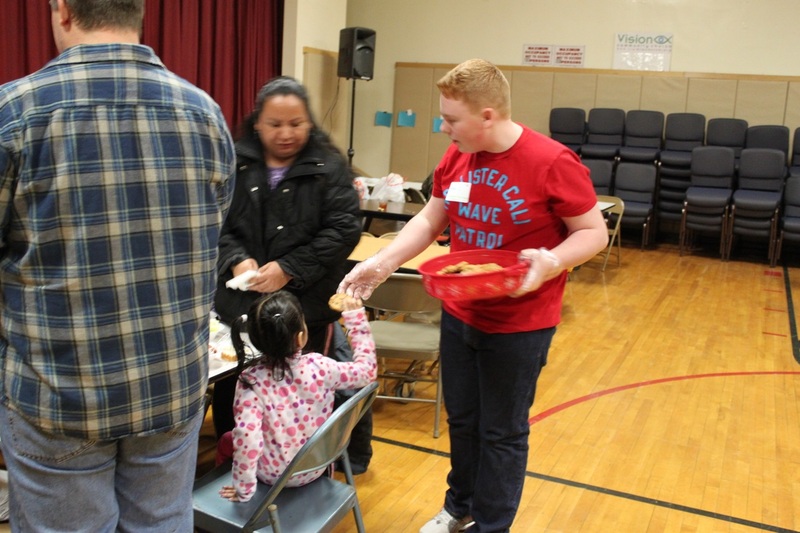 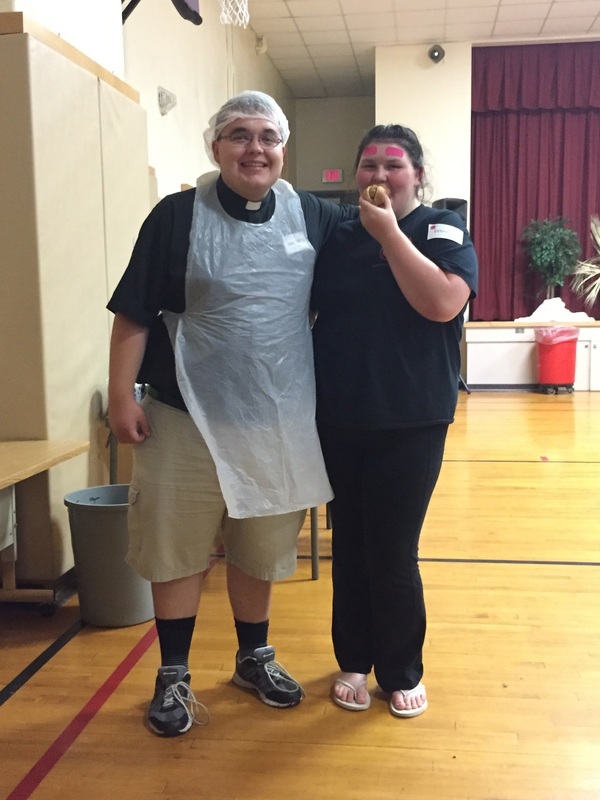 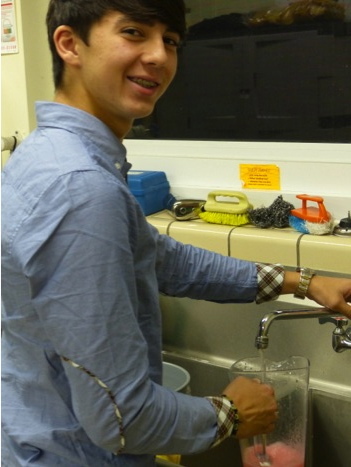 We had many youth volunteers to serve dinner to our guests. 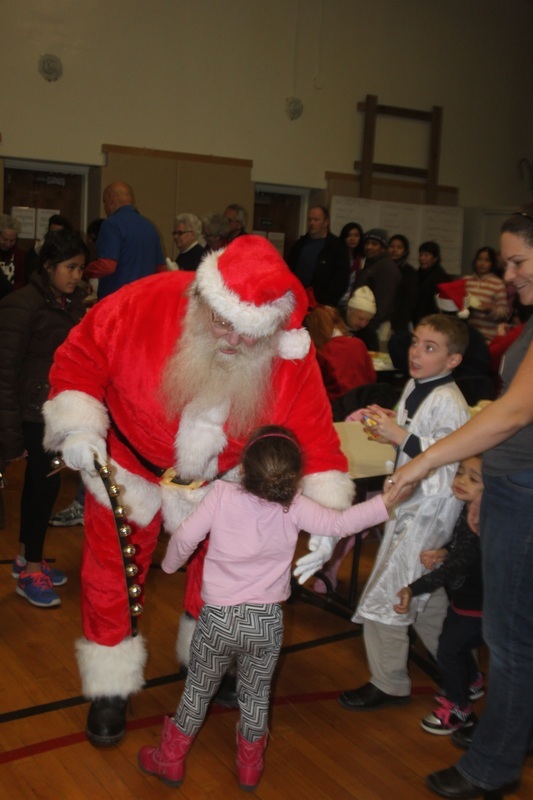 Santa Claus came to deliver toys to the children. 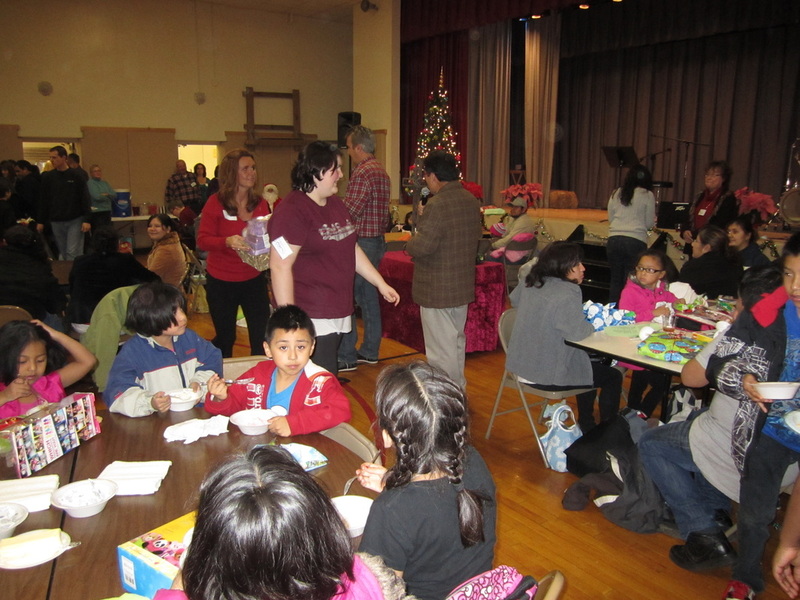 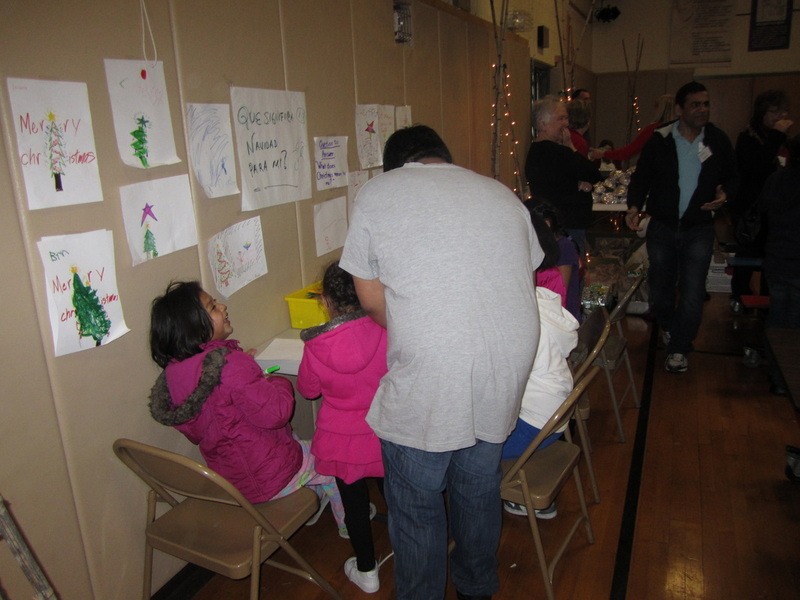 There was a craft table set up for the children to draw a picture to answer the question, "What does Christmas mean to me?" 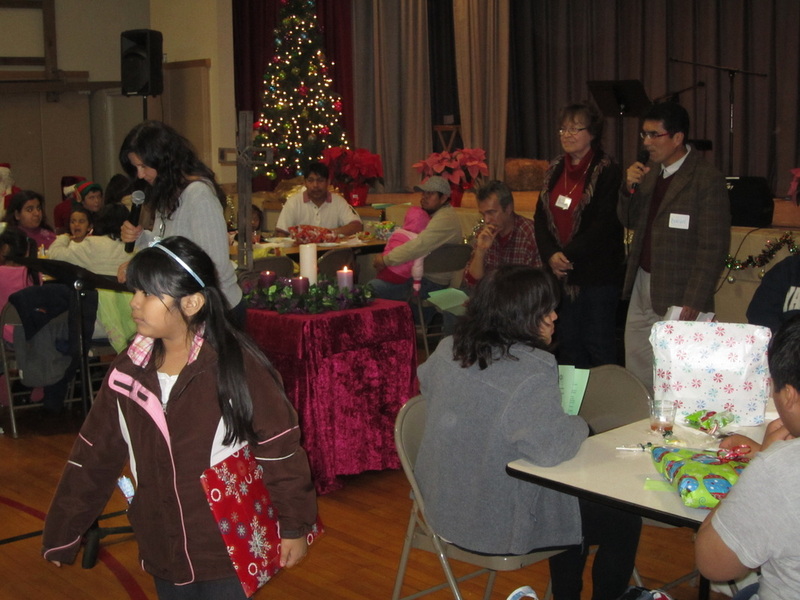 Pam Heatley started the Christmas Service with a prayer and Bible reading with the assistance of Enrique and Sonia for translation to Spanish. 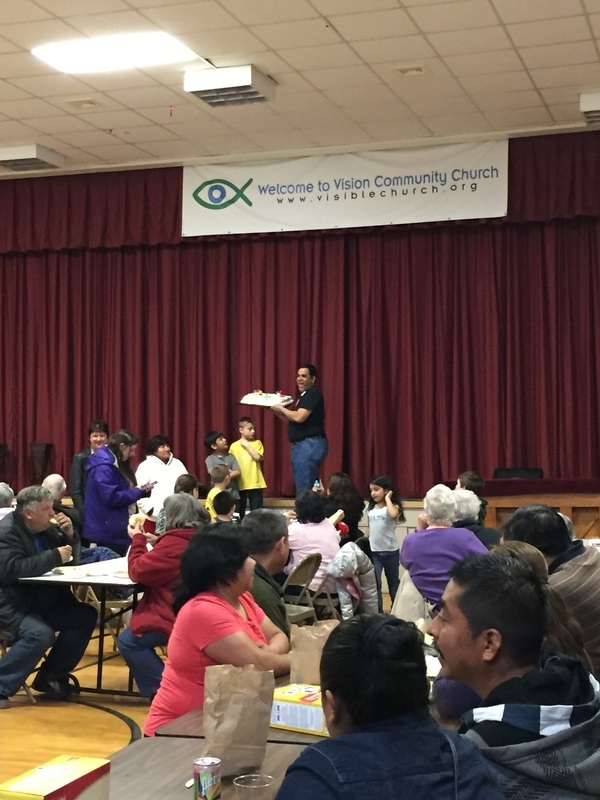 Pastor Don Heatley giving the sermon with the assistance of Enrique. 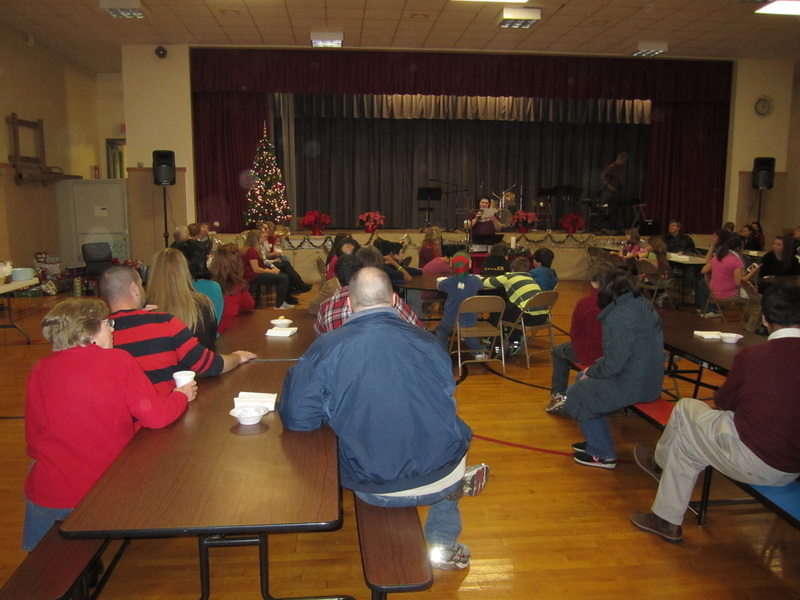 We finished the service singing "Silent Night" to candlelight. 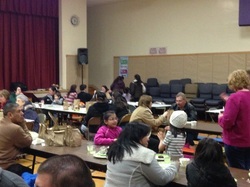 98 guests came for dinner. 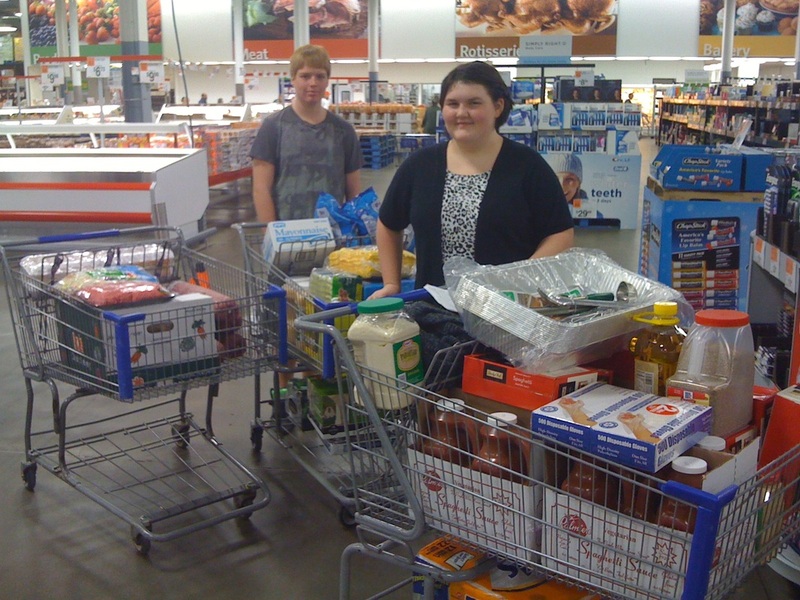 Victoria and Jonathan shopping at SAM's Club. 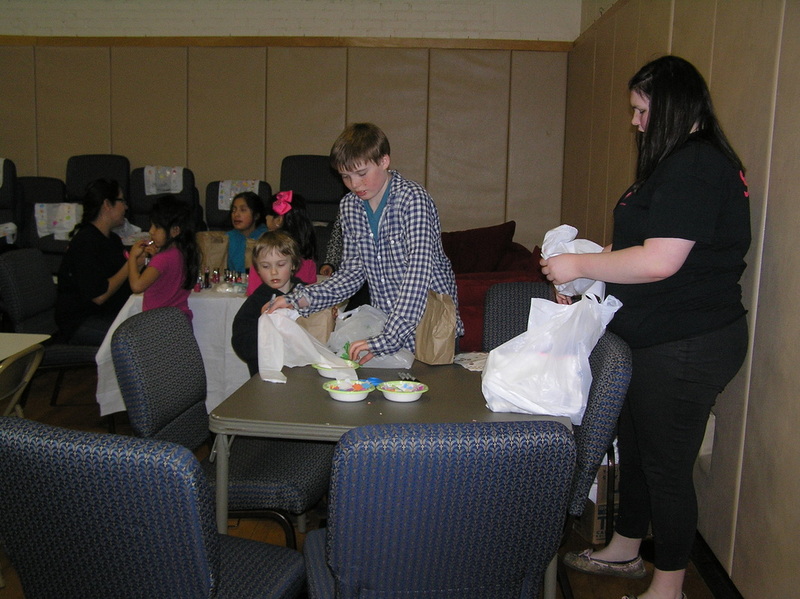 Becky, Taylor, Rose, Victoria, Ryan, Jonathan, Lynsey and Rebecca making bagged lunches. 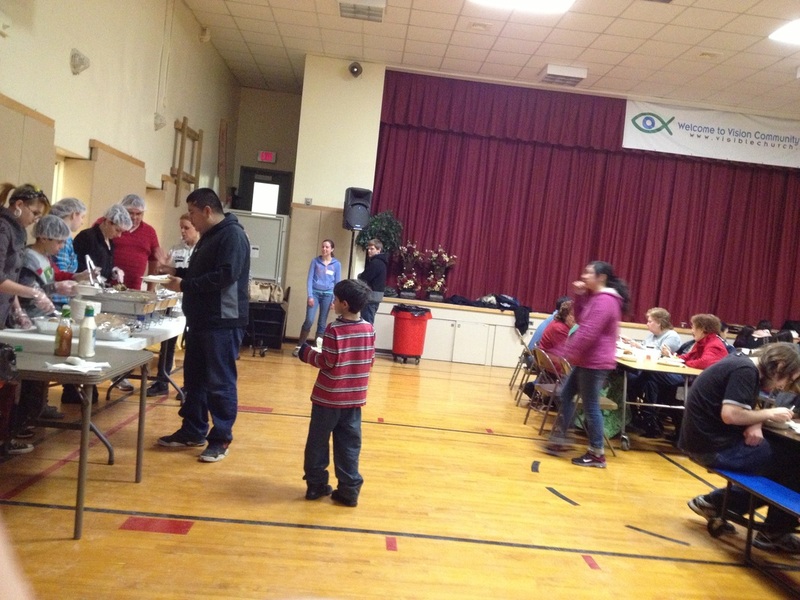 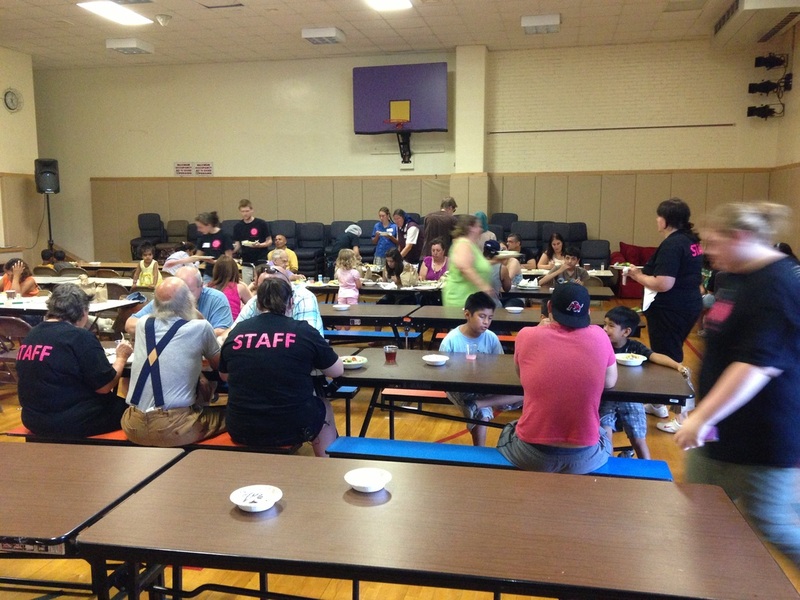 The spaghetti dinner is almost ready to be served. 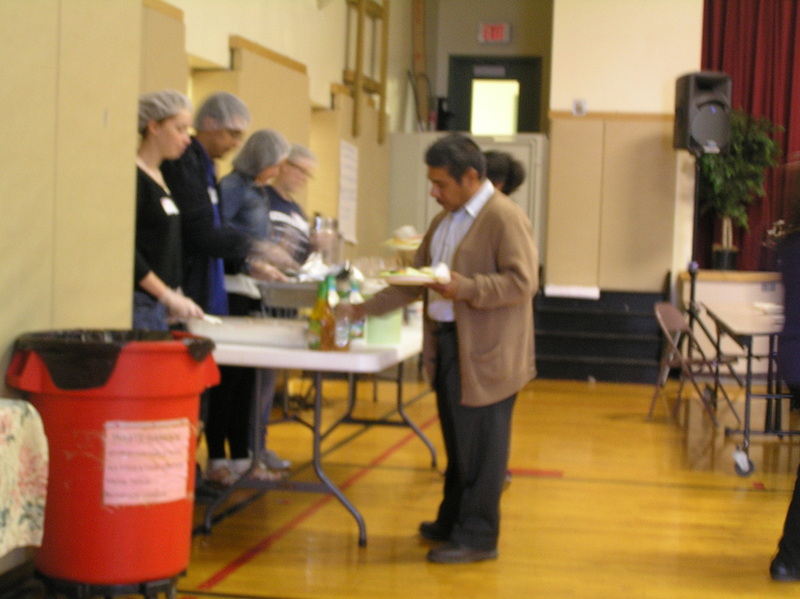 Volunteers getting ready for the guests to come. 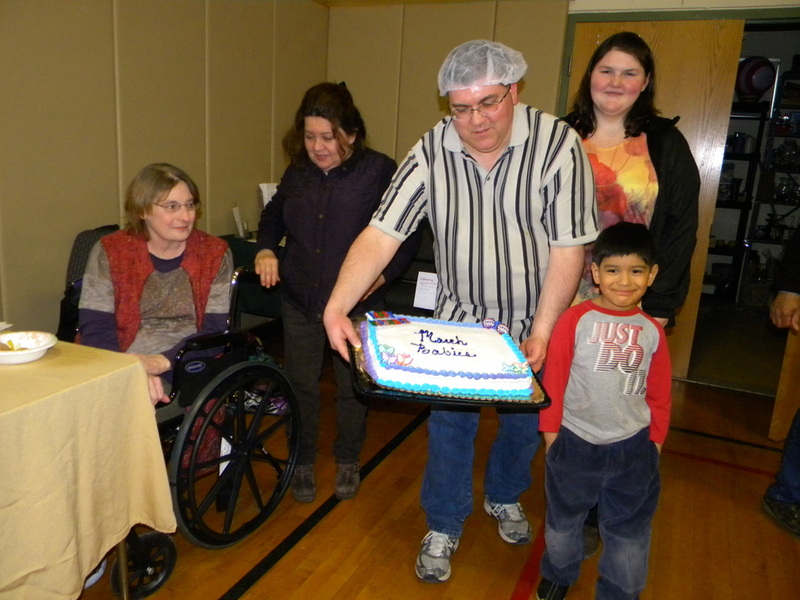 Victoria, Estelle and her family. 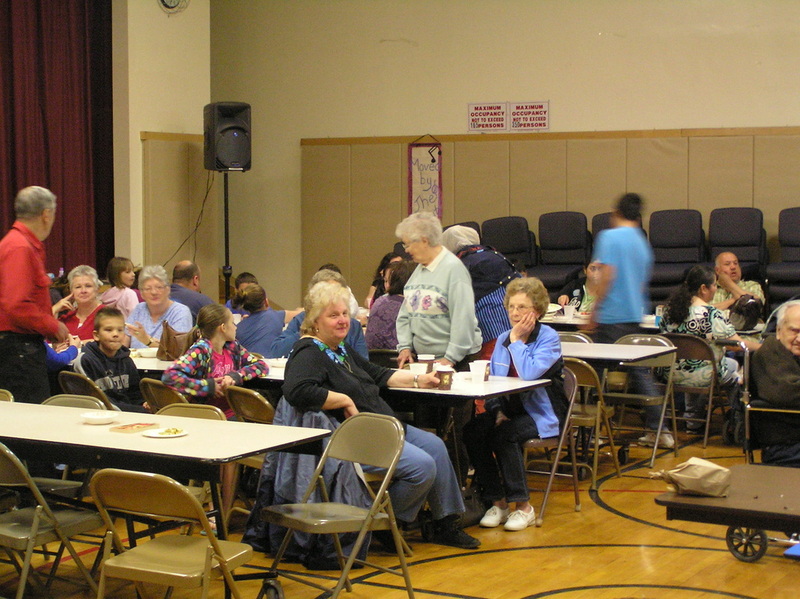 More guests at the dinner. 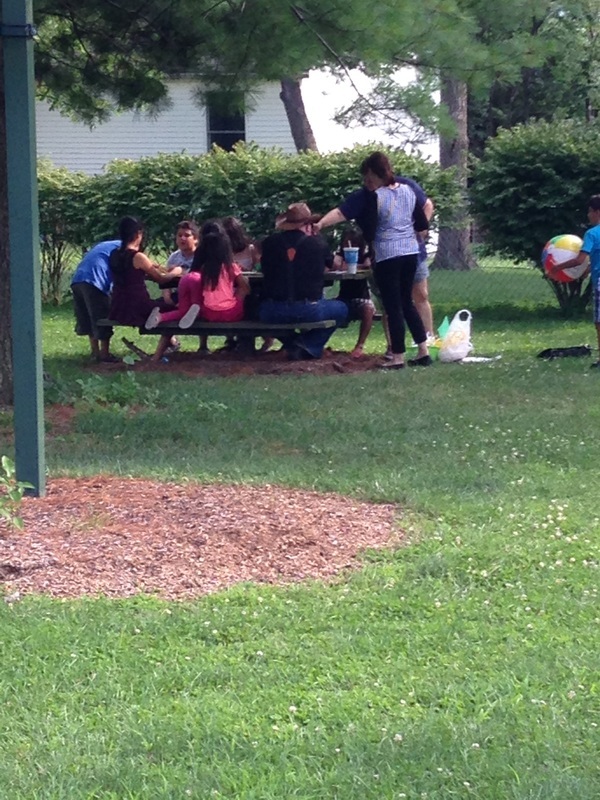 It was 7:30 and we thought we were done when an additional family came to eat. 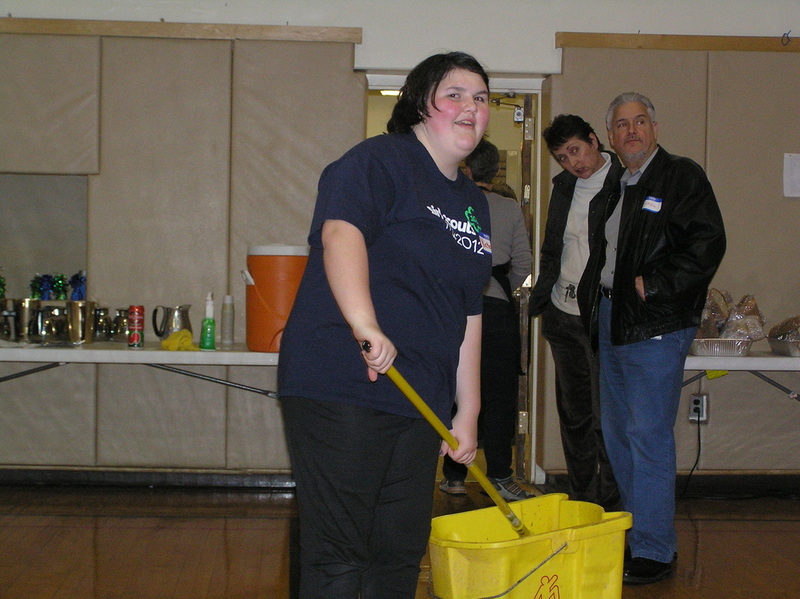 Victoria pitching in to get cleaned up. 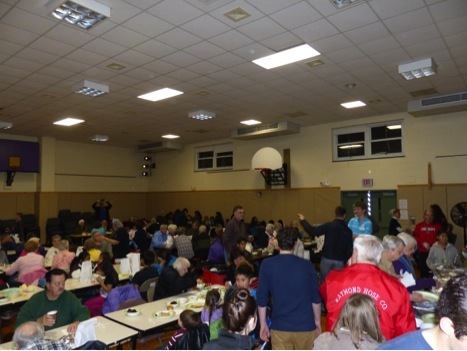 51 people came for dinner.